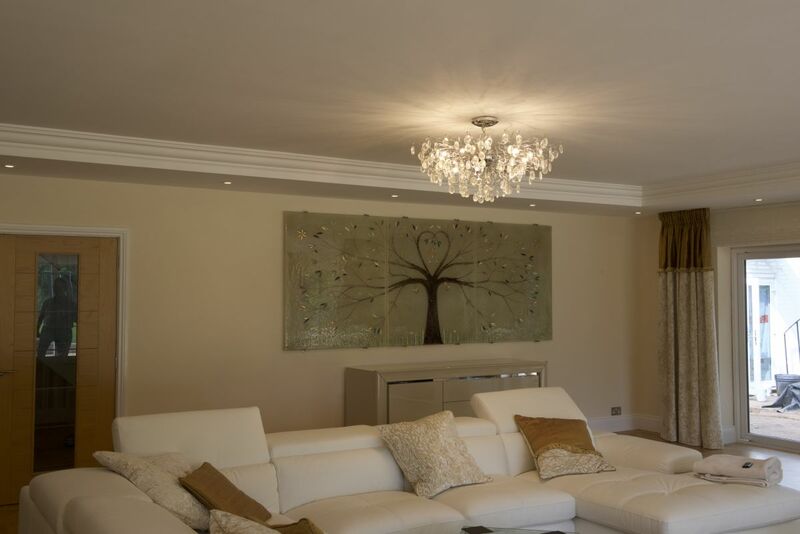 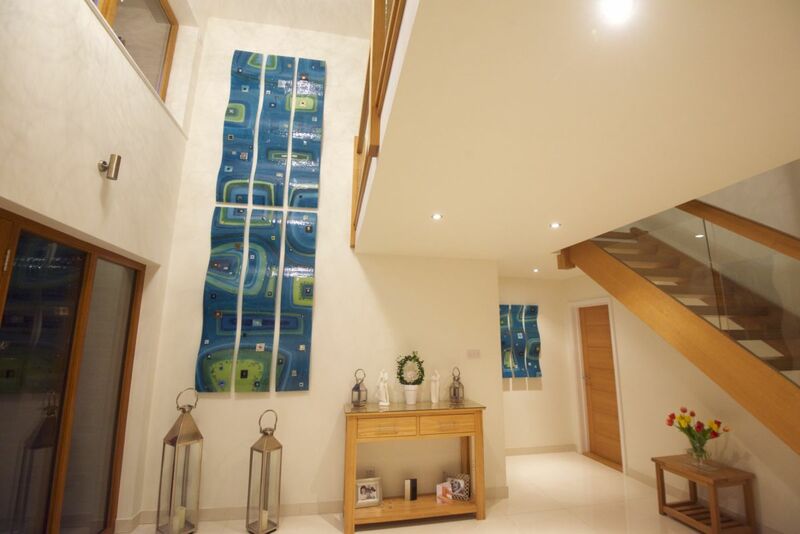 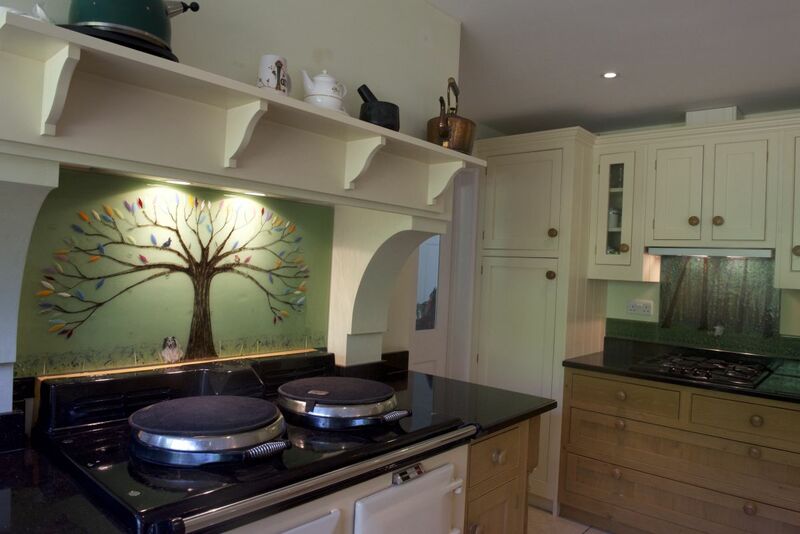 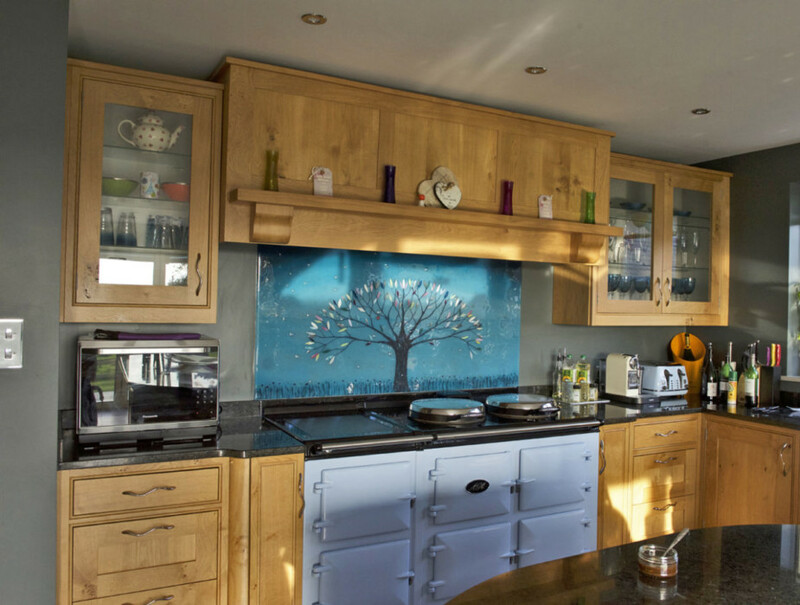 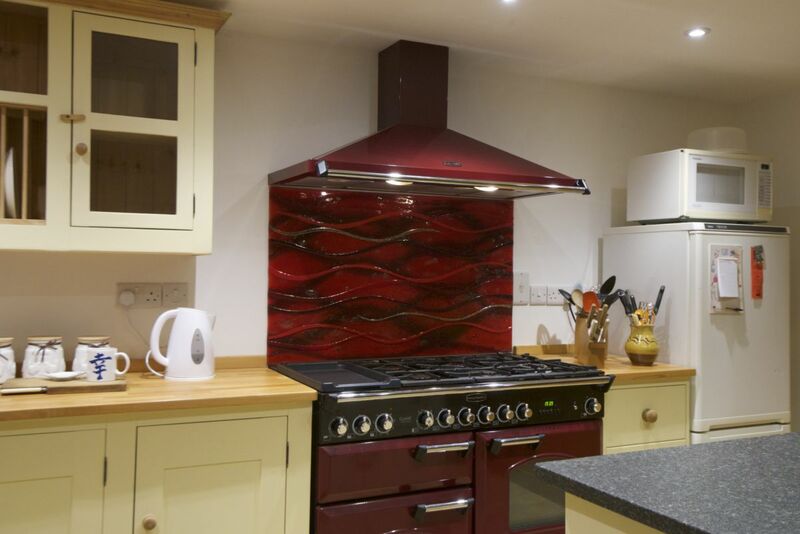 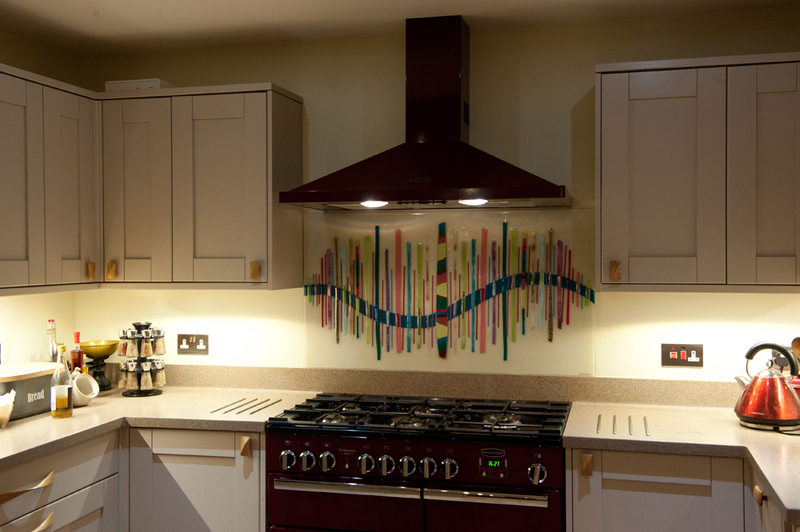 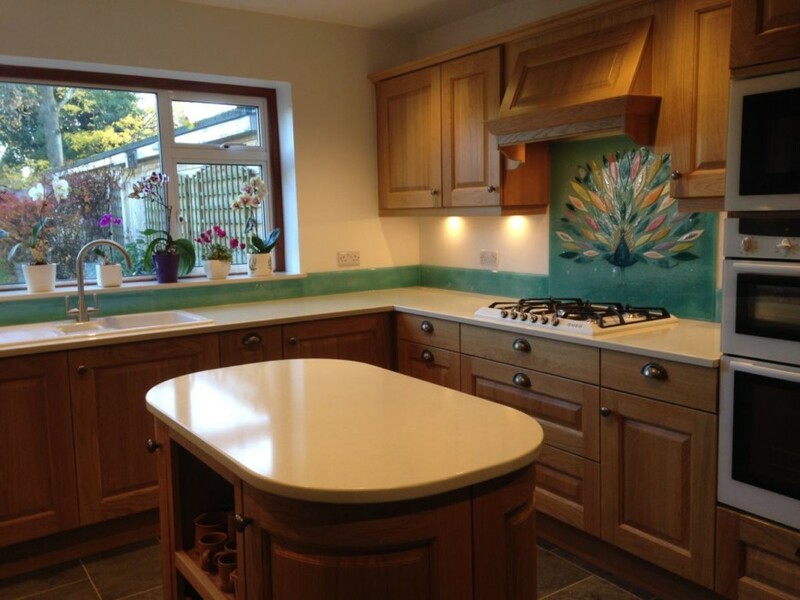 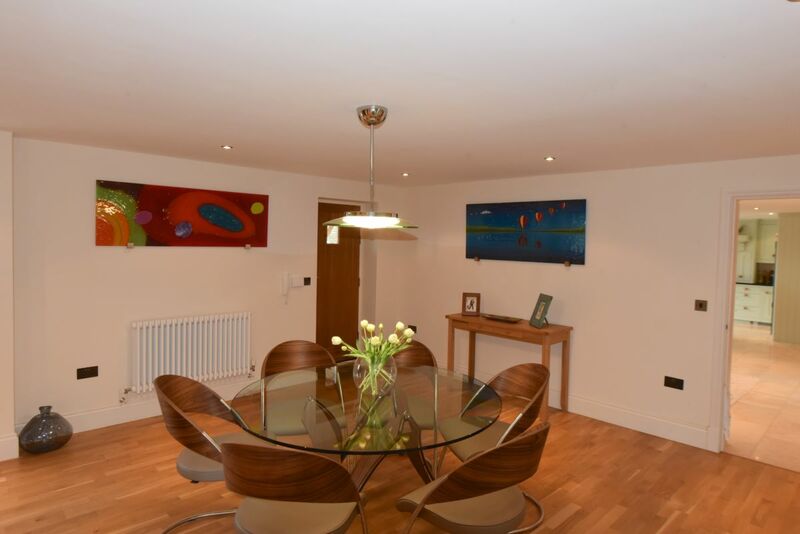 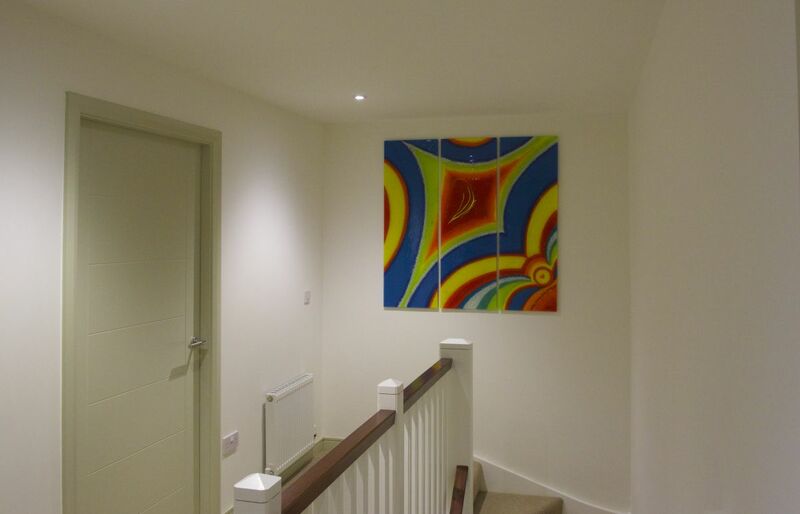 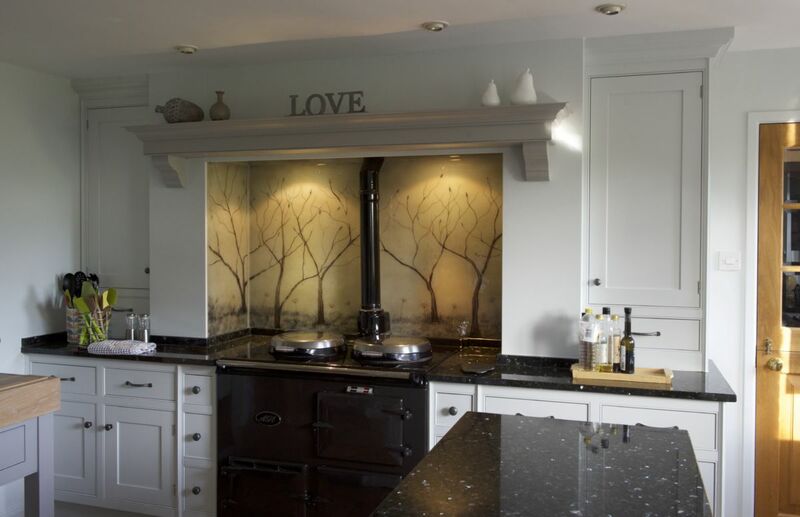 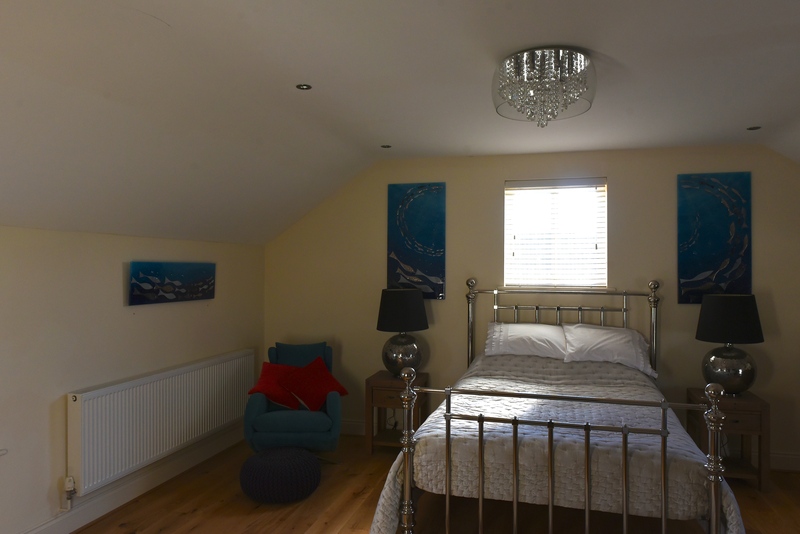 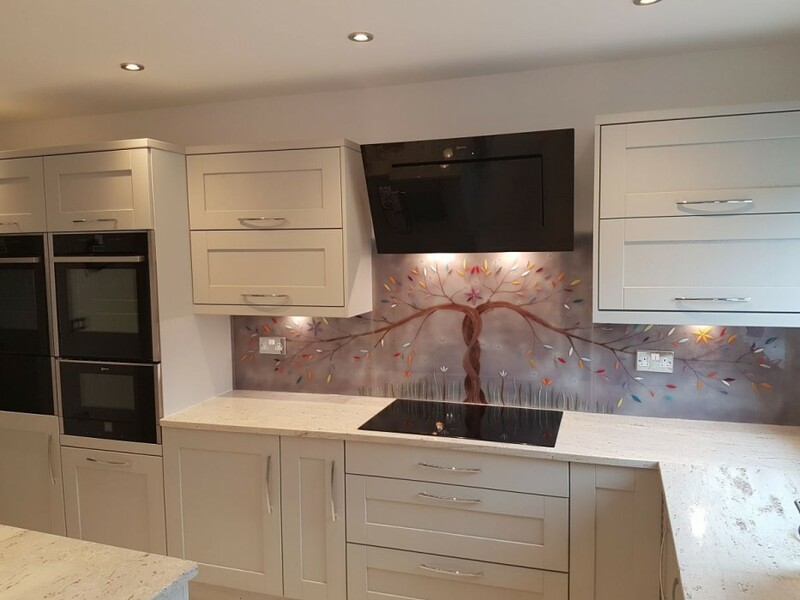 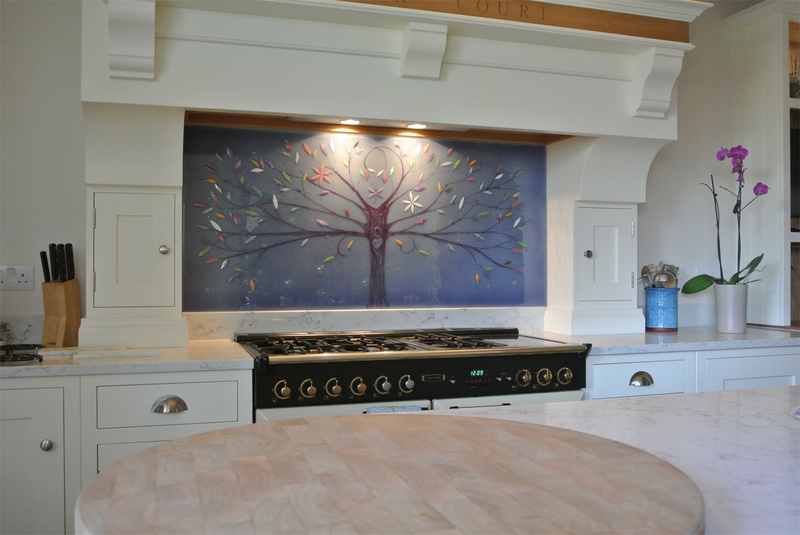 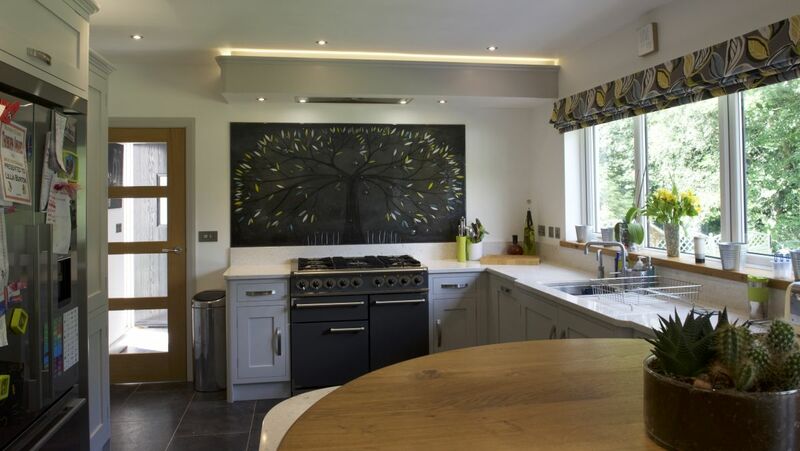 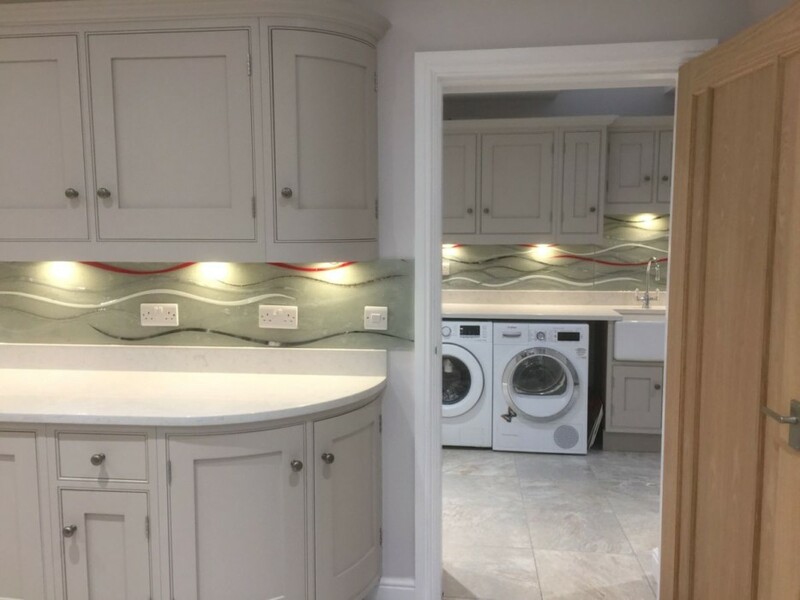 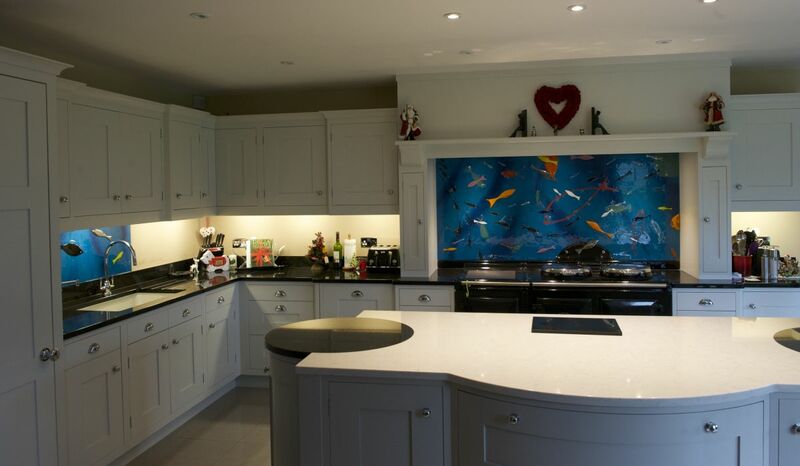 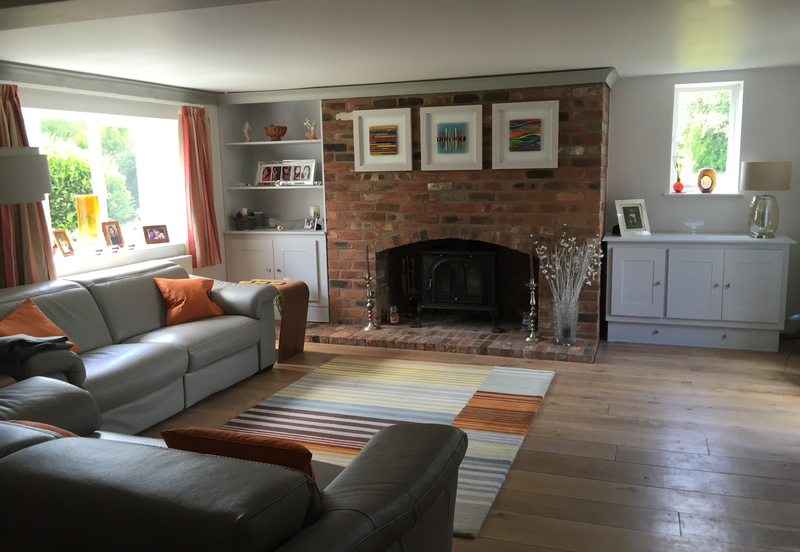 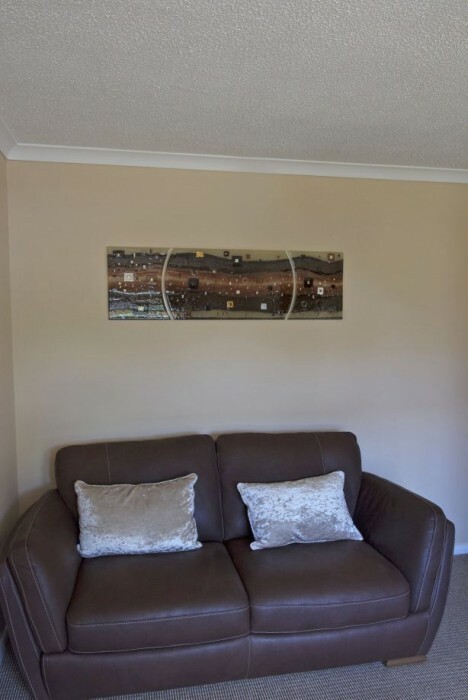 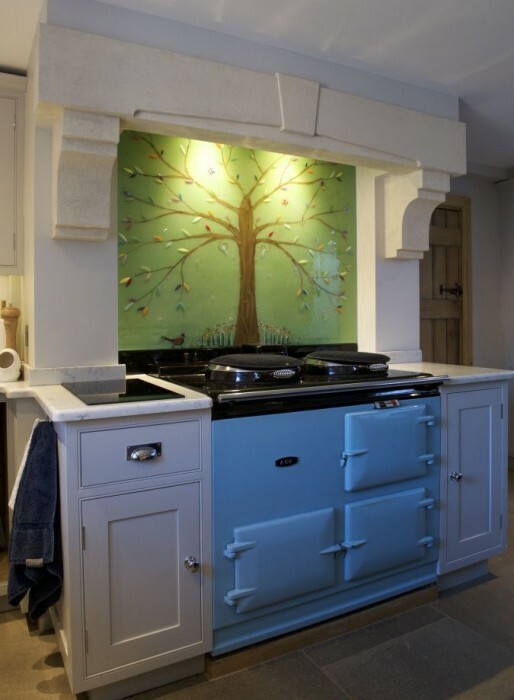 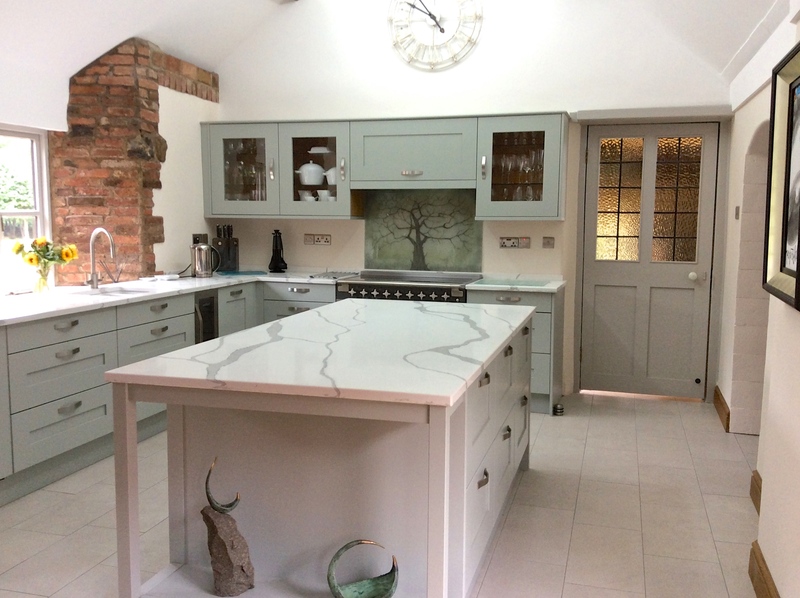 Here’s a recent addition to a home in Cirencester, Gloucestershire. 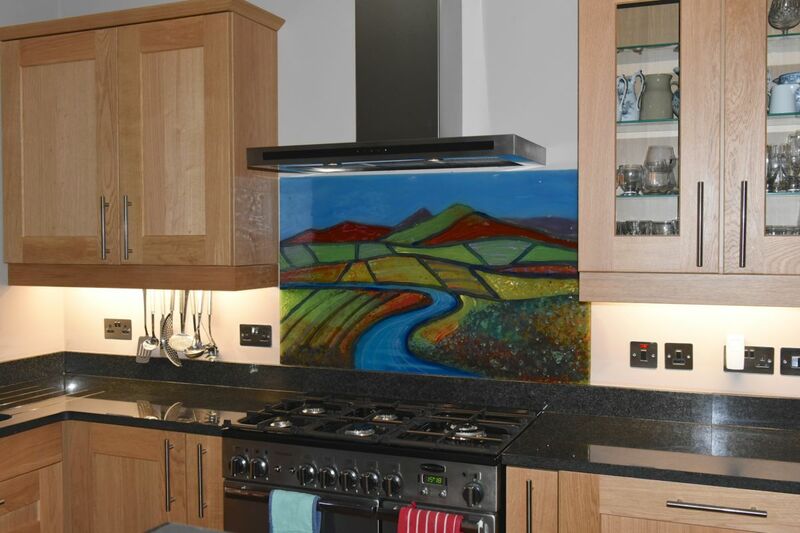 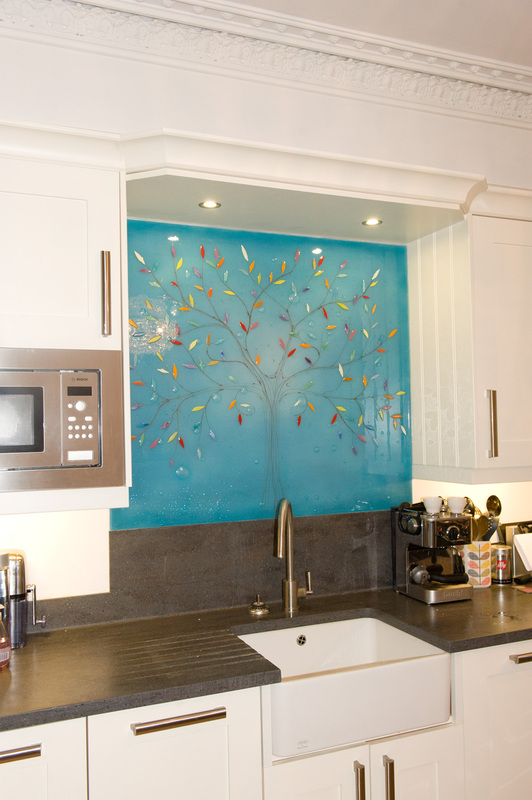 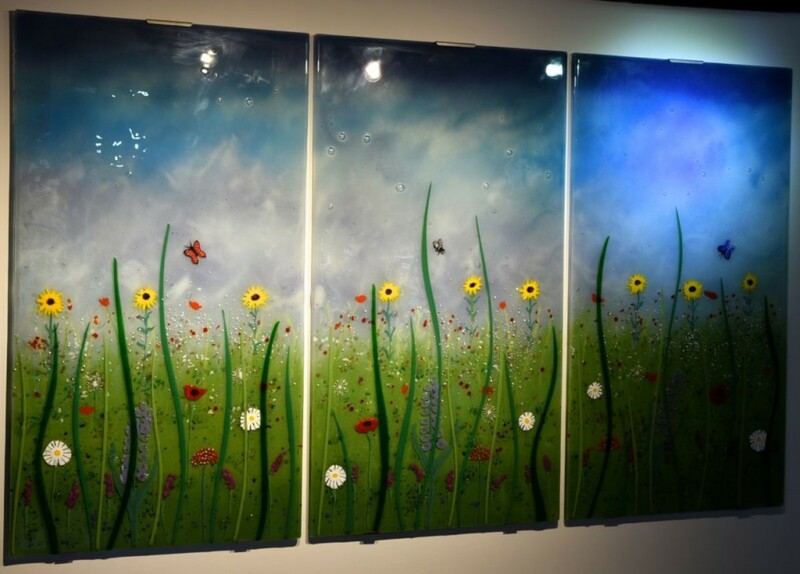 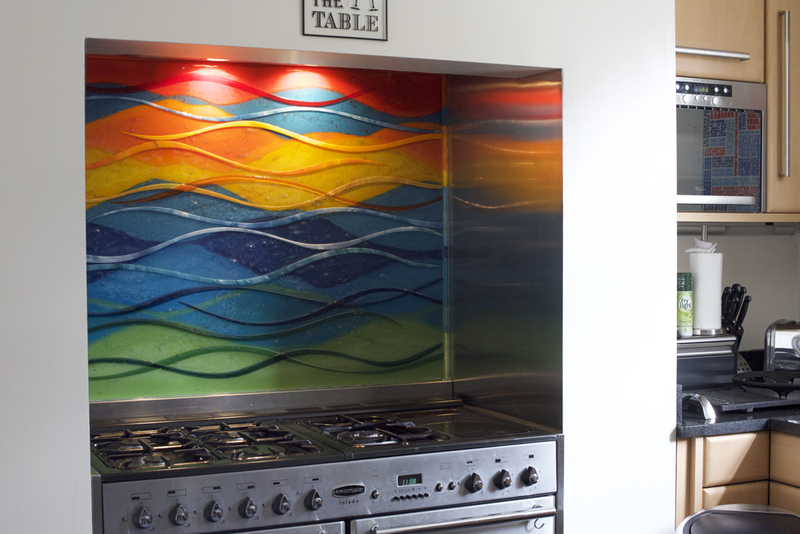 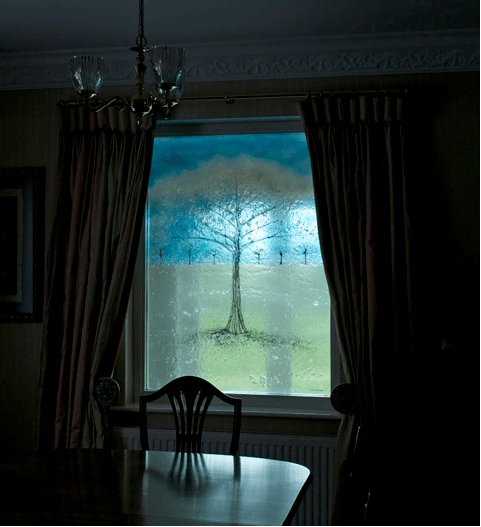 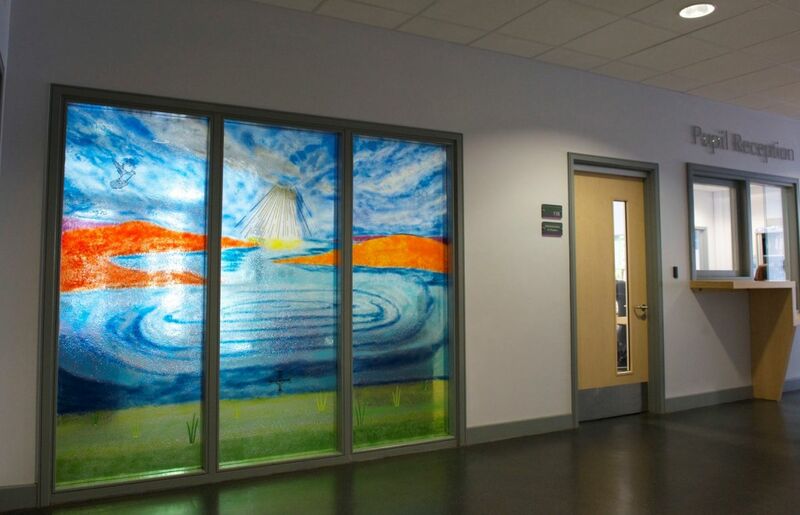 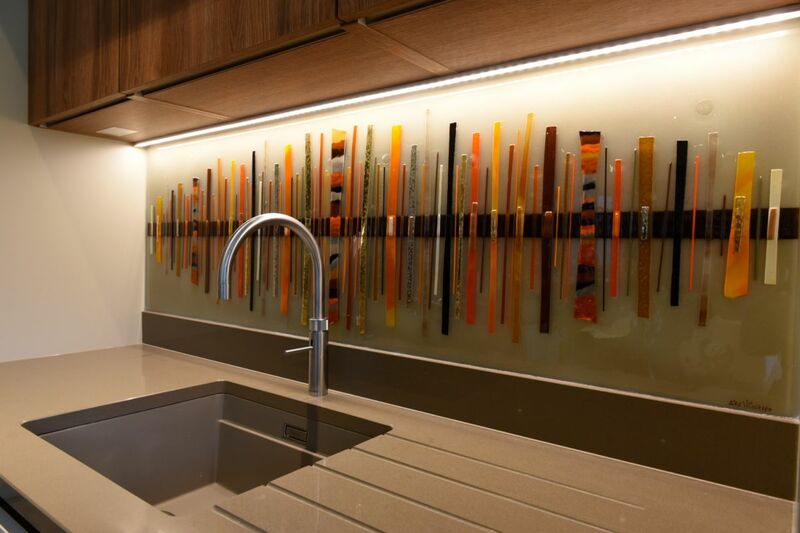 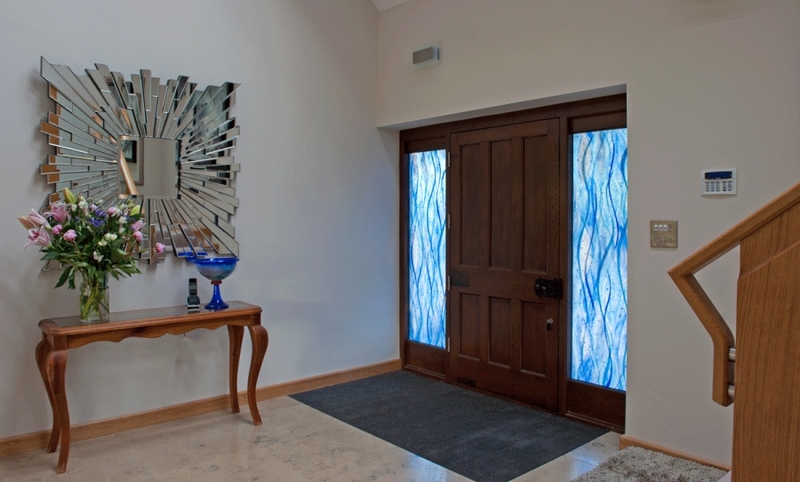 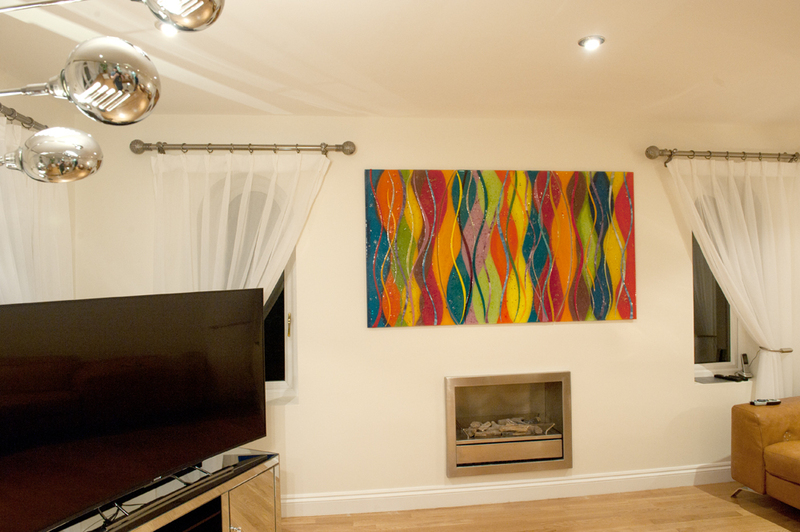 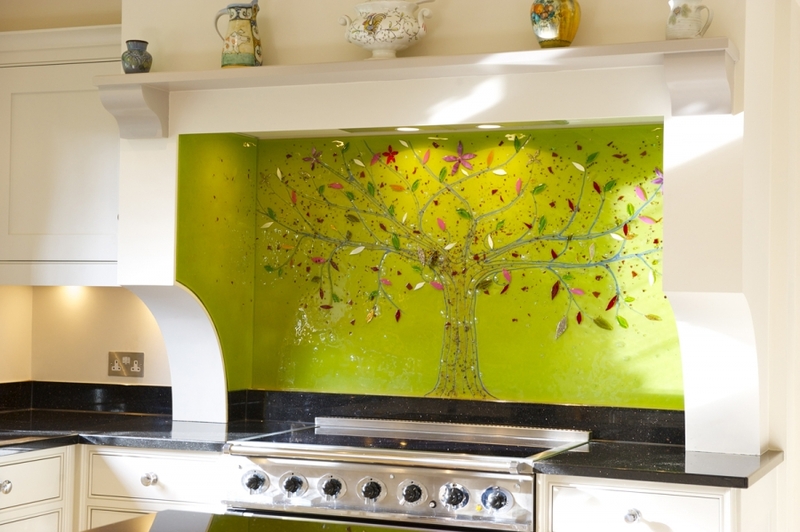 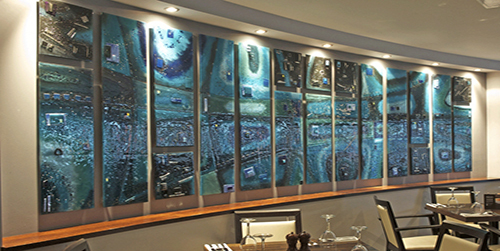 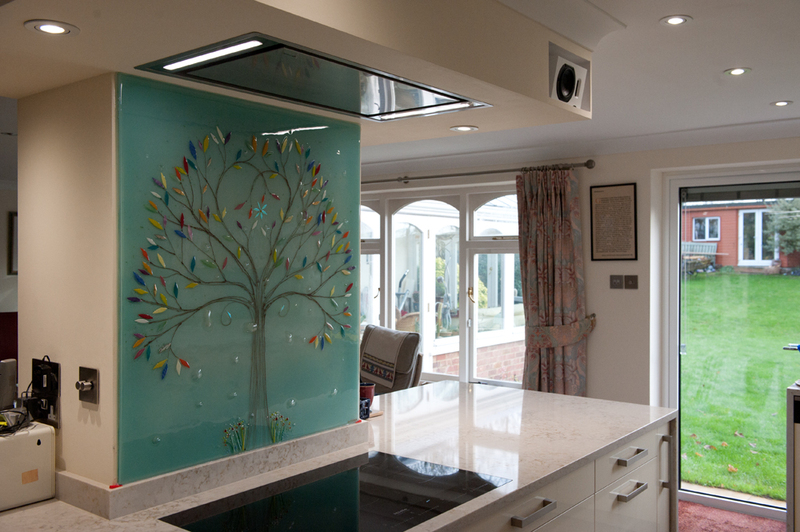 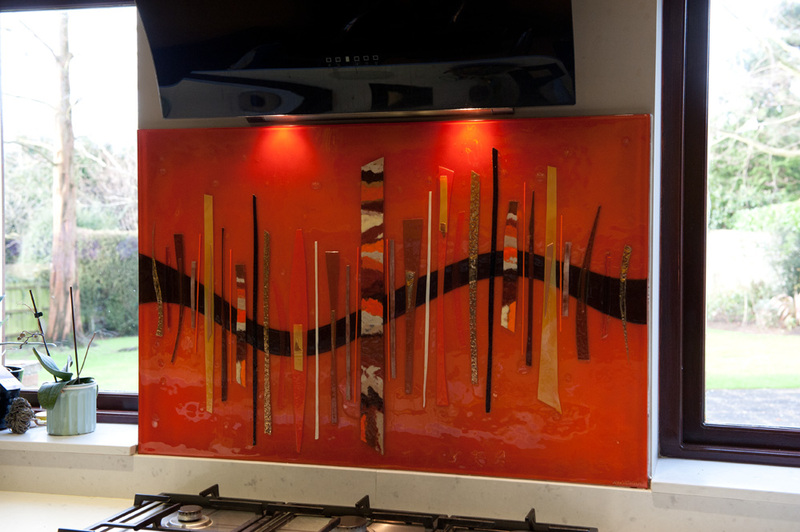 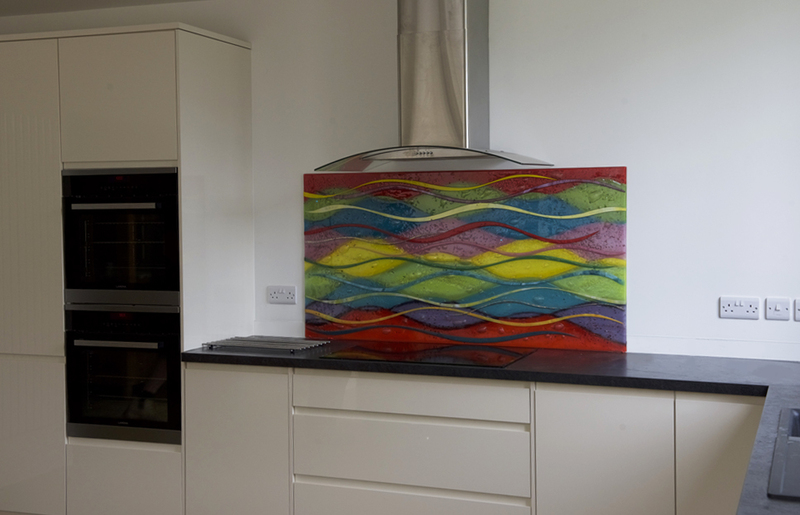 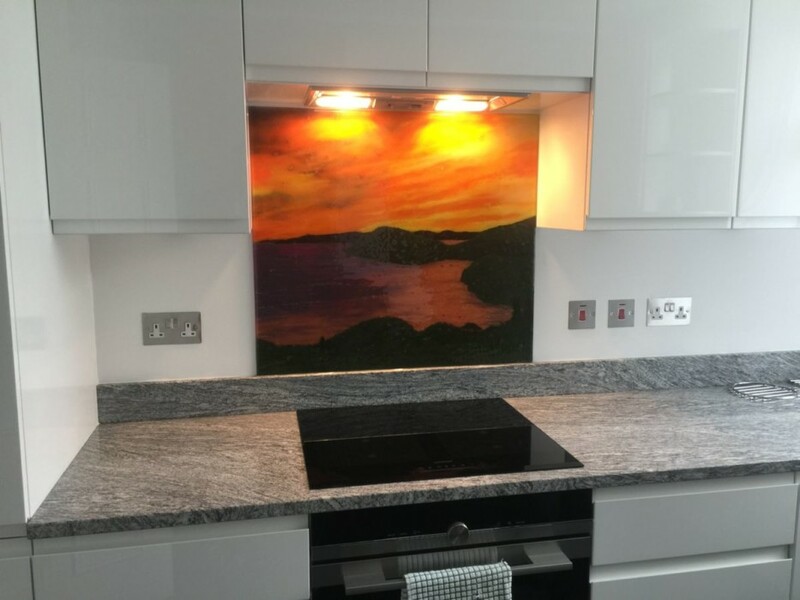 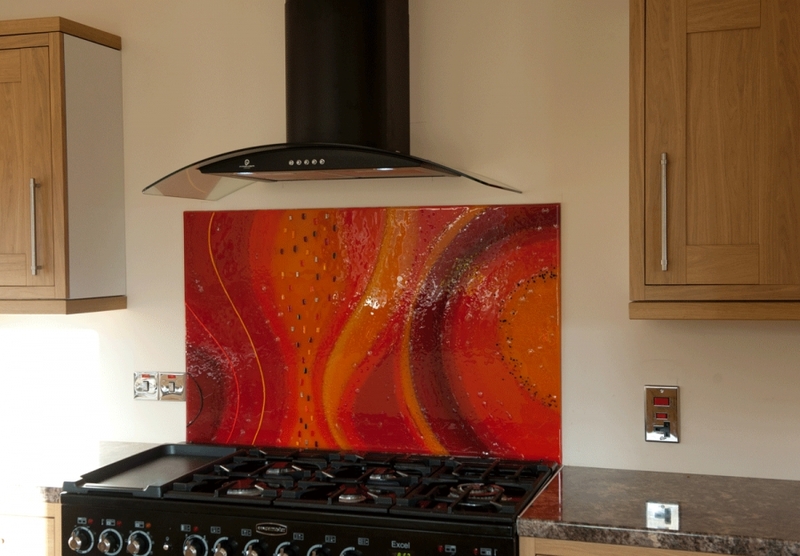 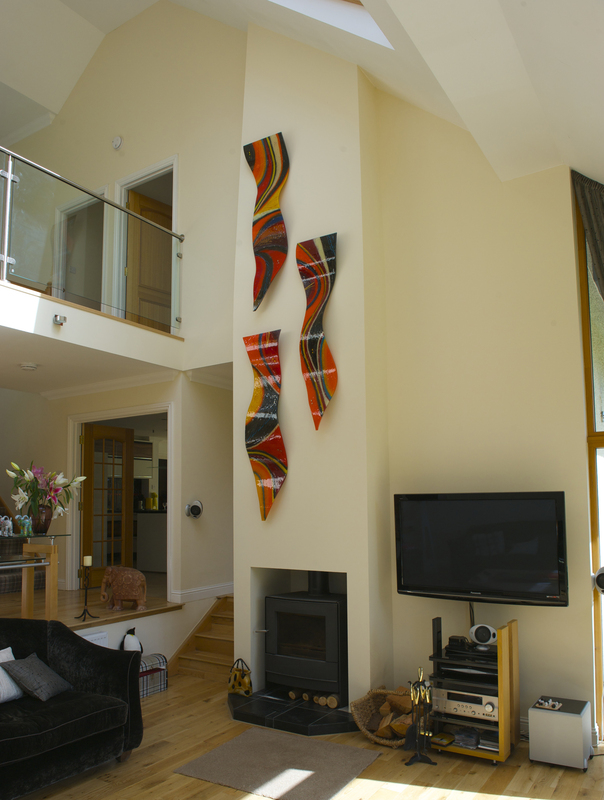 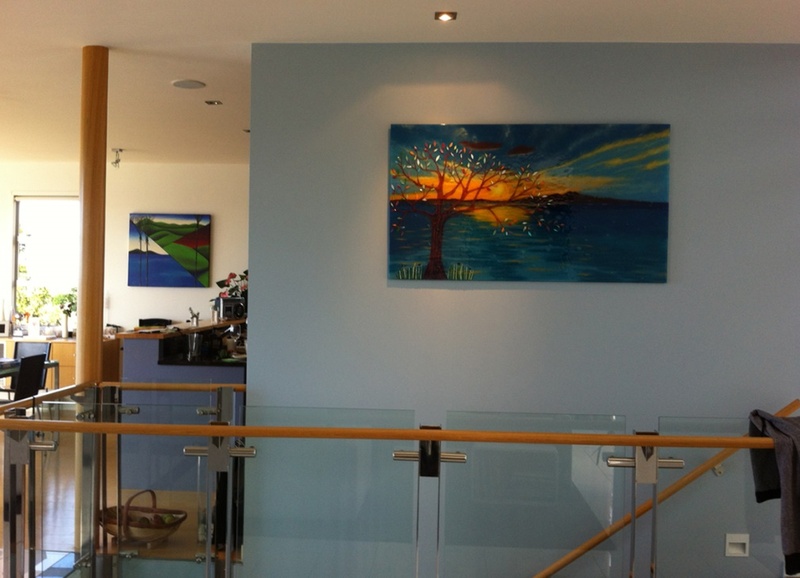 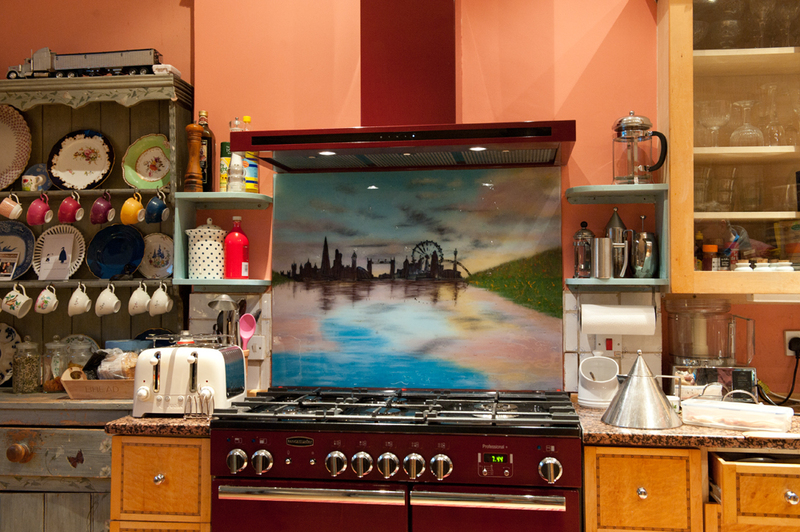 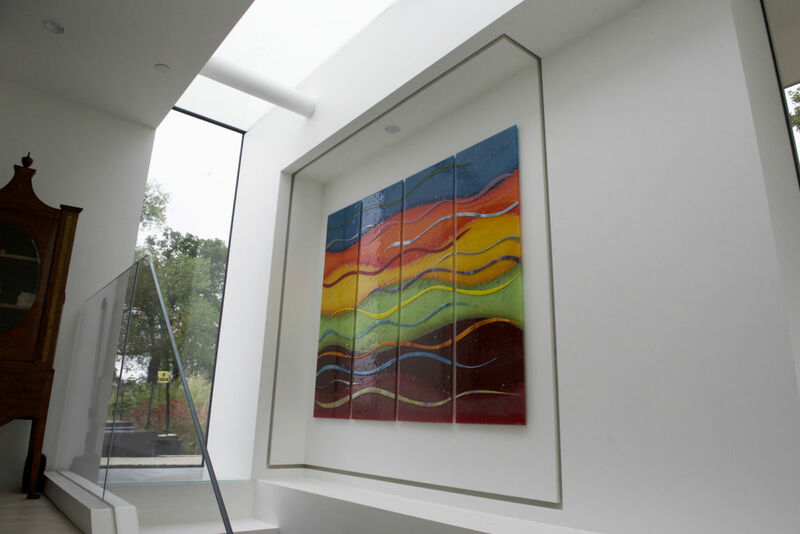 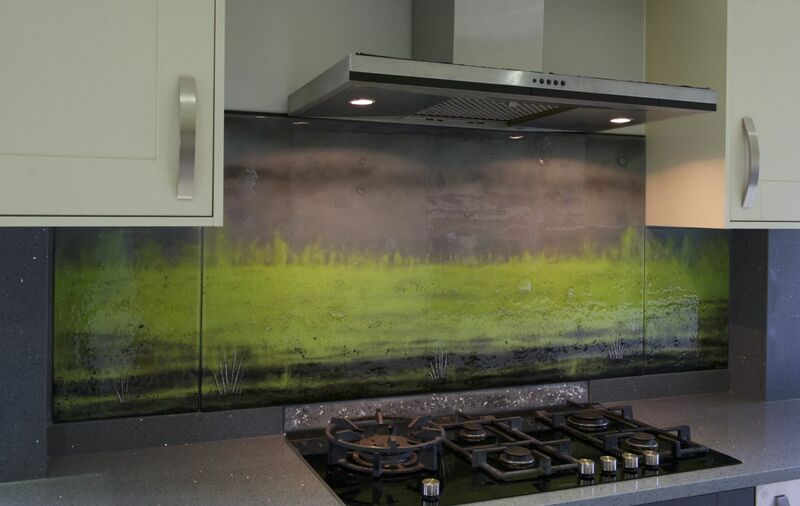 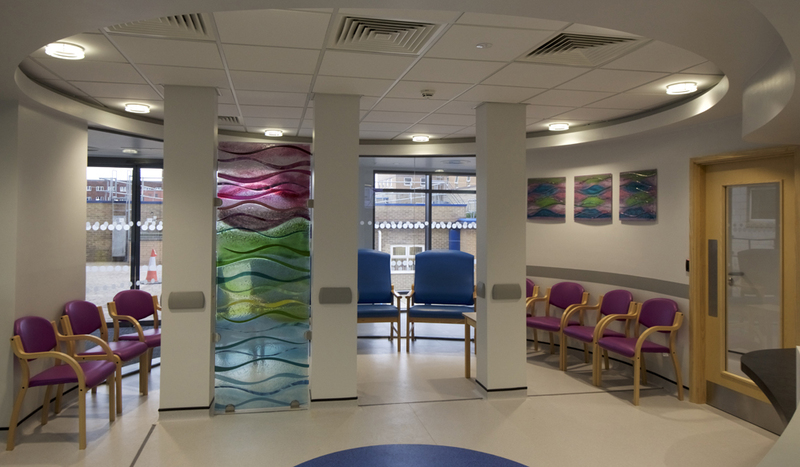 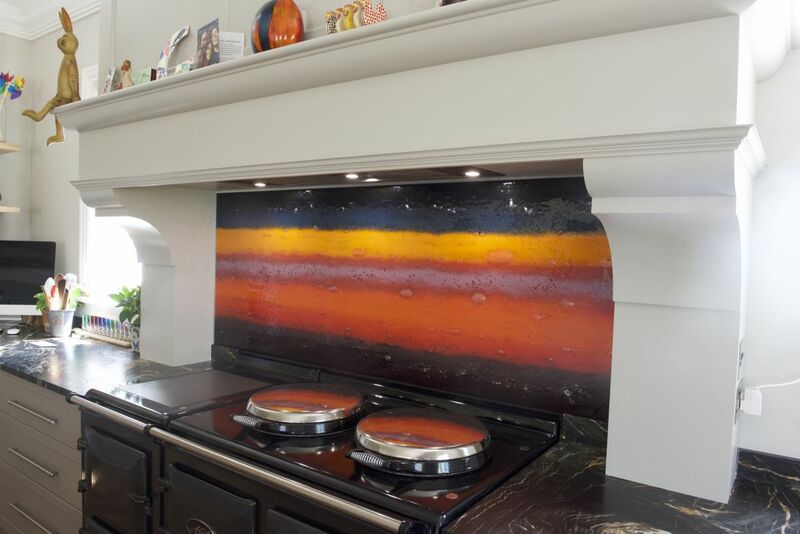 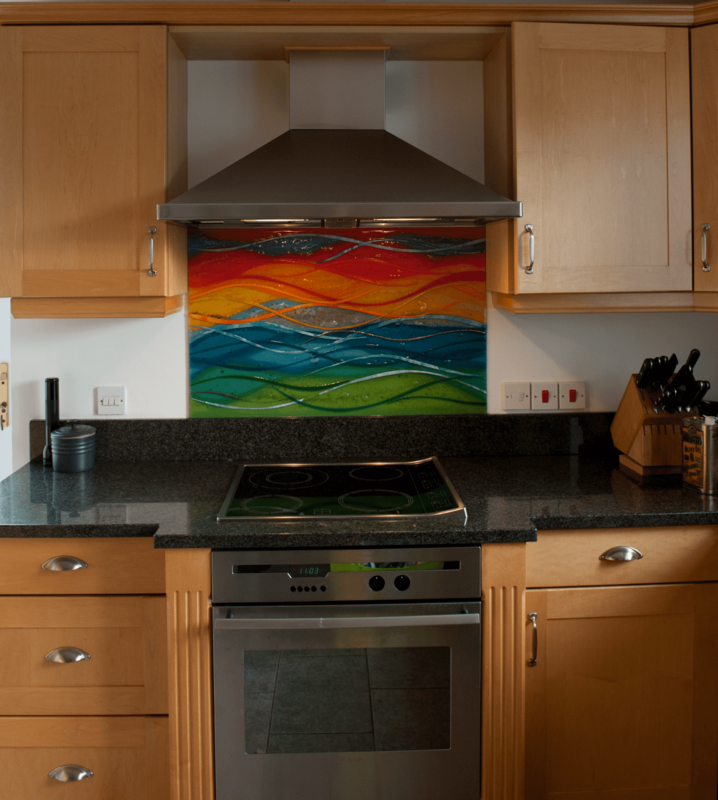 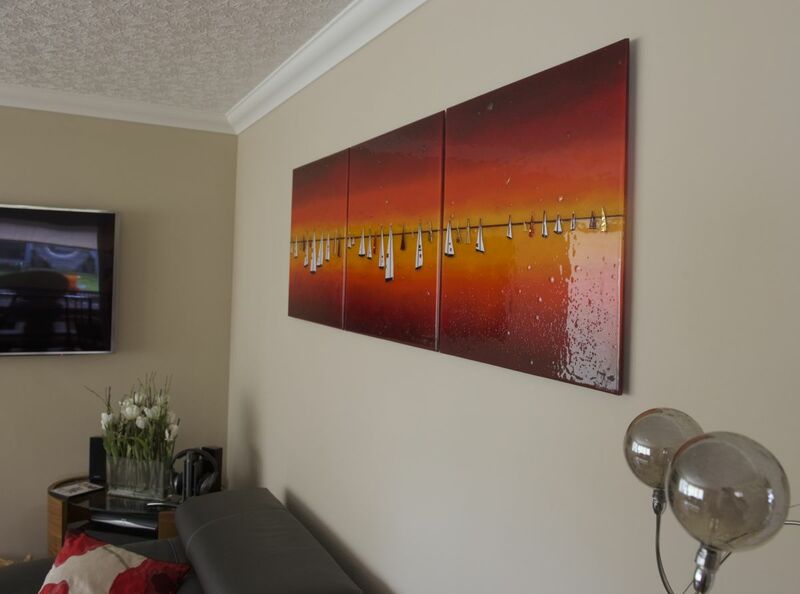 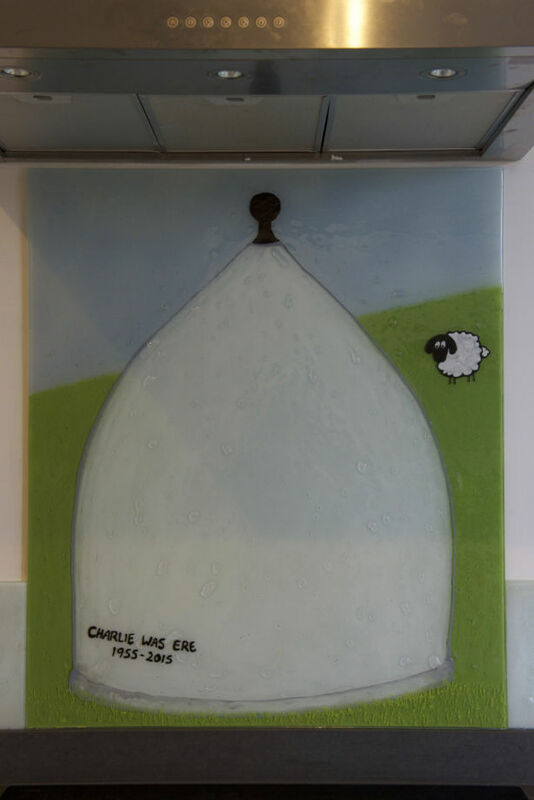 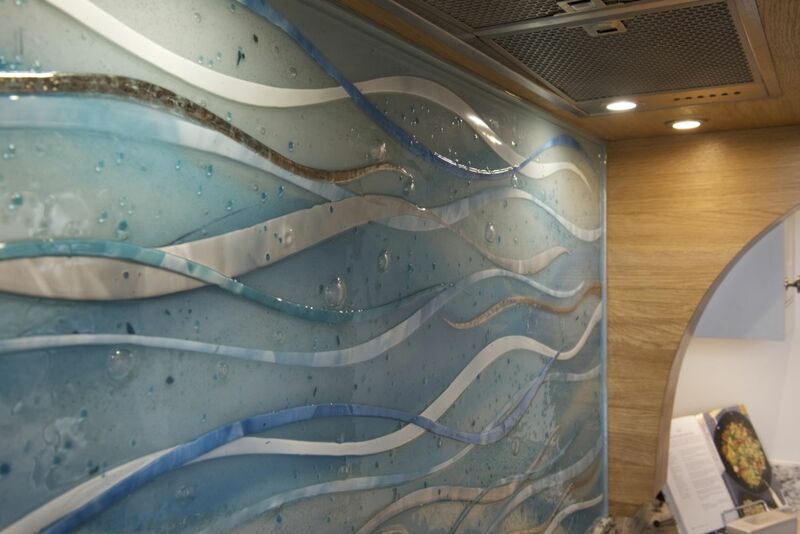 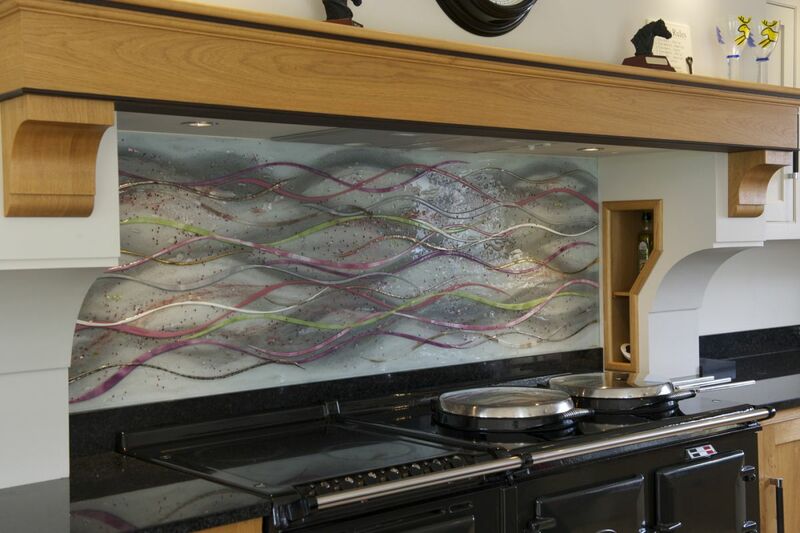 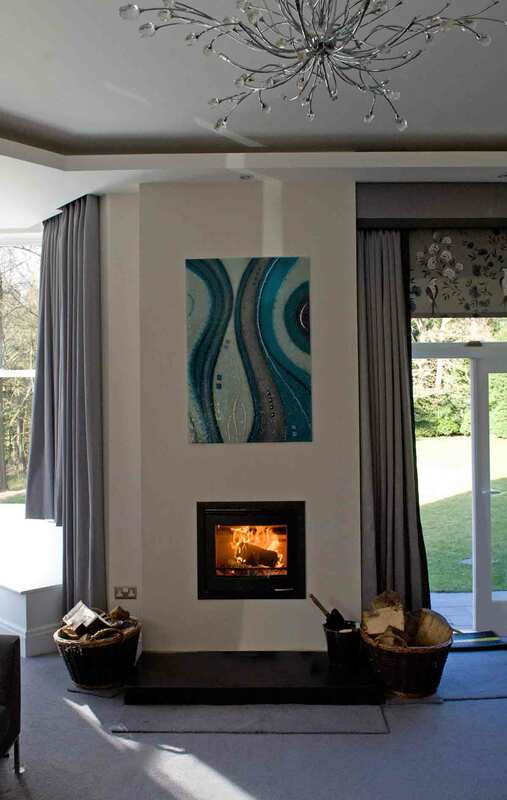 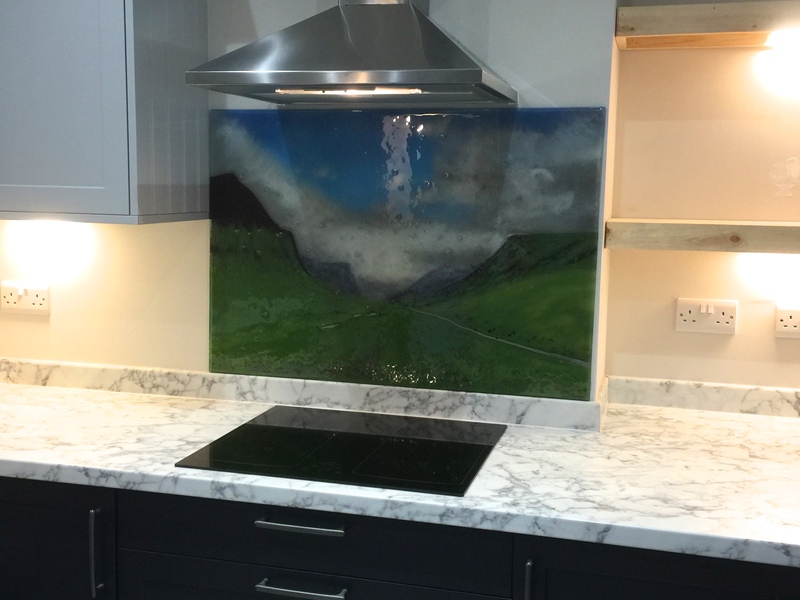 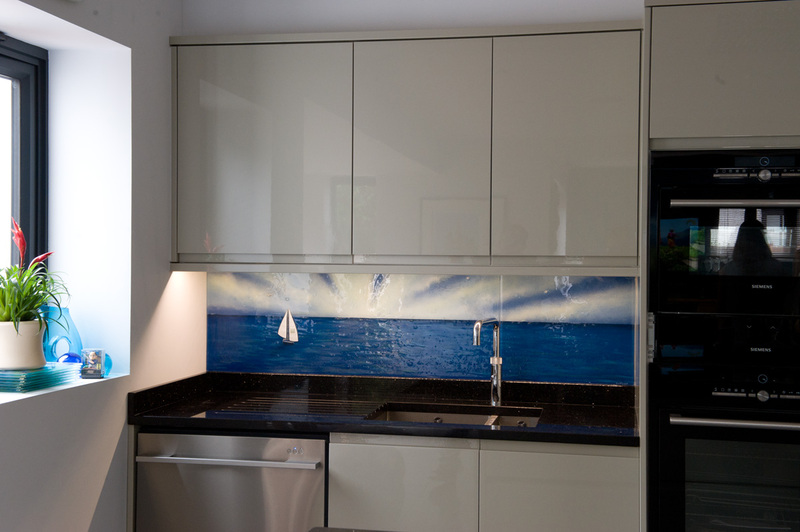 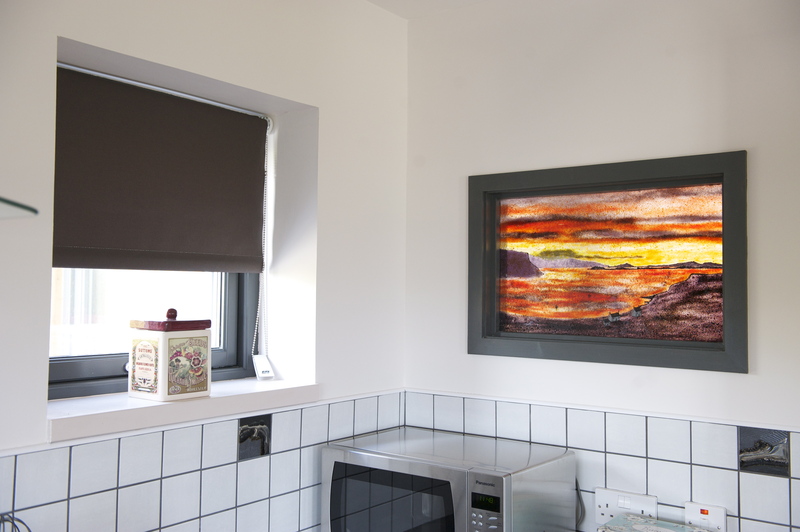 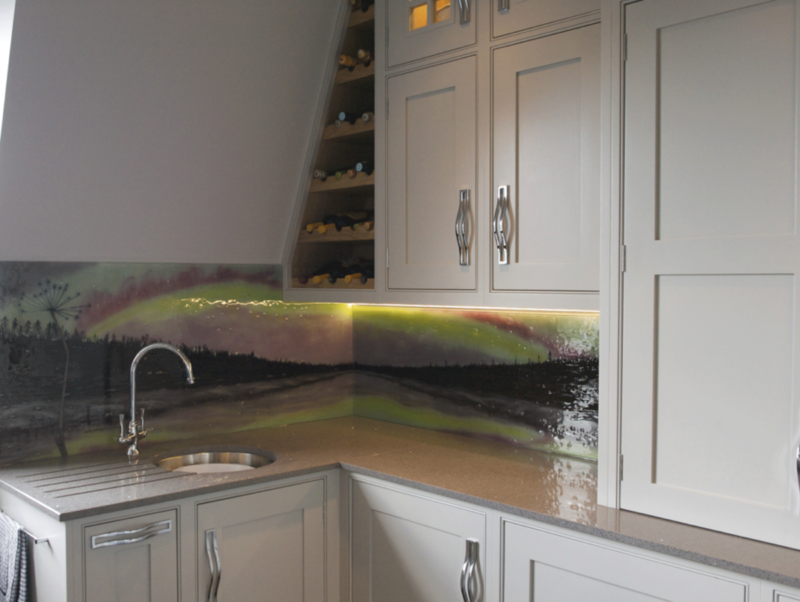 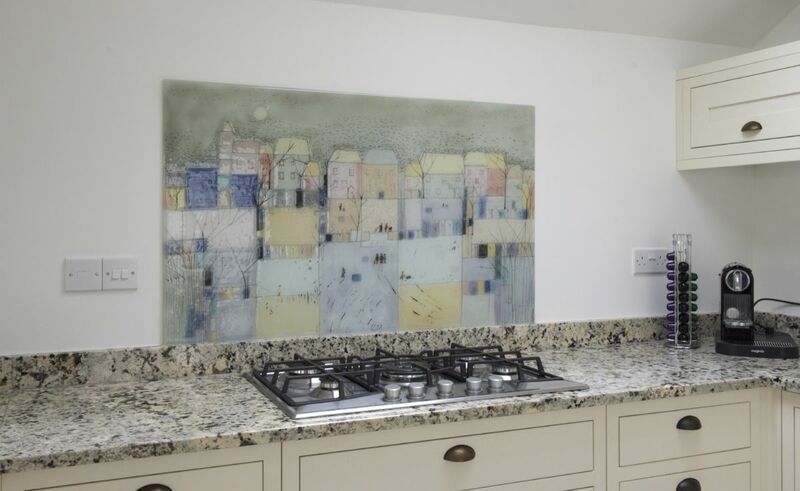 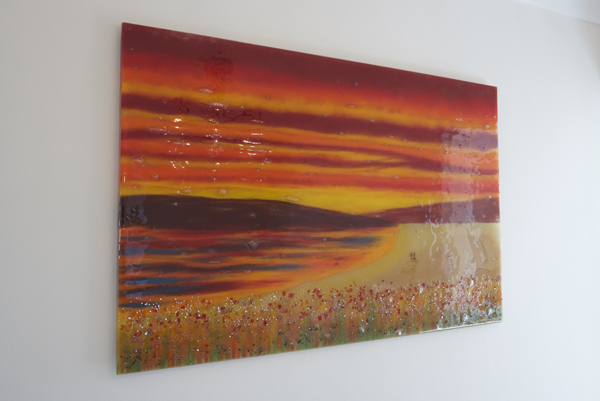 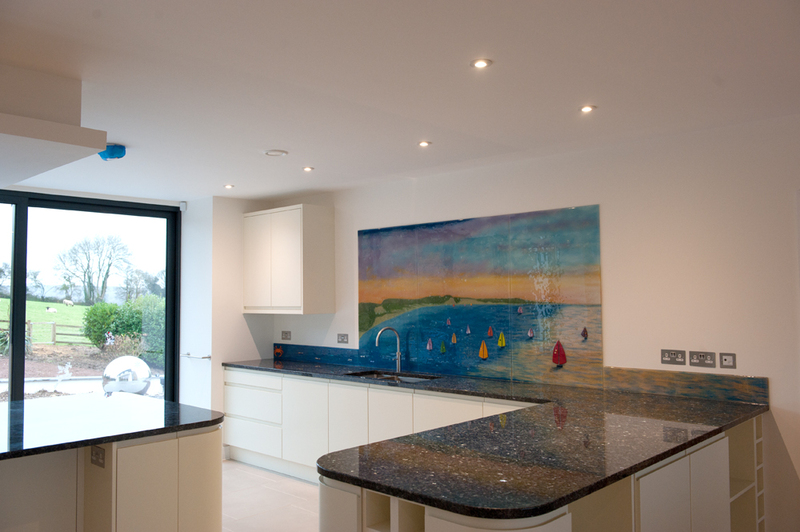 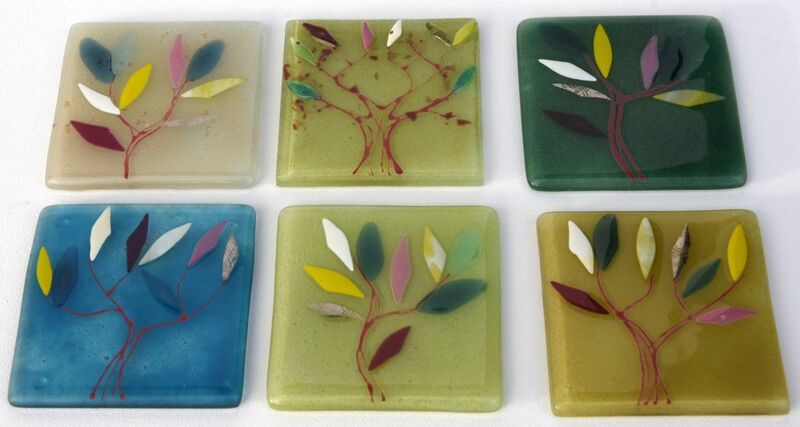 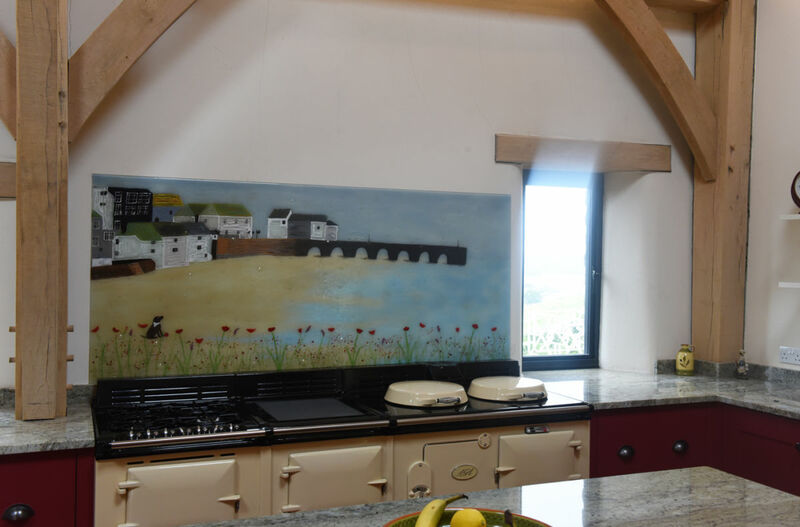 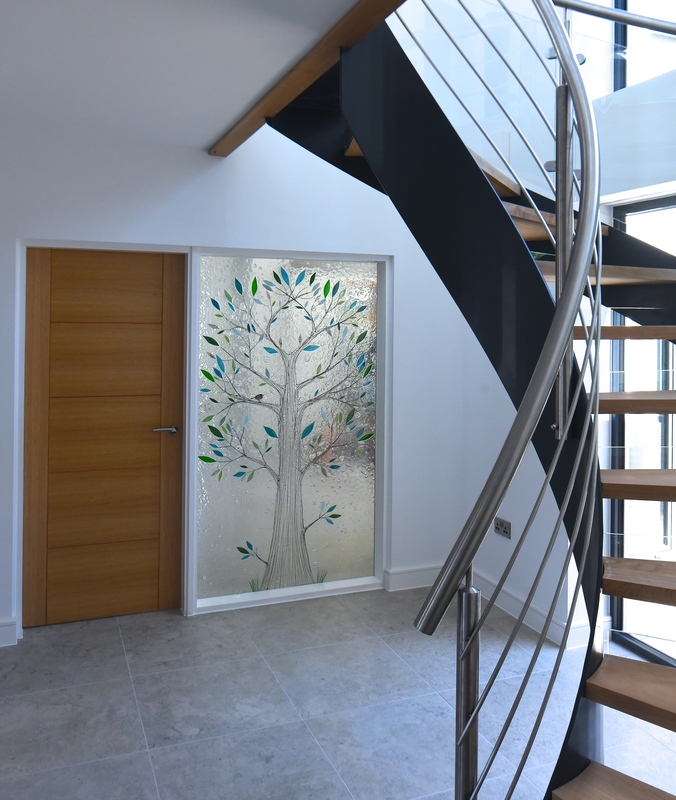 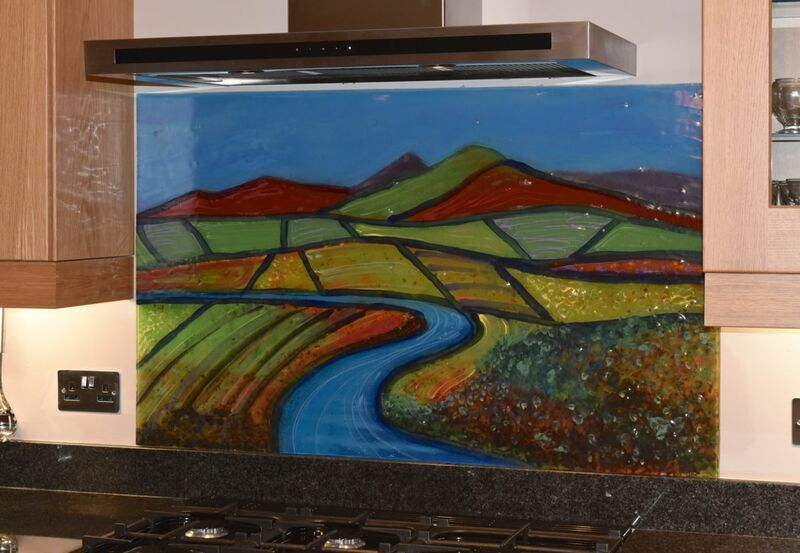 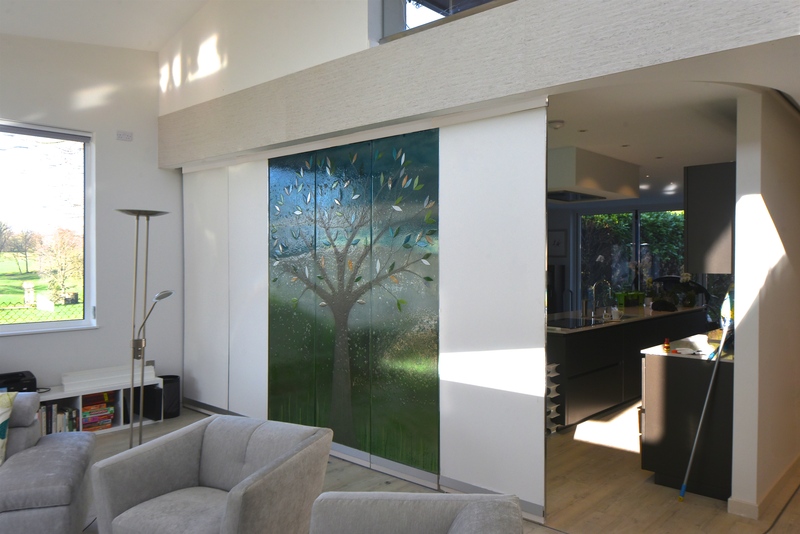 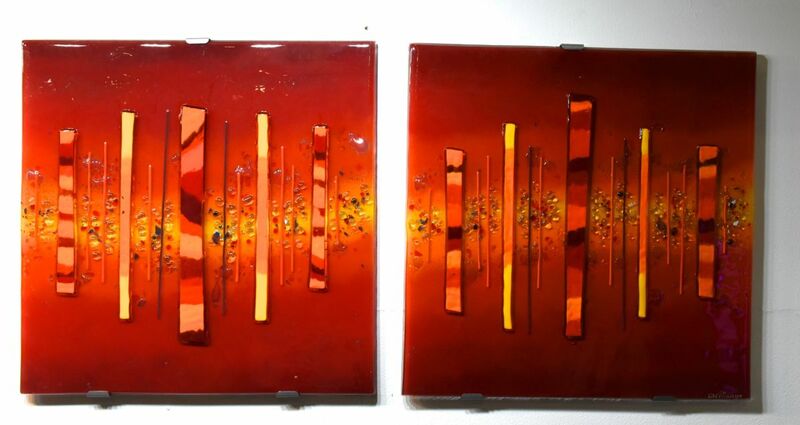 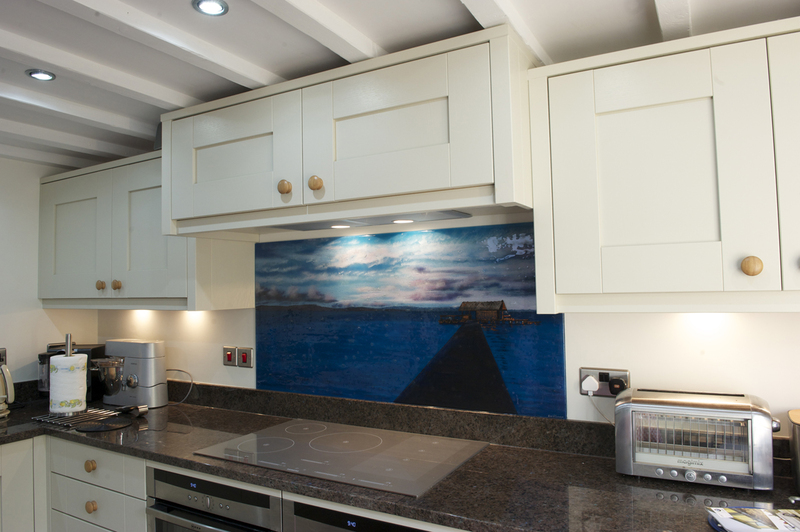 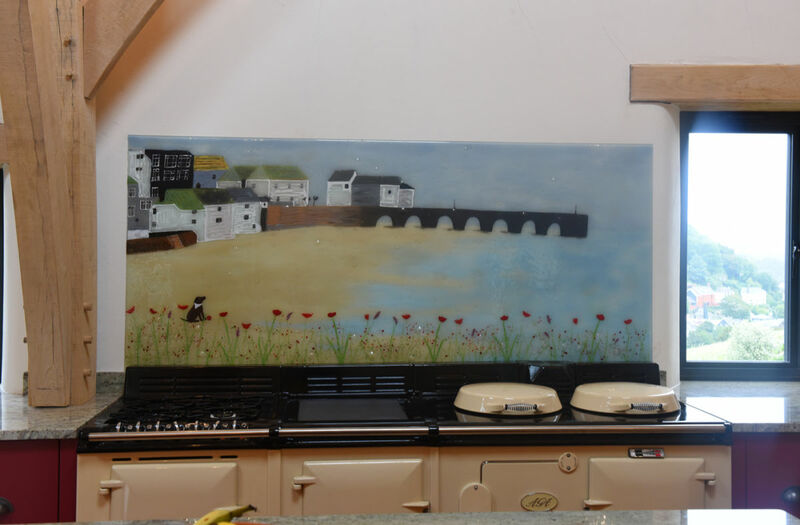 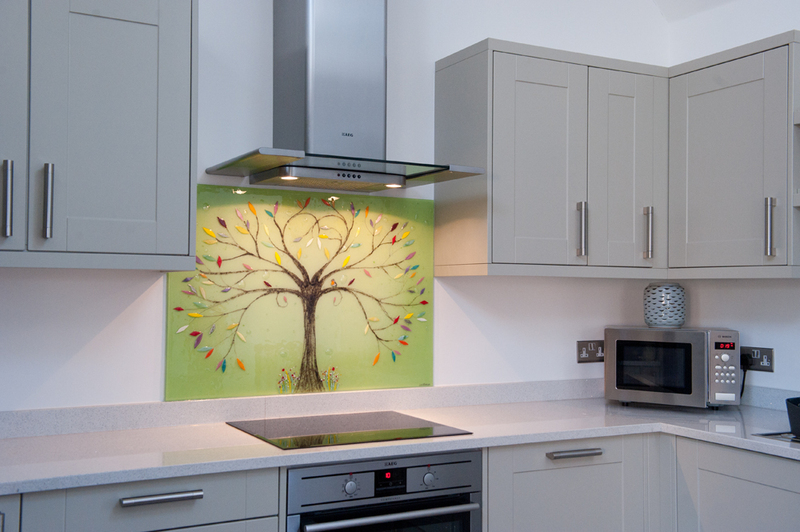 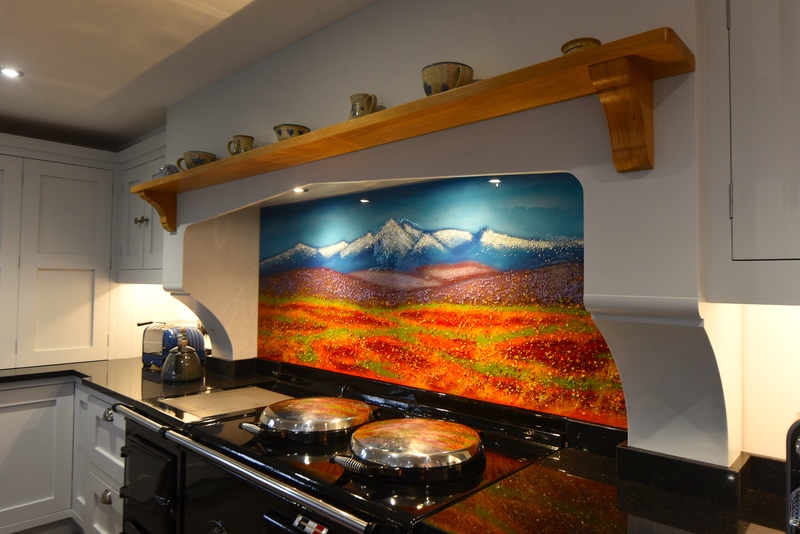 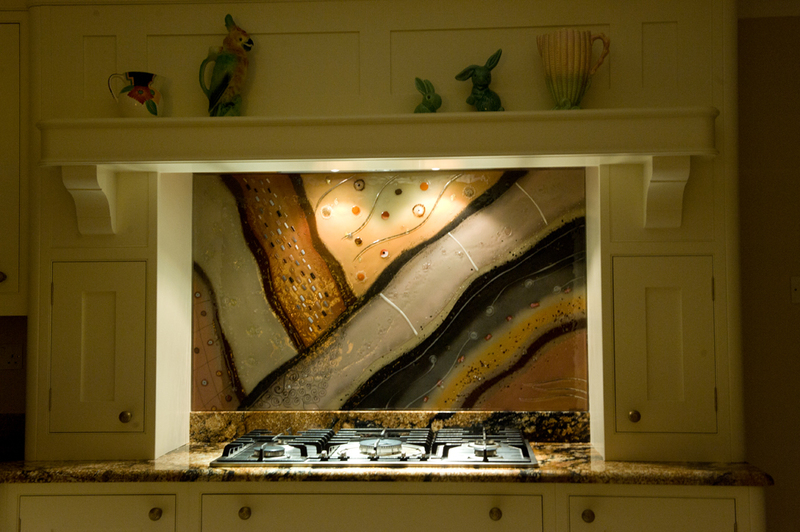 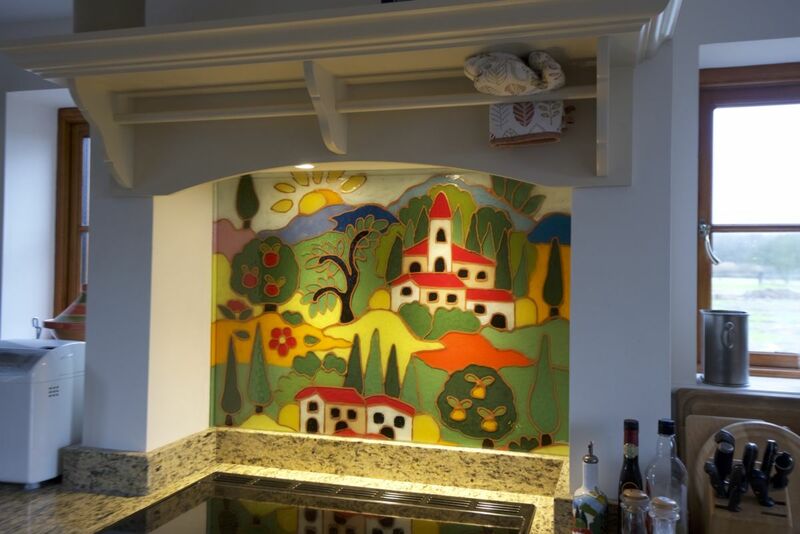 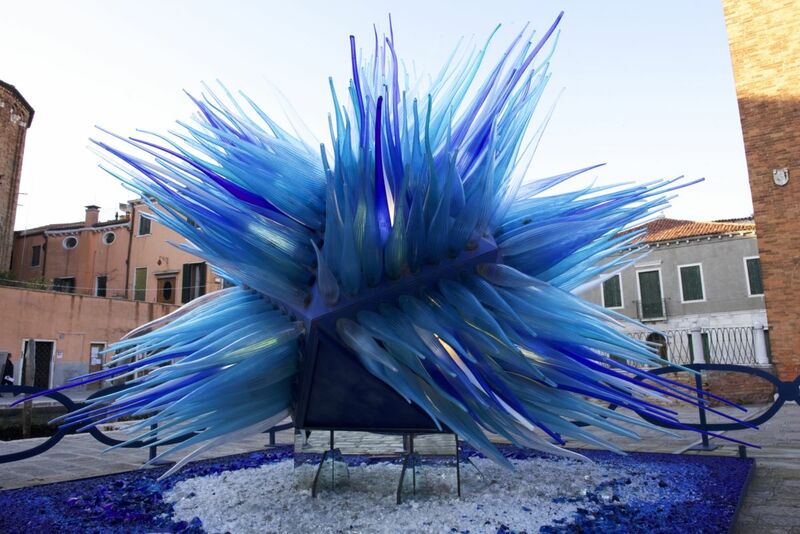 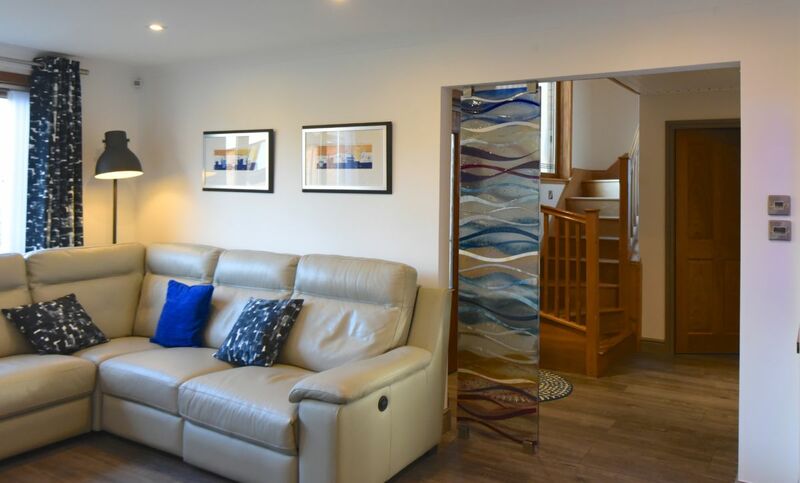 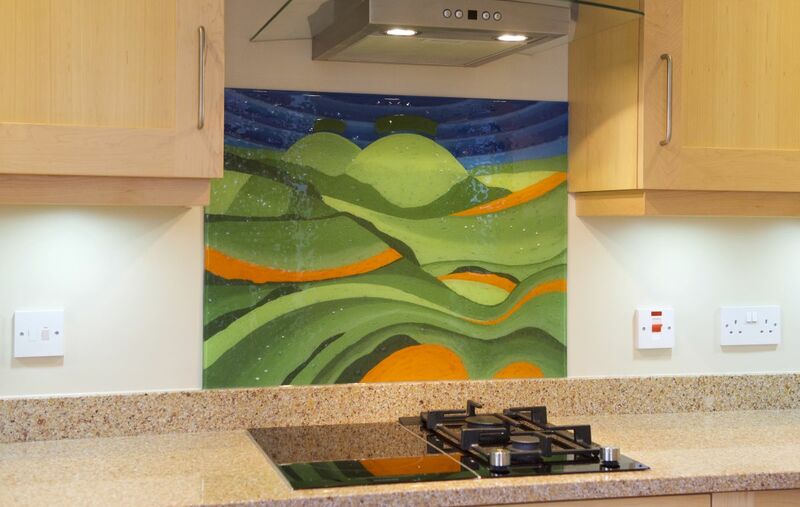 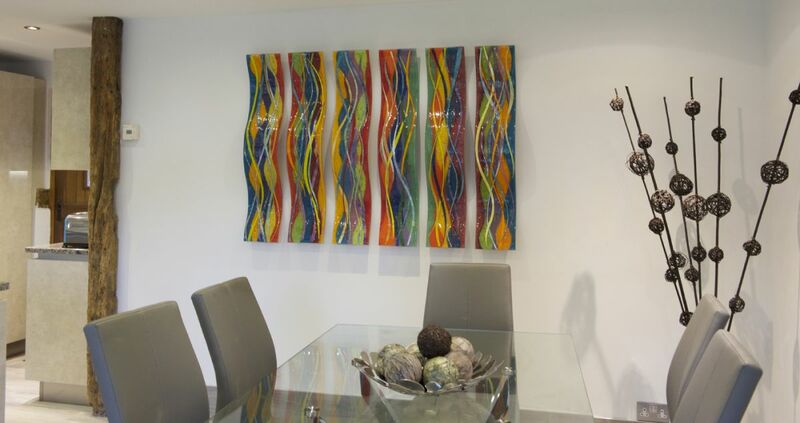 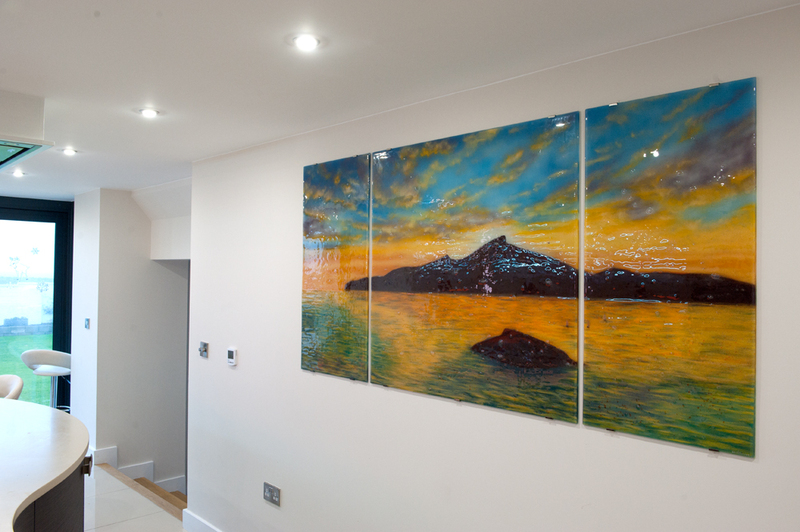 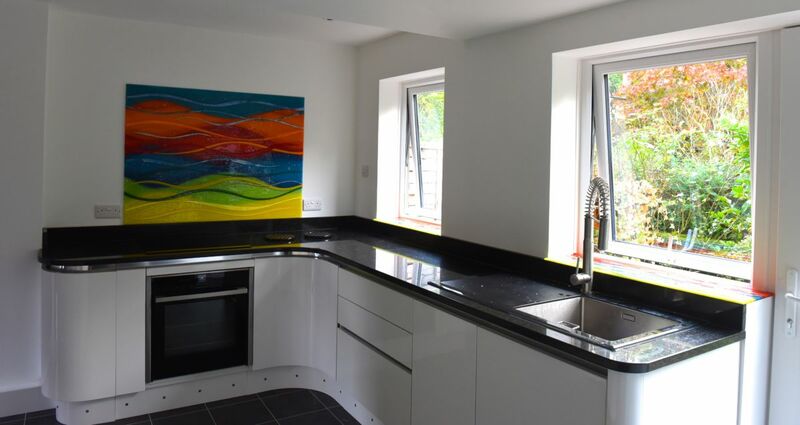 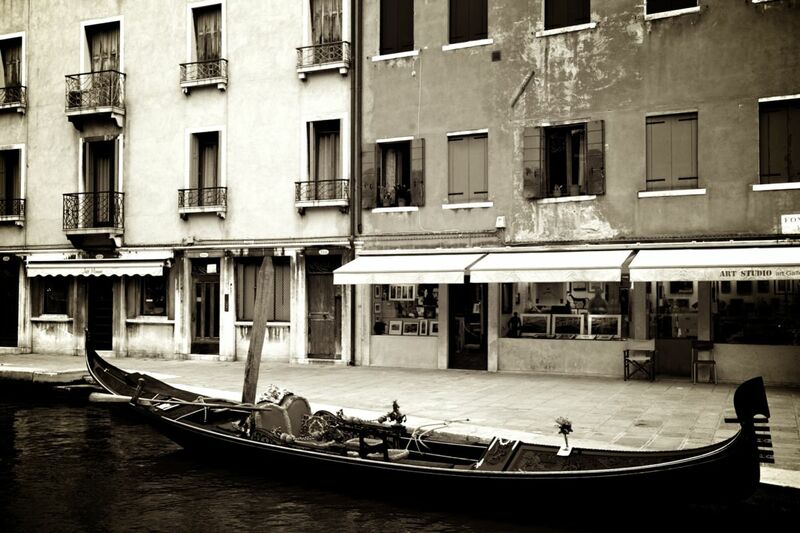 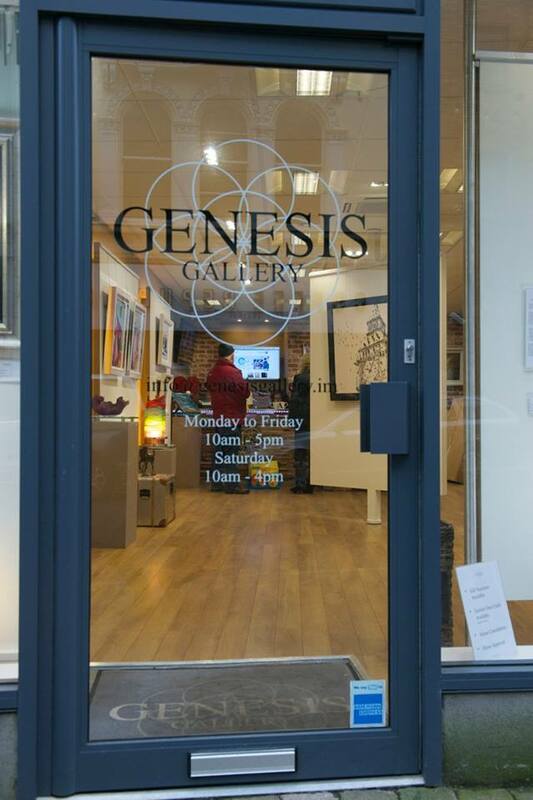 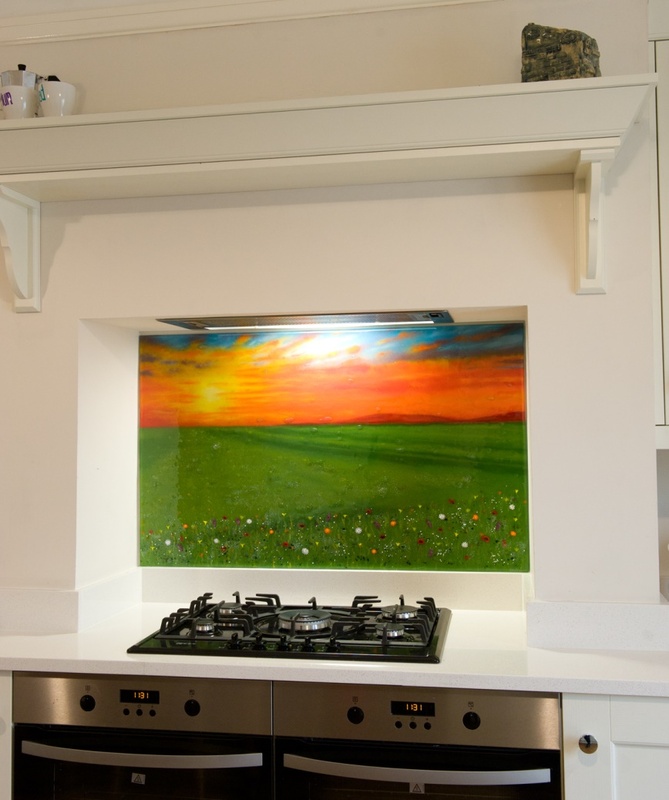 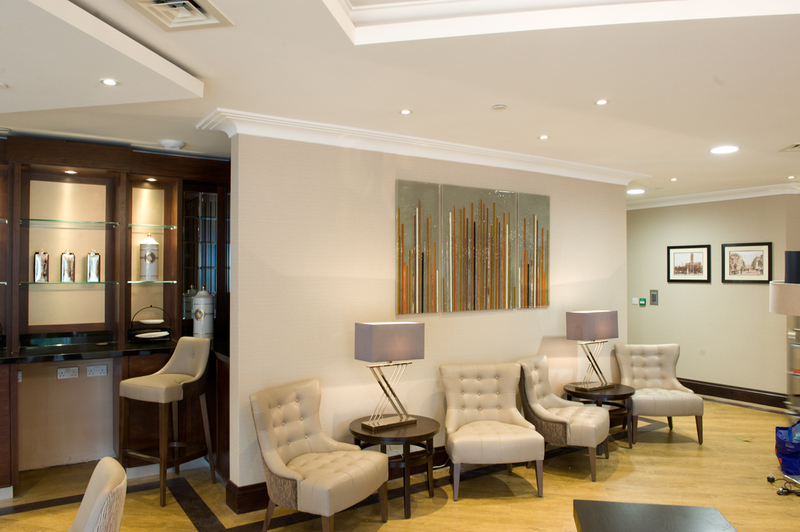 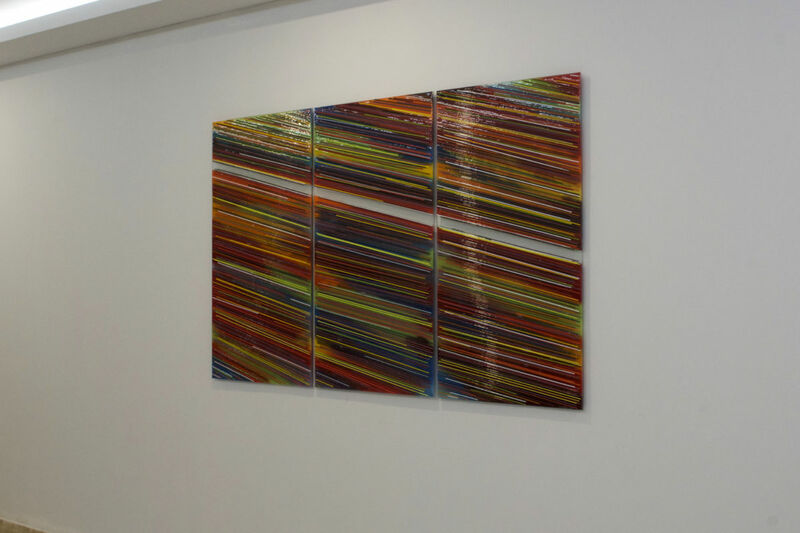 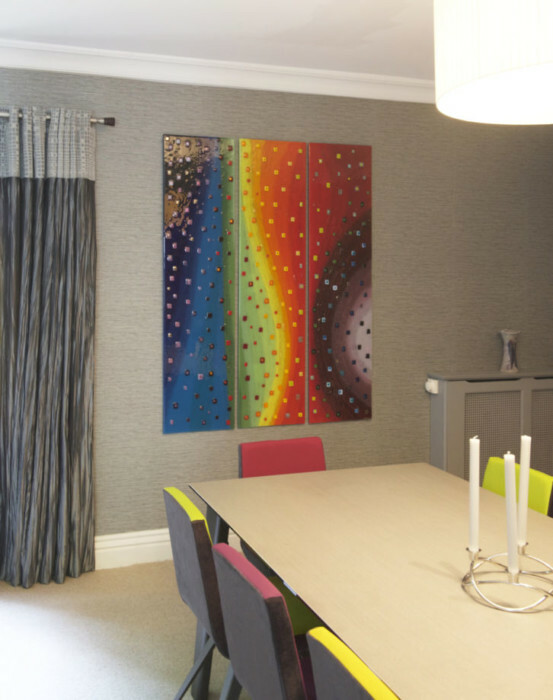 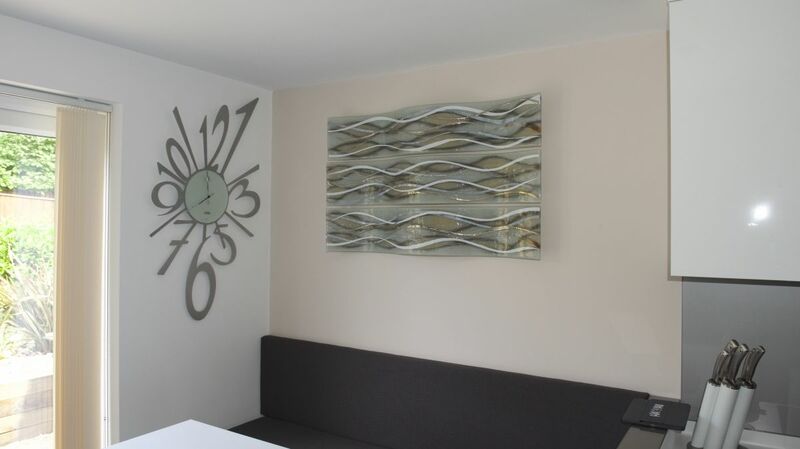 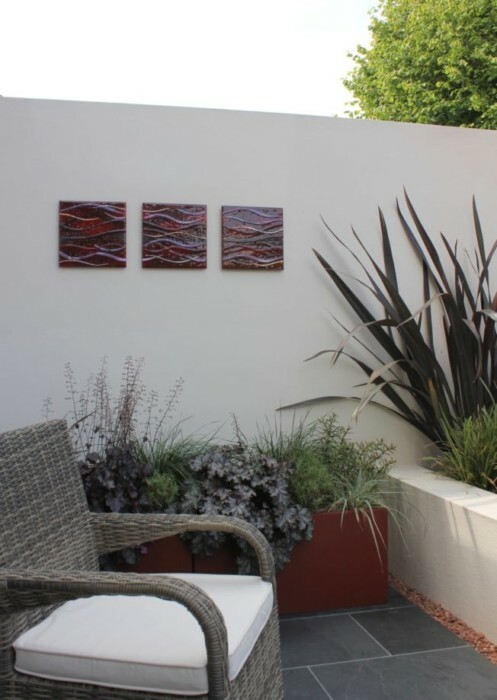 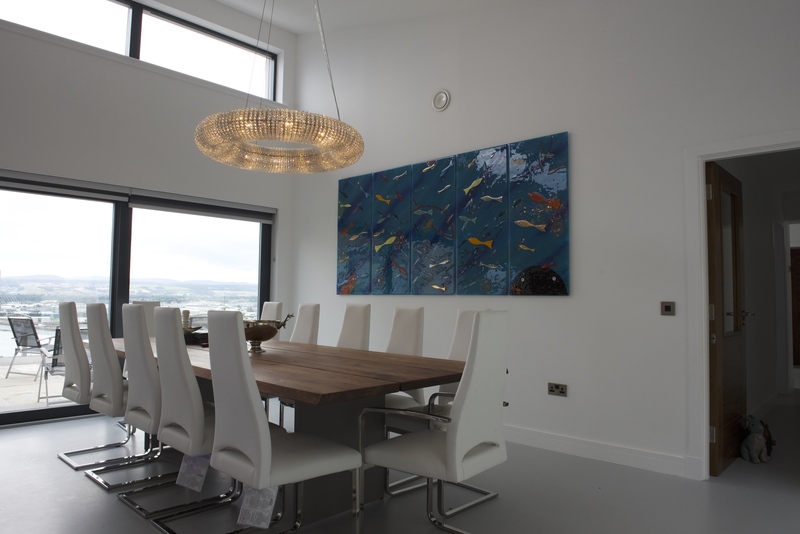 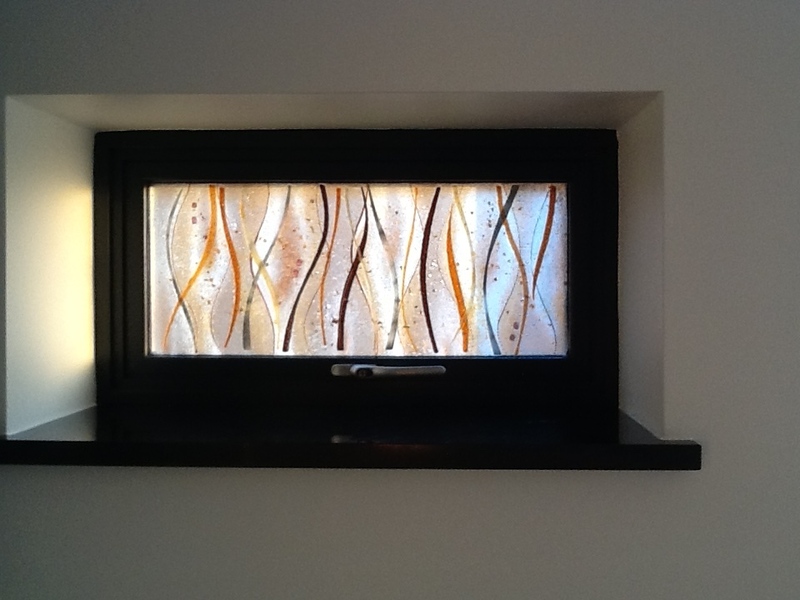 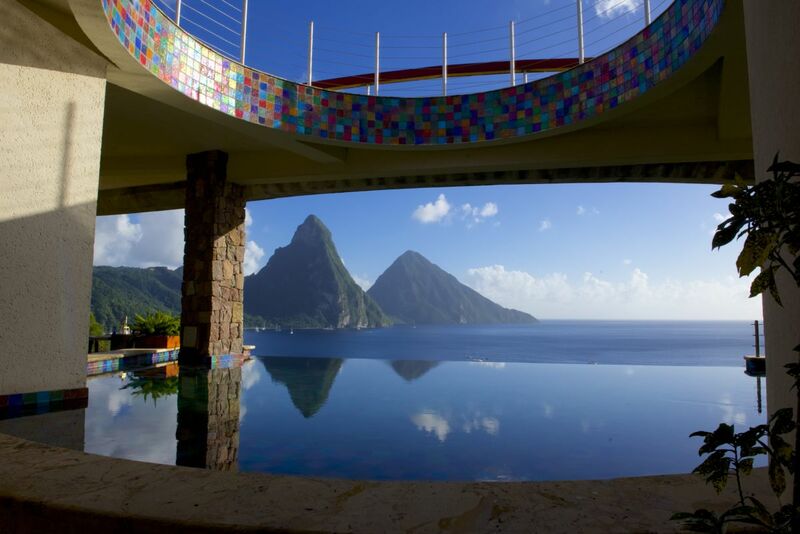 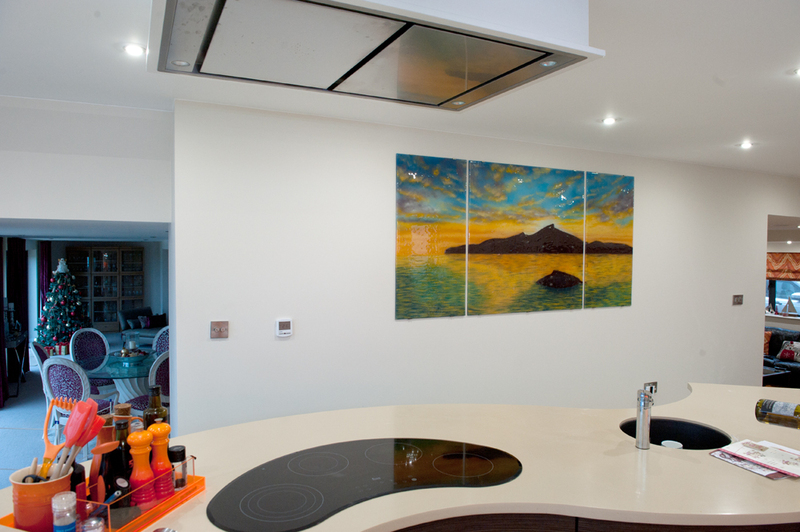 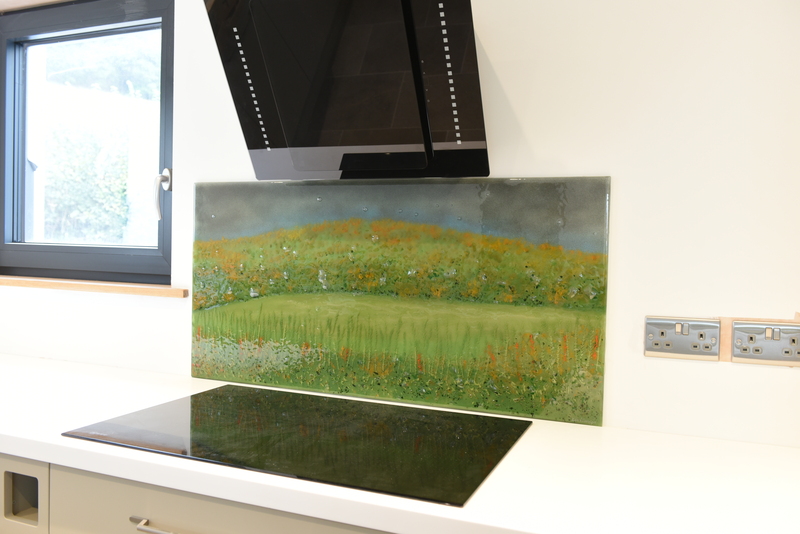 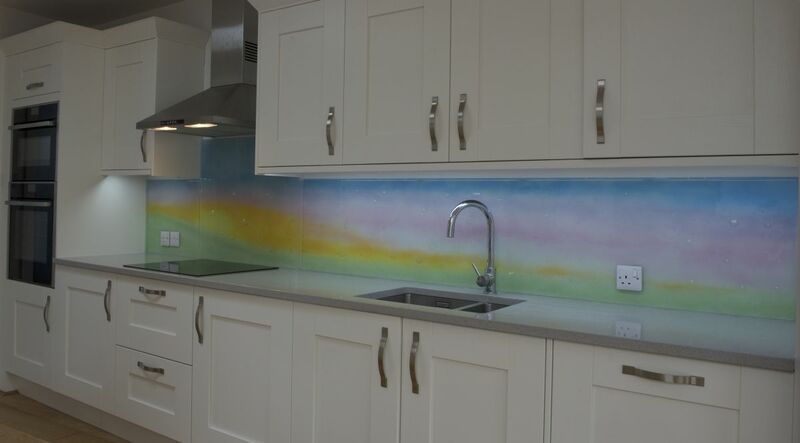 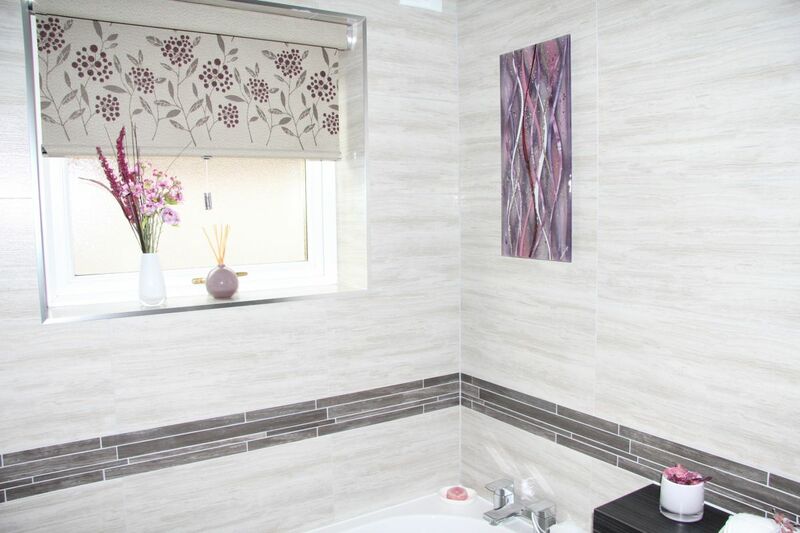 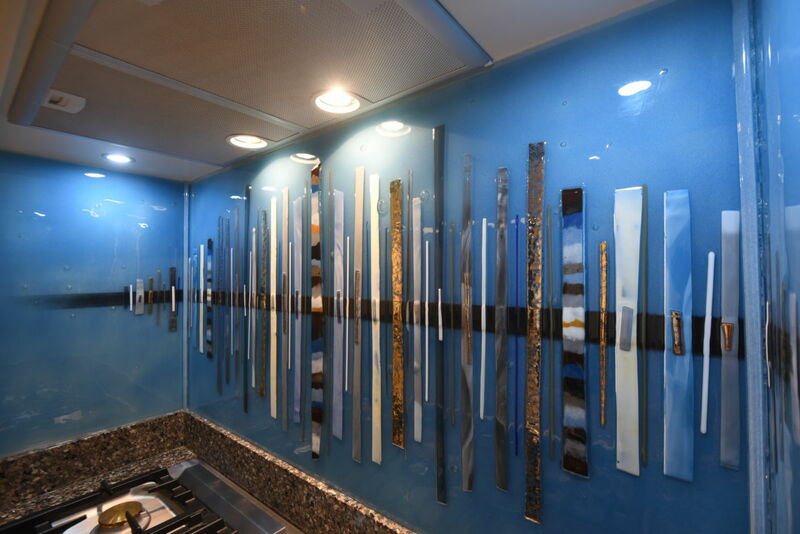 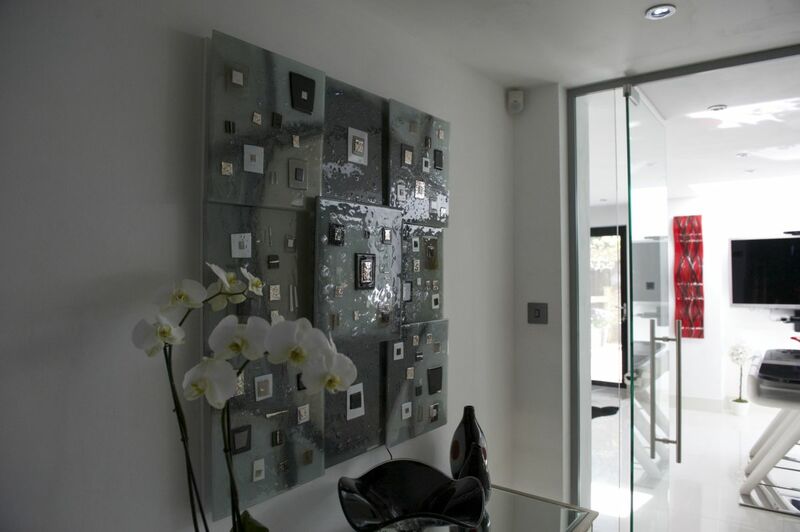 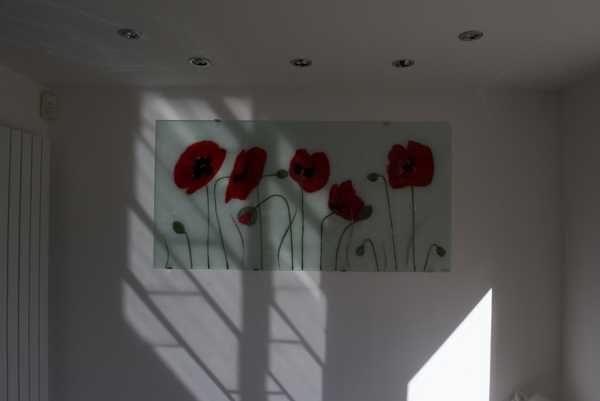 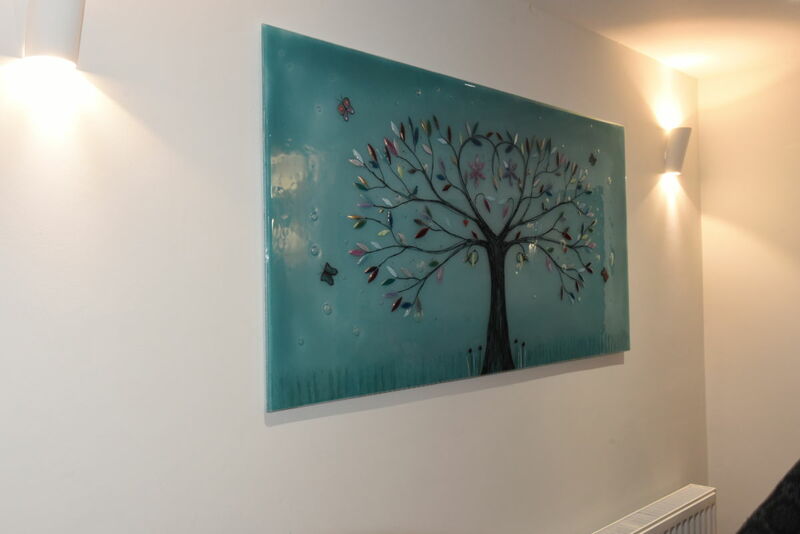 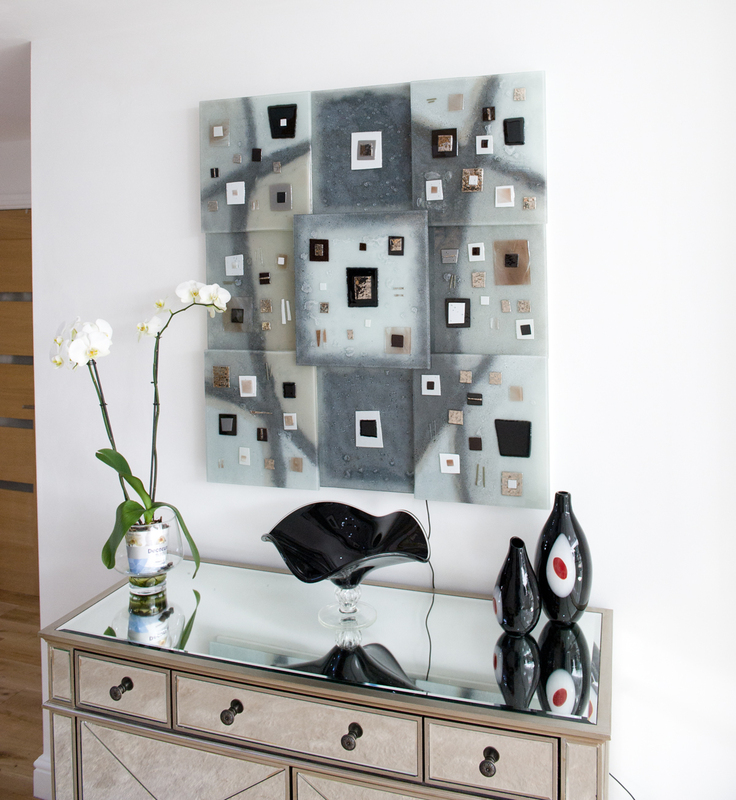 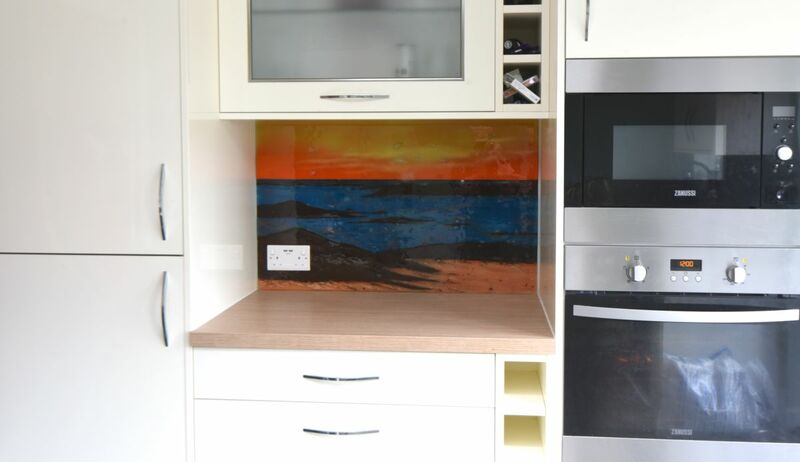 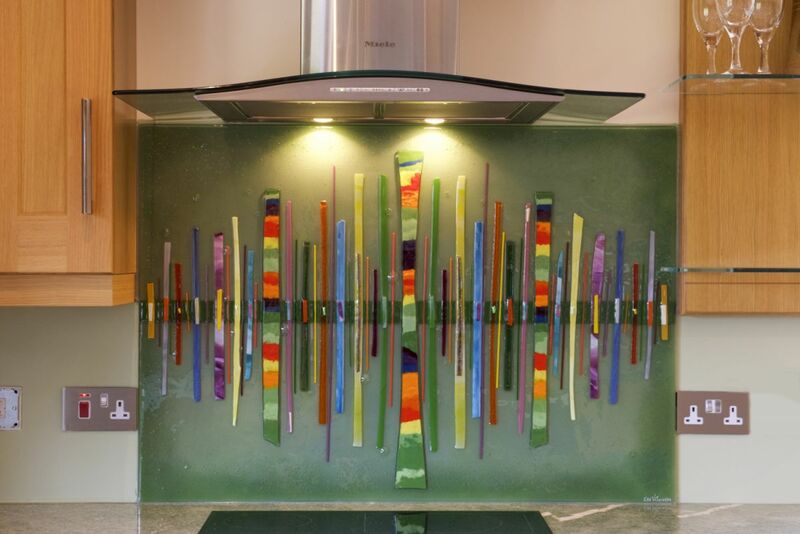 It’s bespoke fused glass art at its best, looking every bit as good as the scenic location that we delivered it to. 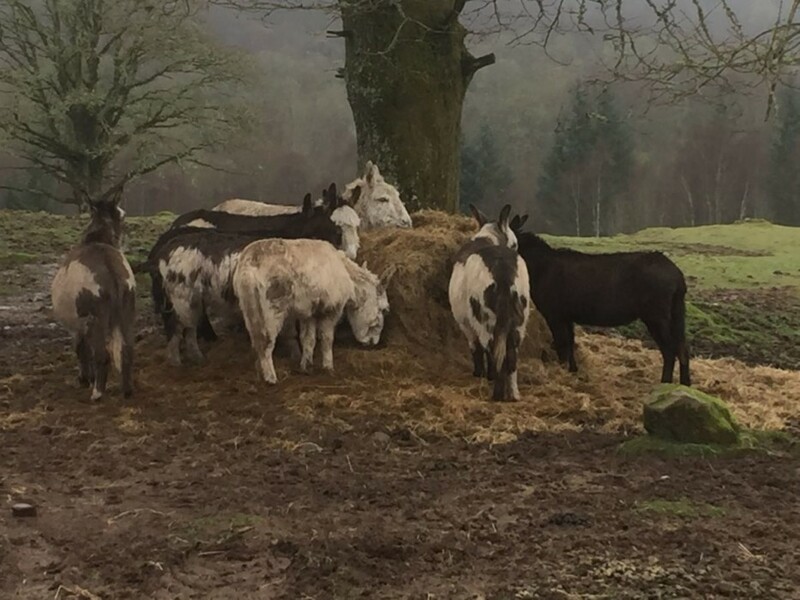 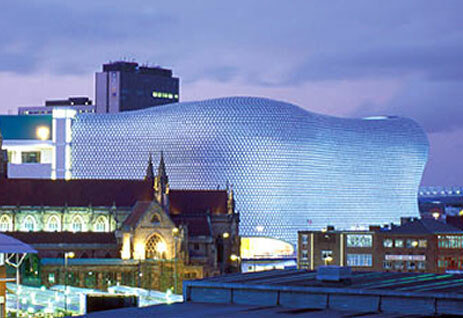 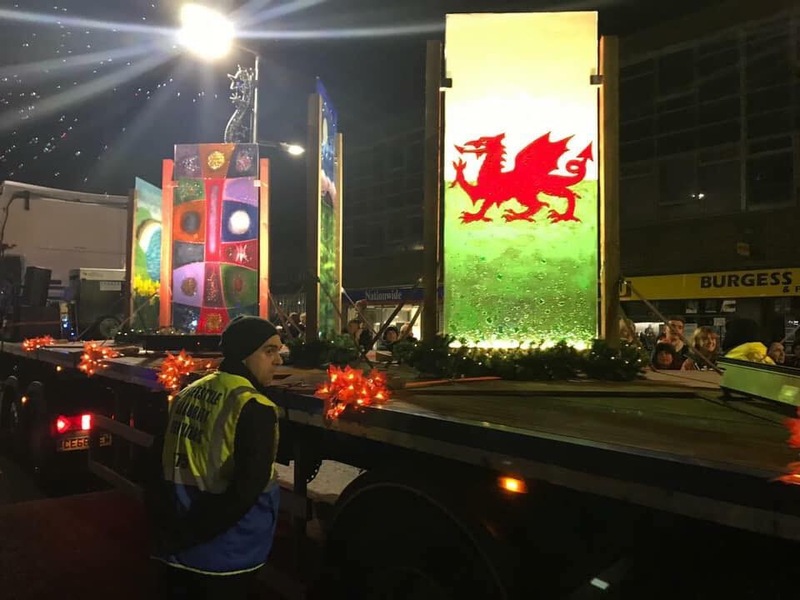 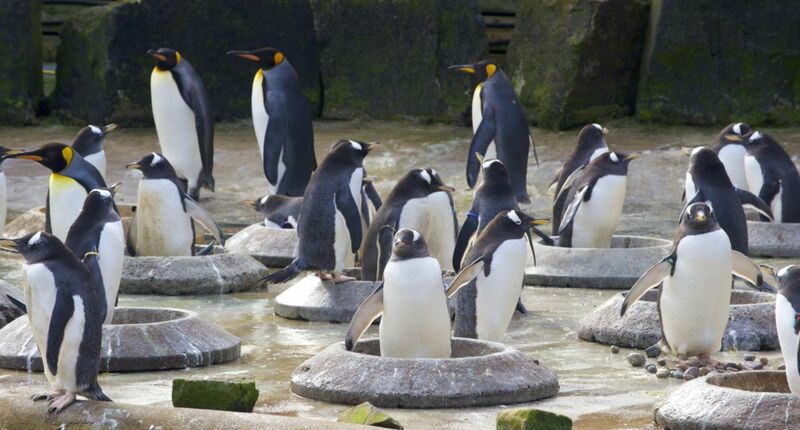 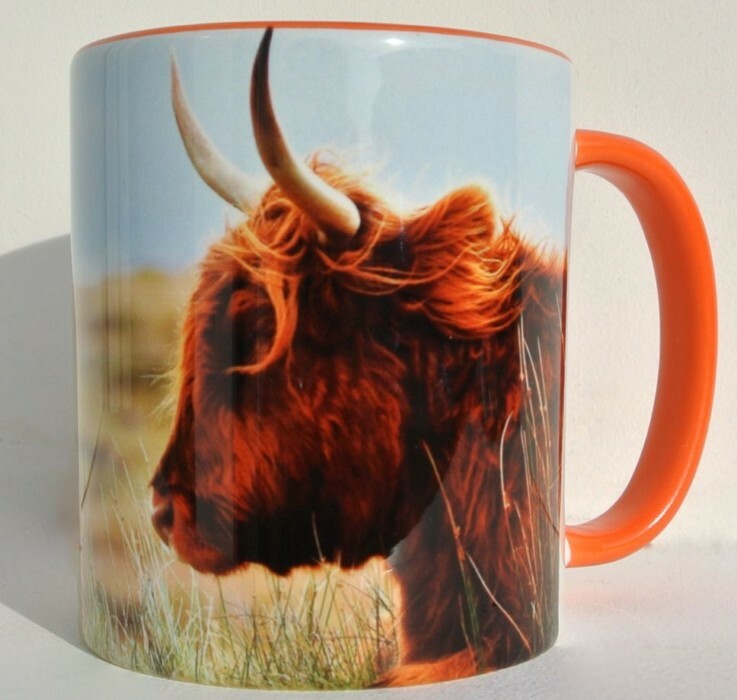 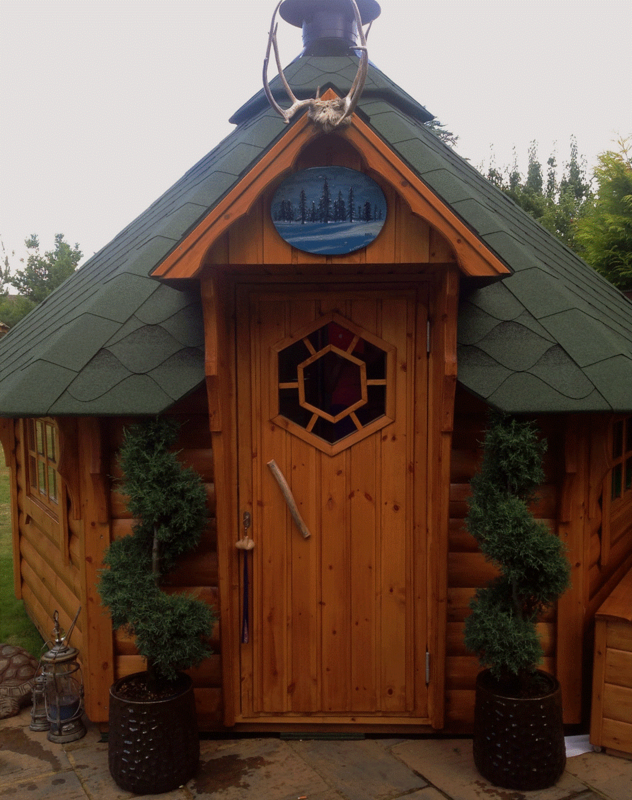 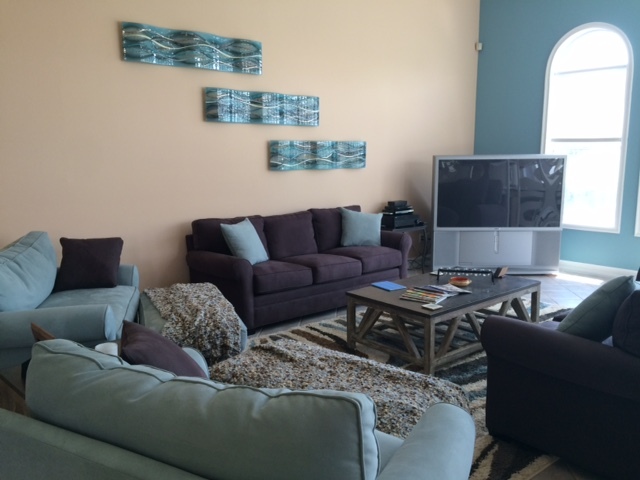 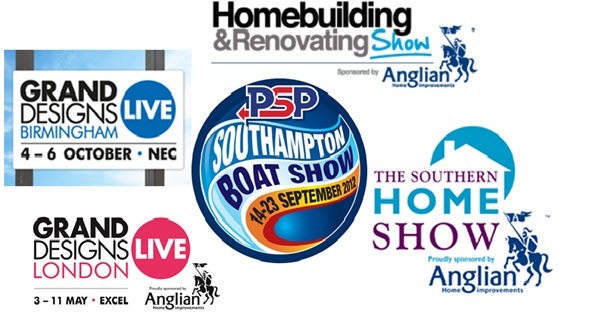 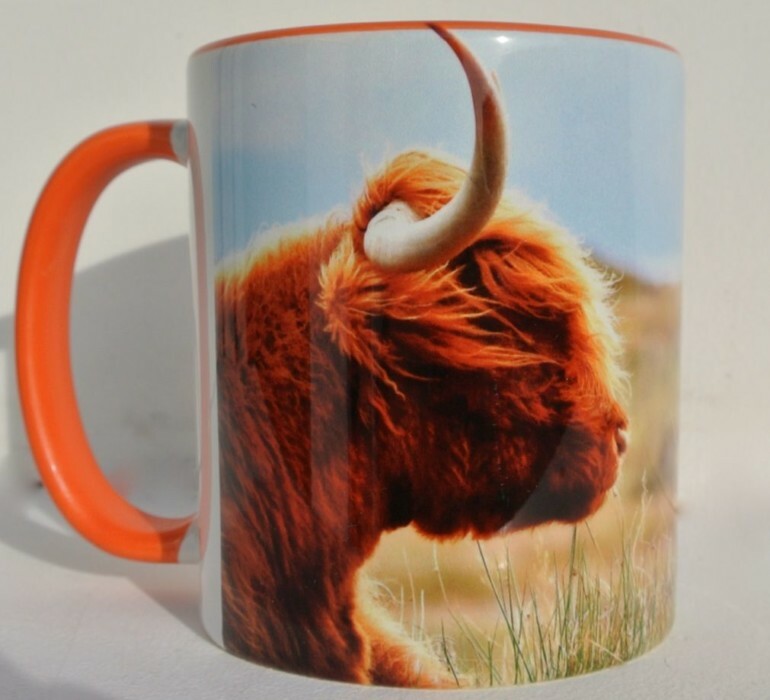 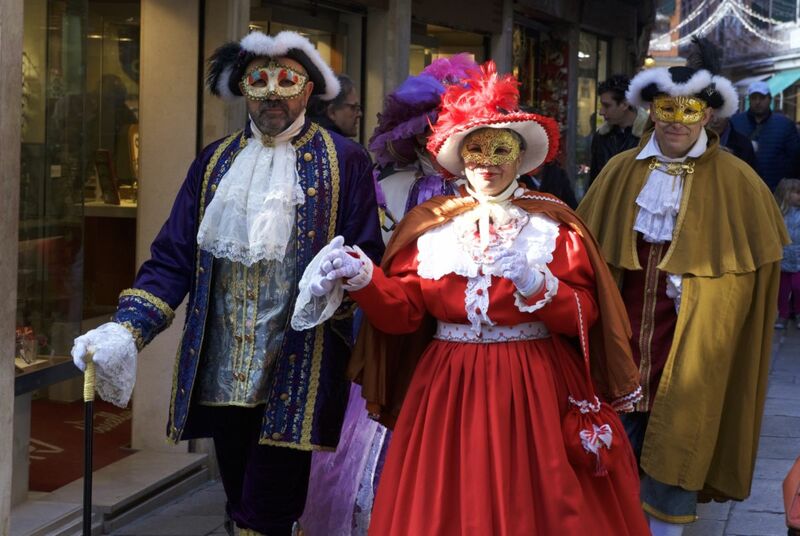 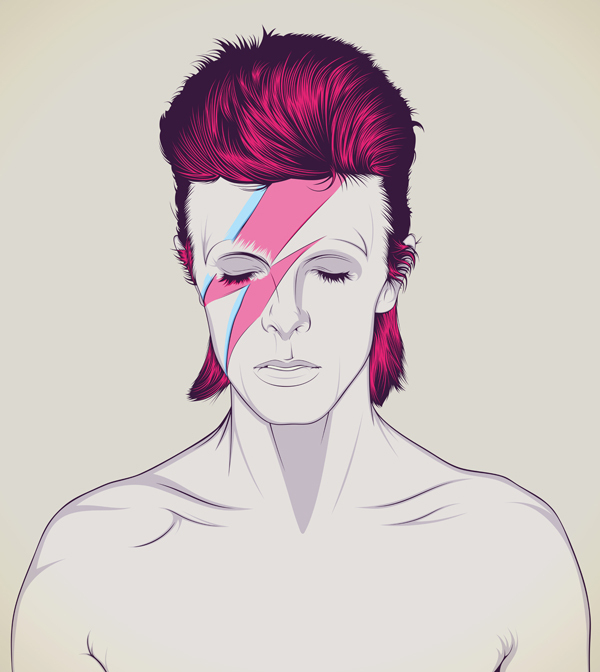 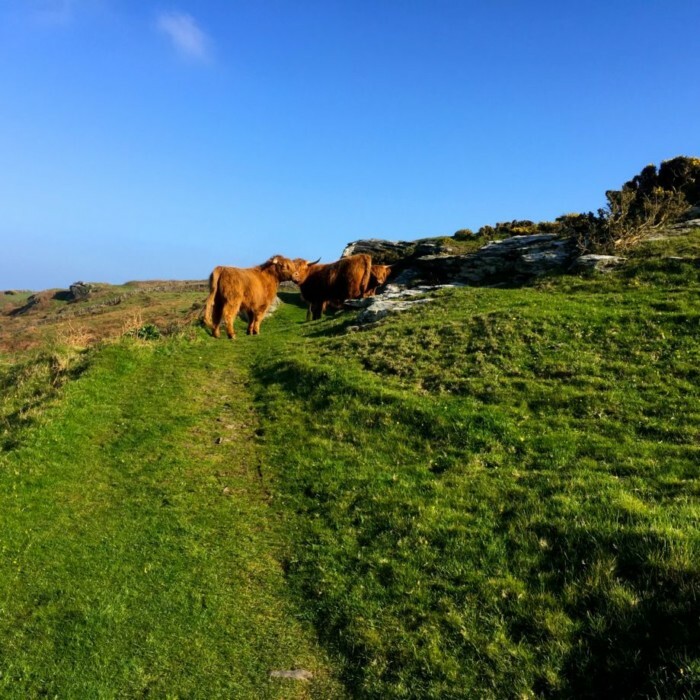 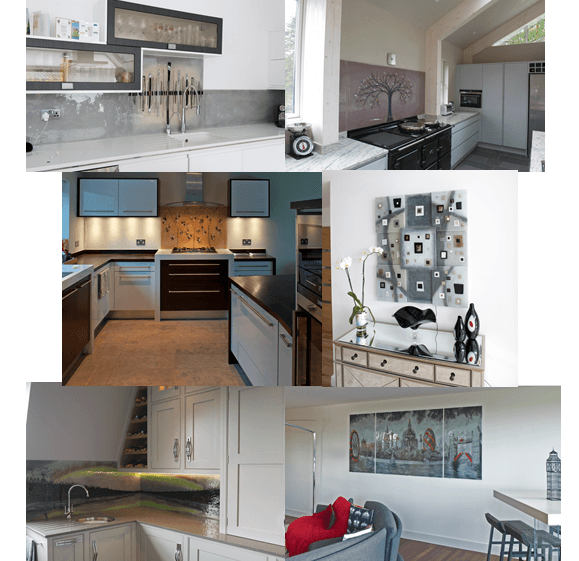 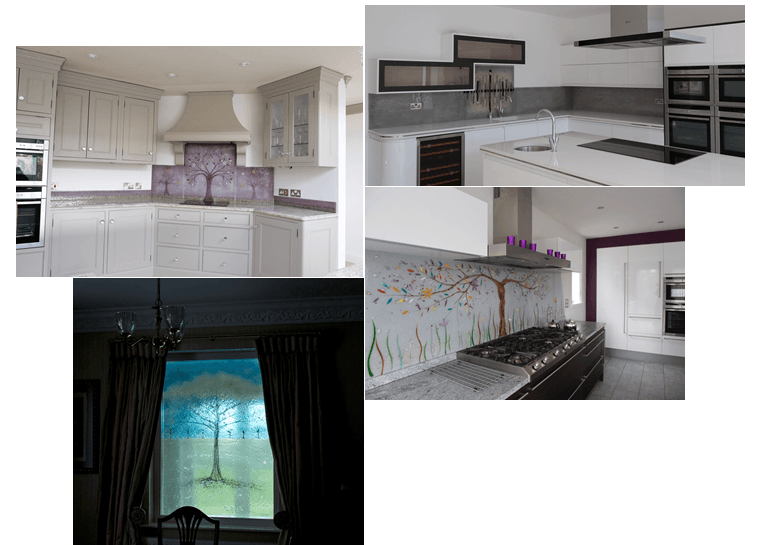 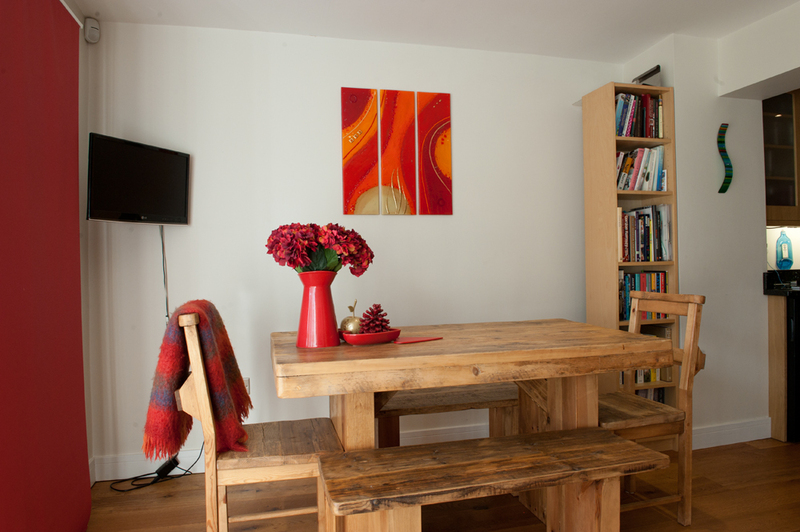 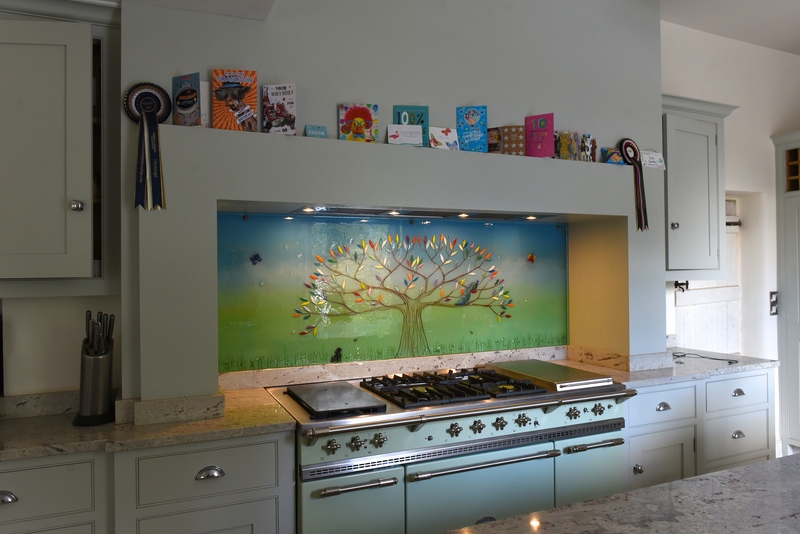 As you might expect, we’re very keen to show it off here on our blog! 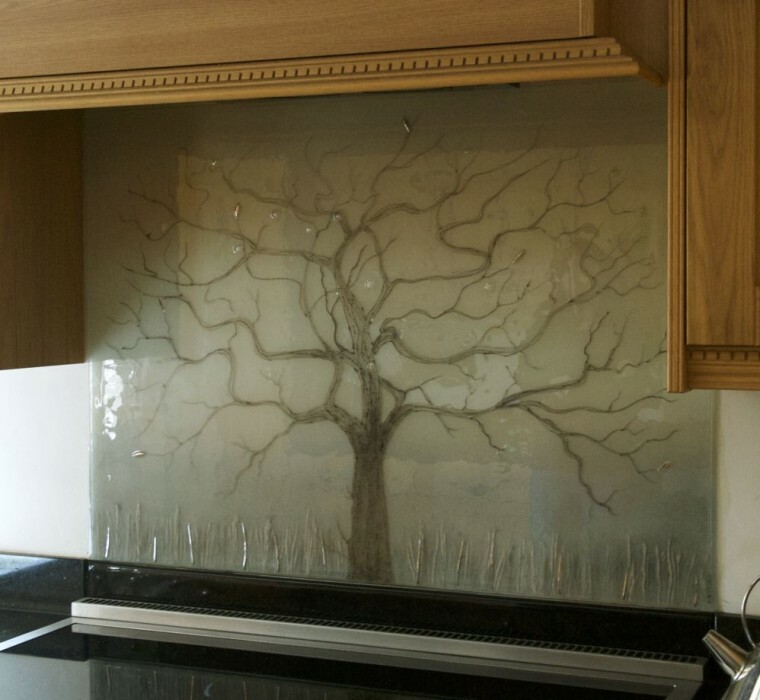 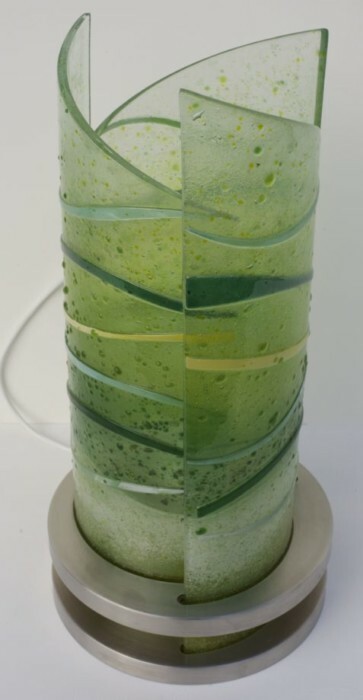 The design is definitely a very interesting one. 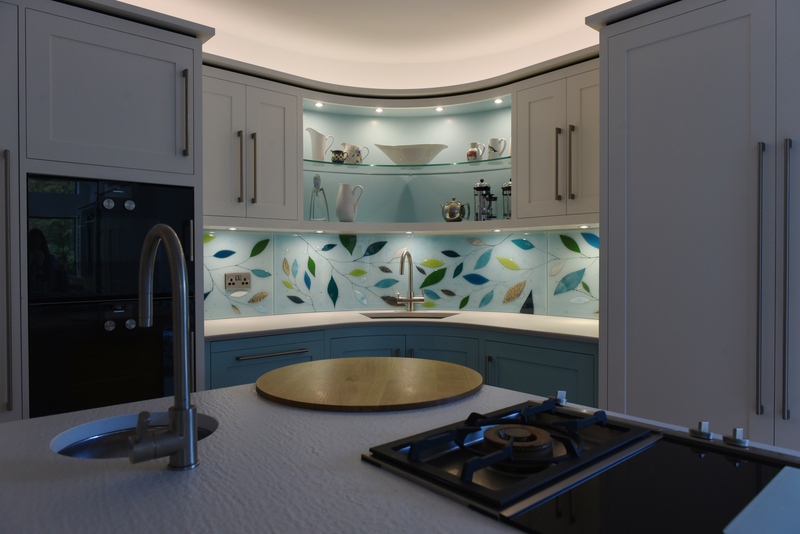 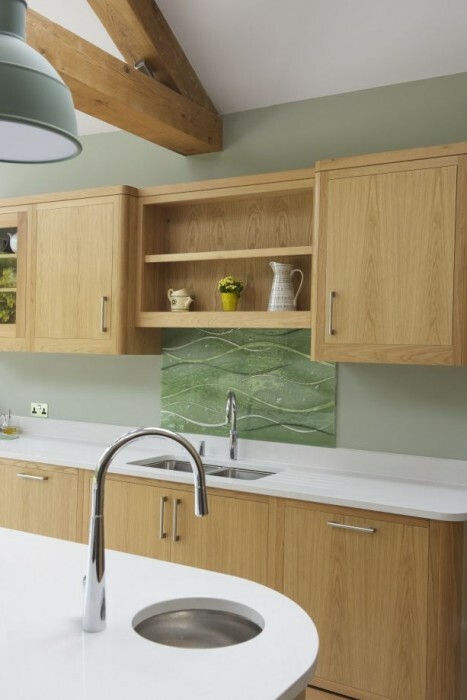 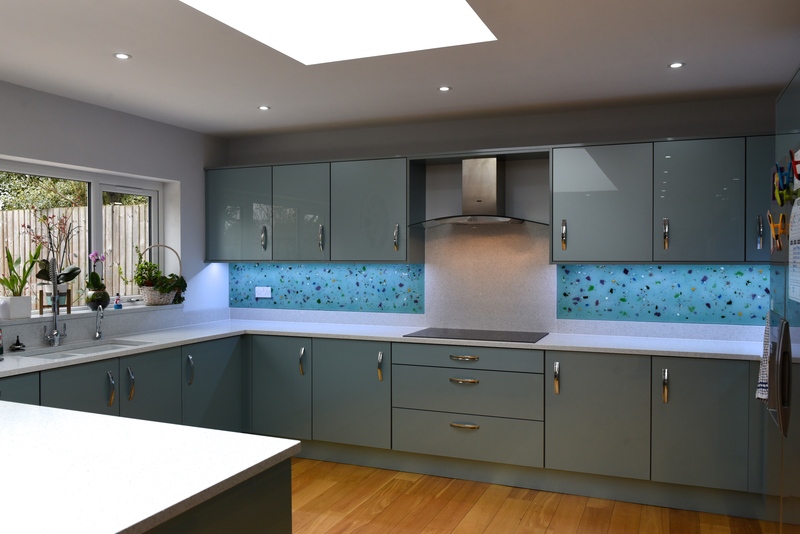 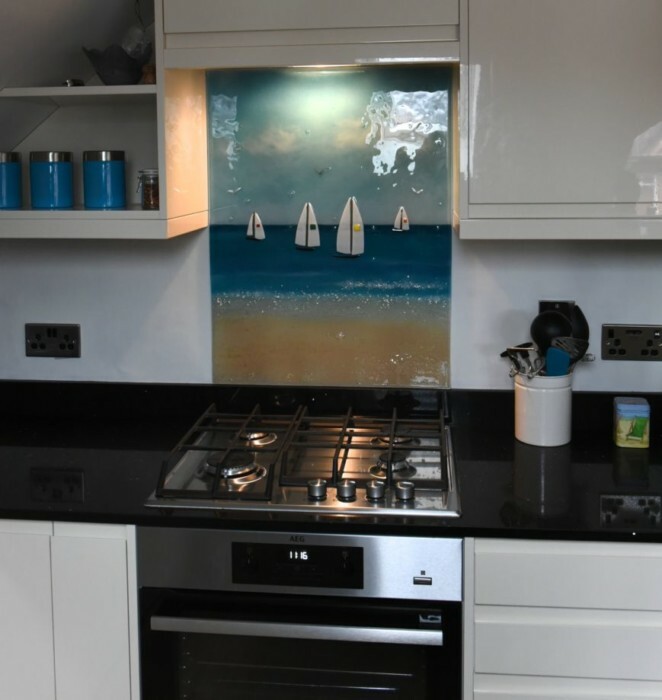 It’s a variation on our widely loved Wave design, with the waves running vertically and a colour palette that’s soft and simply lovely to look at. 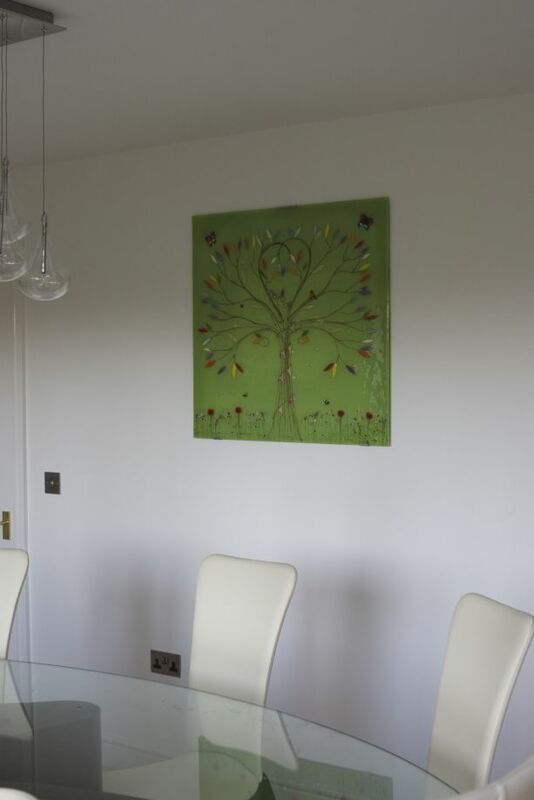 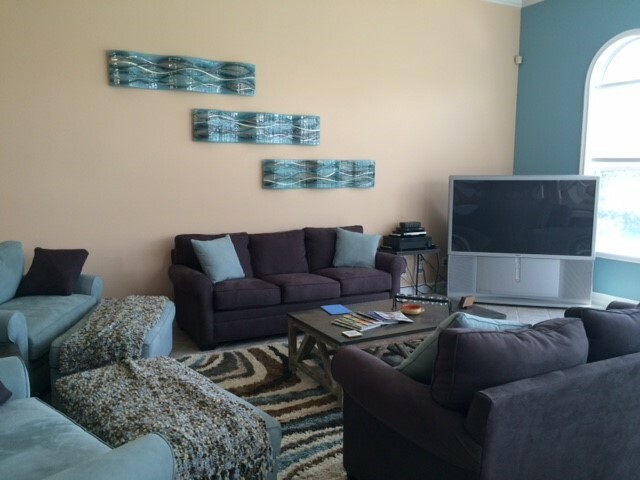 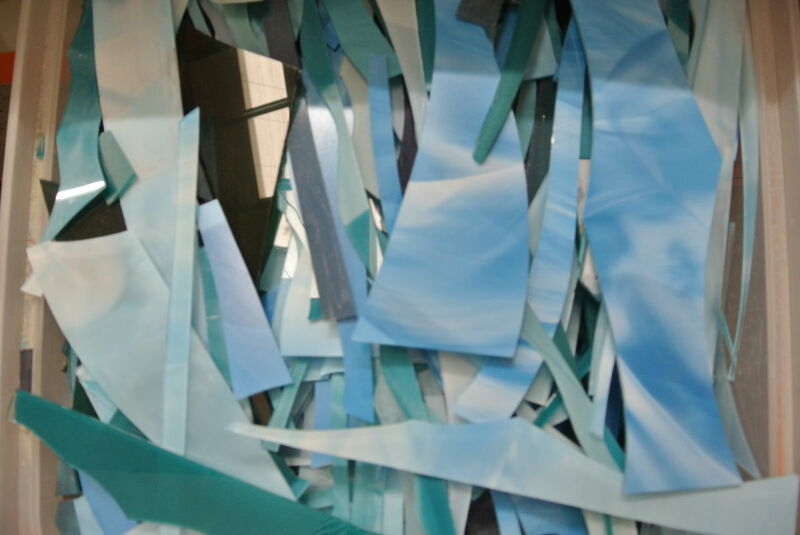 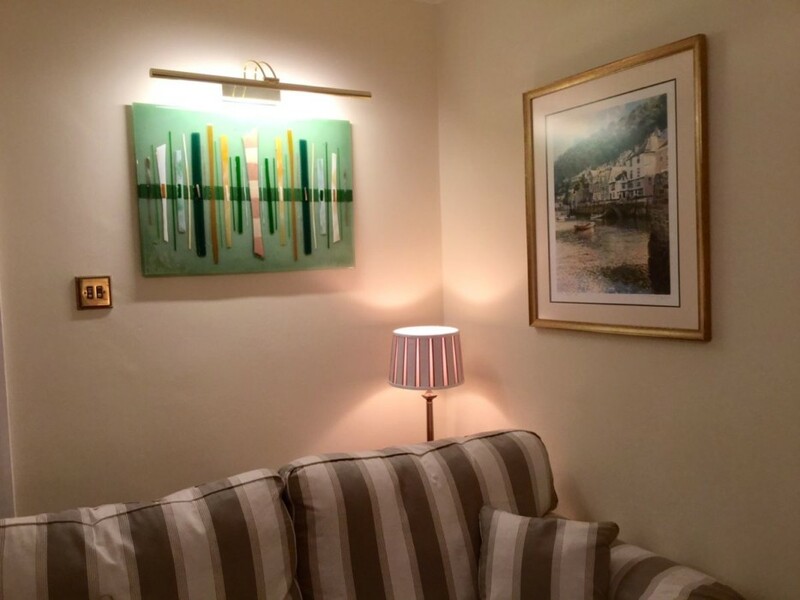 The background is made of three colours blending together, mixing the white of the wall behind the piece with blue and green to create a very peaceful theme. 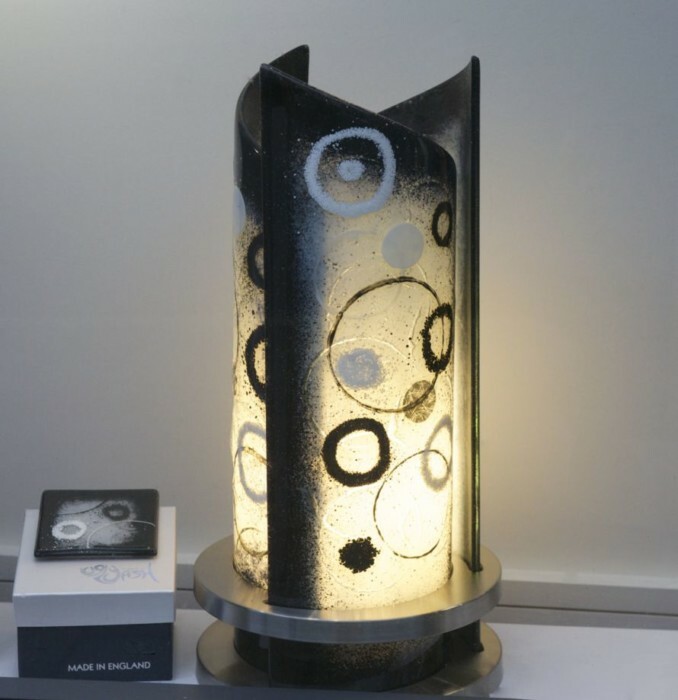 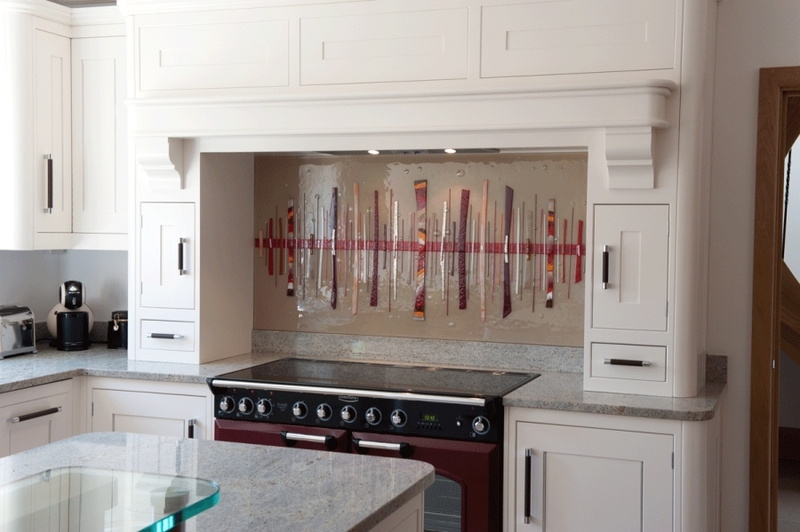 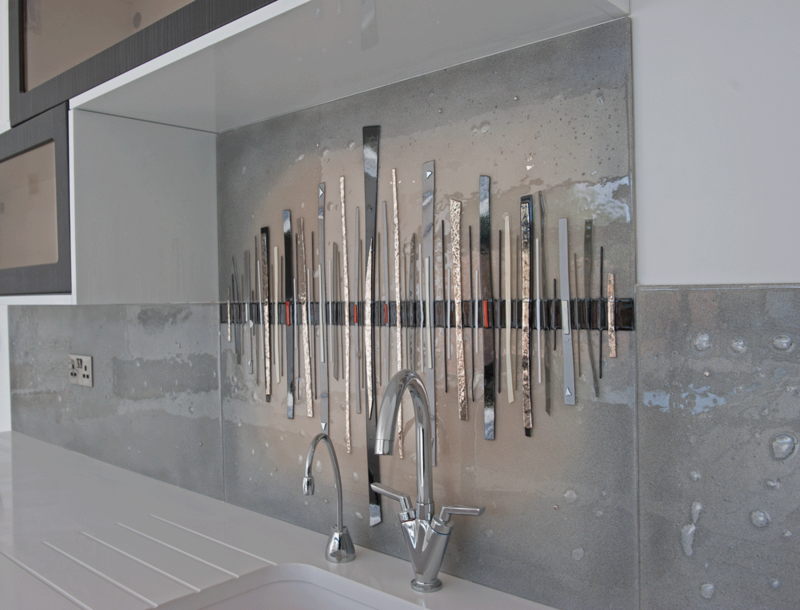 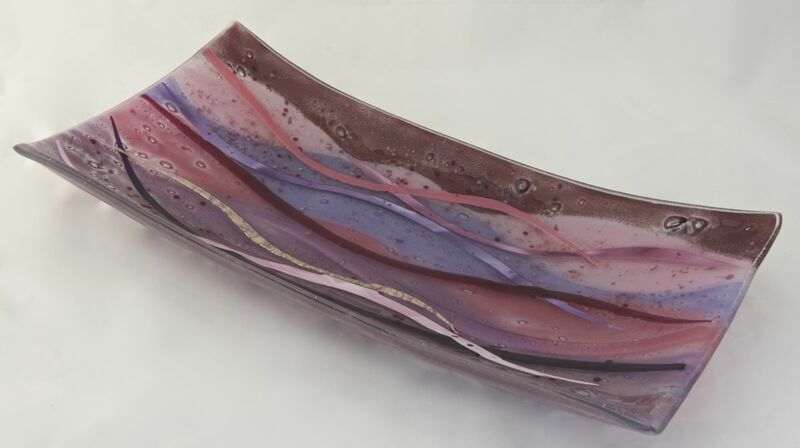 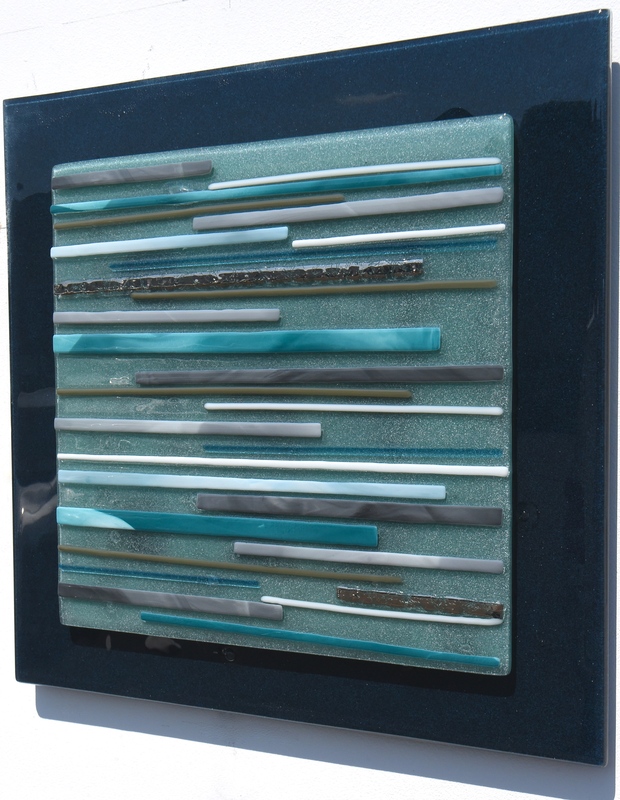 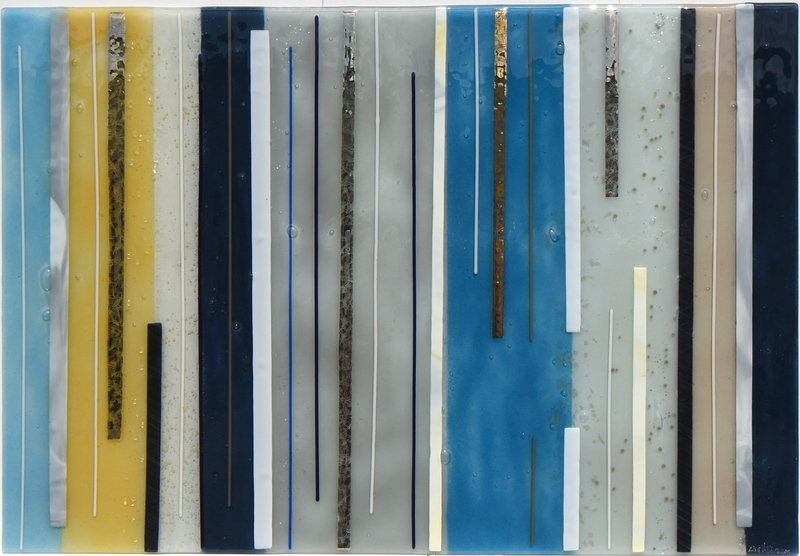 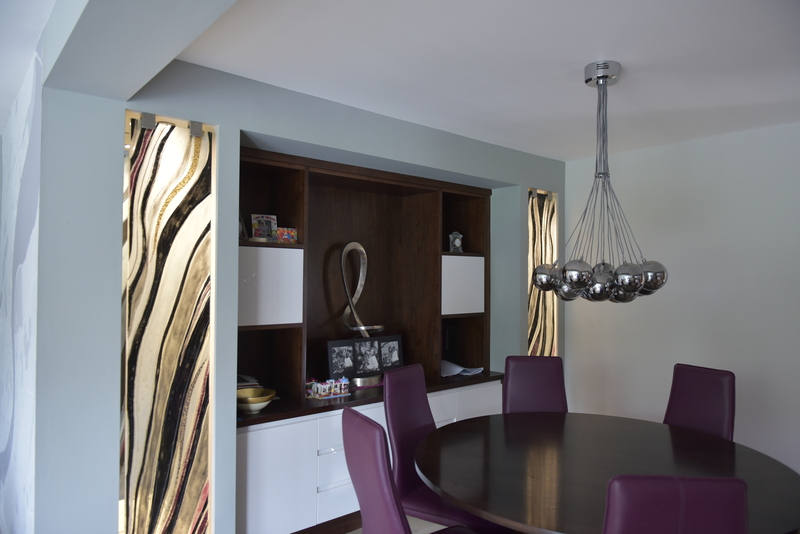 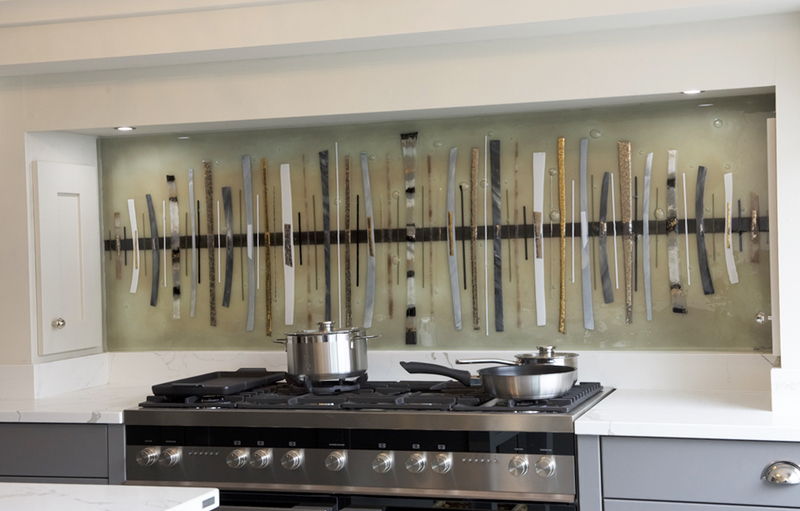 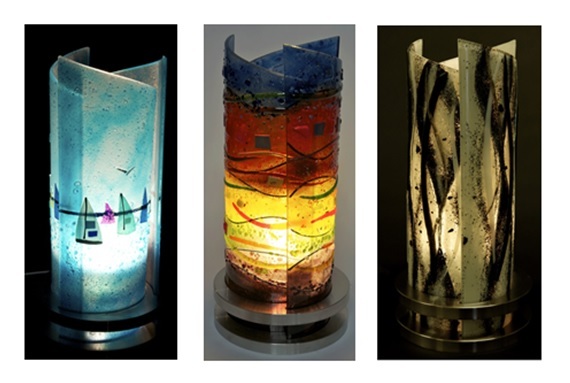 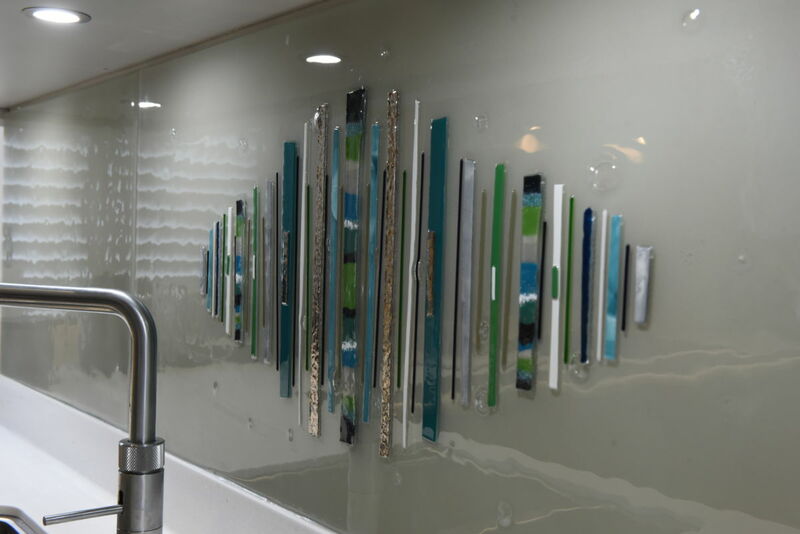 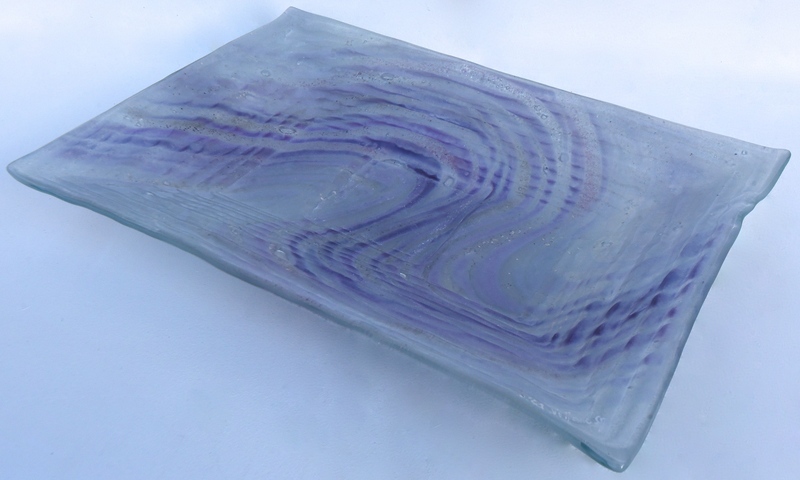 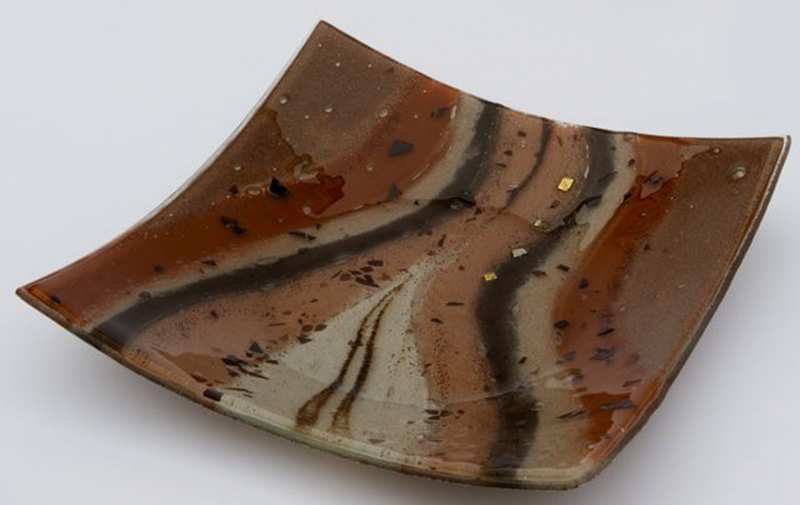 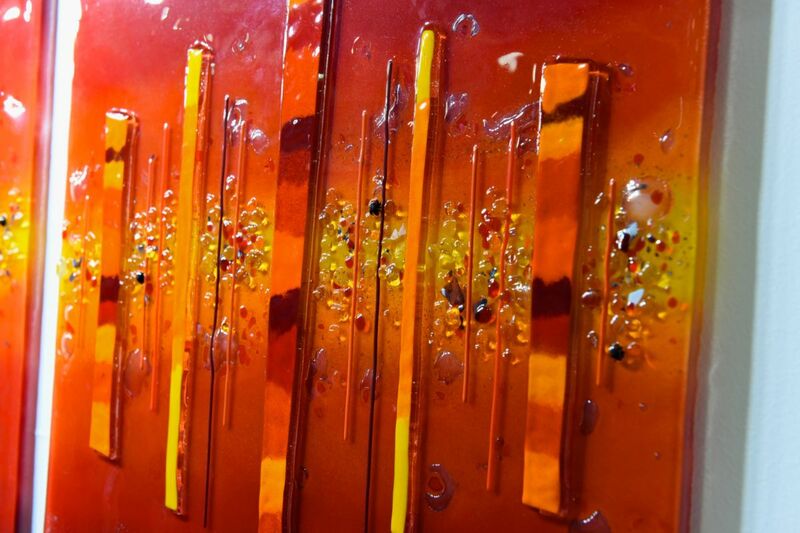 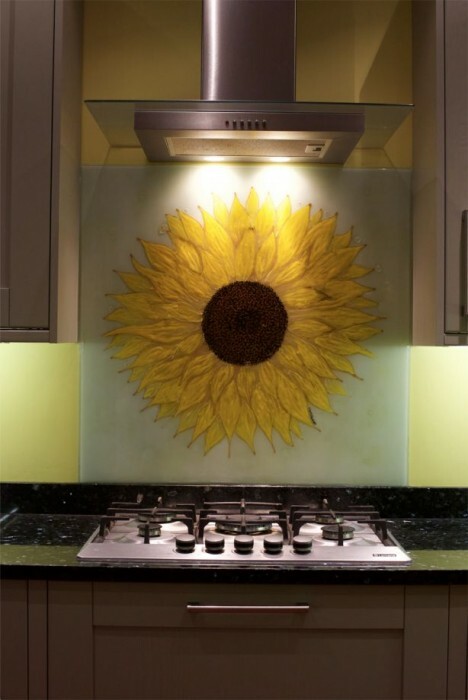 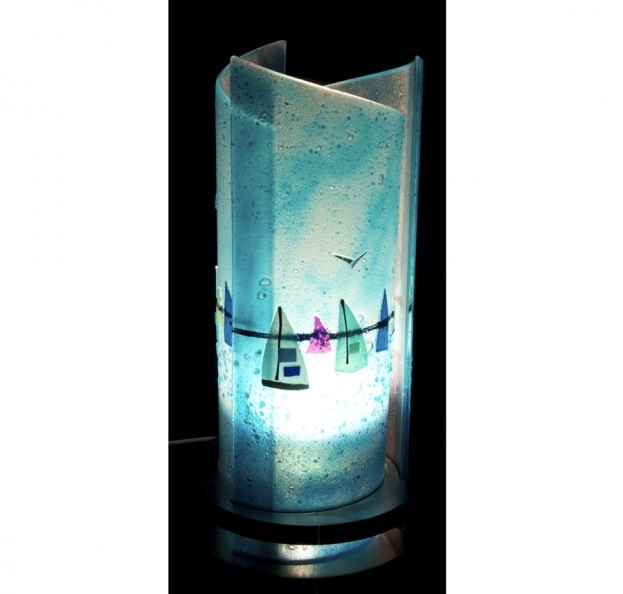 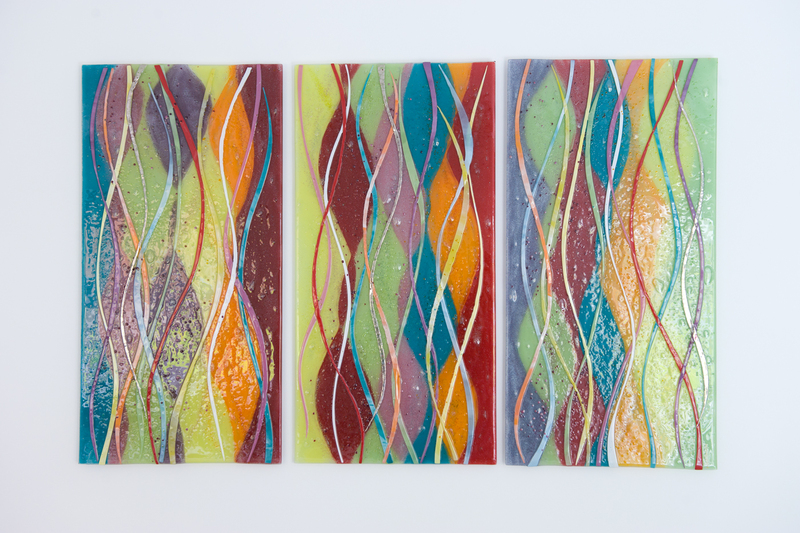 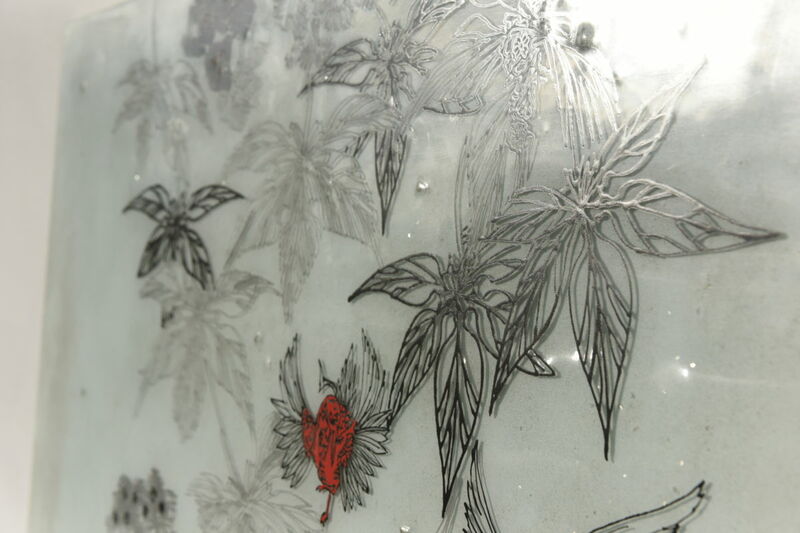 Textured glass cuts run along with them, adding metallic highlights of bright silver to ensure that this piece really bursts with life when the light catches it. 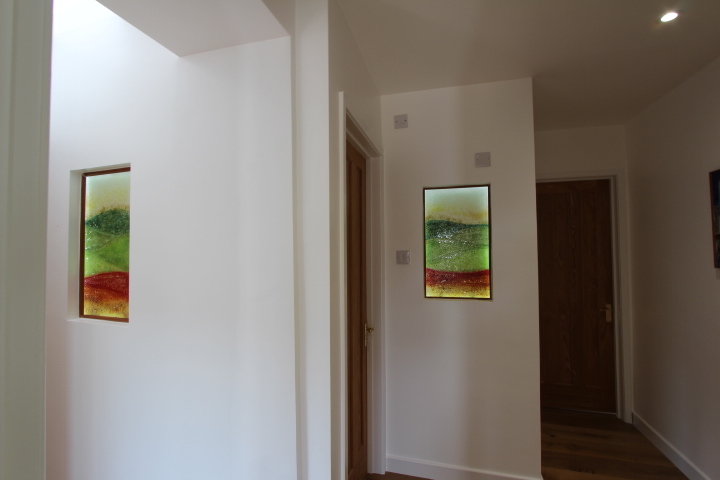 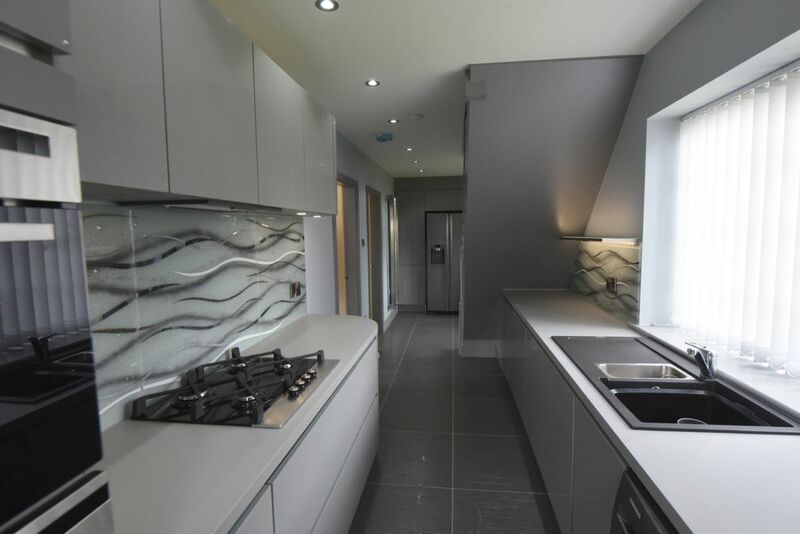 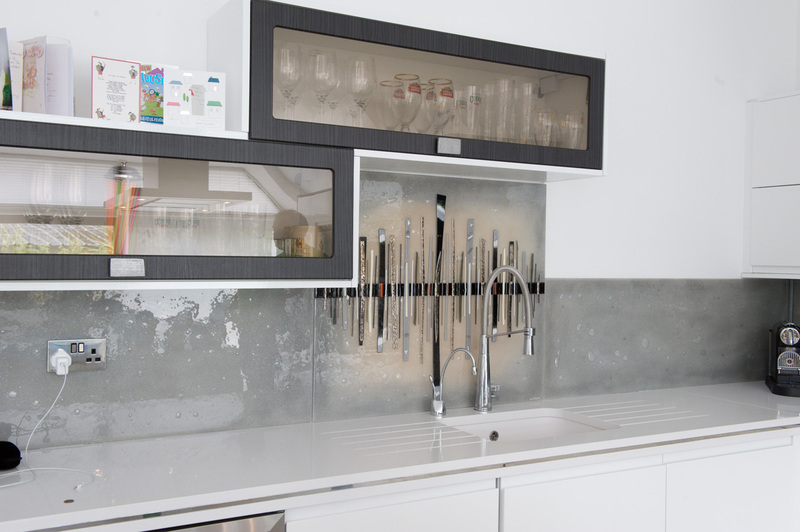 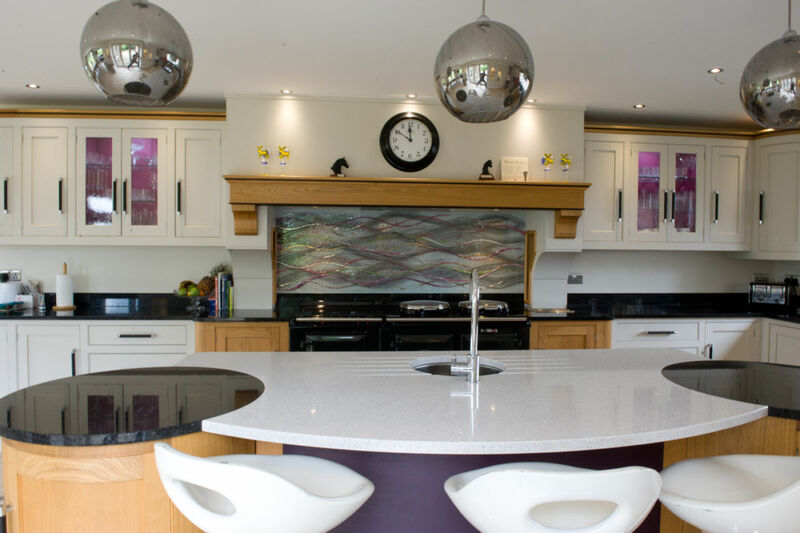 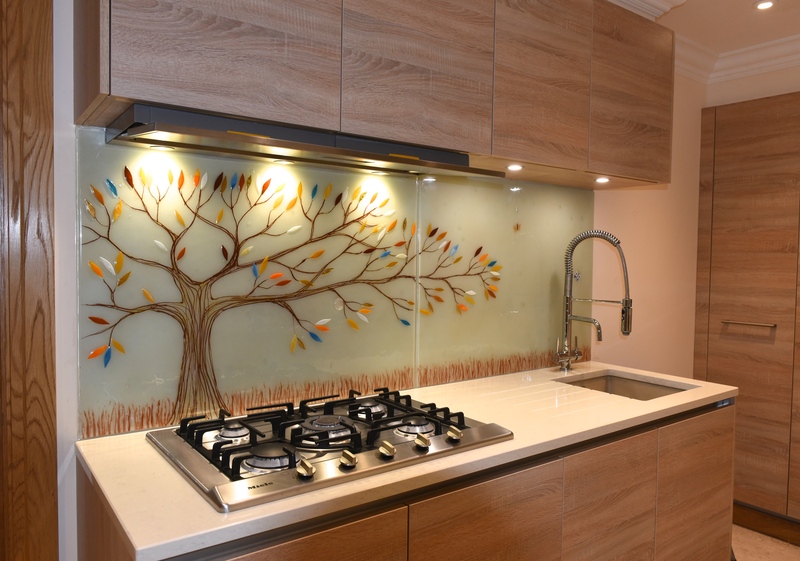 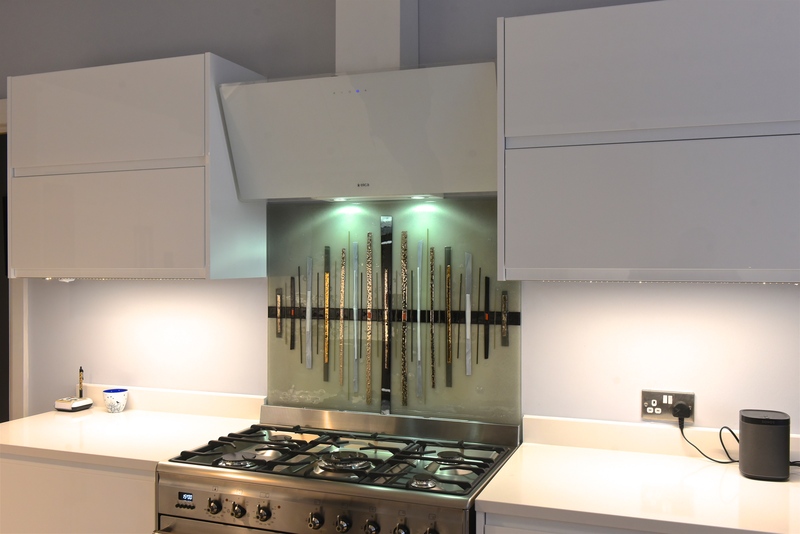 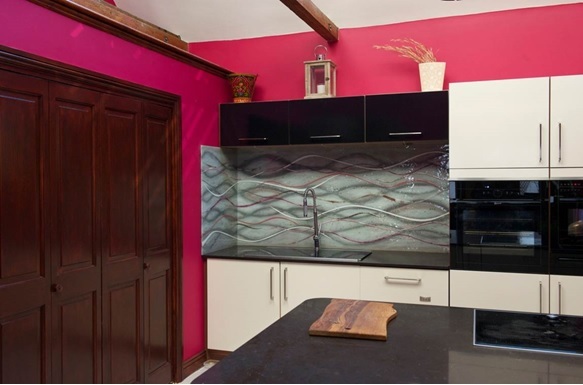 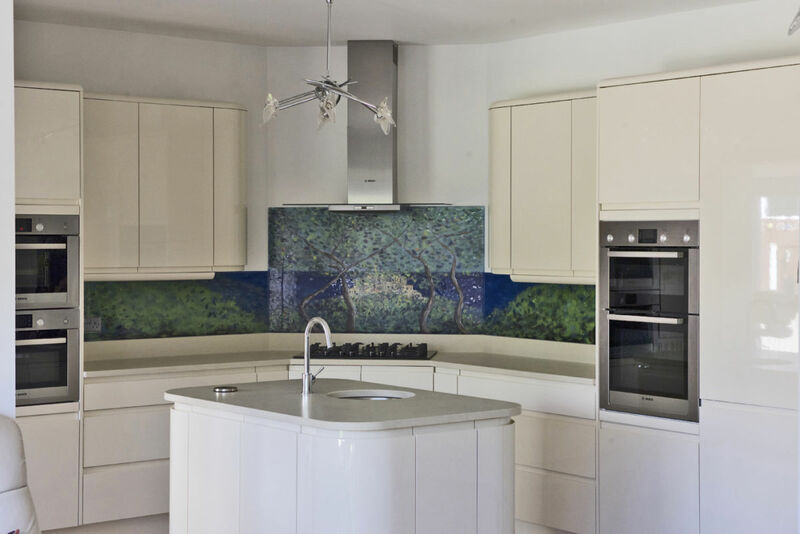 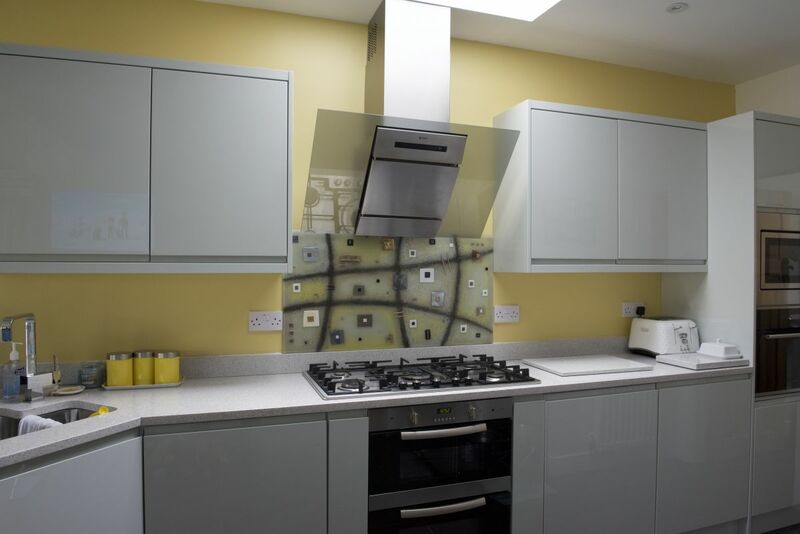 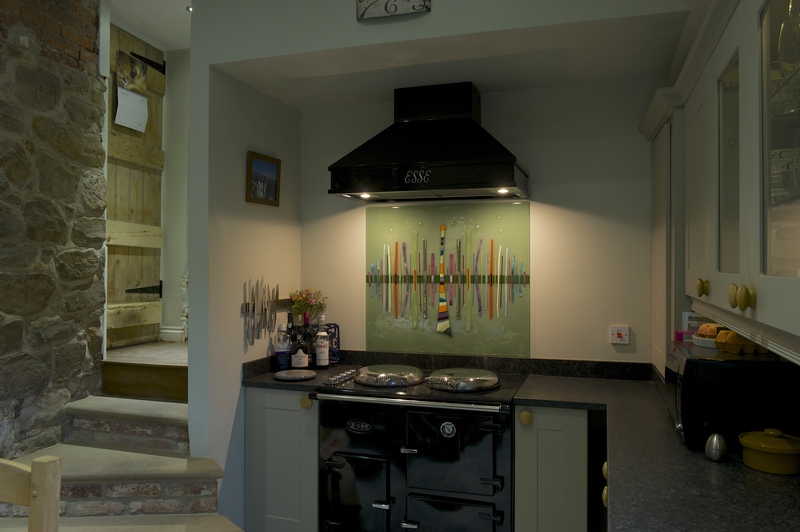 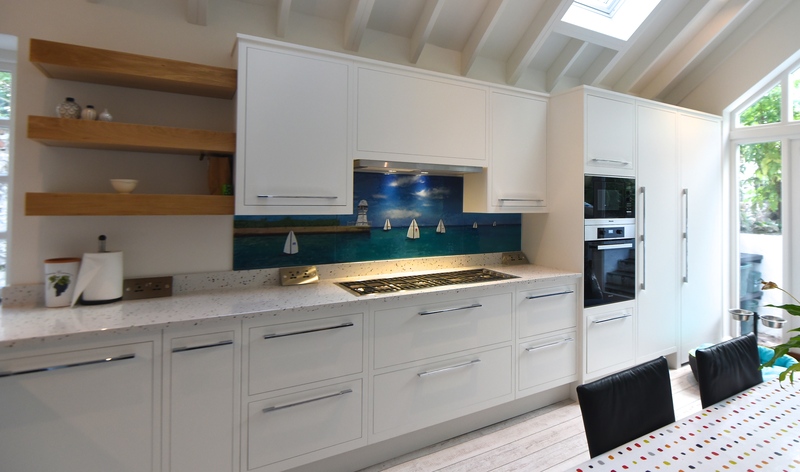 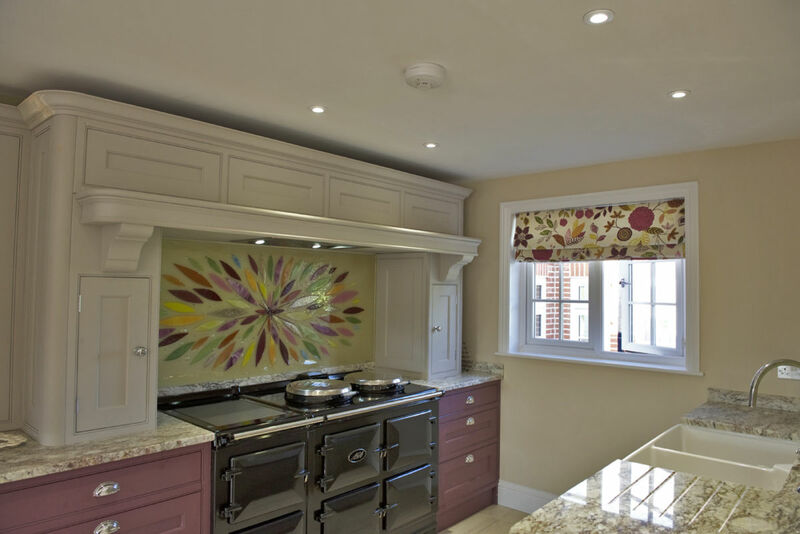 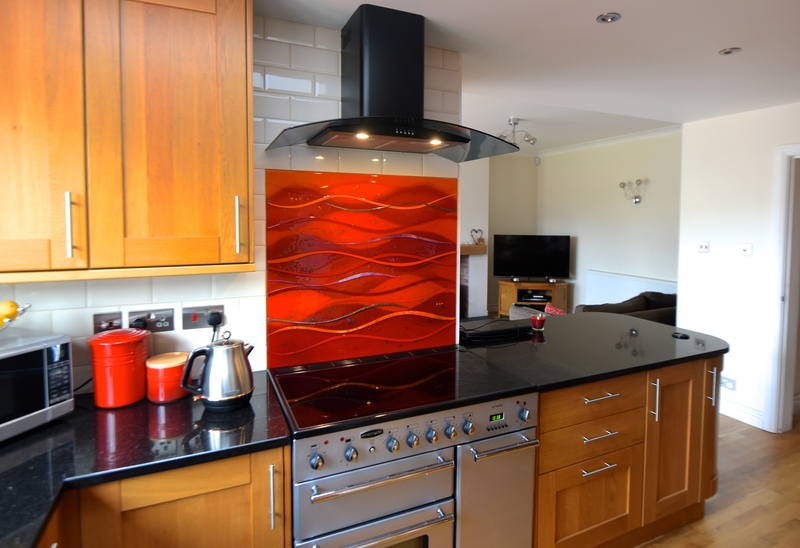 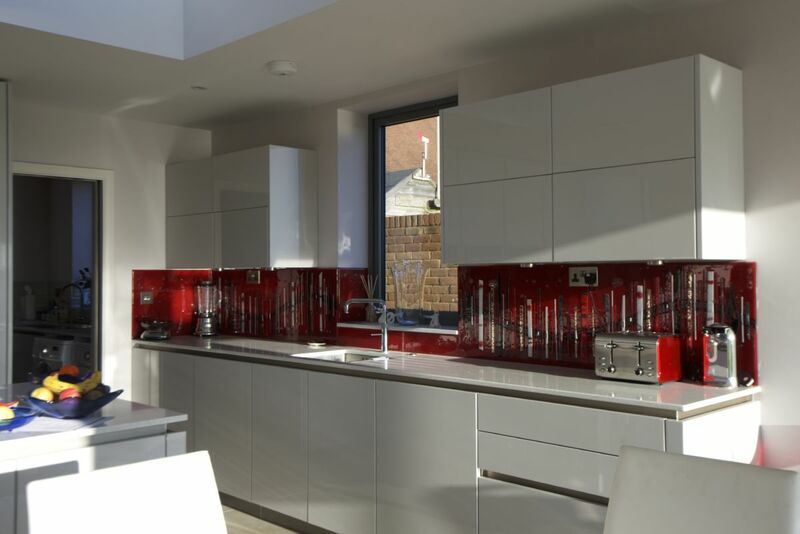 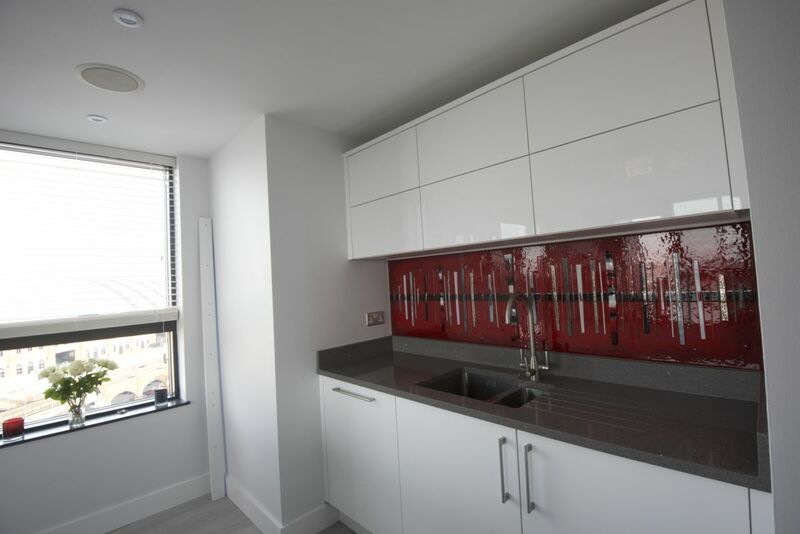 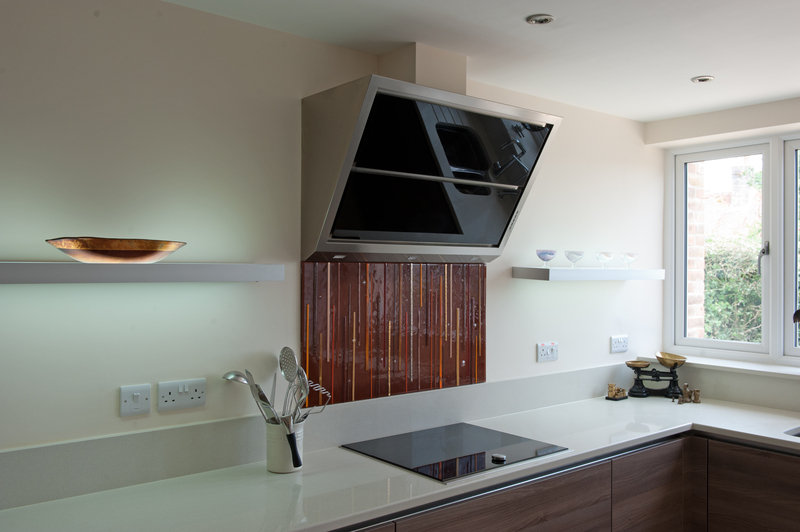 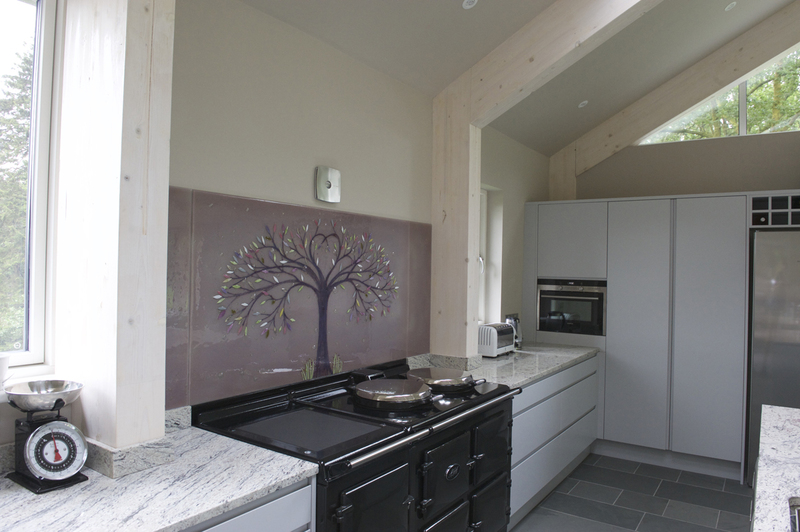 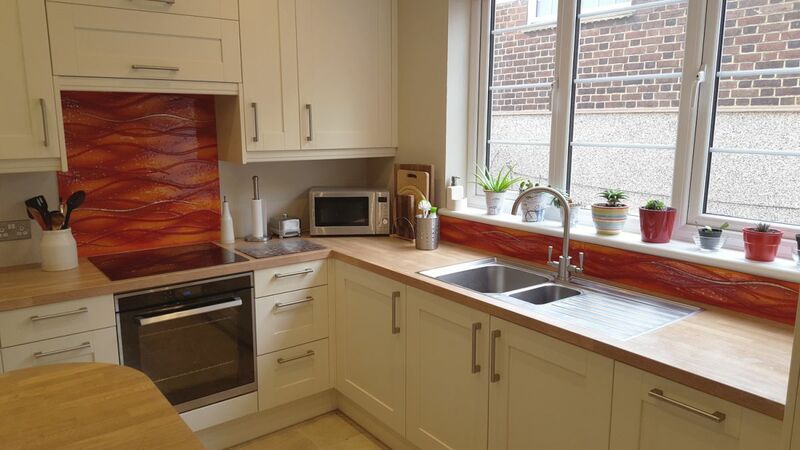 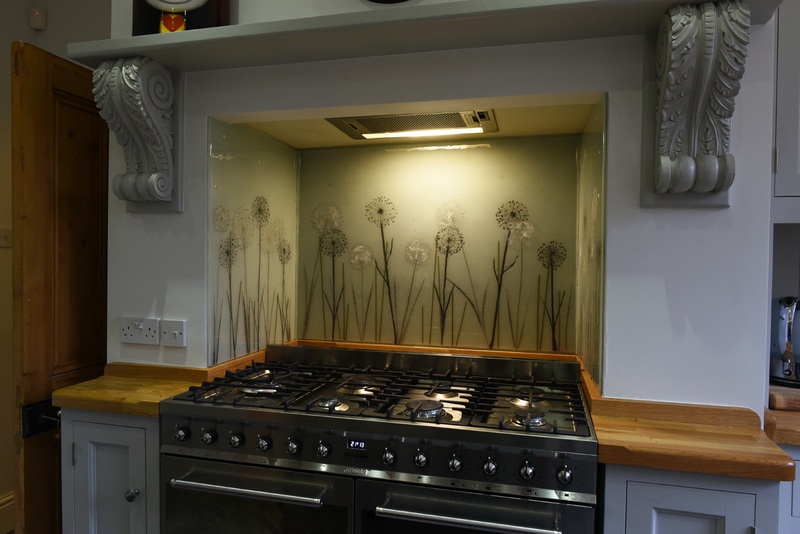 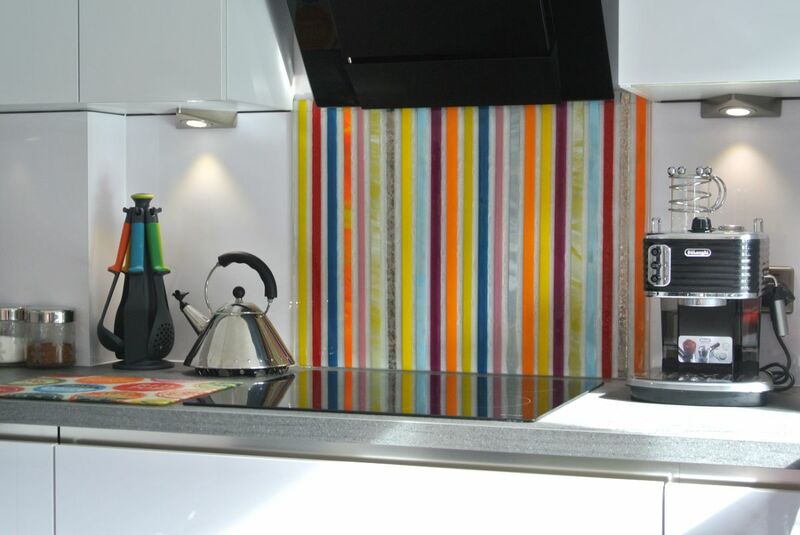 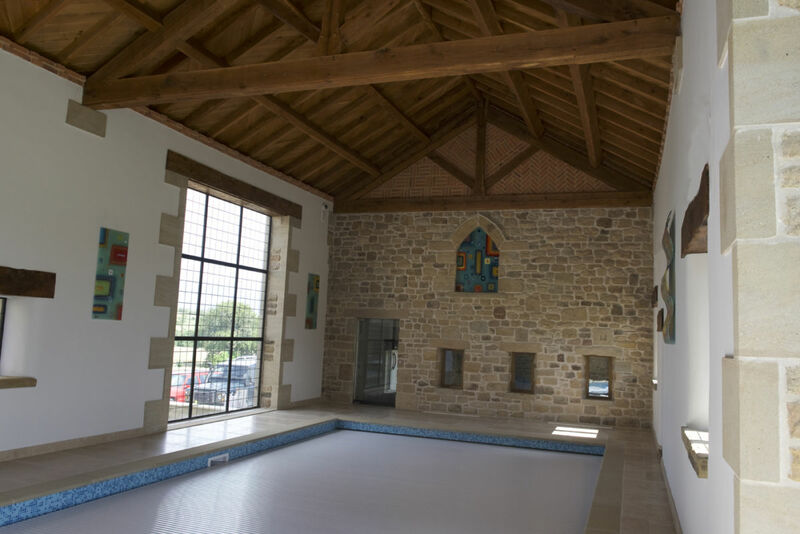 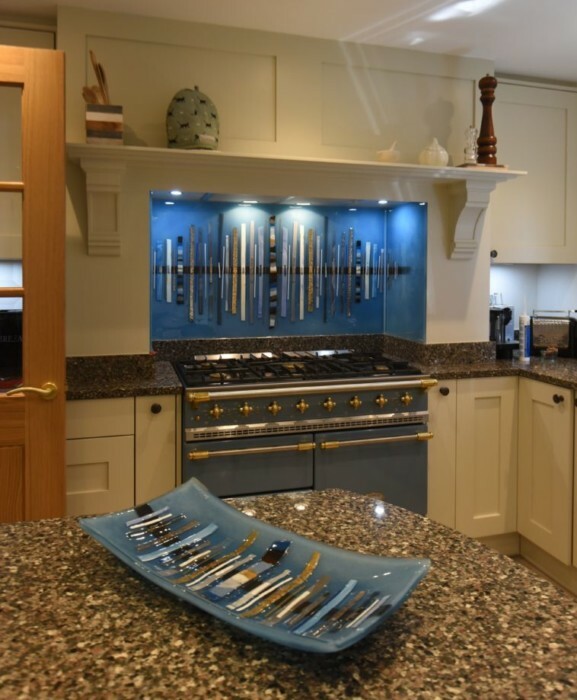 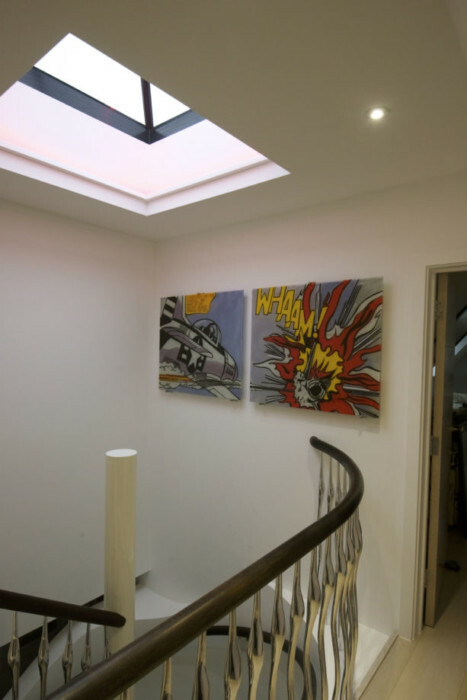 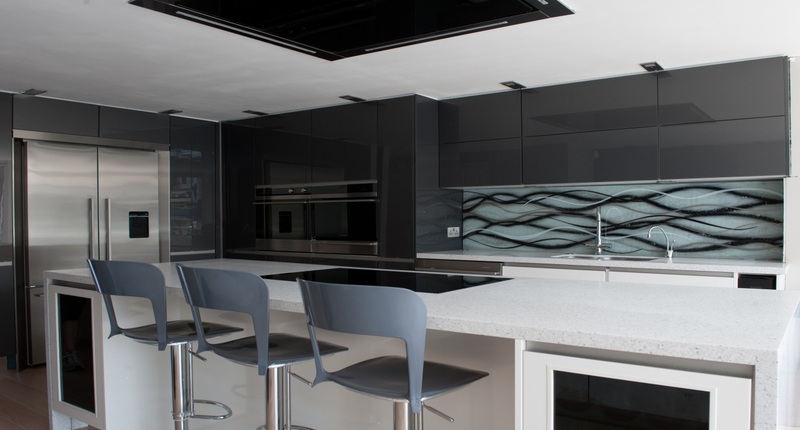 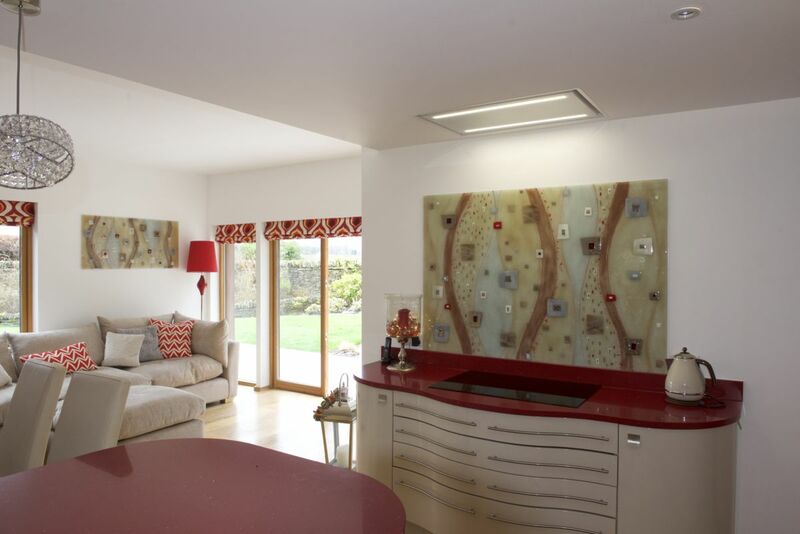 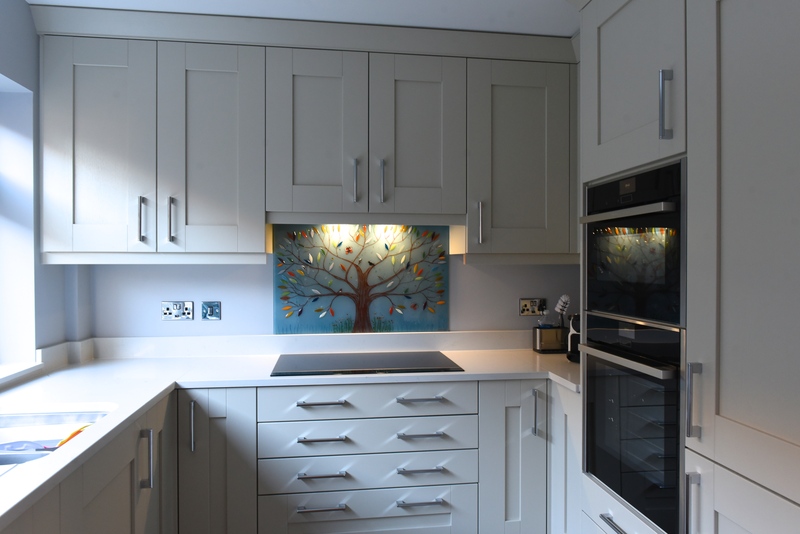 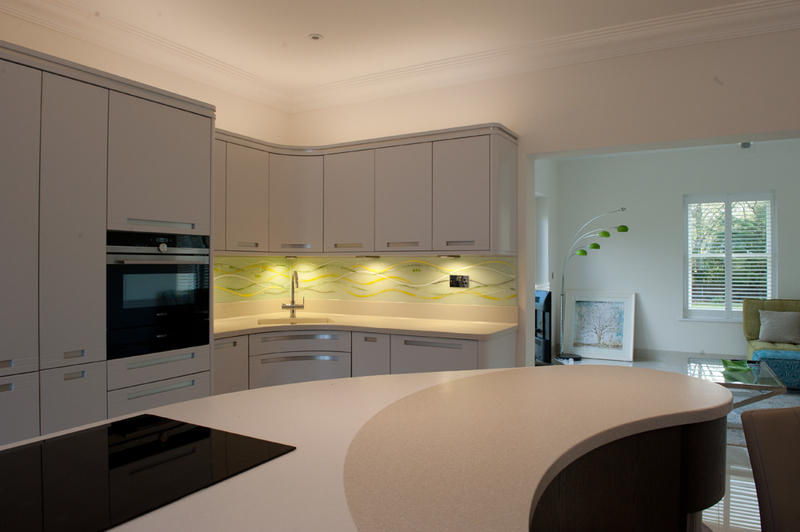 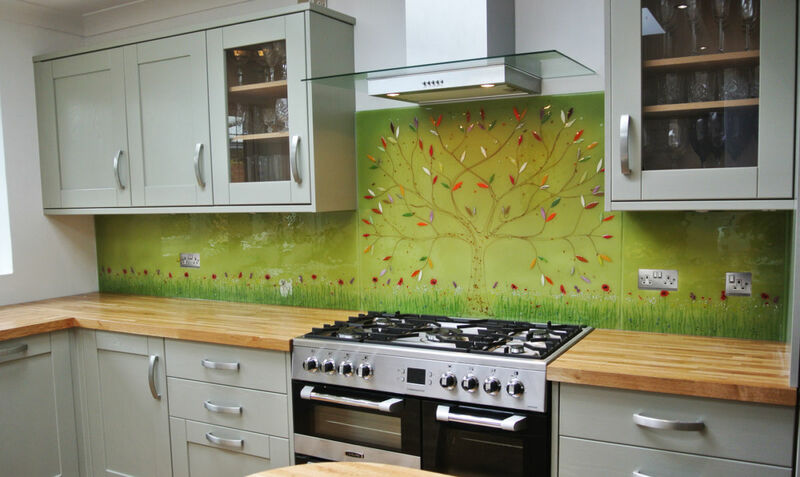 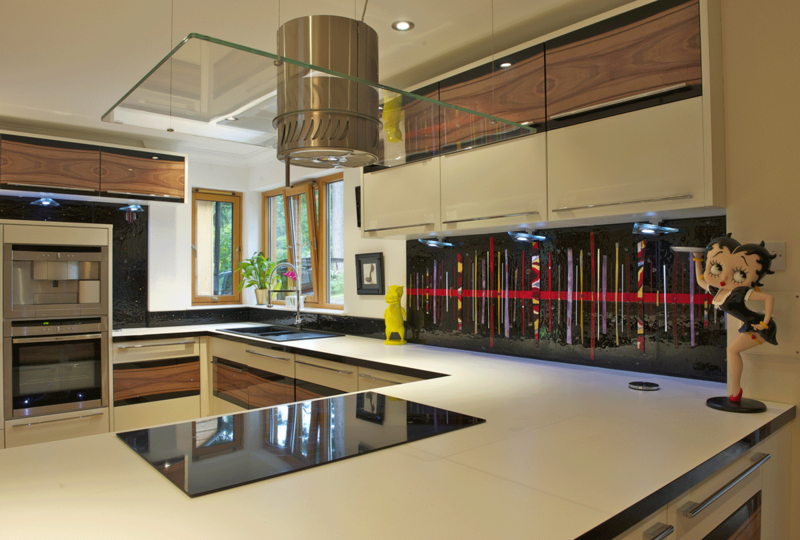 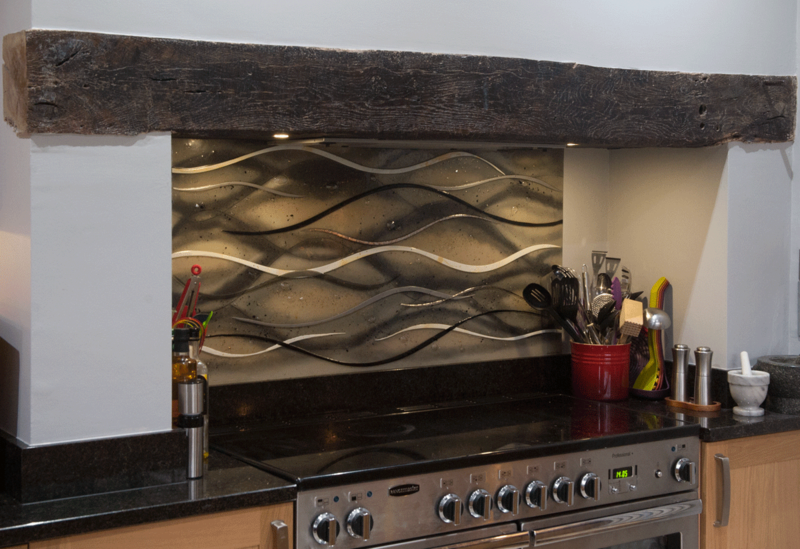 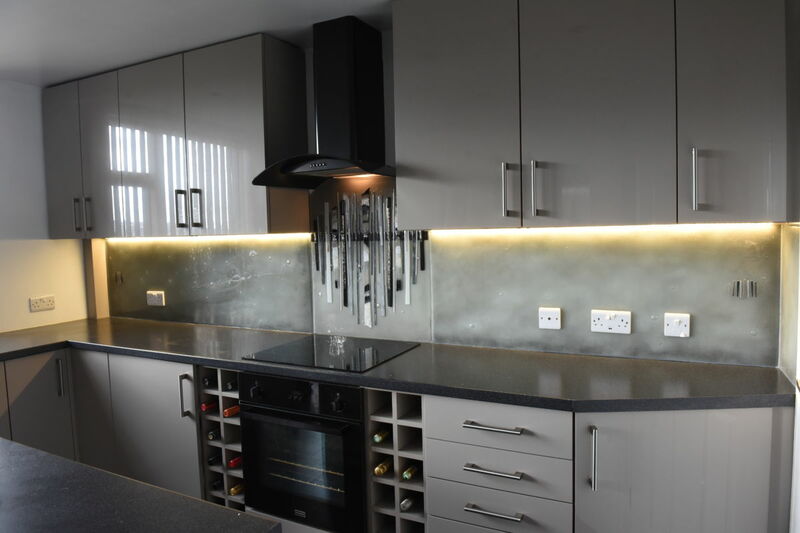 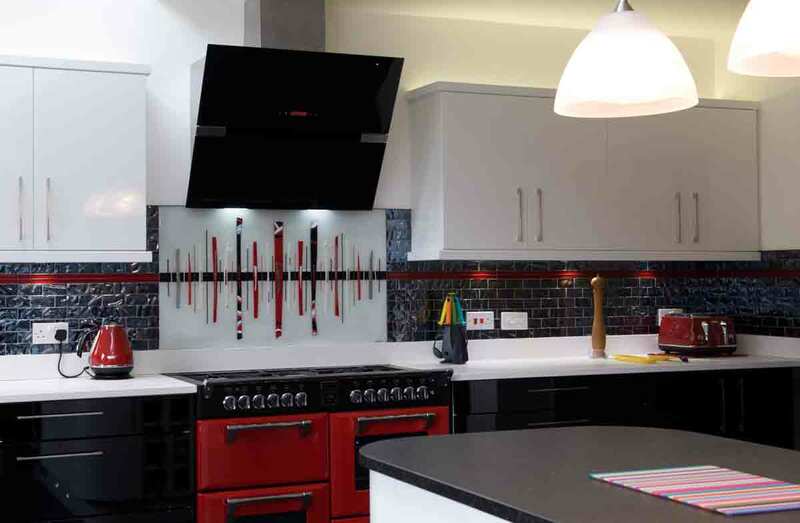 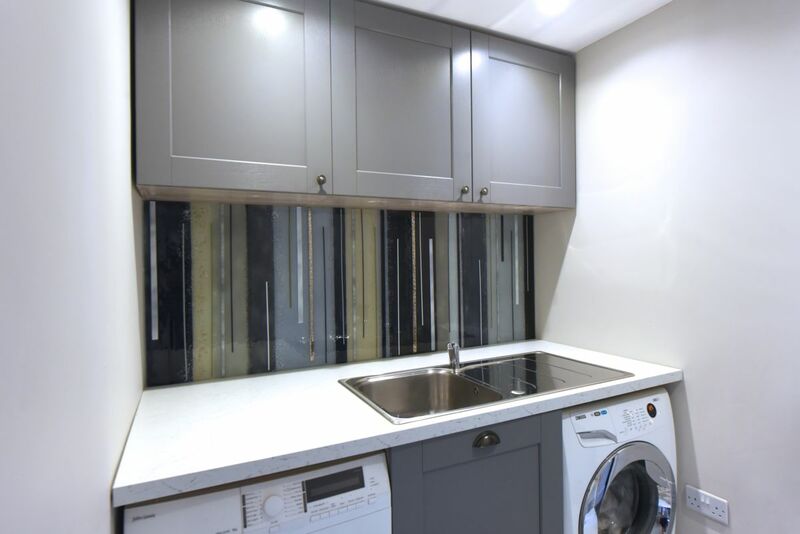 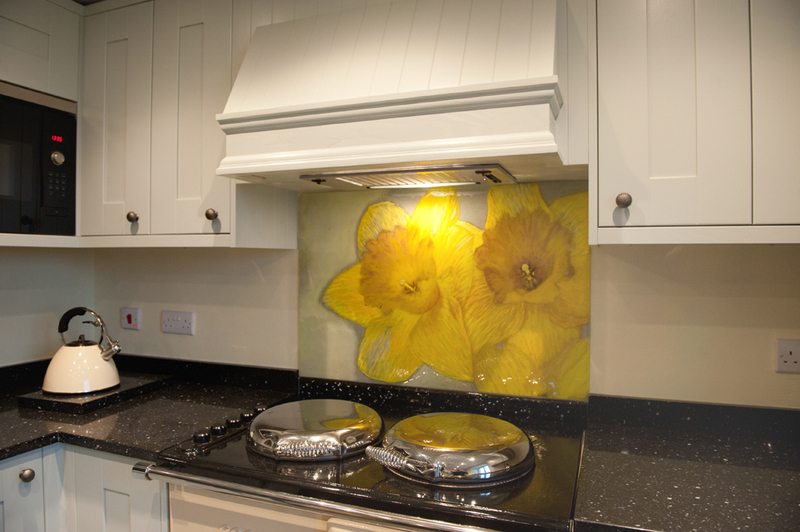 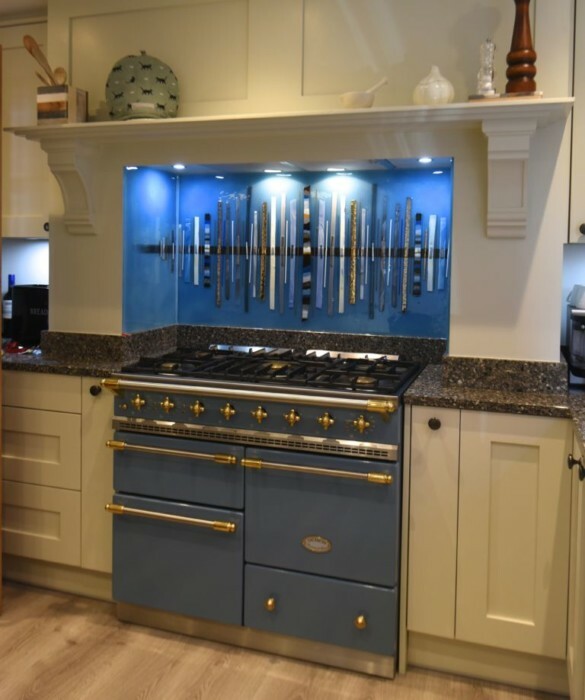 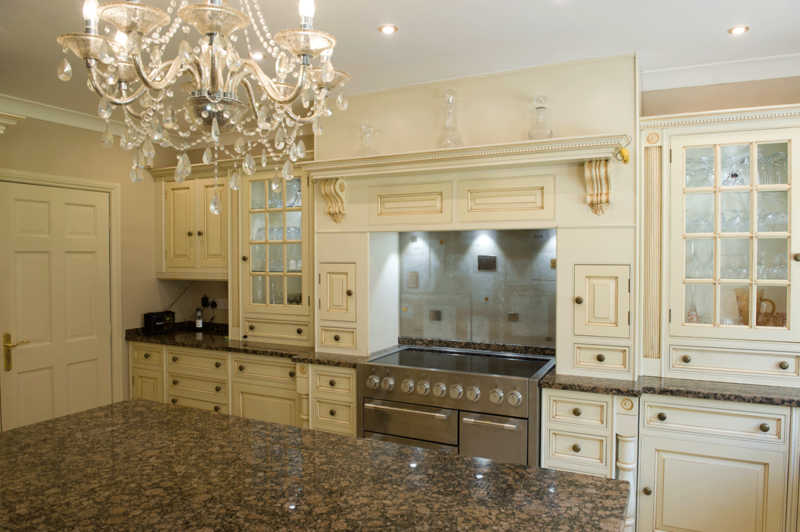 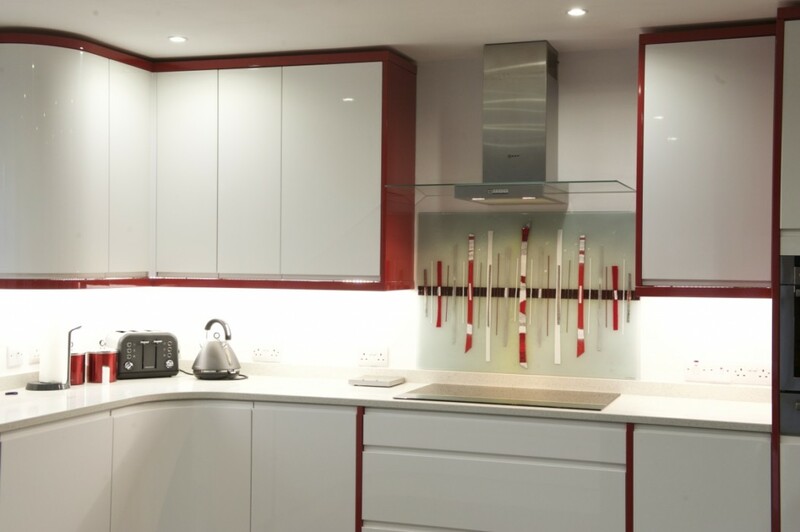 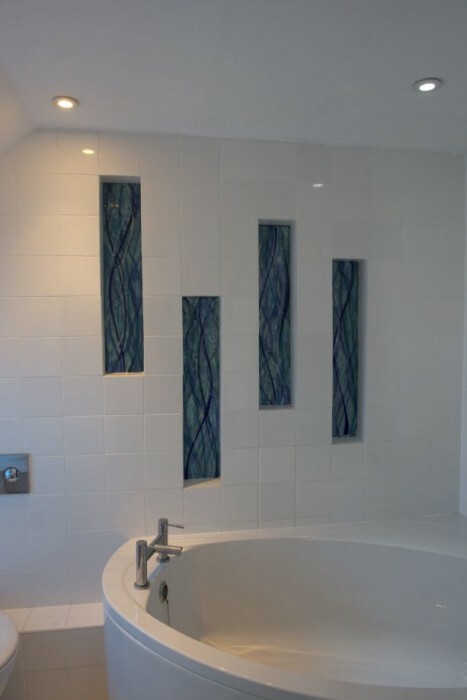 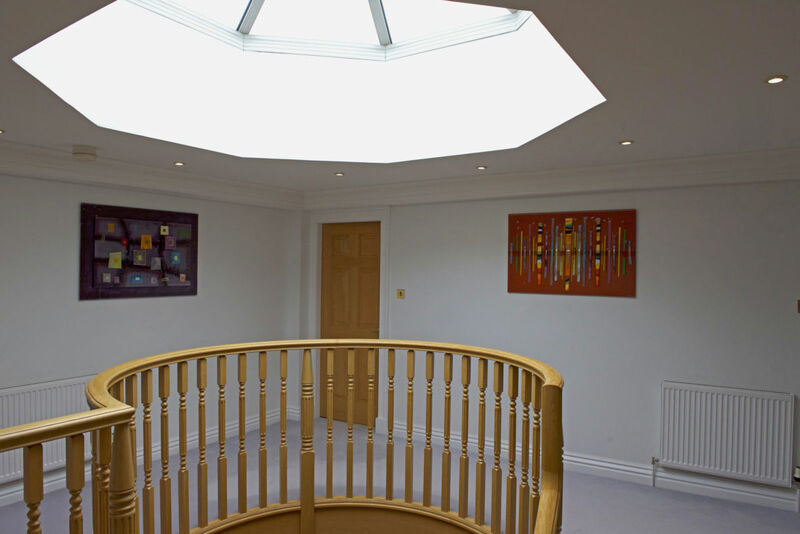 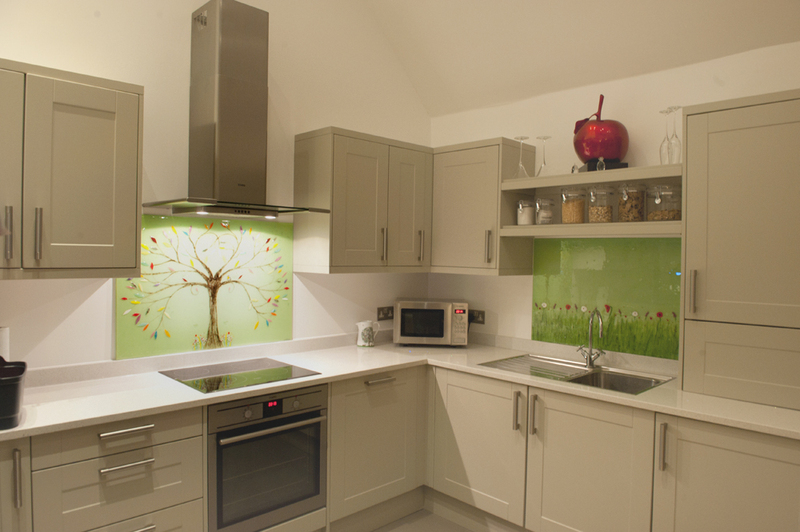 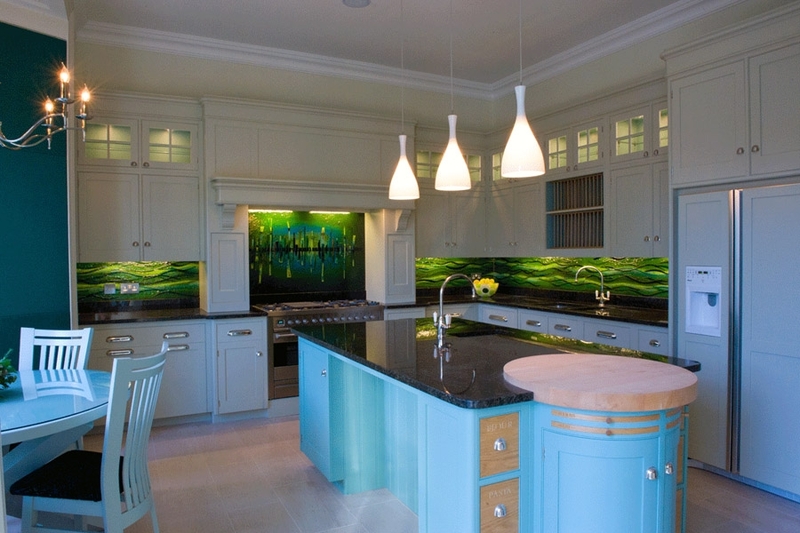 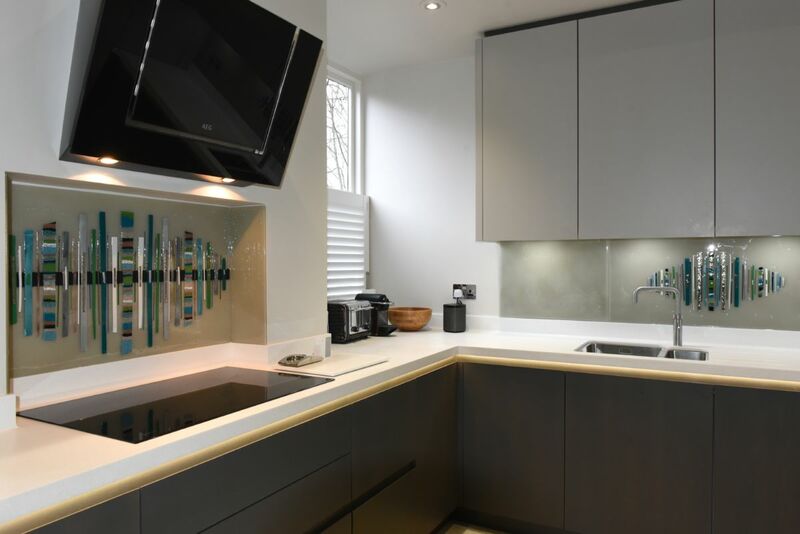 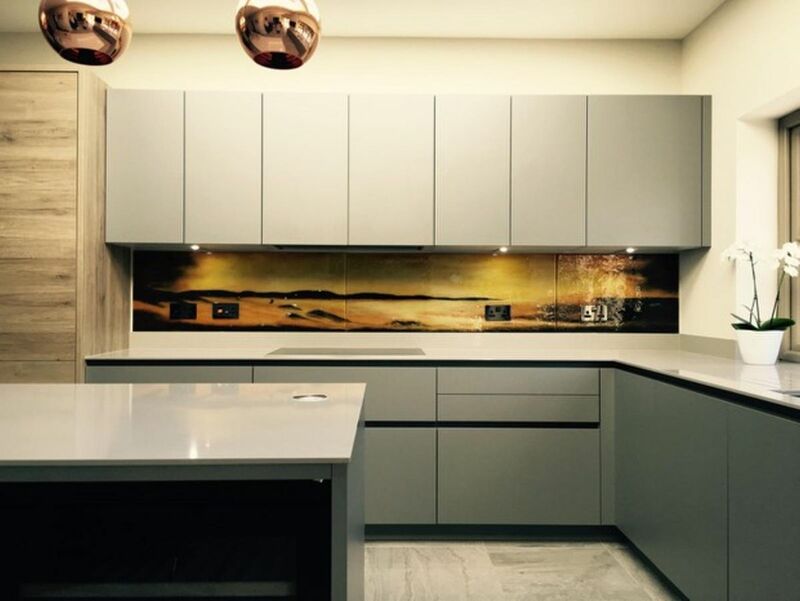 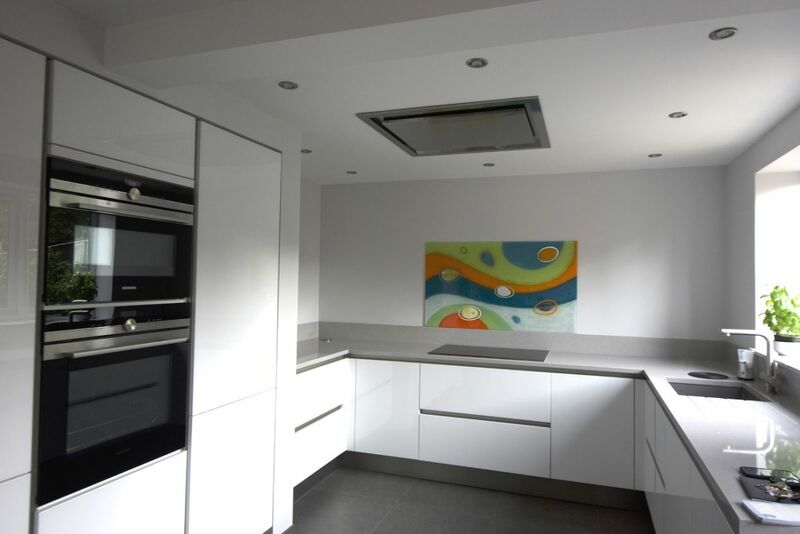 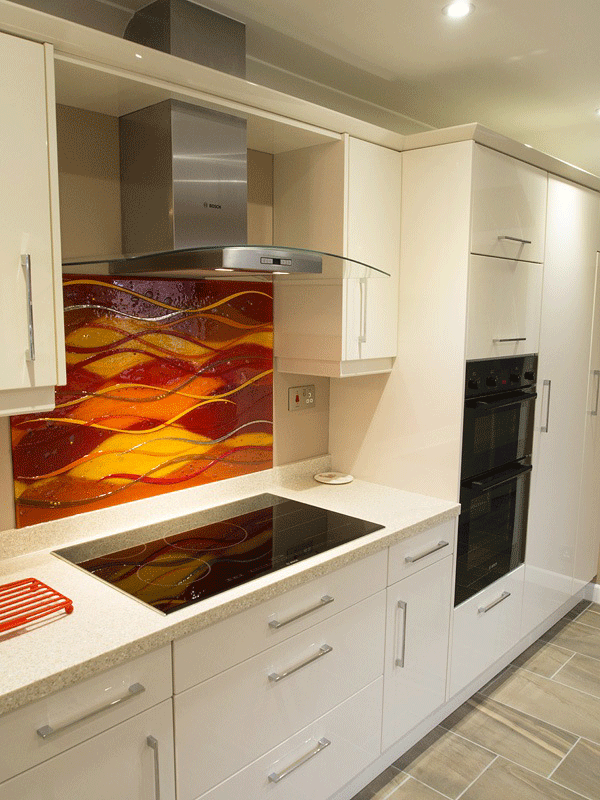 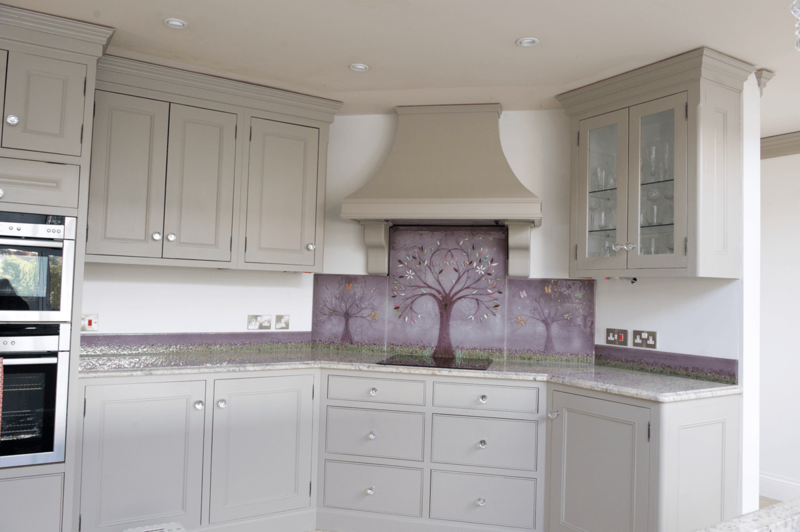 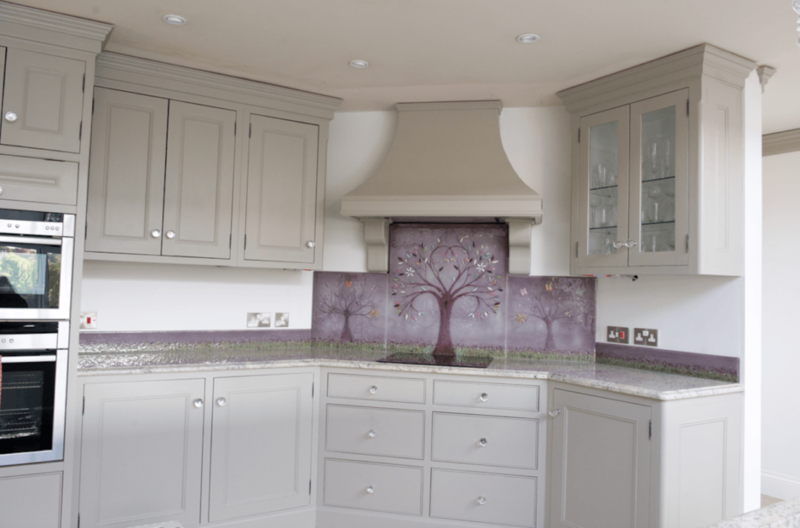 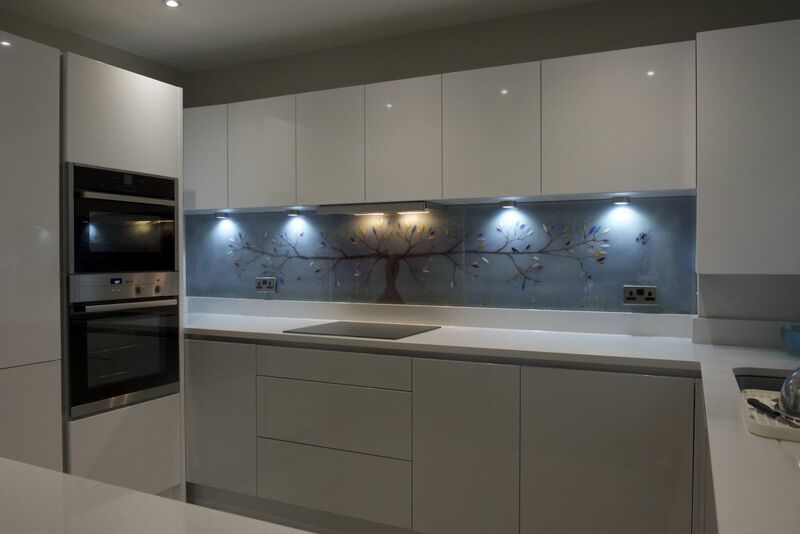 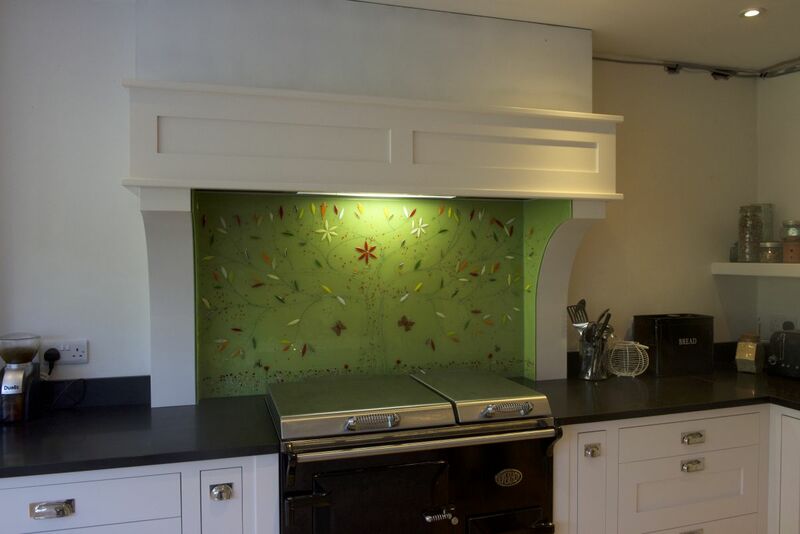 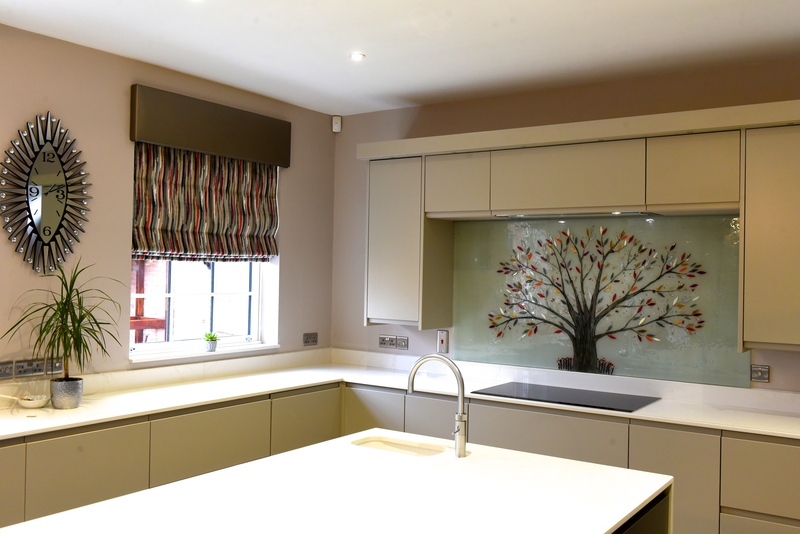 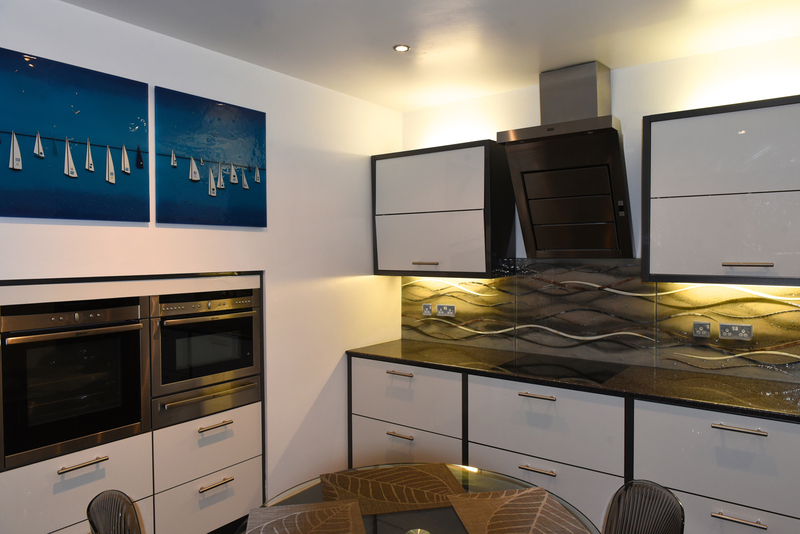 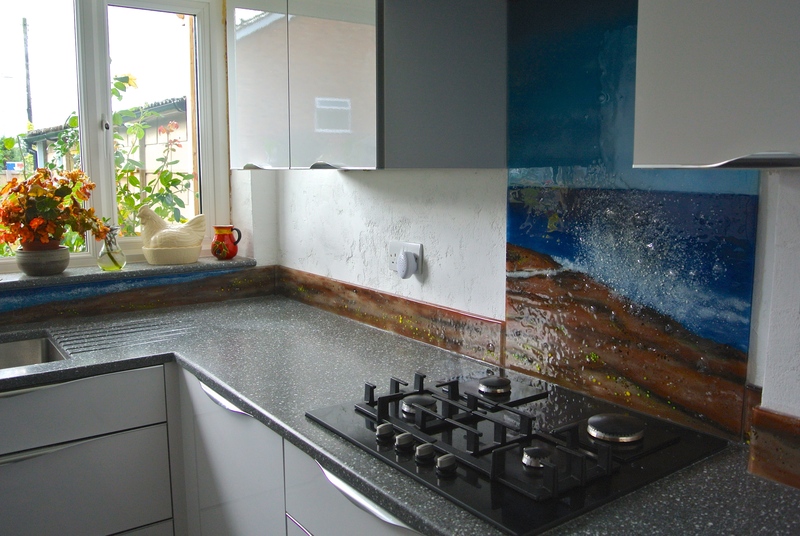 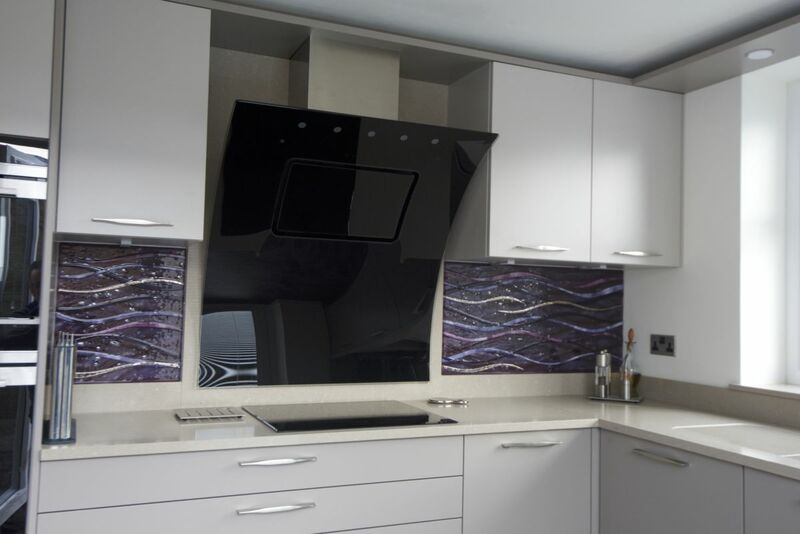 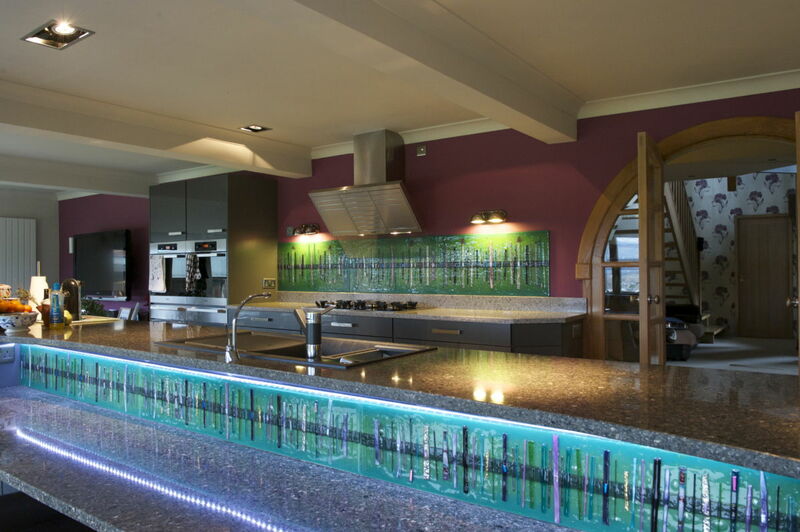 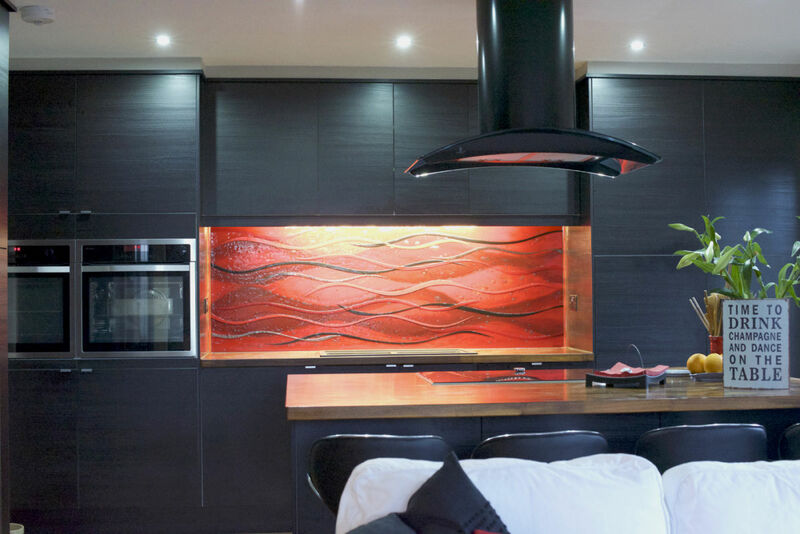 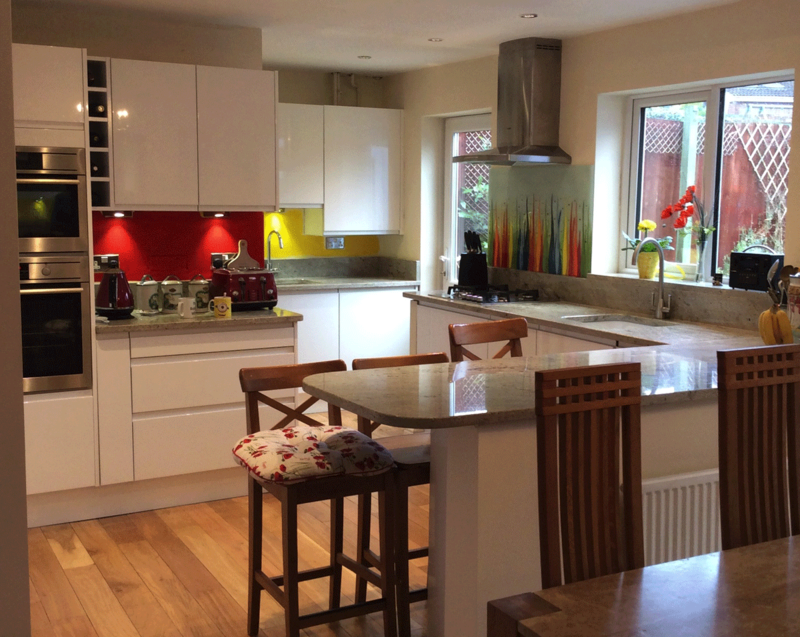 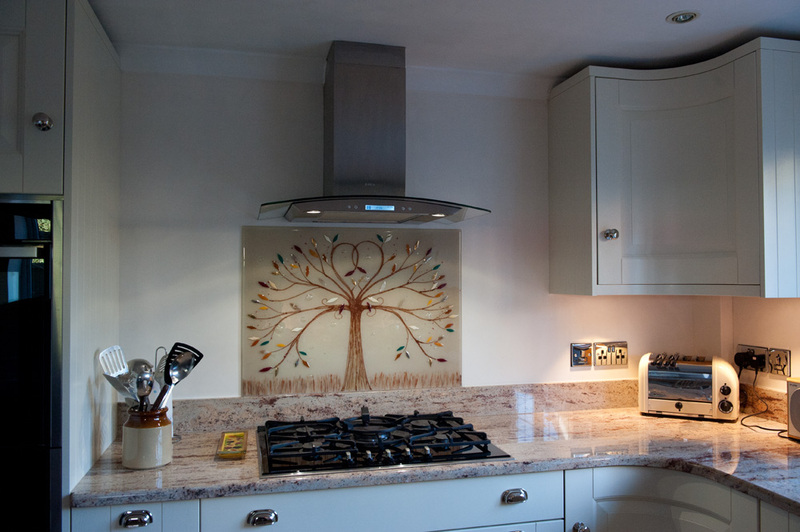 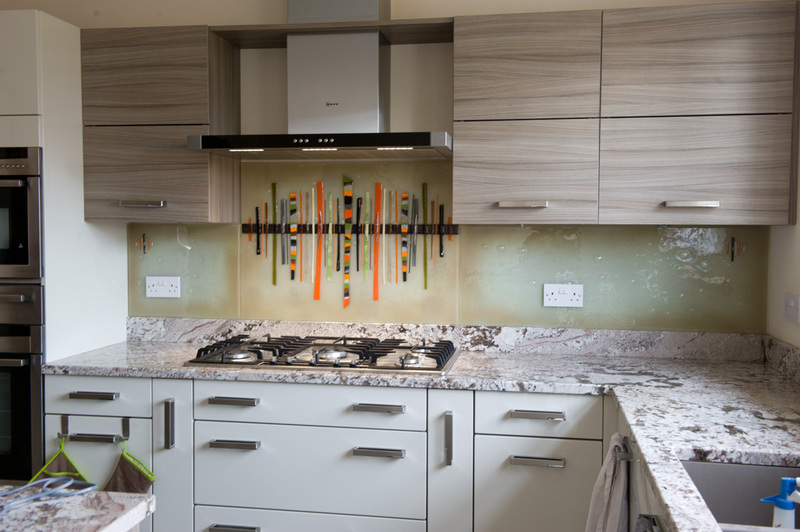 The glass was cut specifically to match the space, and skilfully fitted as to match up perfectly. 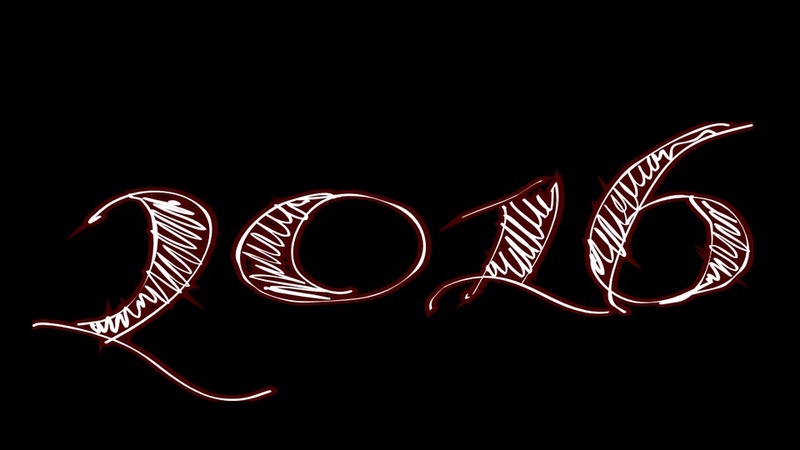 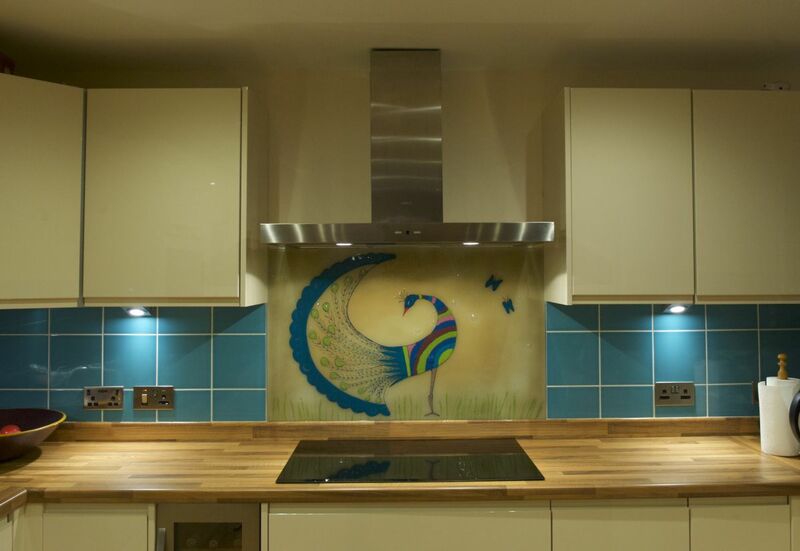 You may be able to make out some letters worked into the waving shapes of the design. 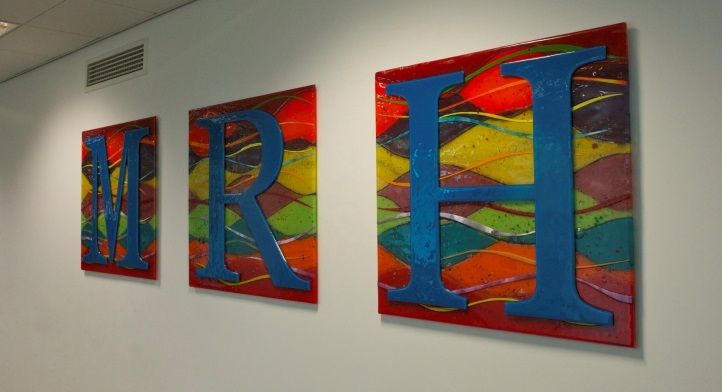 Created with the same colours as the piece itself, the letters stand out and spell out Samlesbury, which is the name of the house itself! 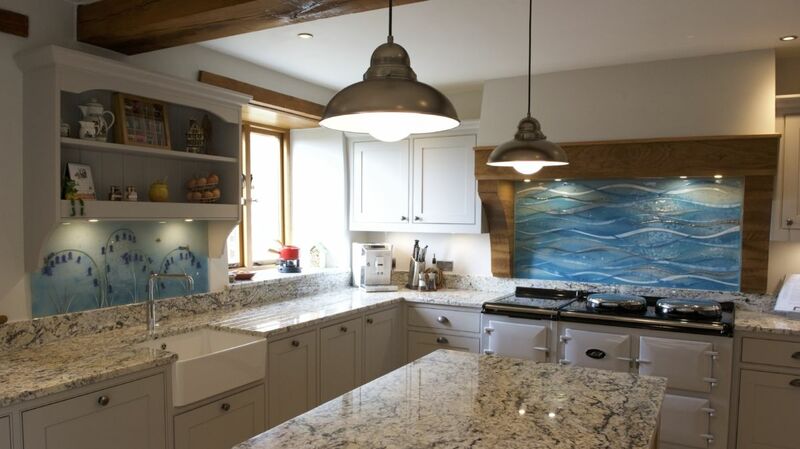 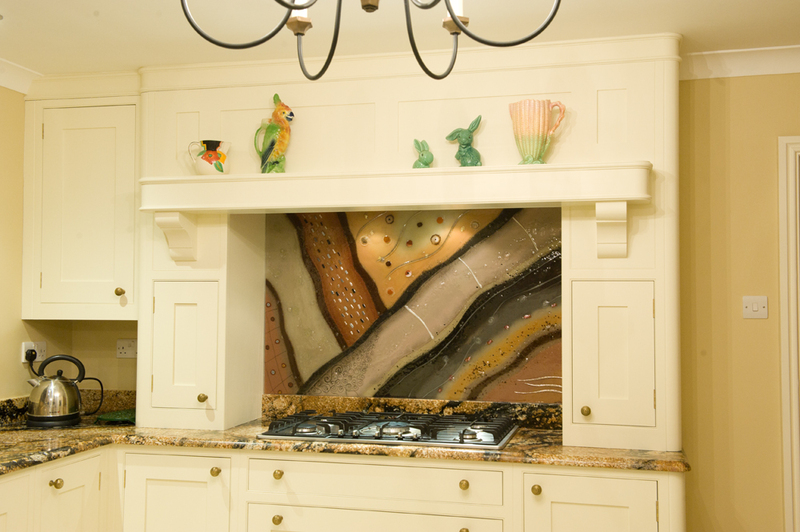 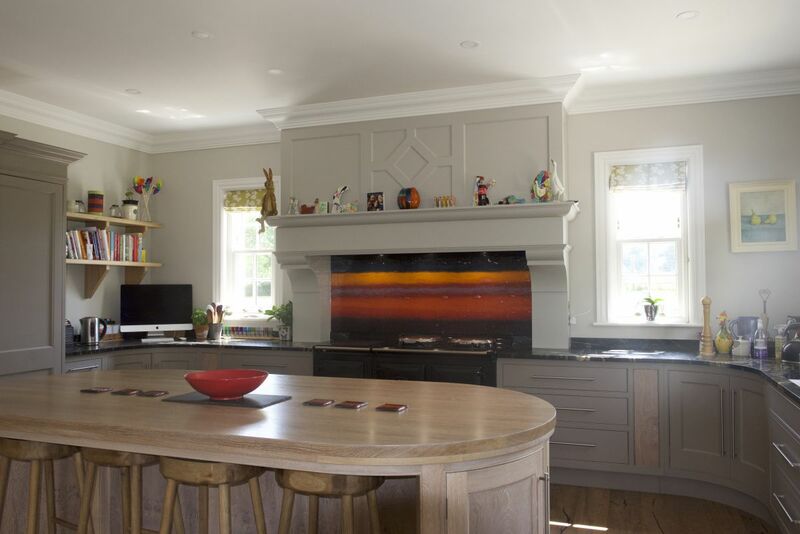 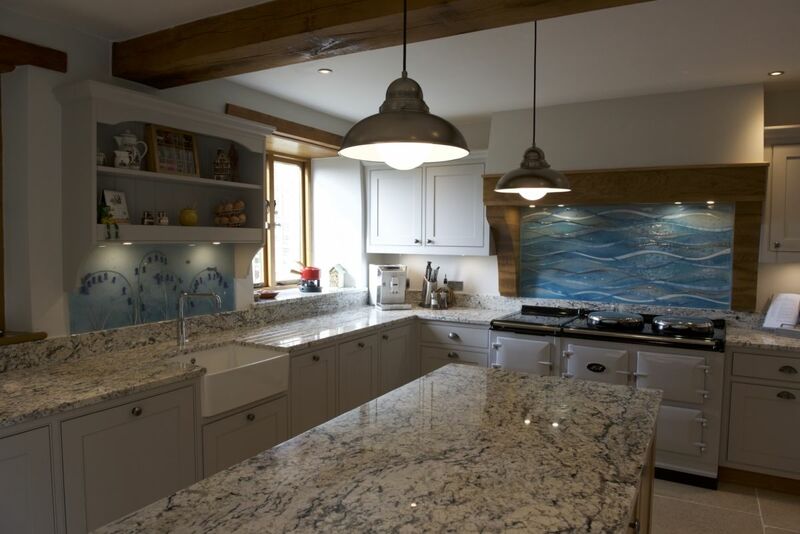 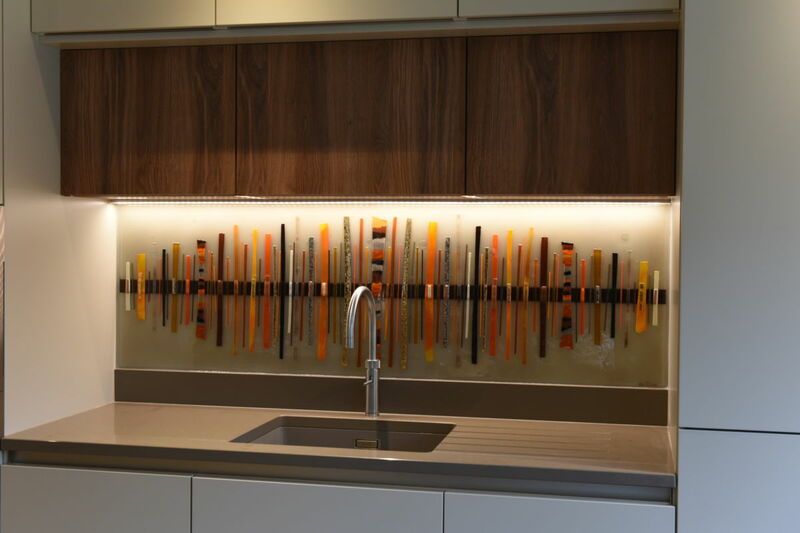 Of course, the finishing touch comes in the form of the three lights that sit in line with the cupboard above and shine down on the piece. 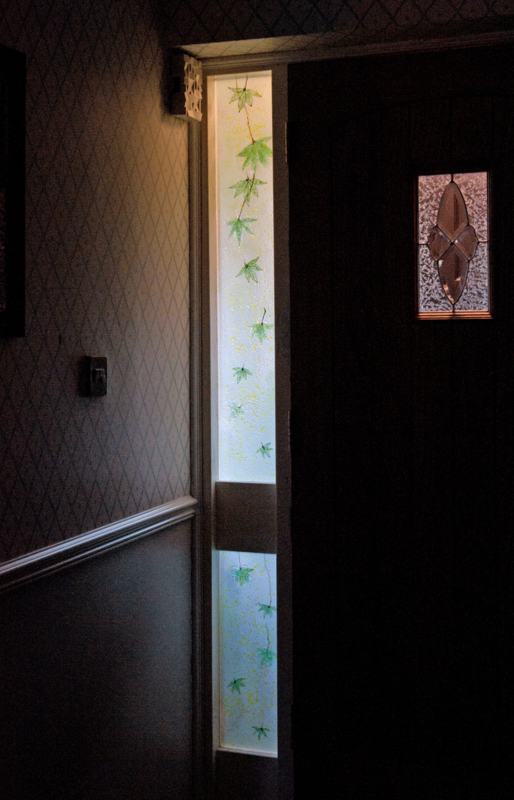 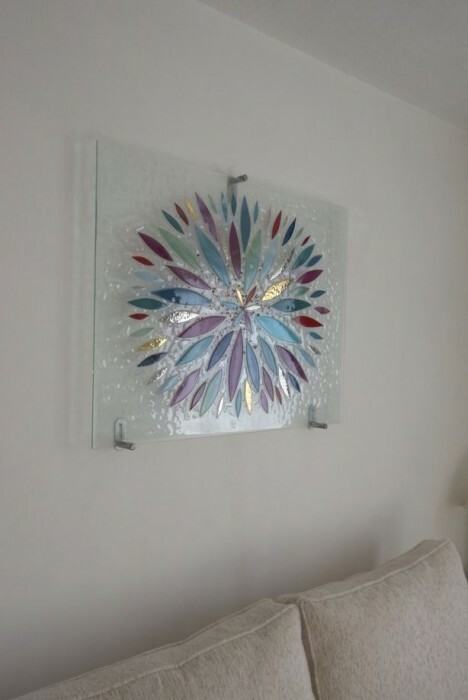 There’s absolutely no question what the centrepiece of this room is, and we’re confident that this glass will be attracting all the right kinds of attention for a long time to come. 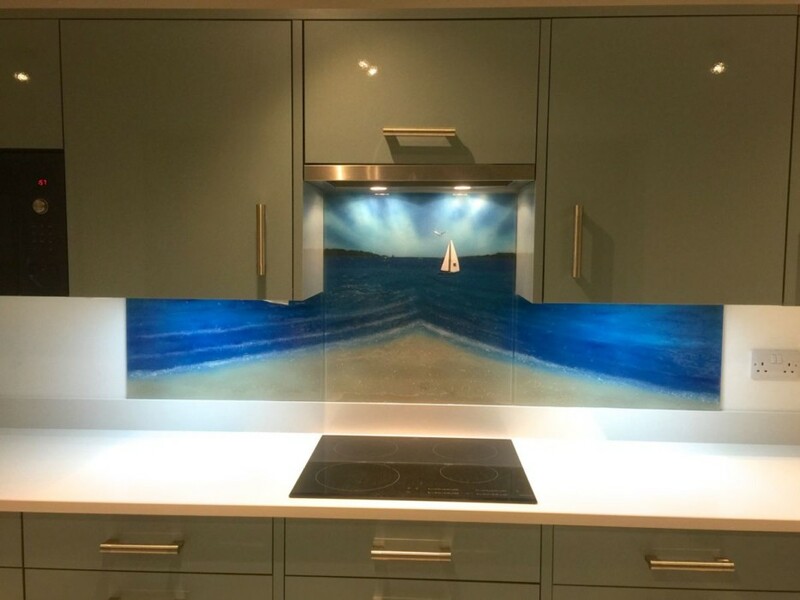 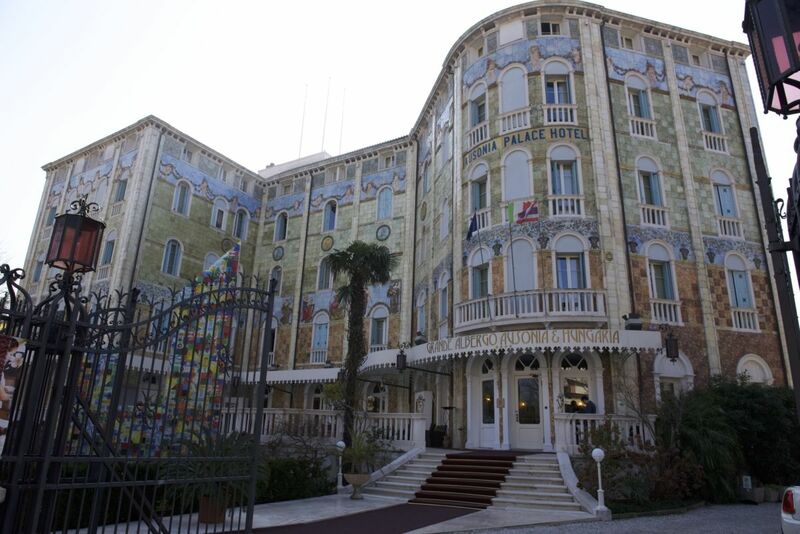 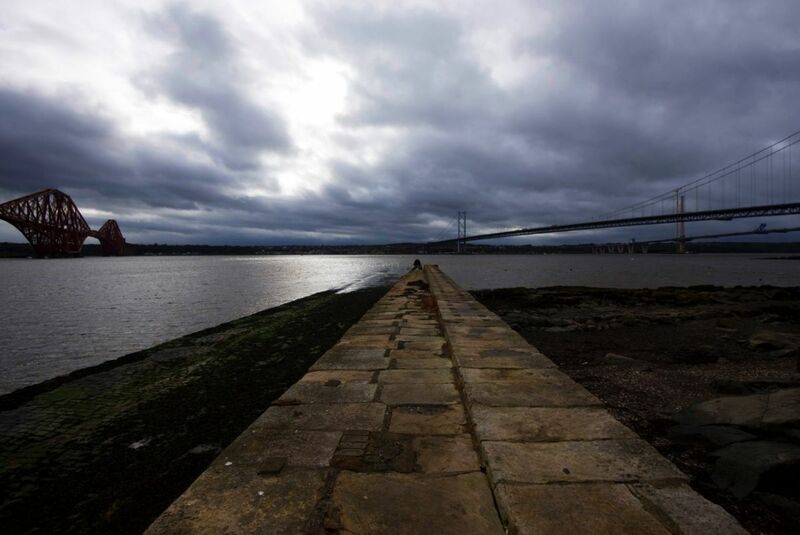 You can just imagine how this looks at night with everything dimmed! 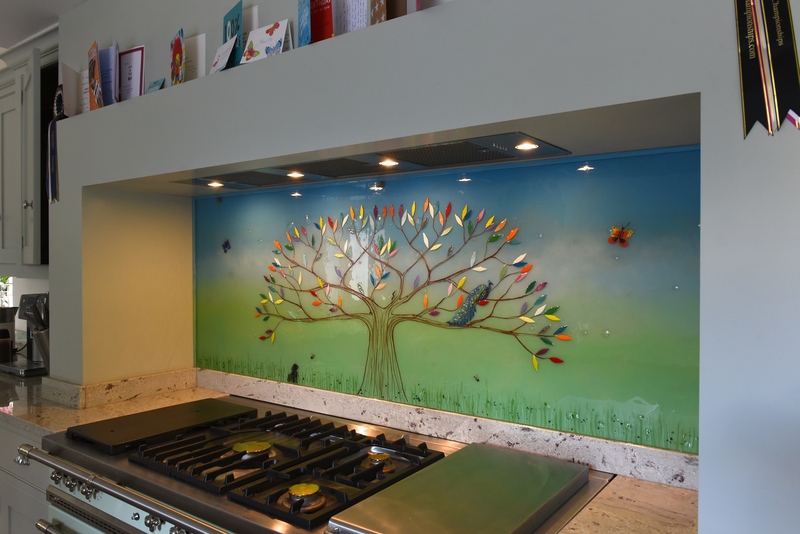 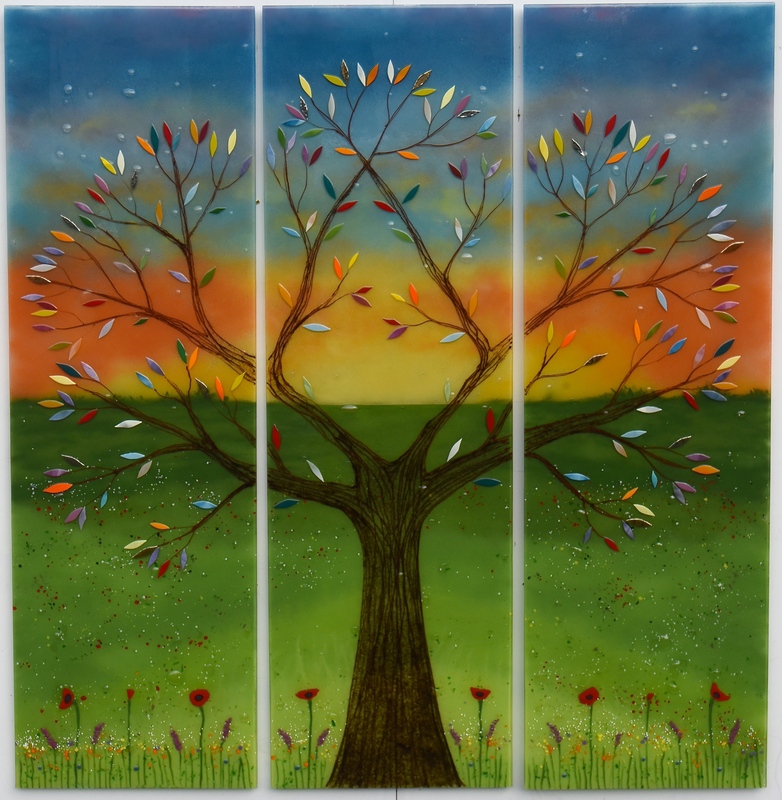 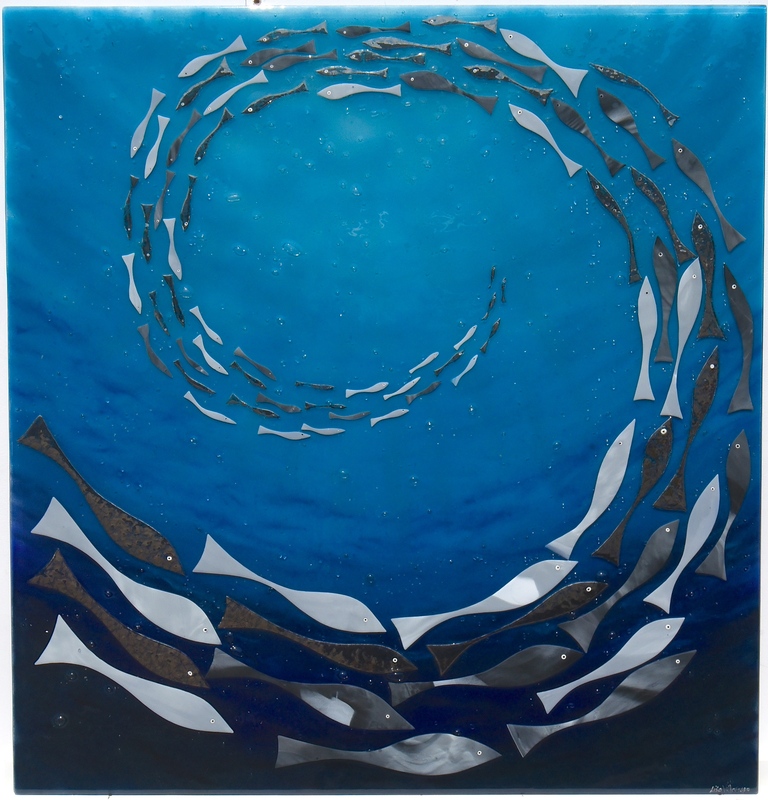 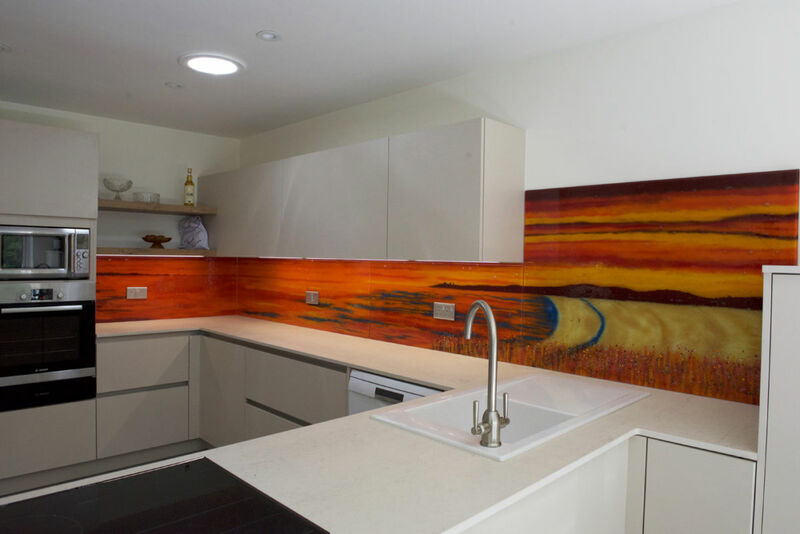 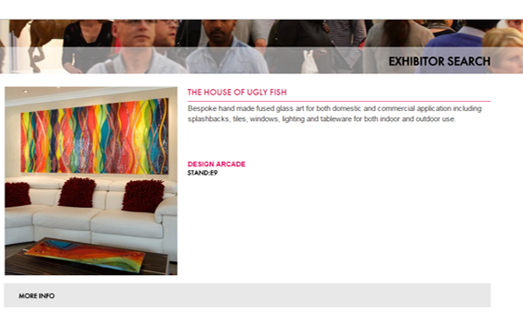 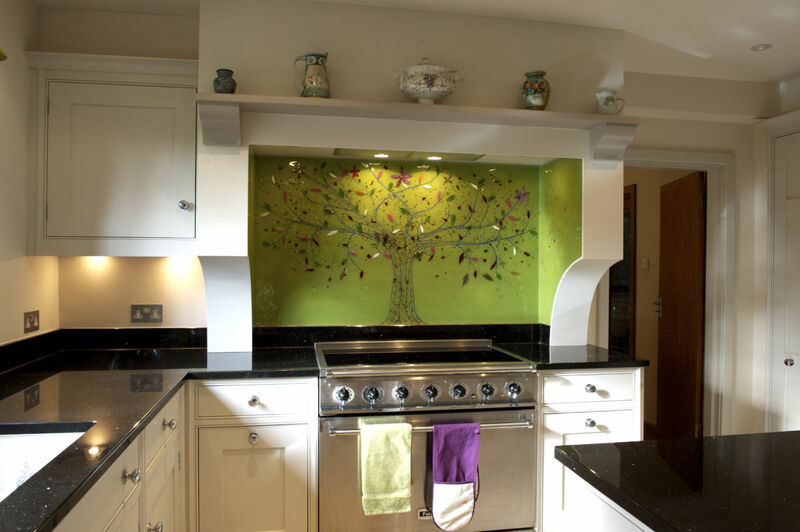 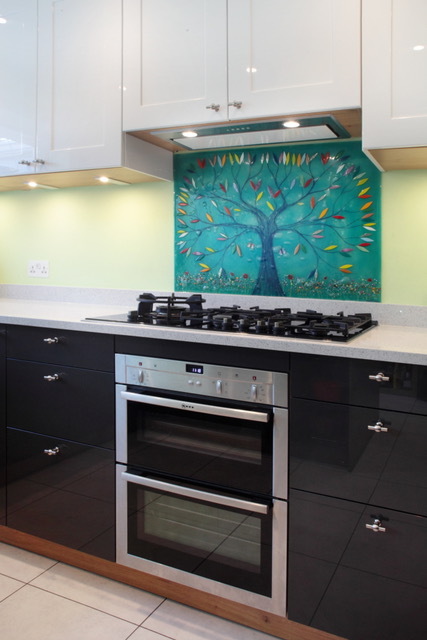 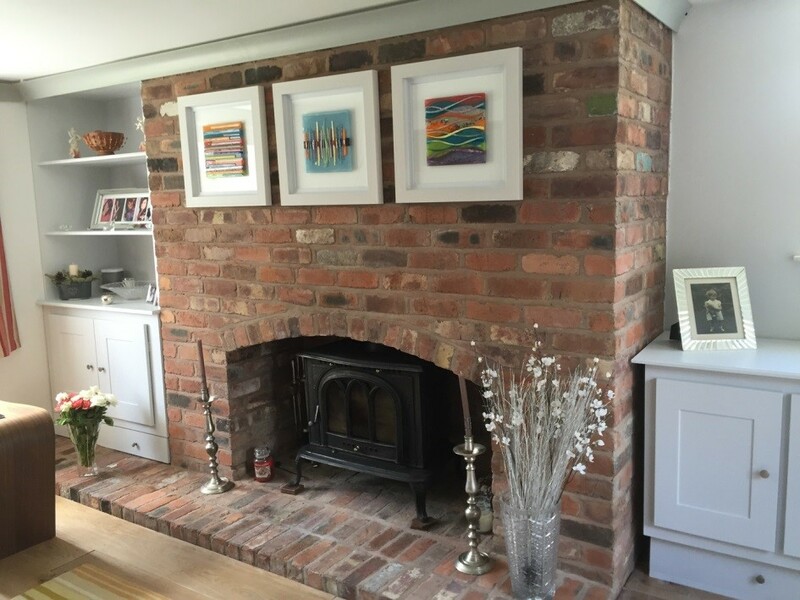 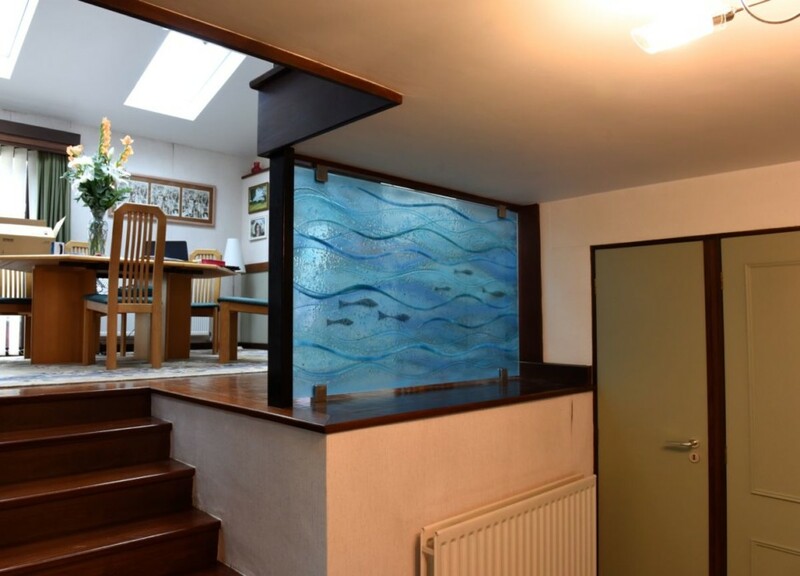 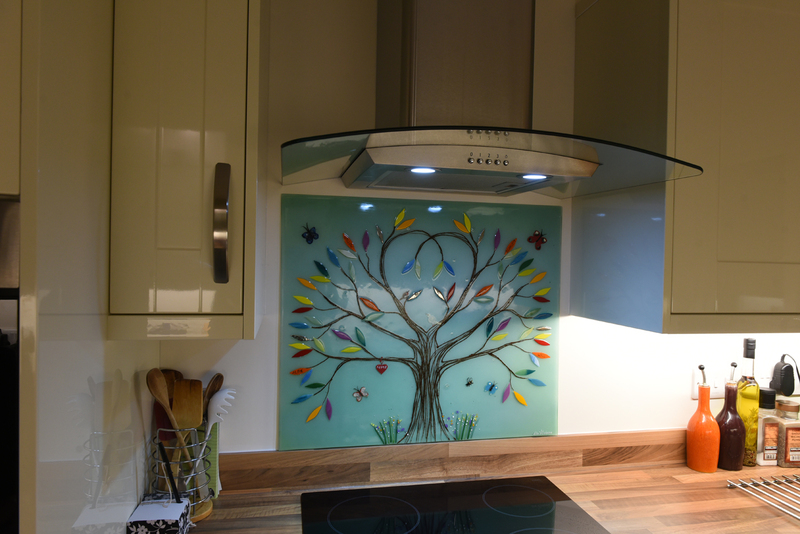 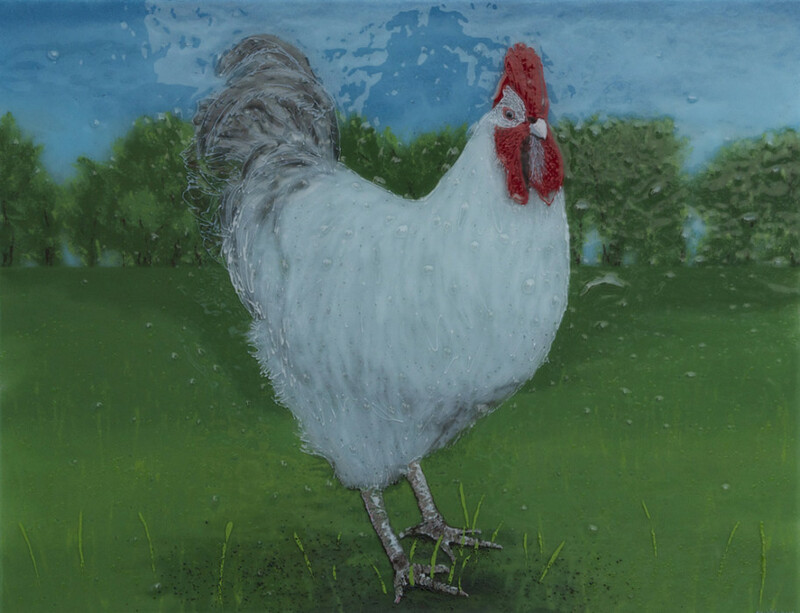 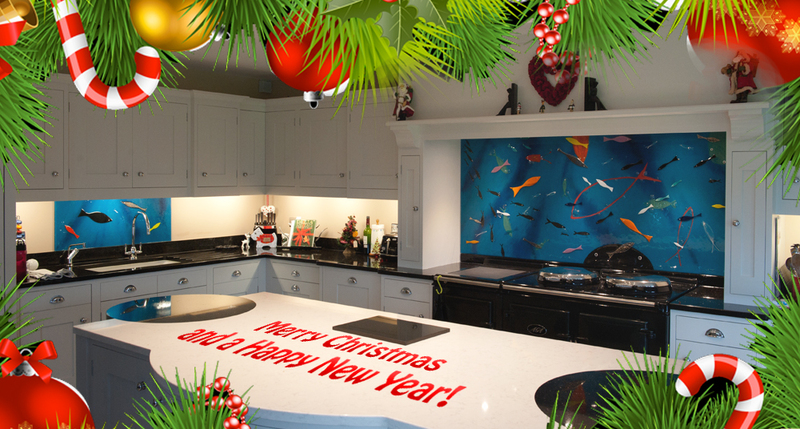 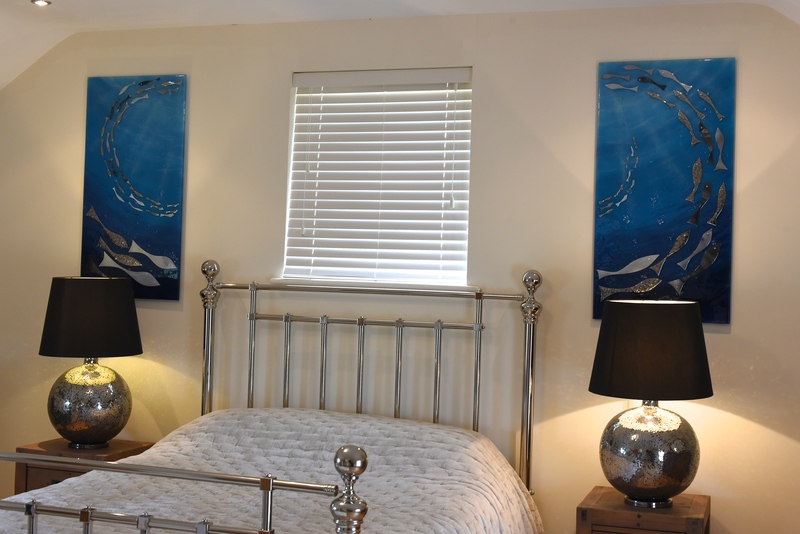 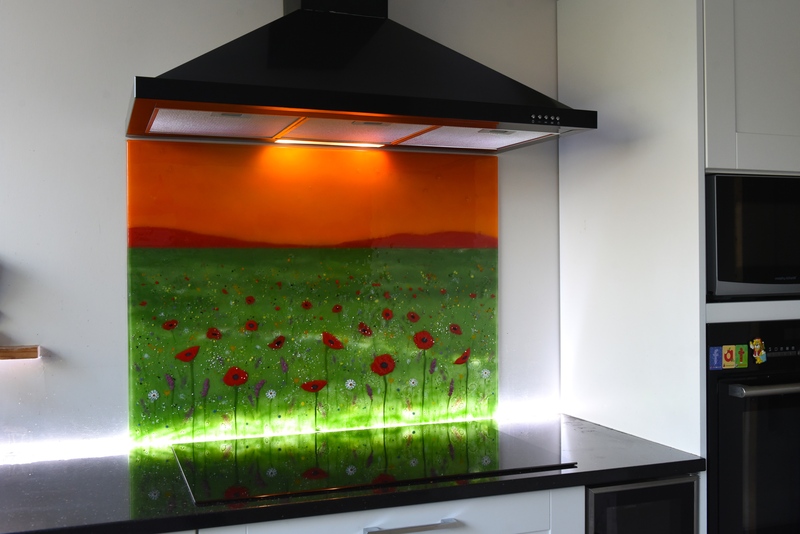 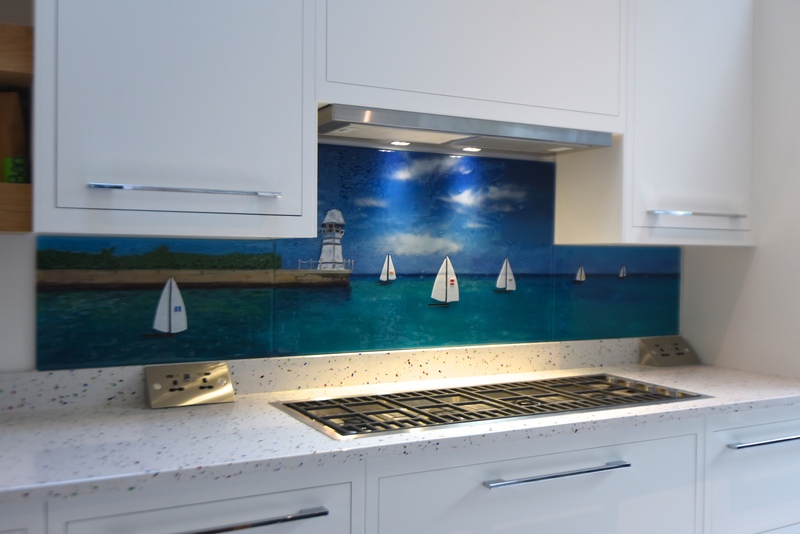 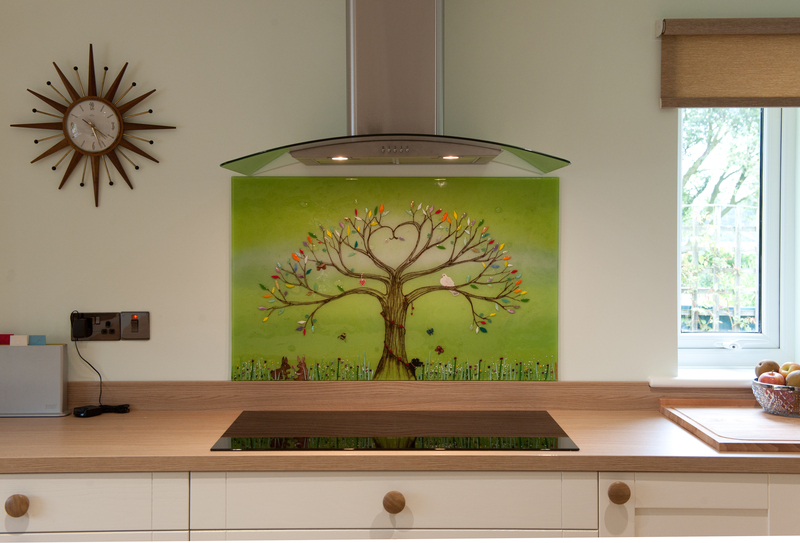 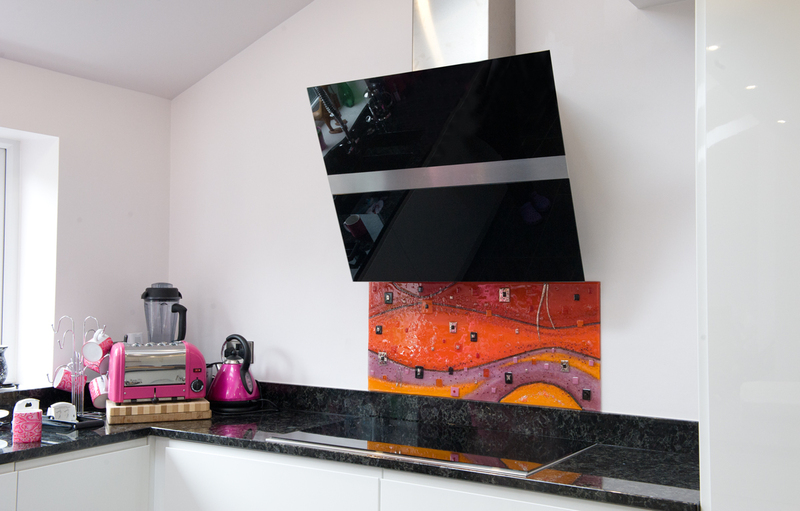 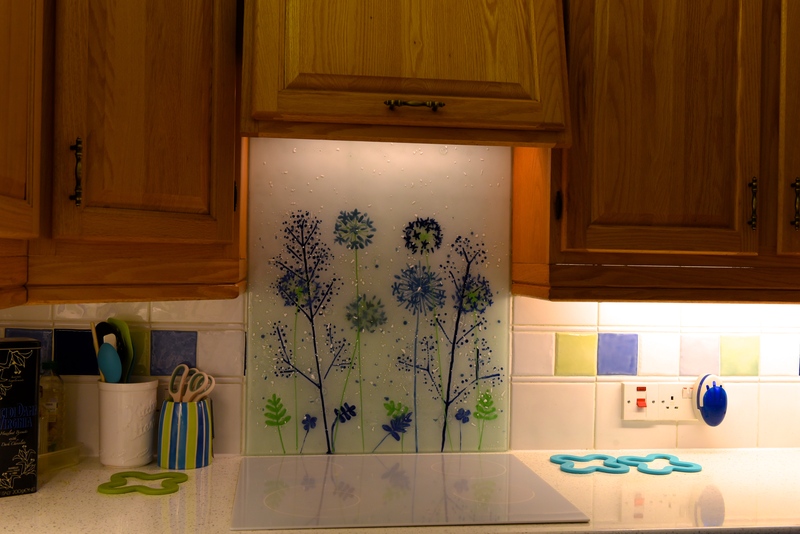 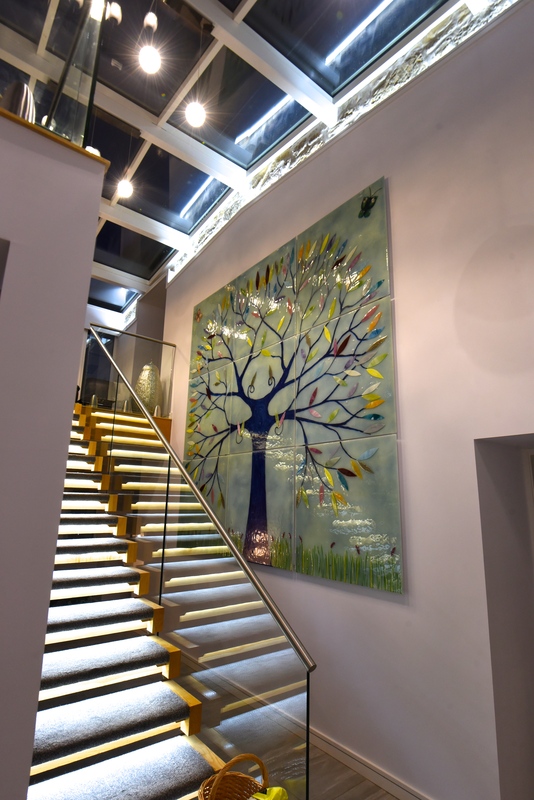 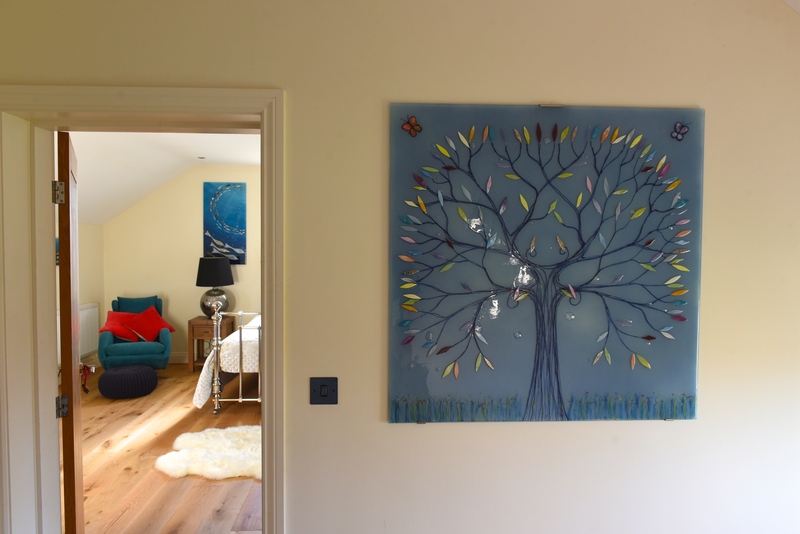 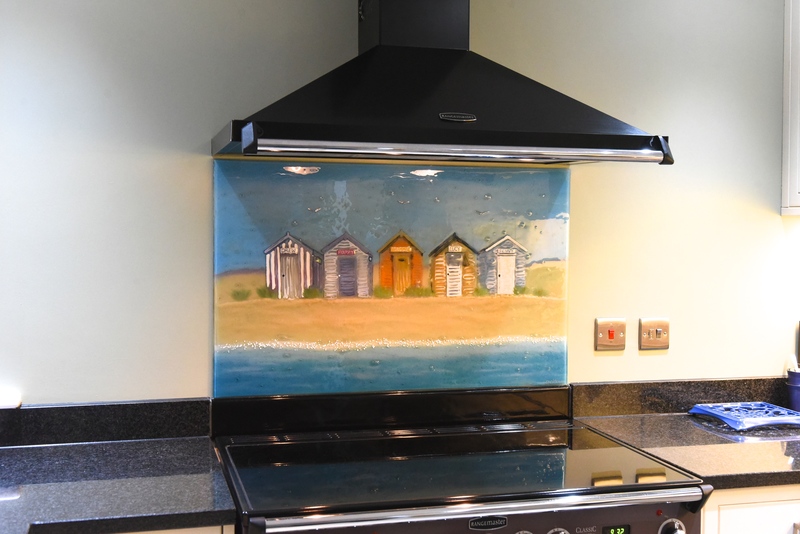 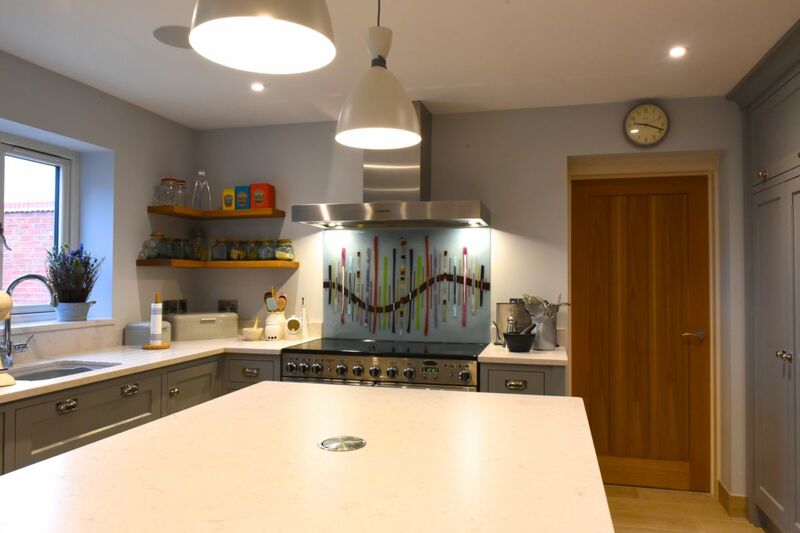 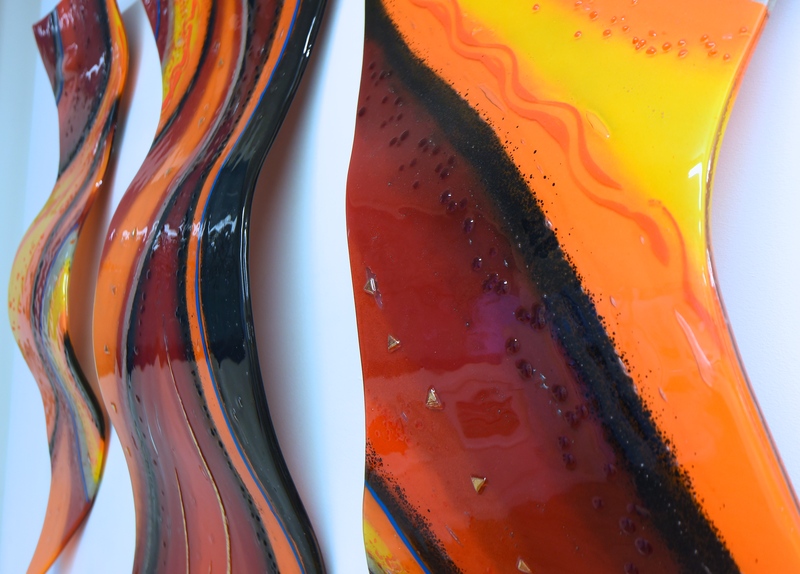 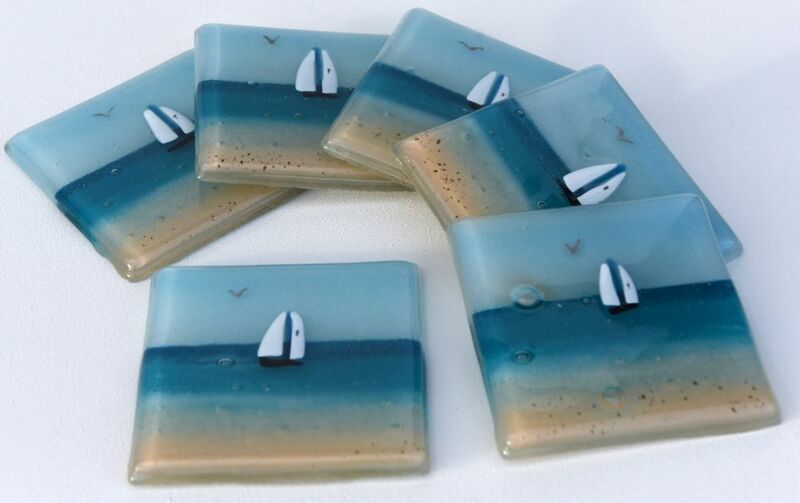 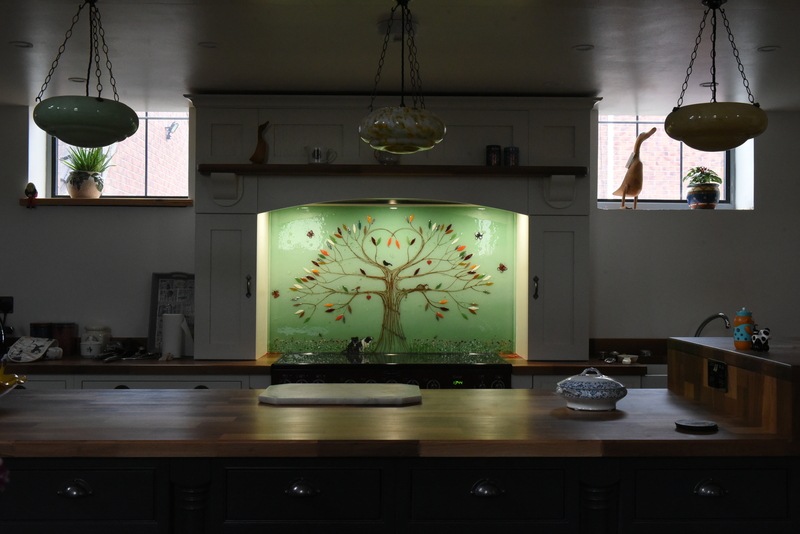 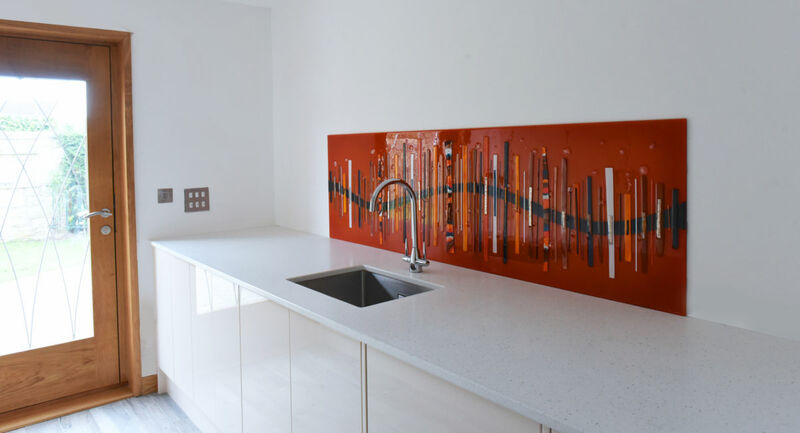 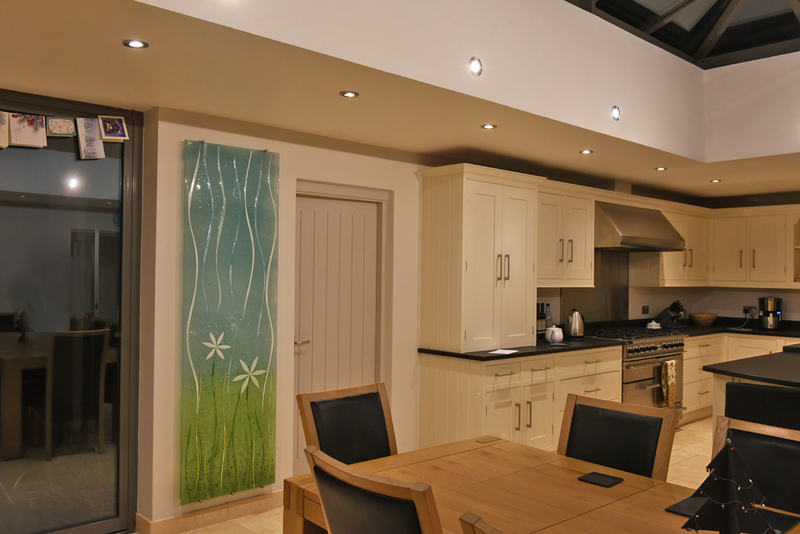 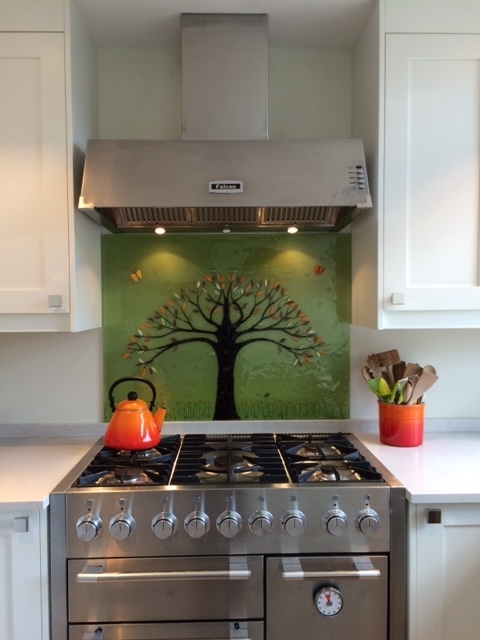 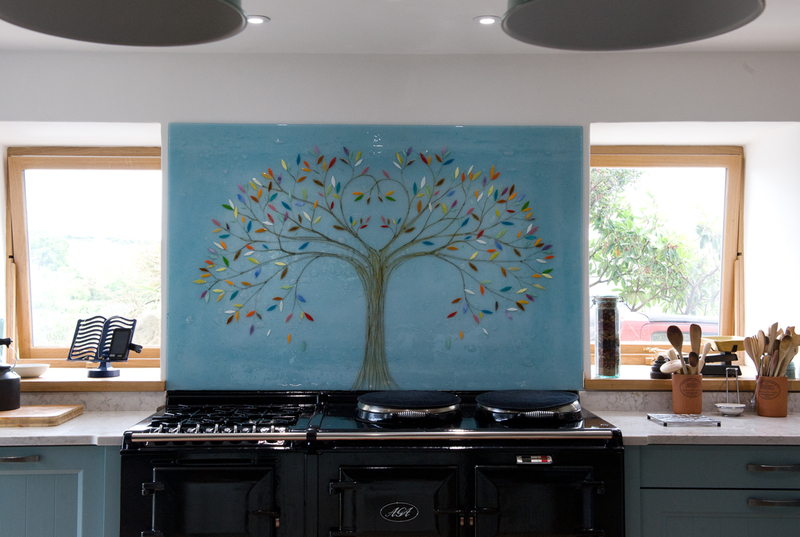 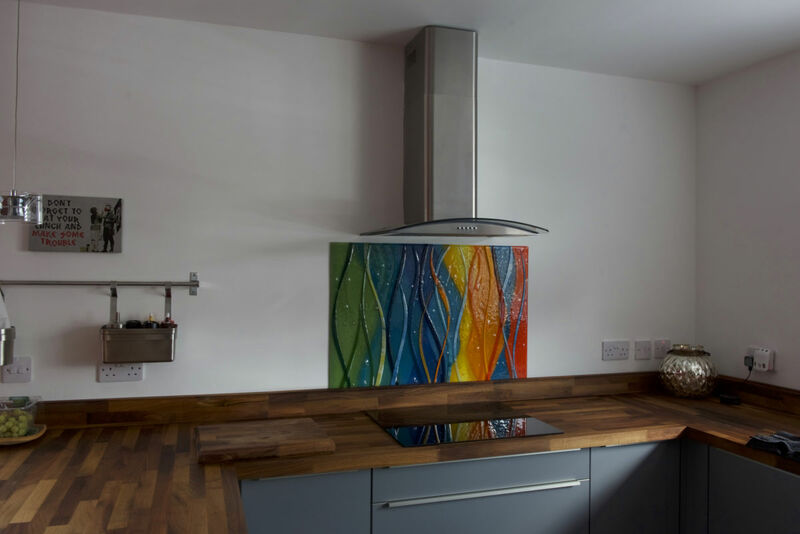 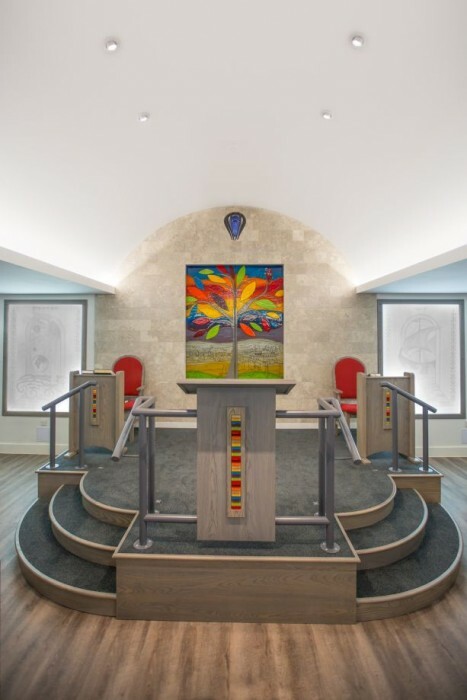 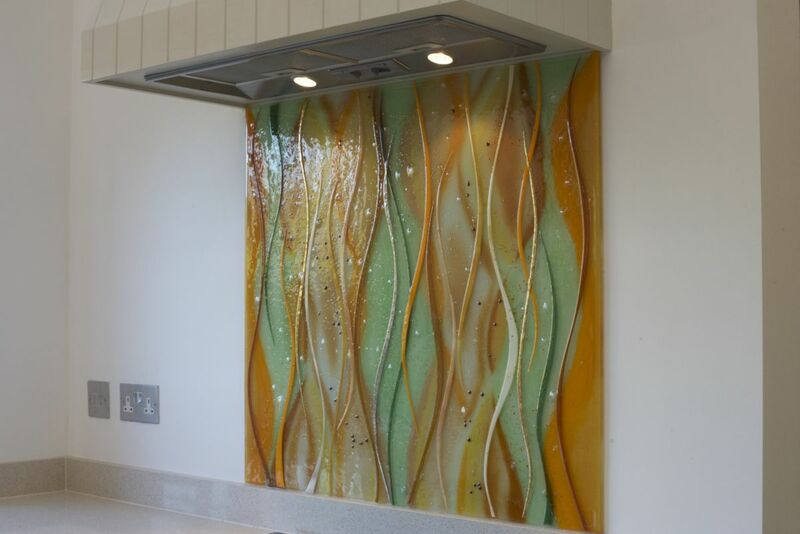 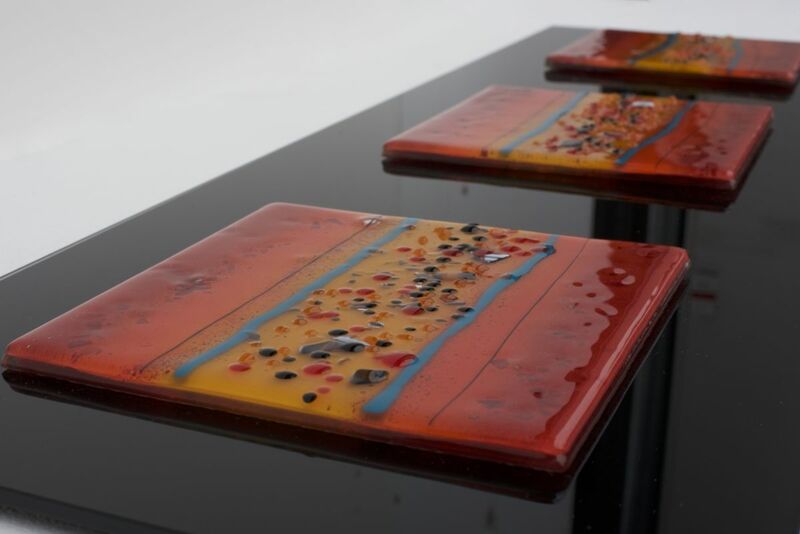 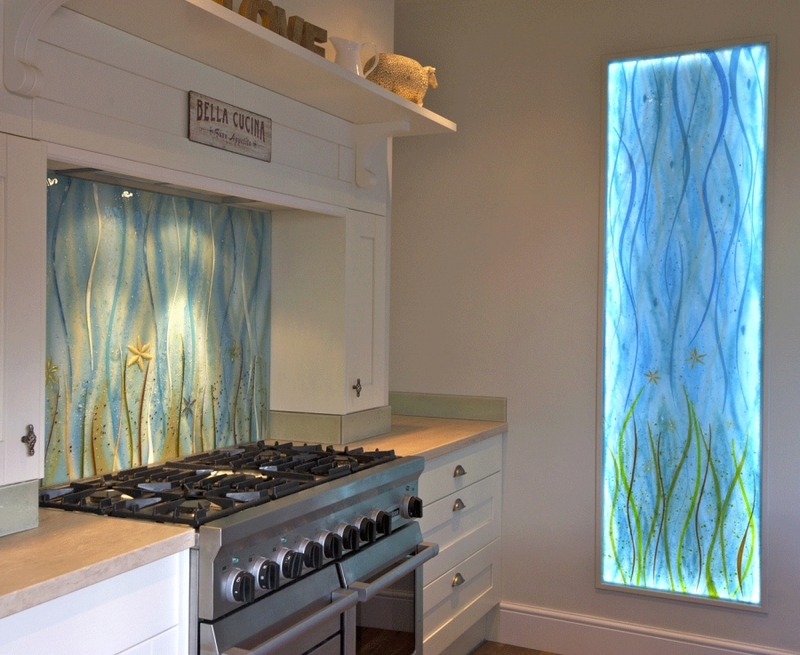 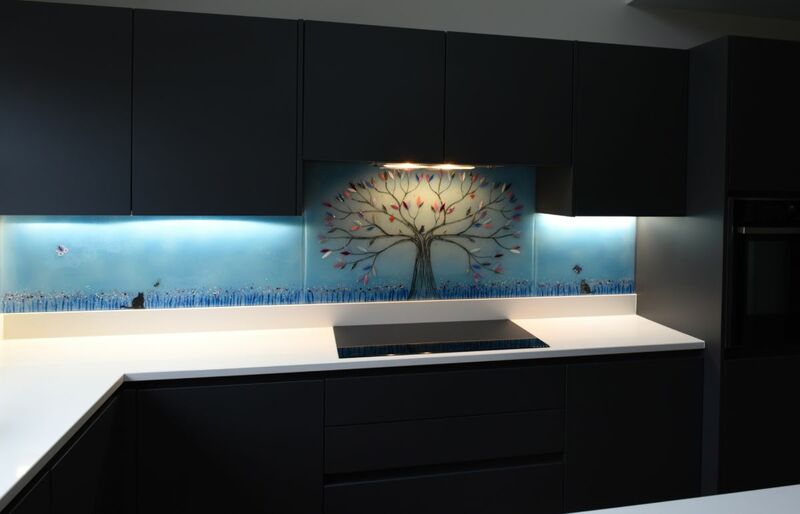 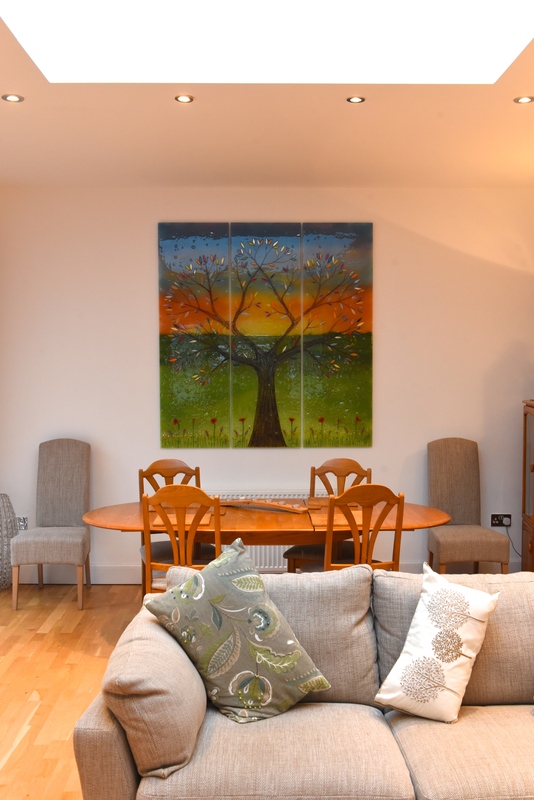 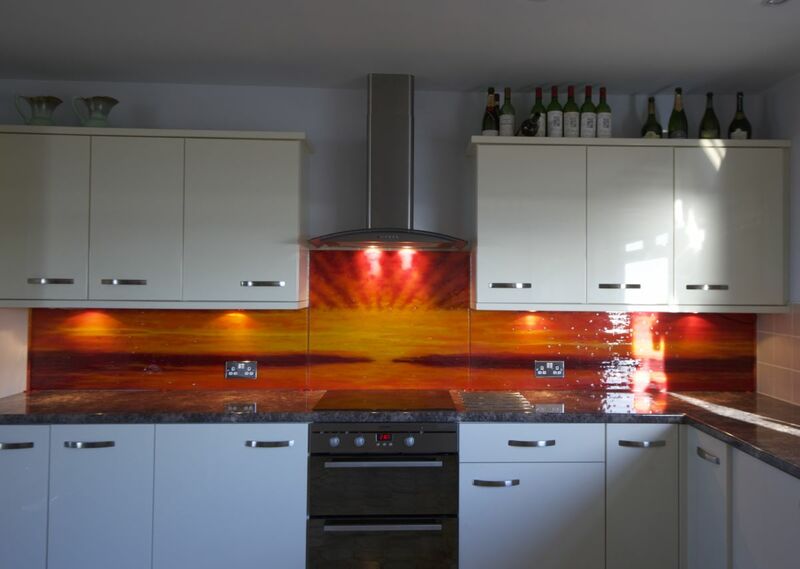 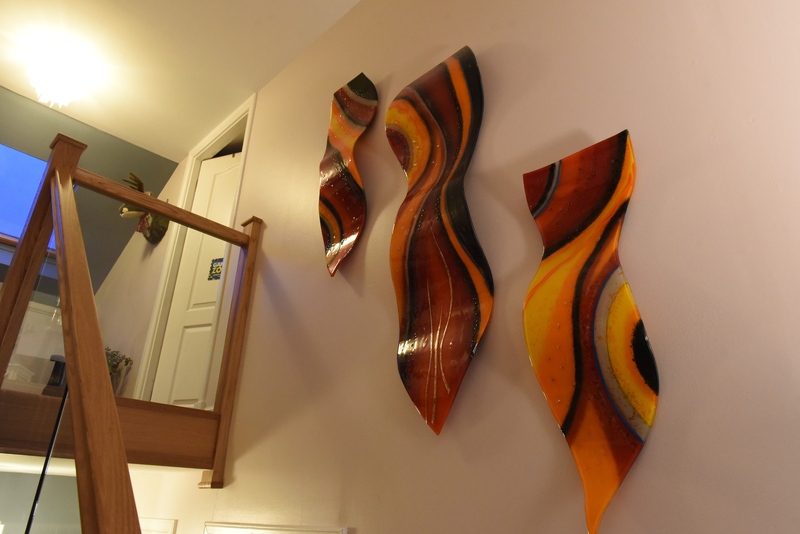 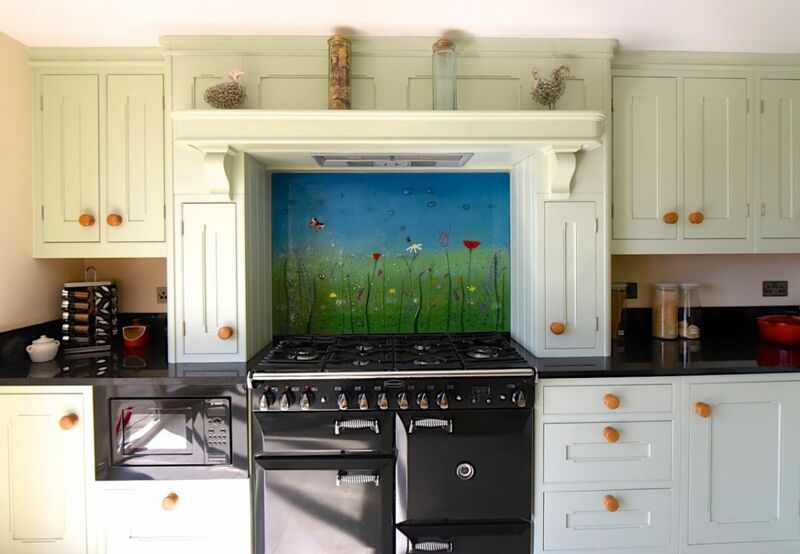 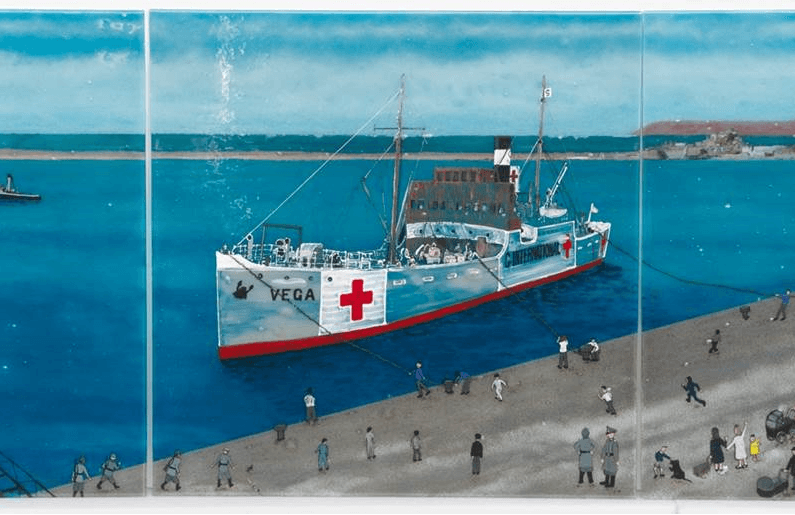 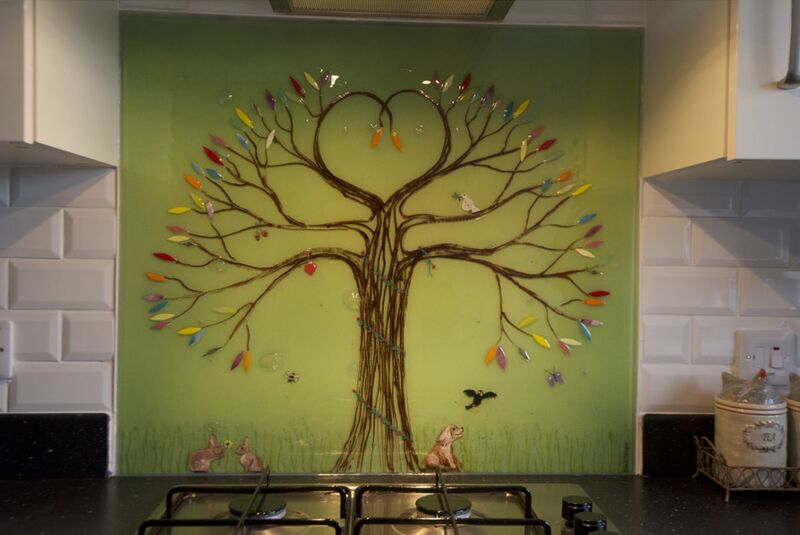 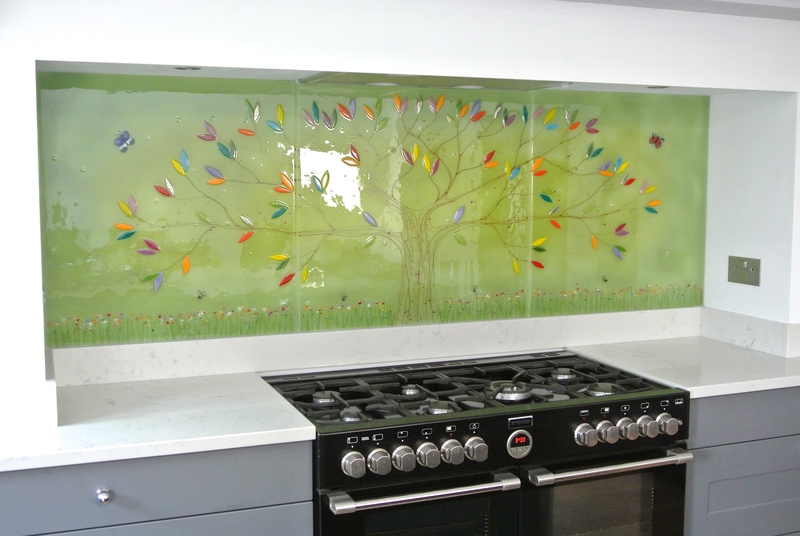 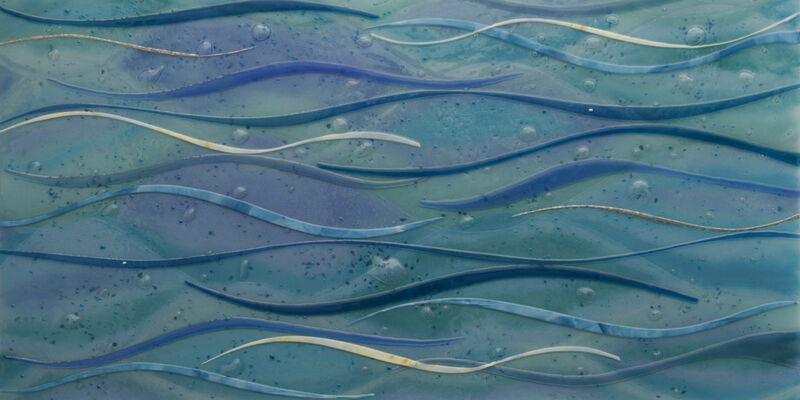 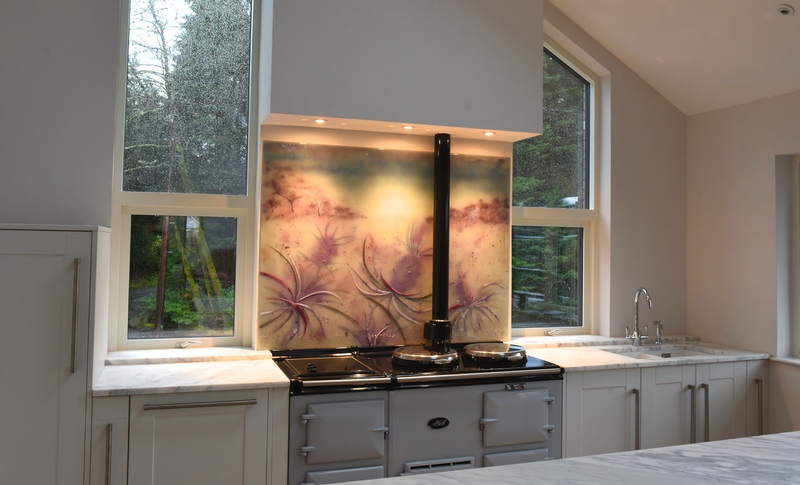 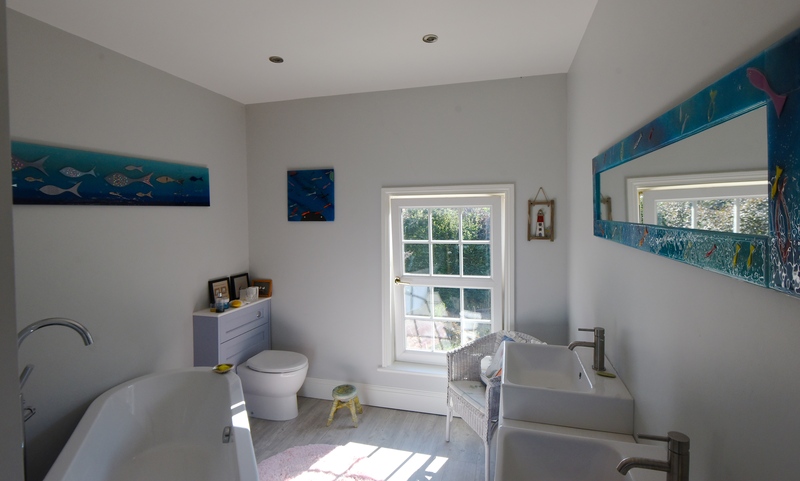 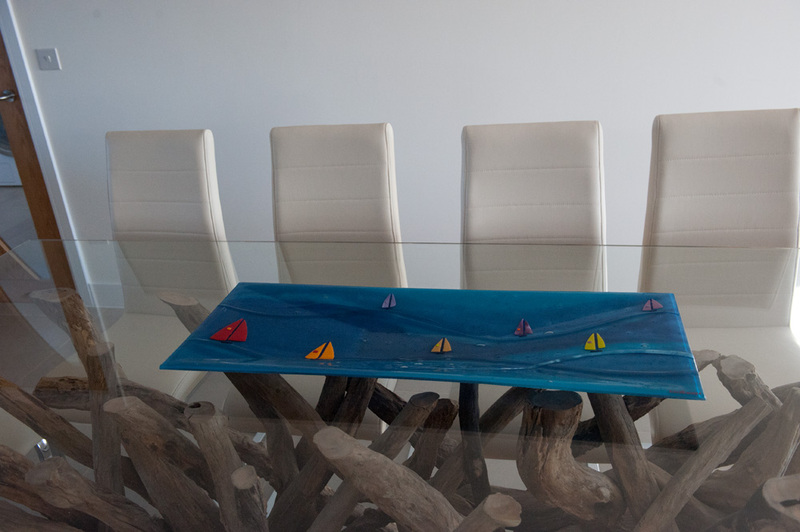 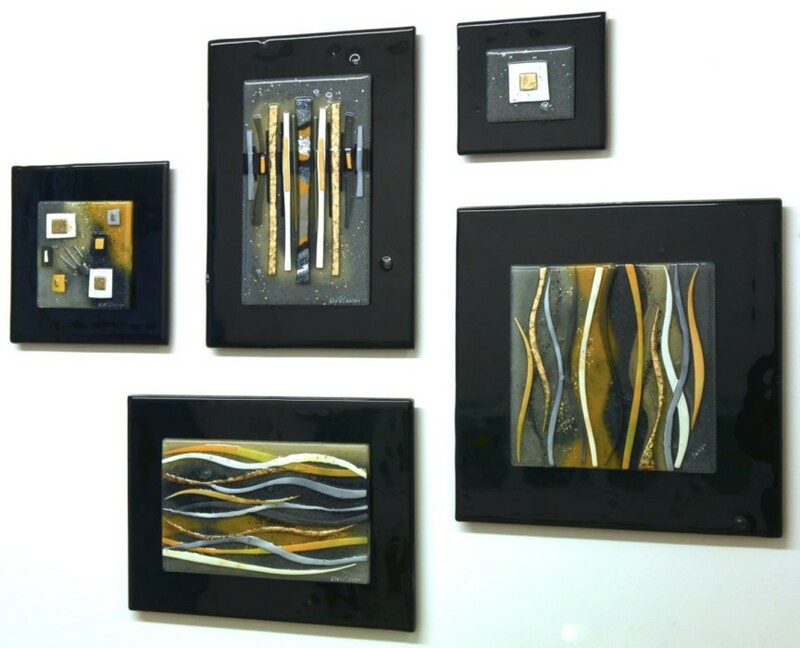 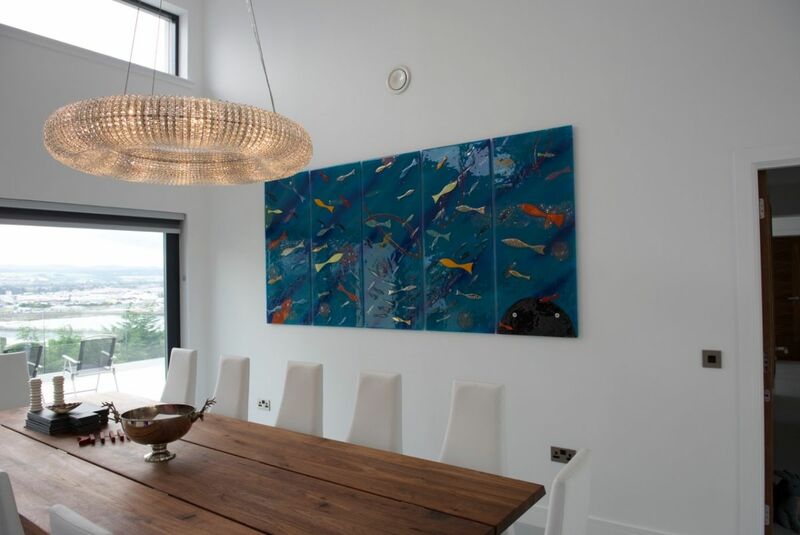 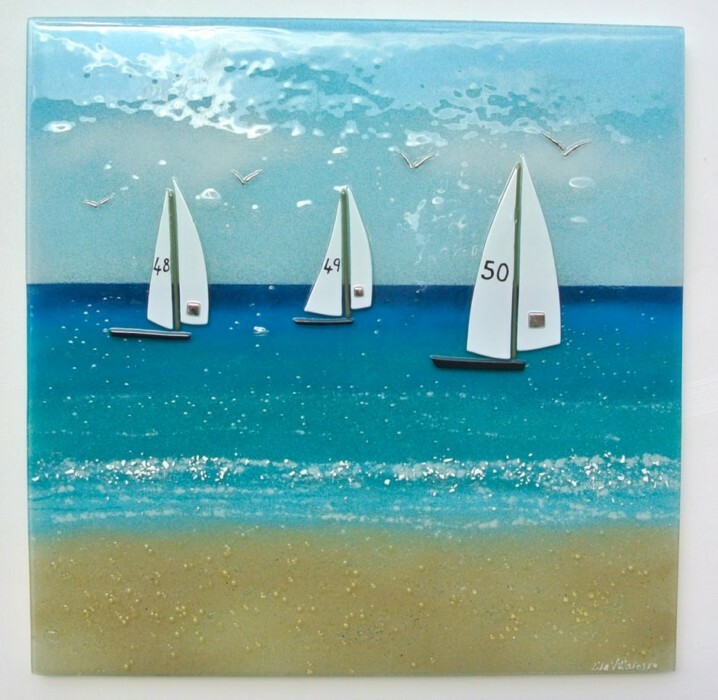 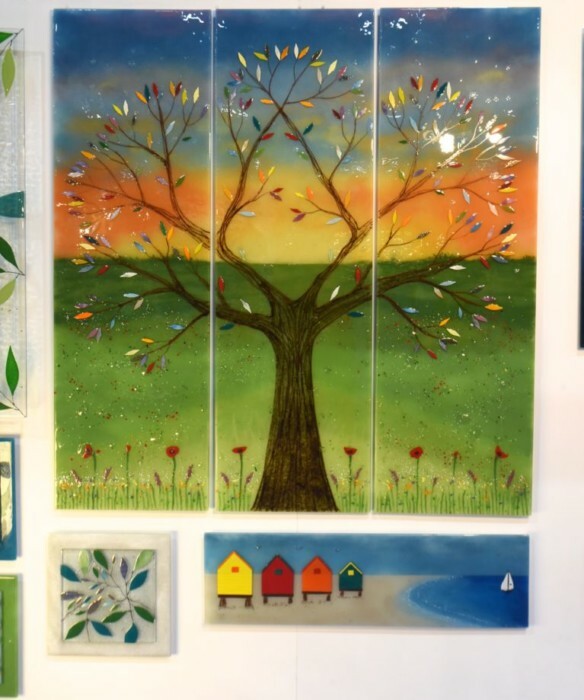 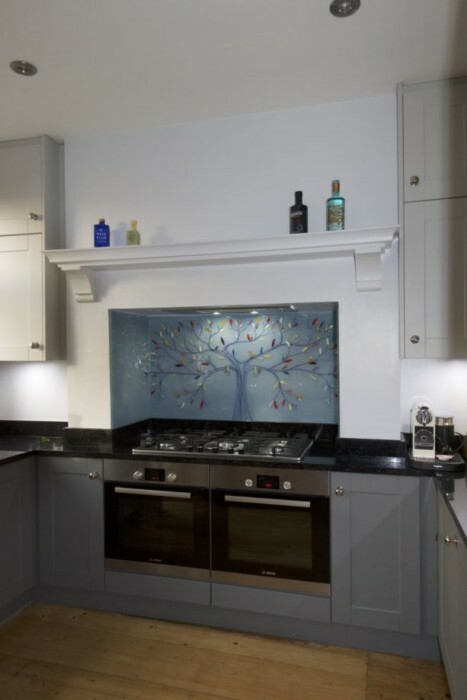 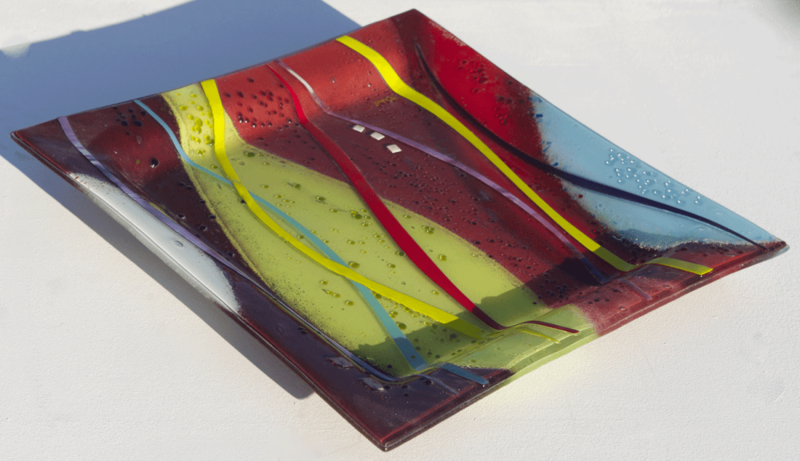 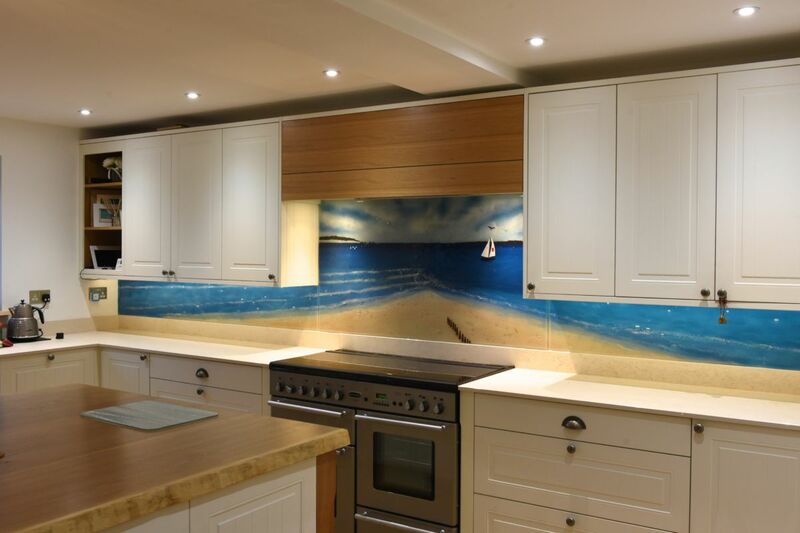 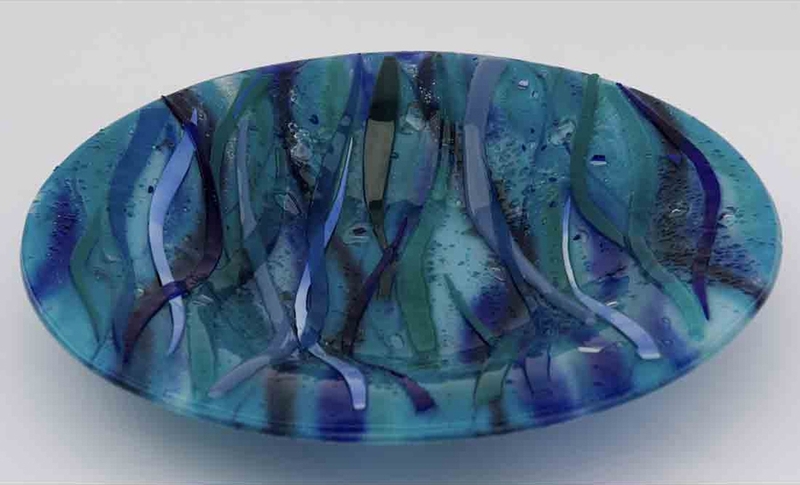 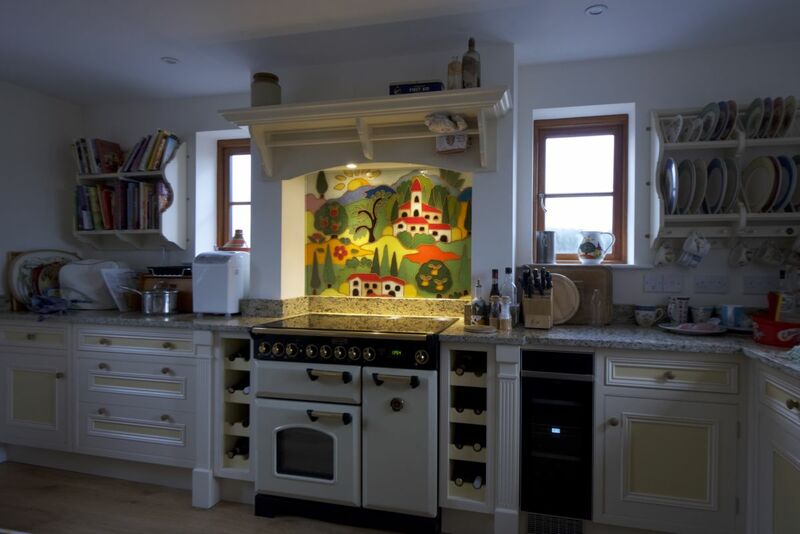 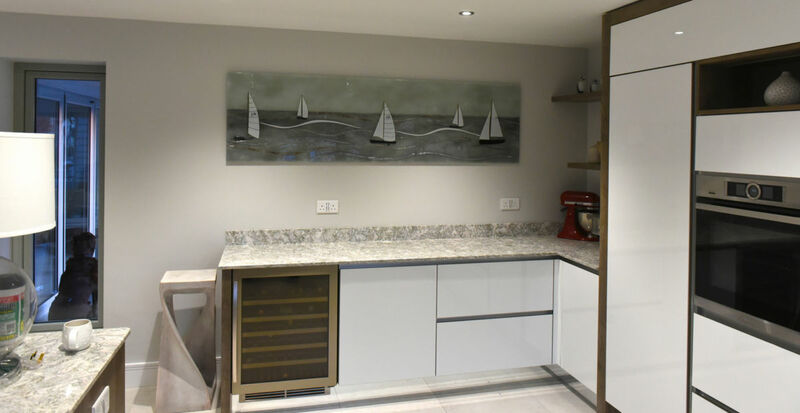 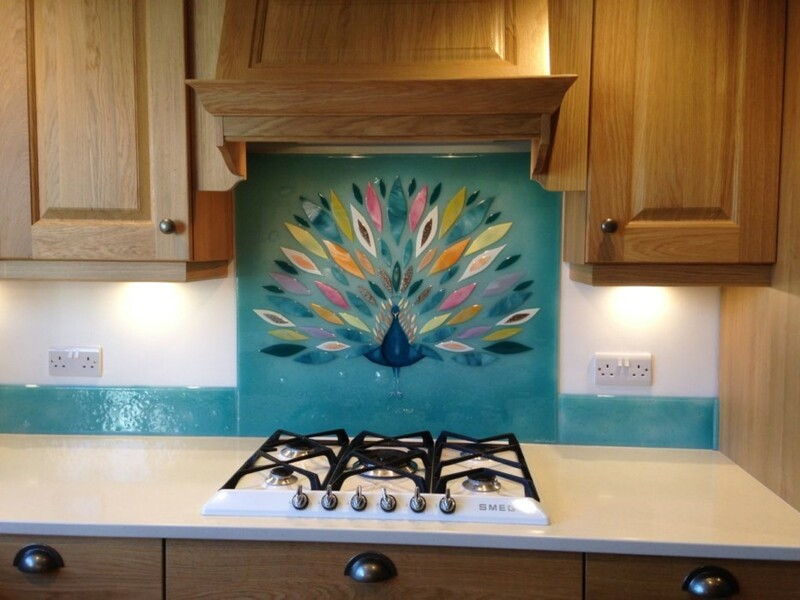 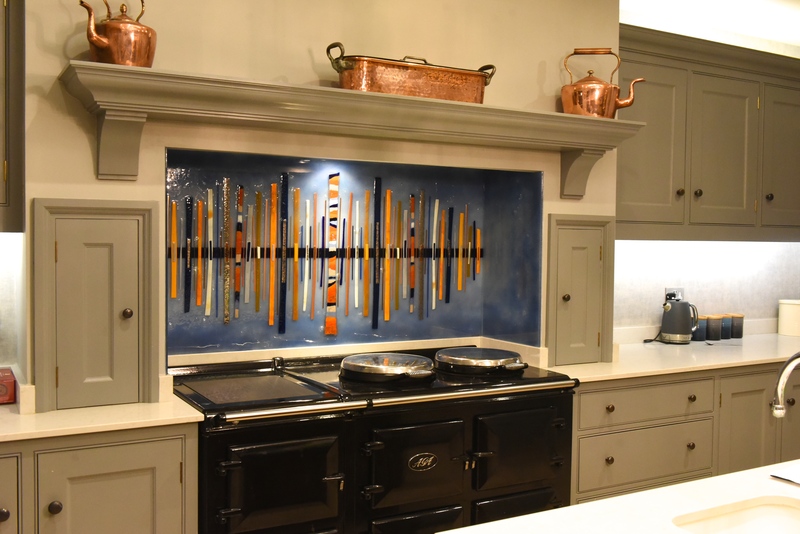 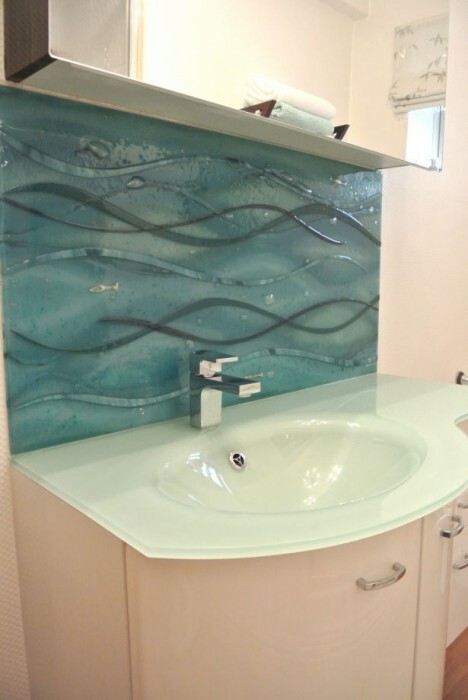 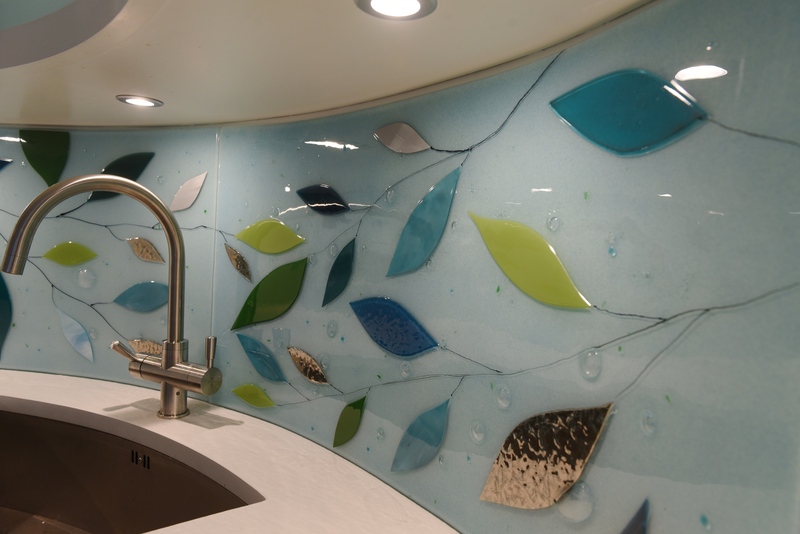 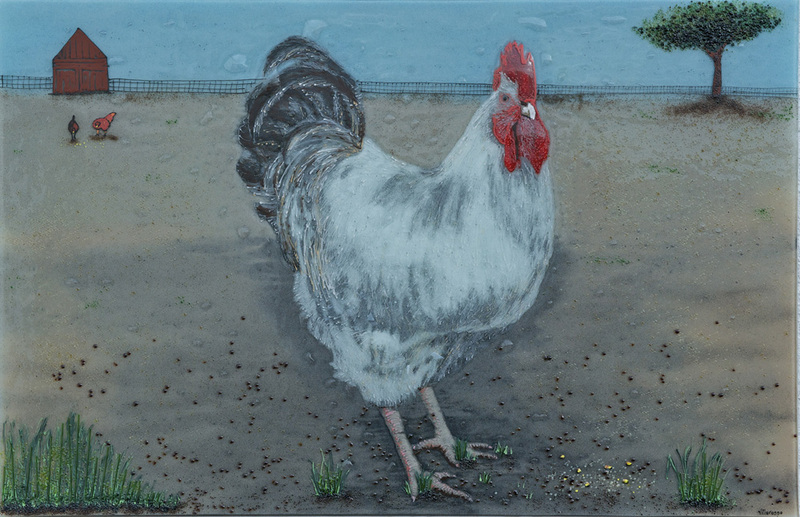 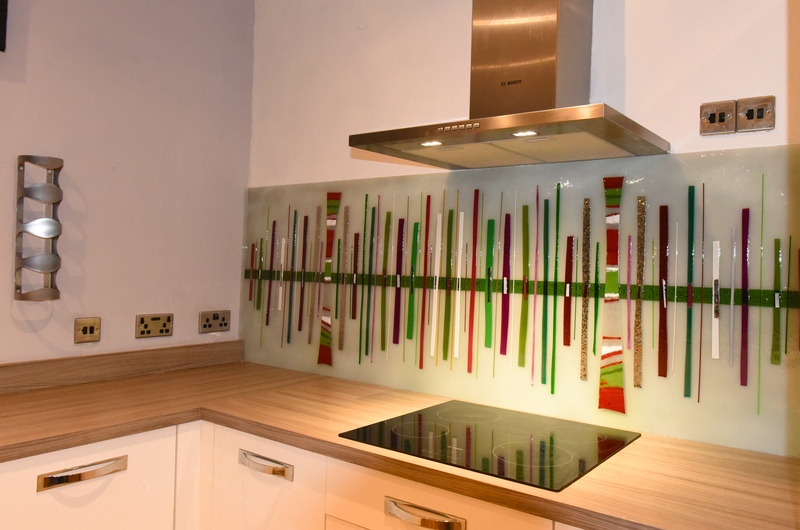 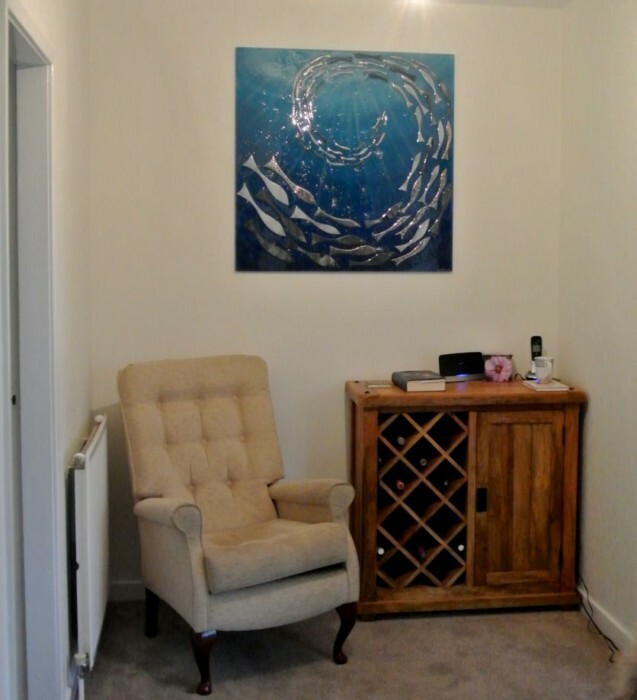 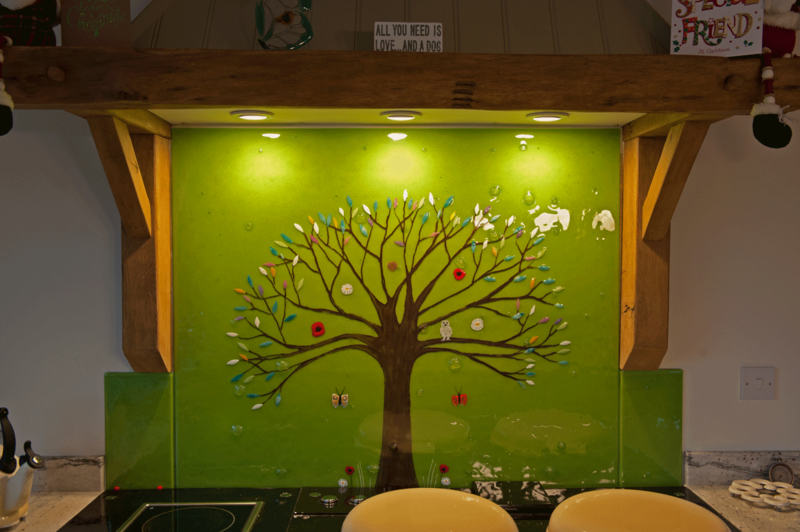 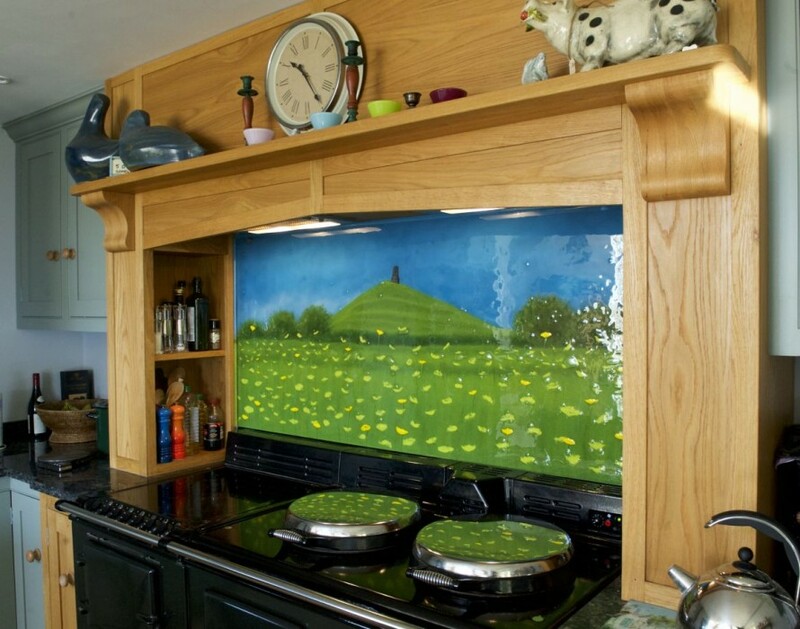 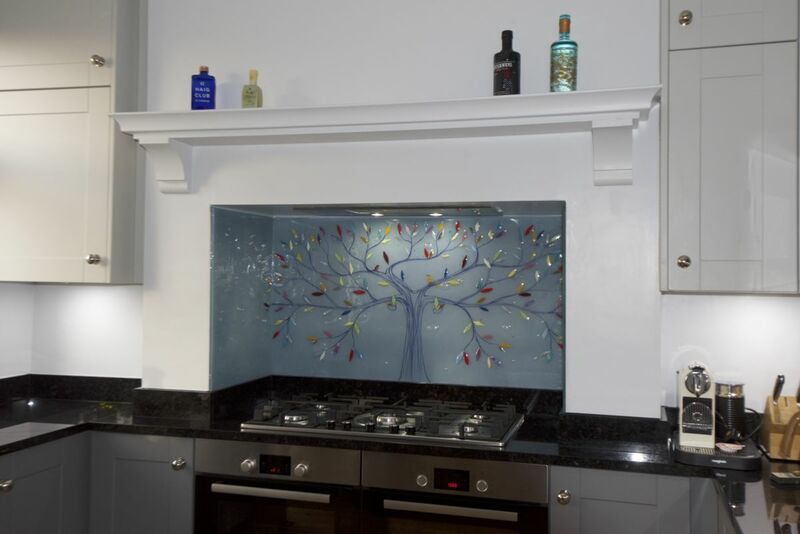 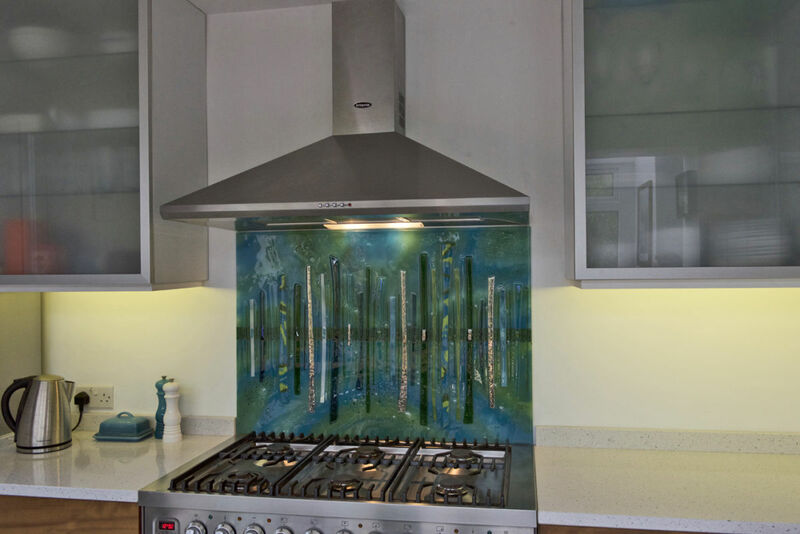 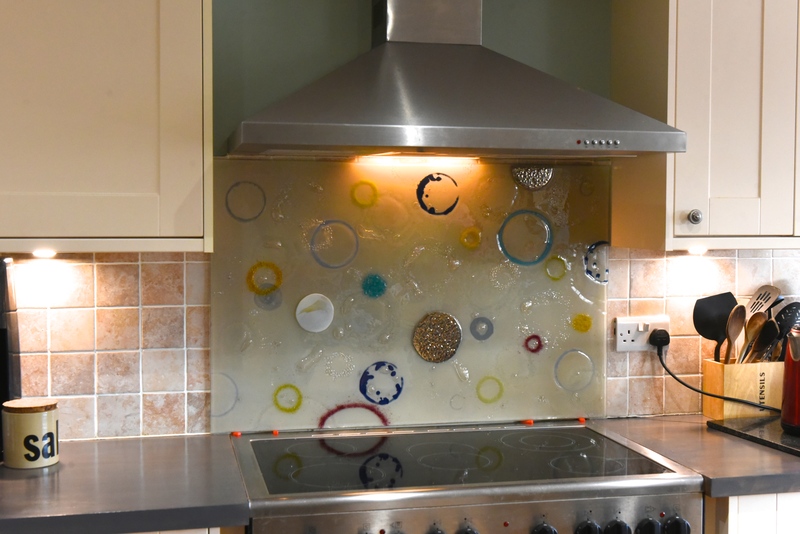 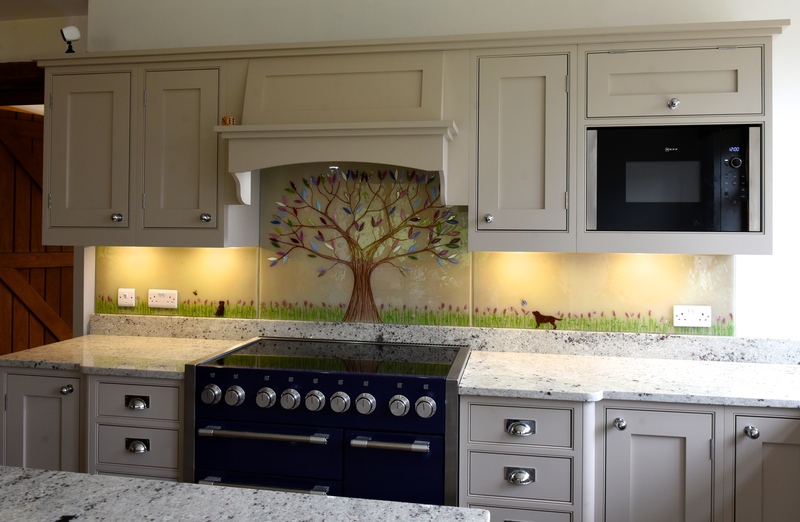 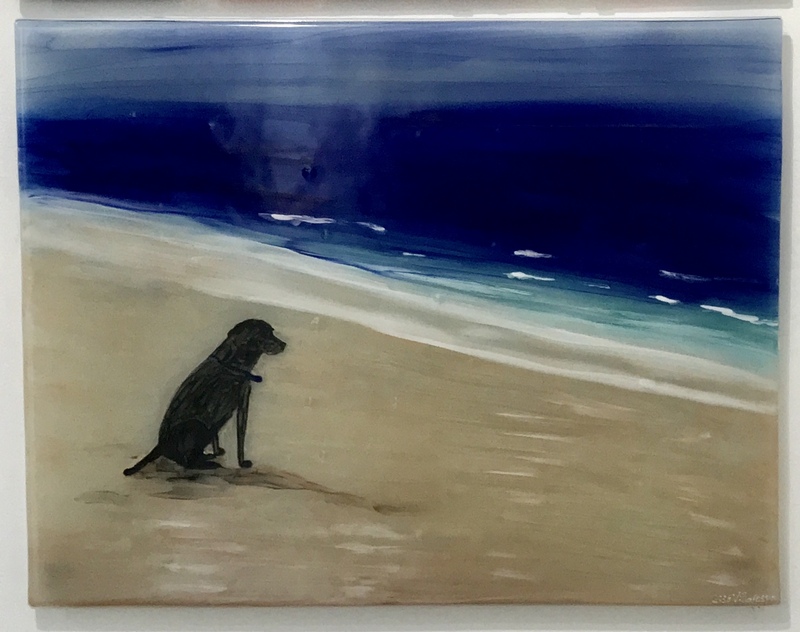 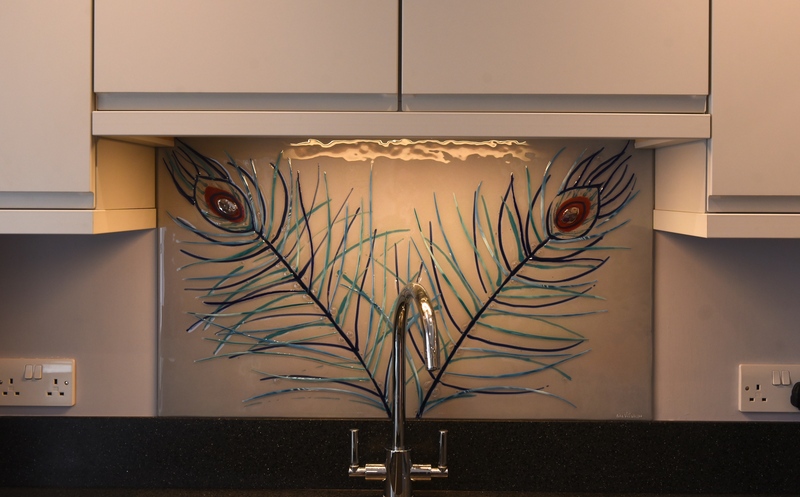 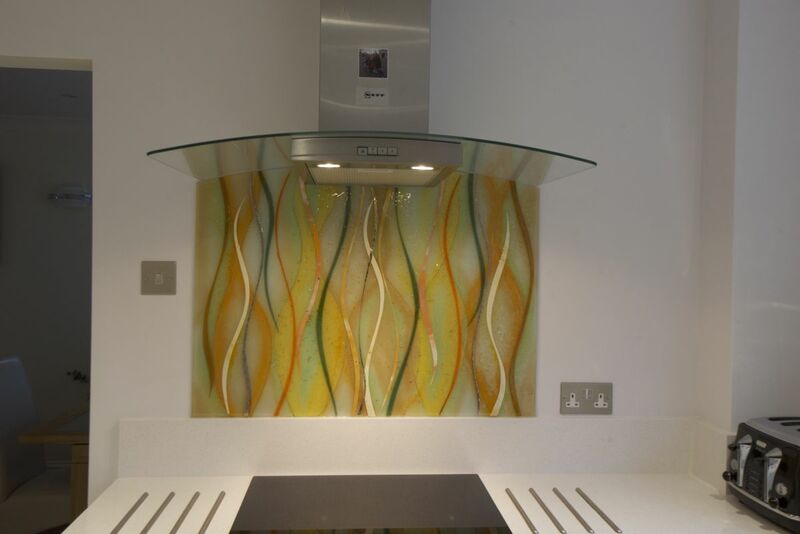 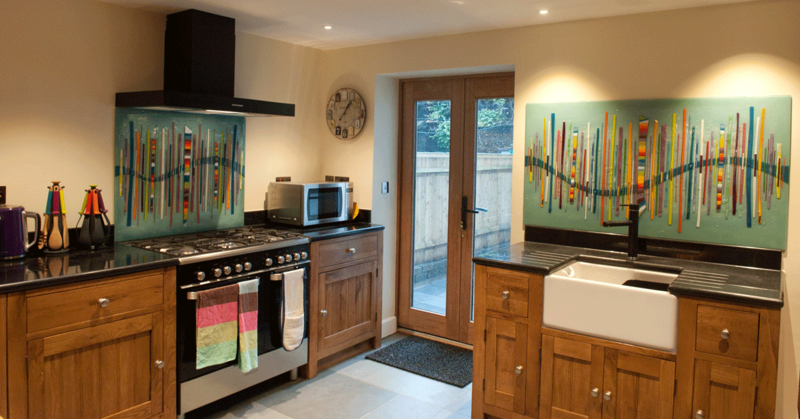 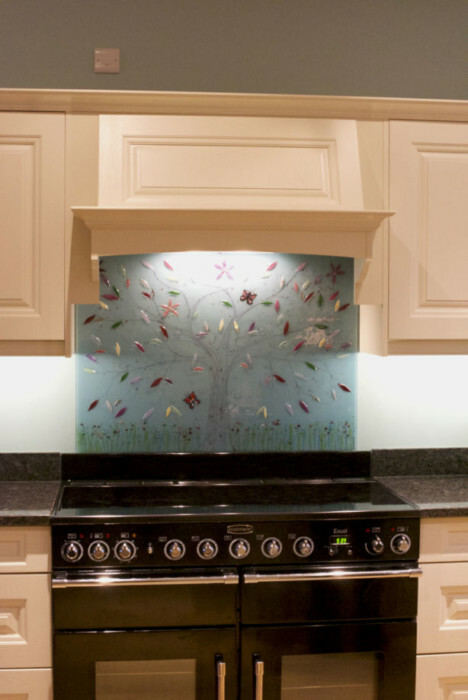 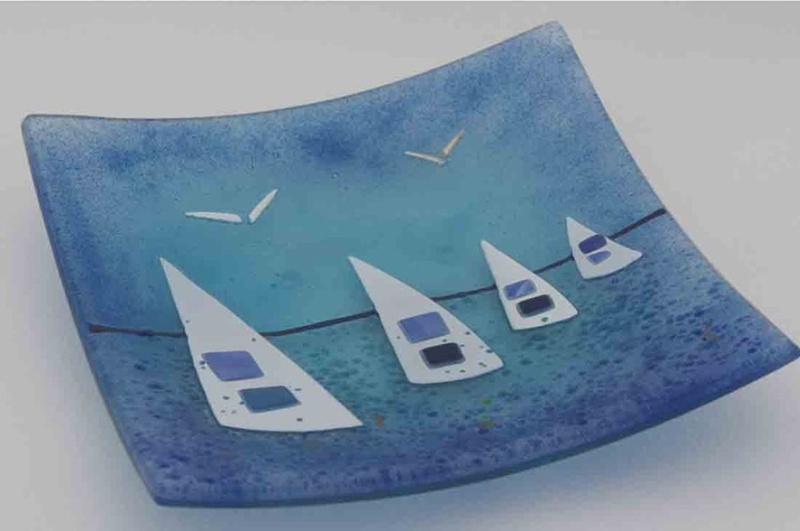 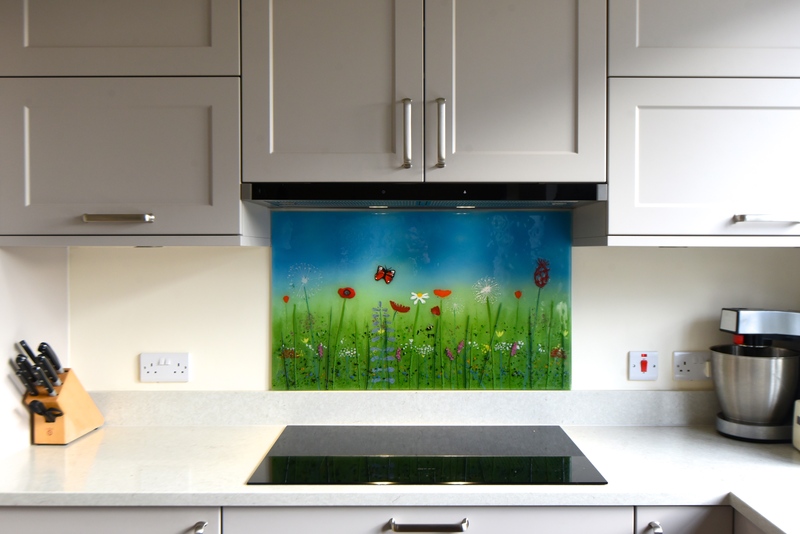 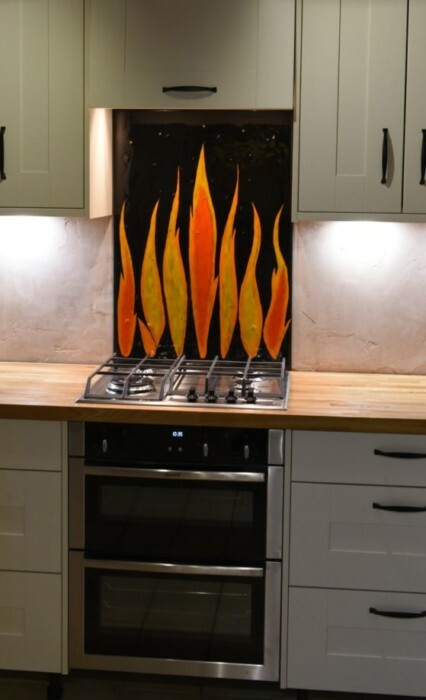 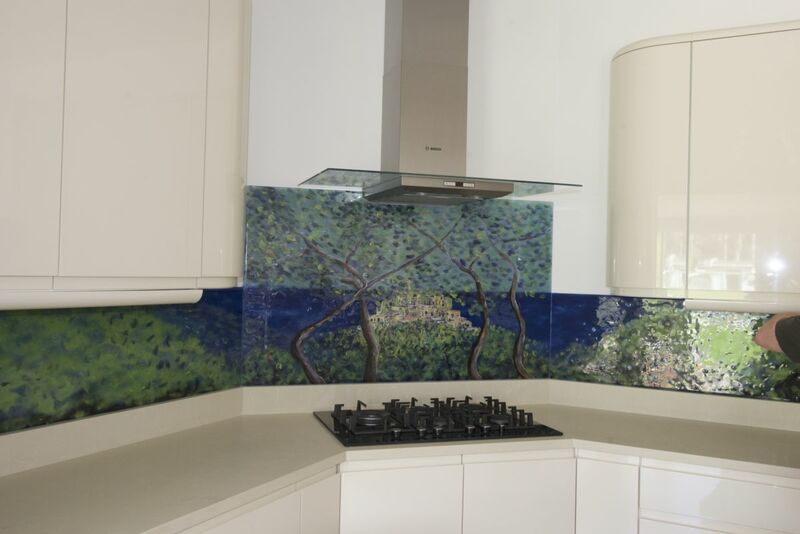 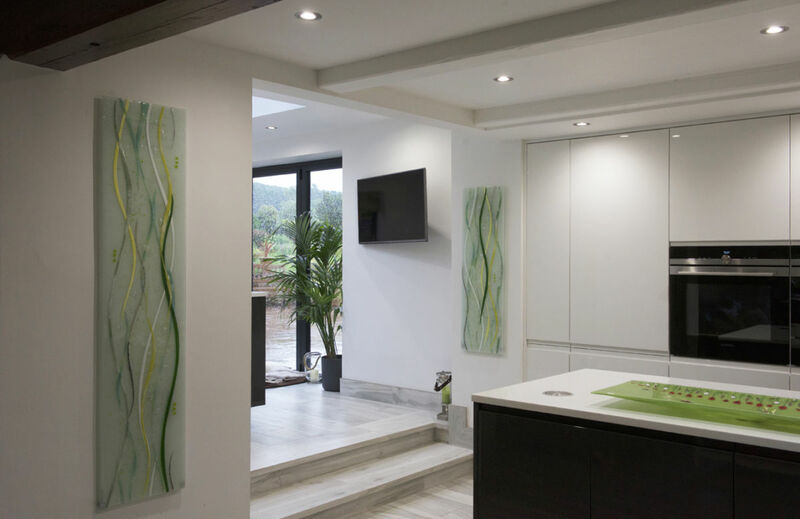 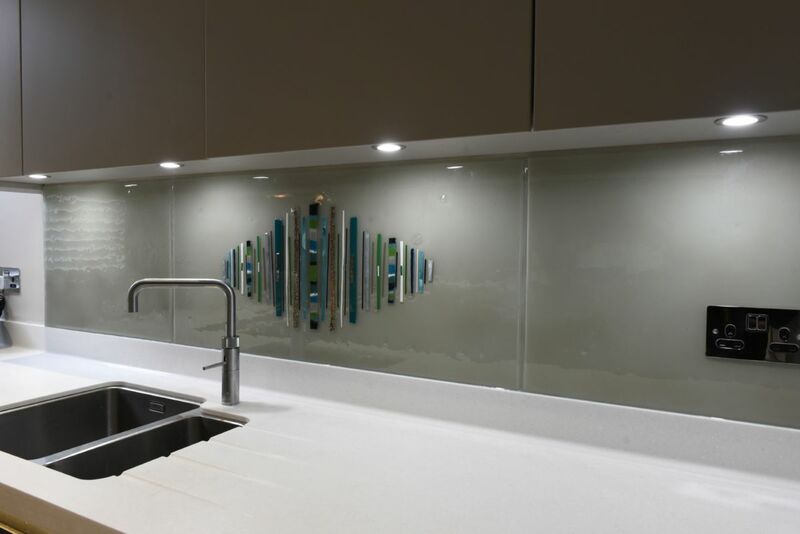 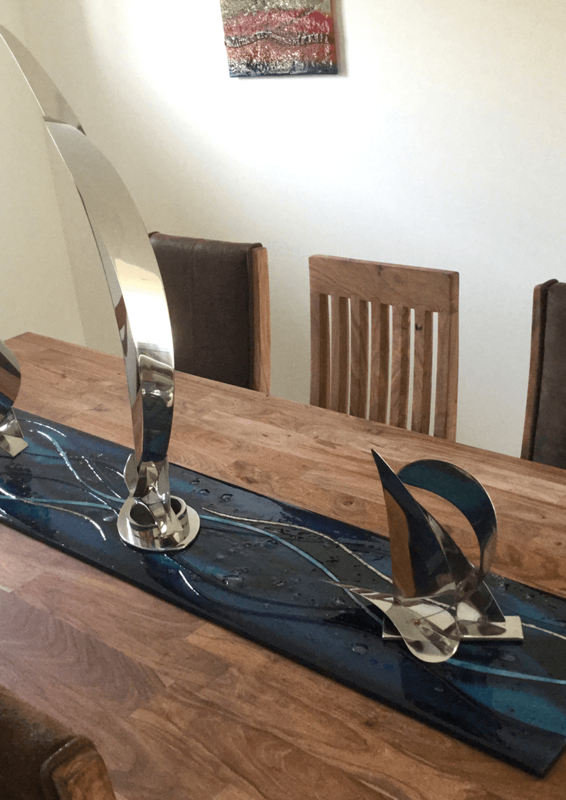 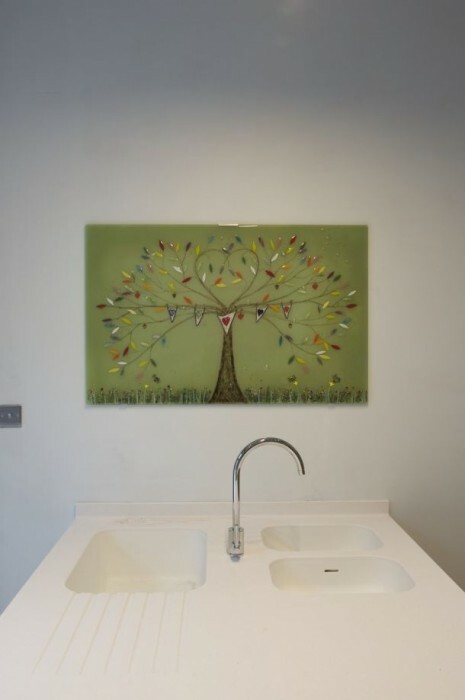 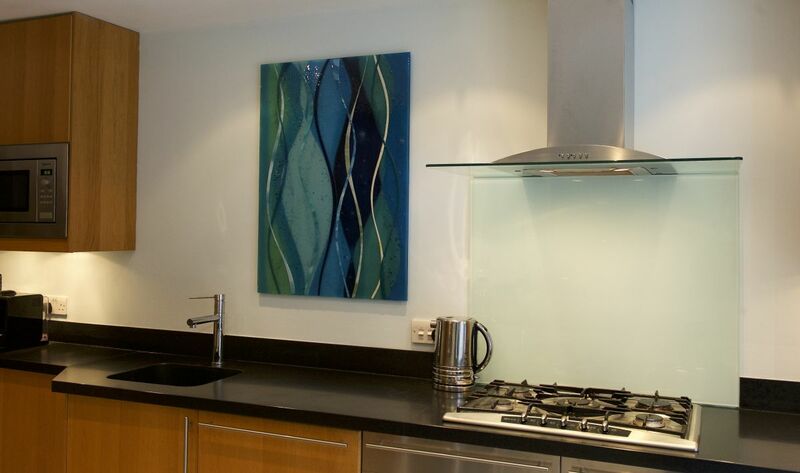 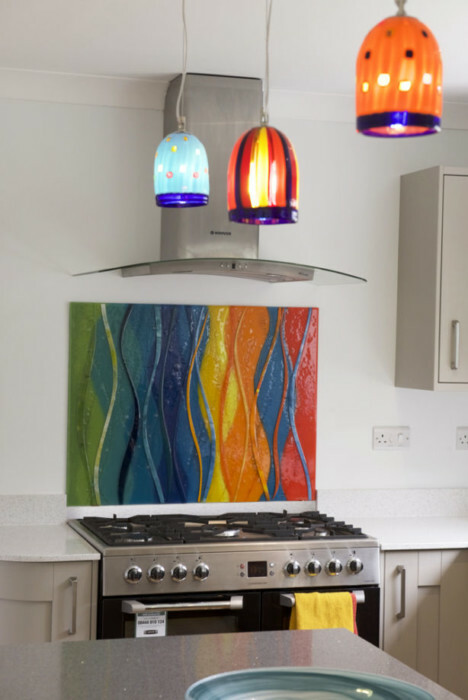 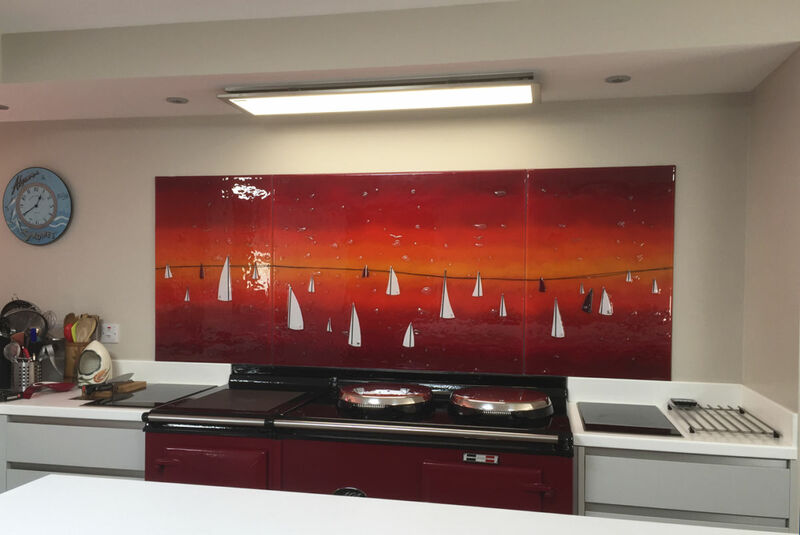 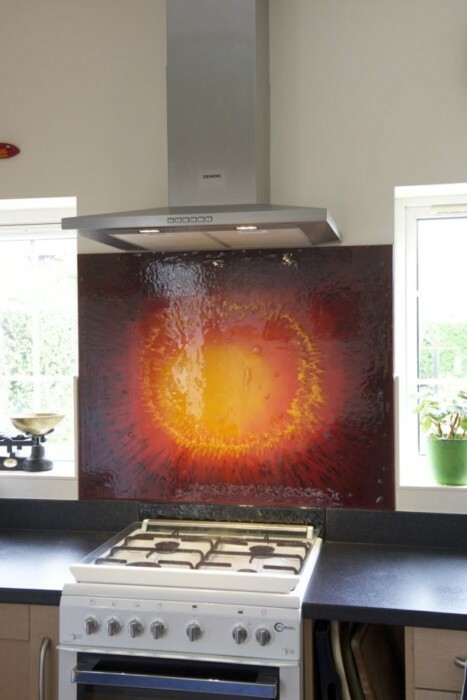 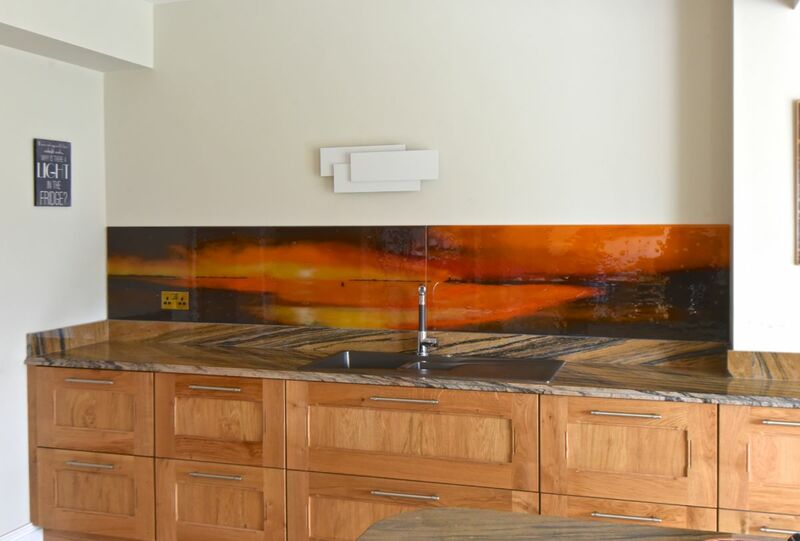 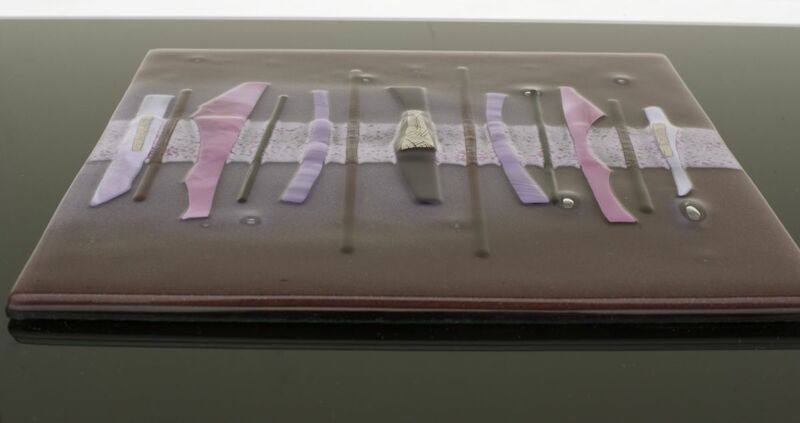 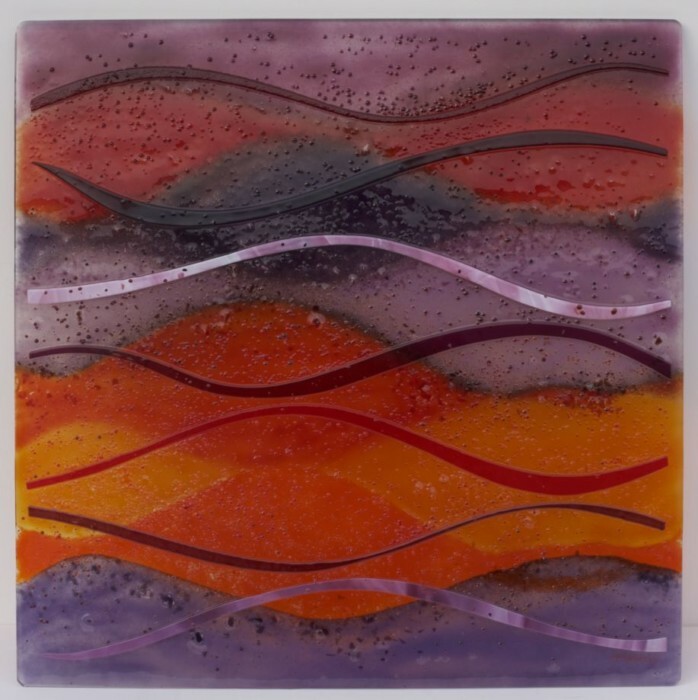 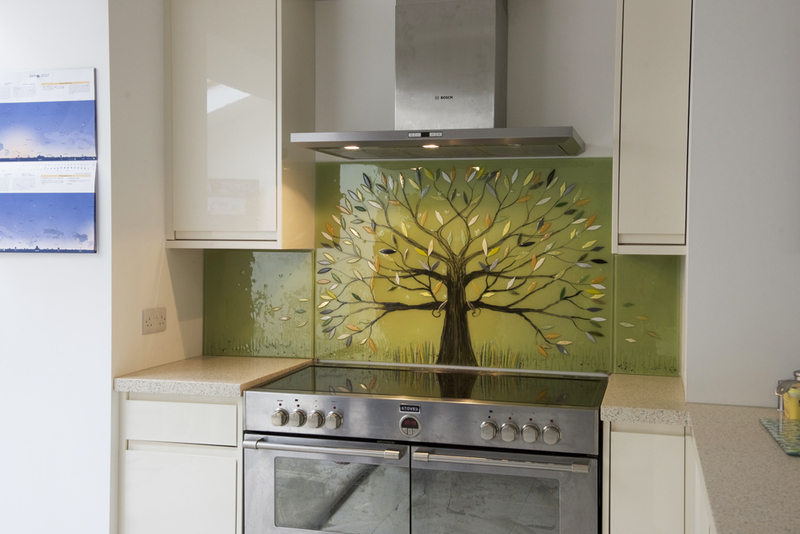 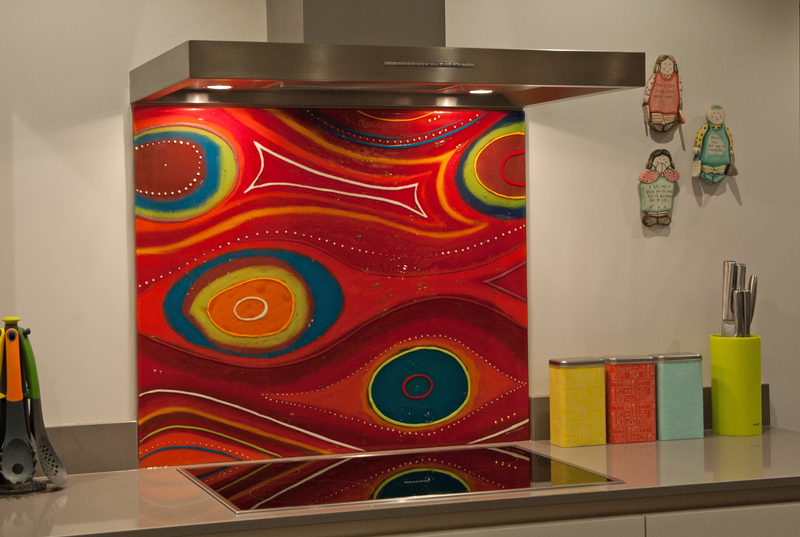 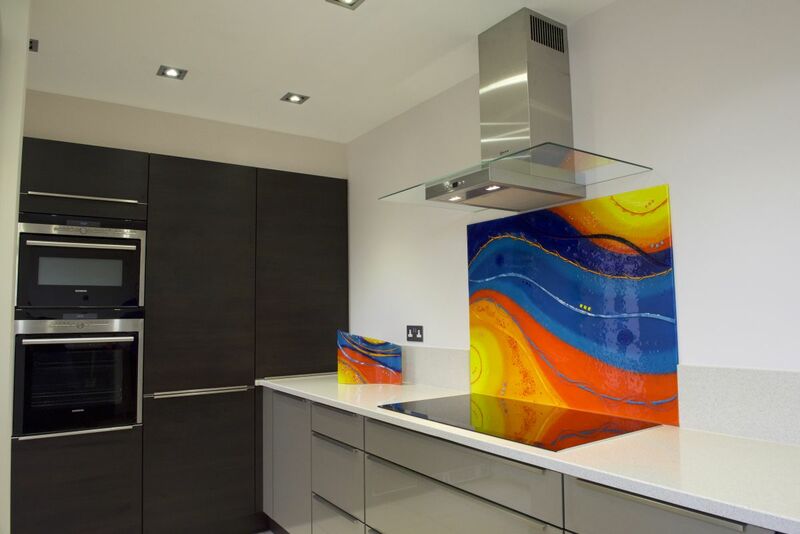 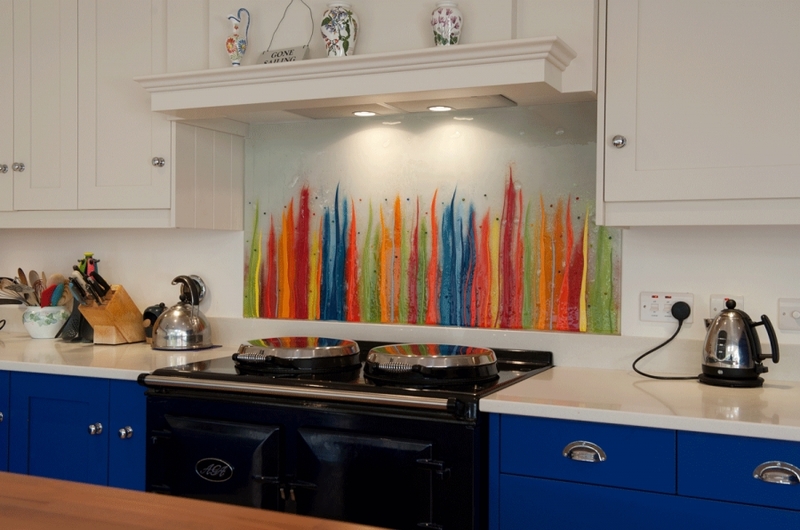 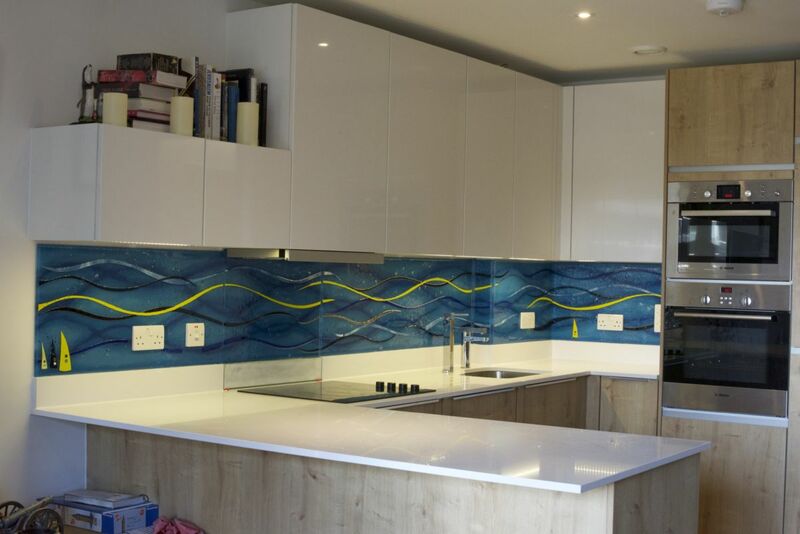 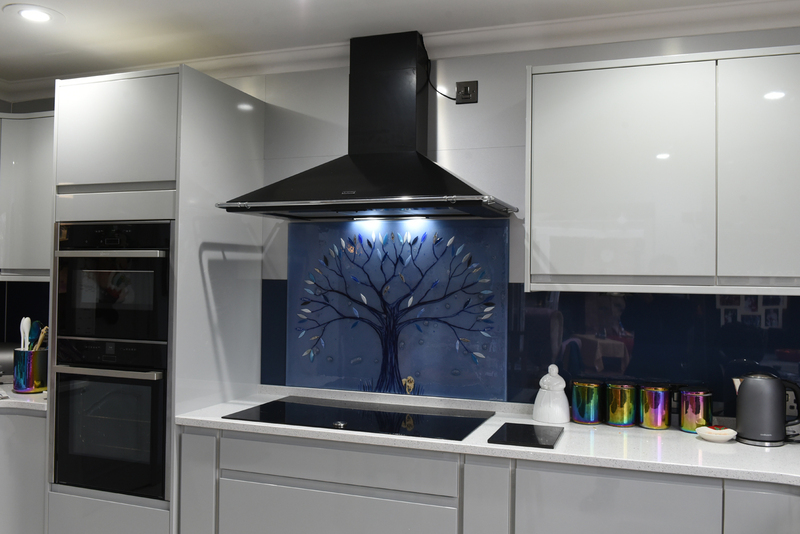 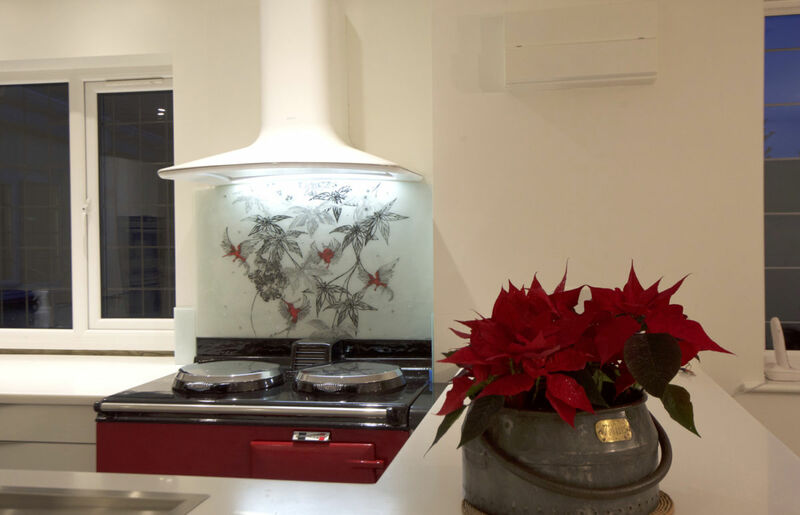 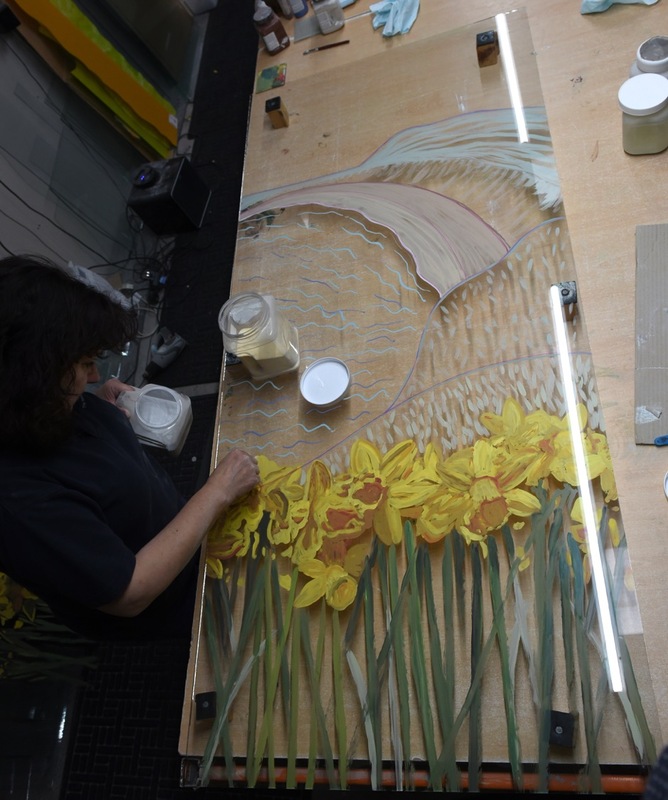 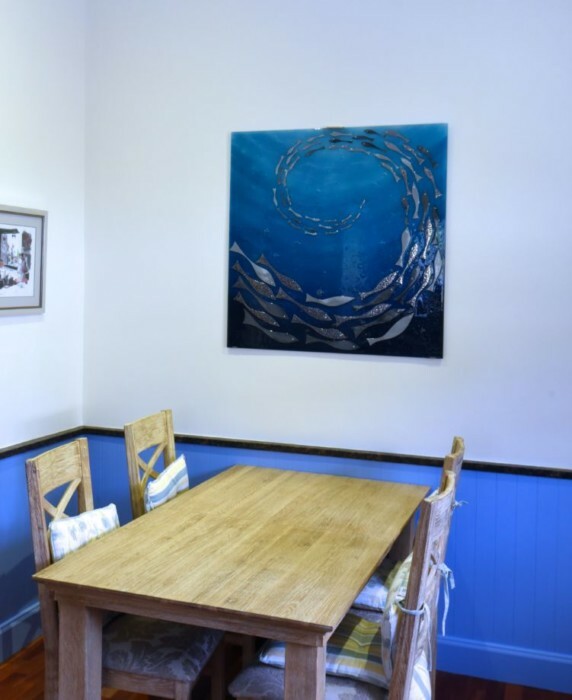 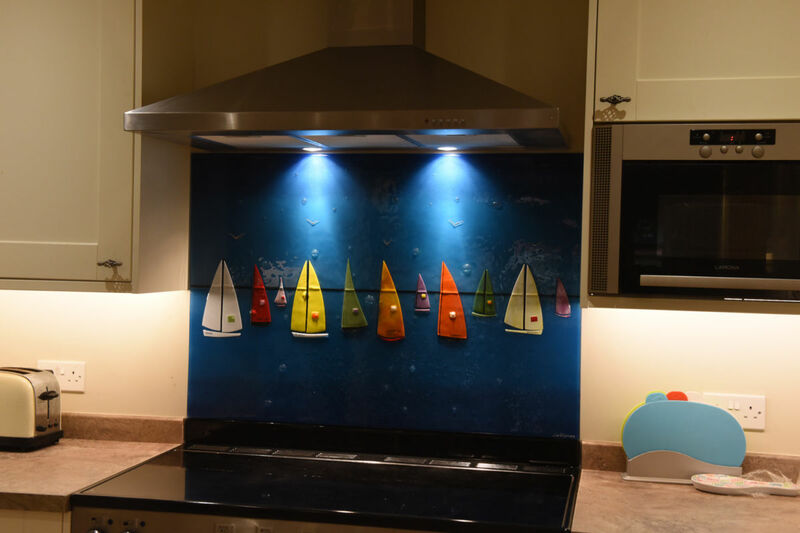 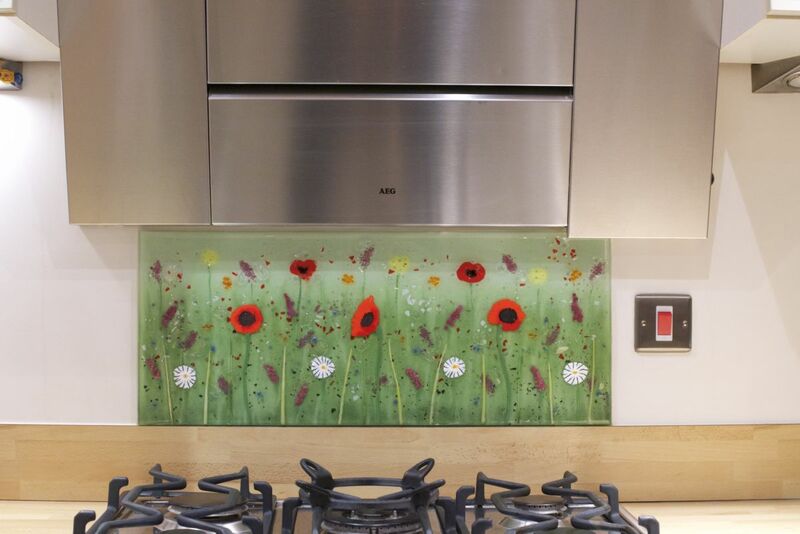 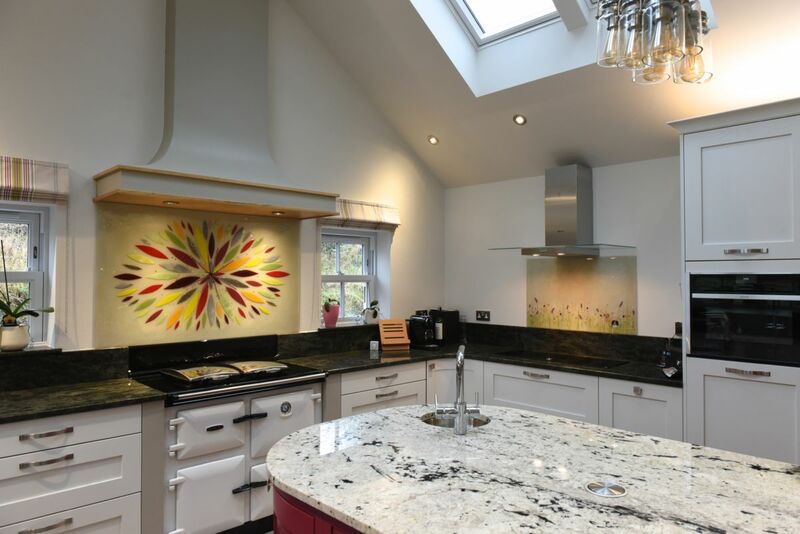 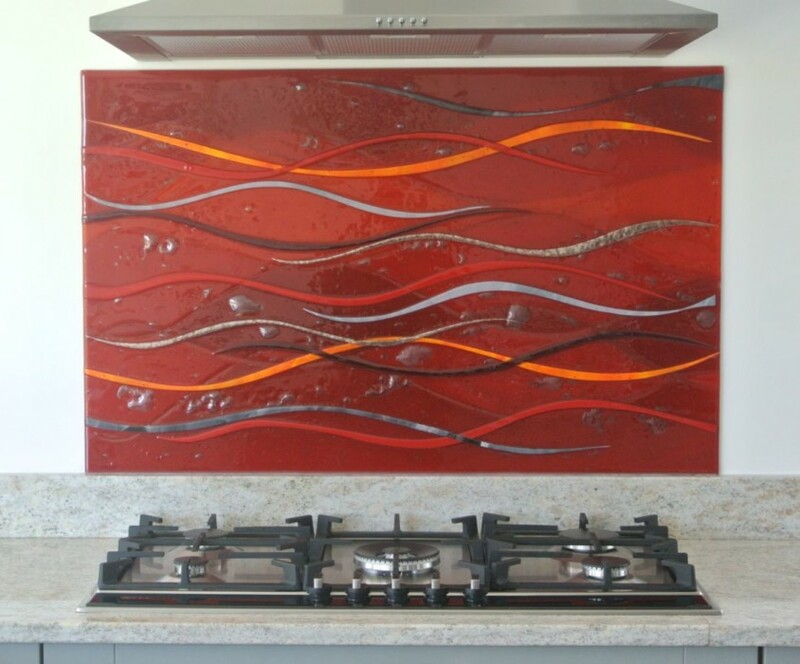 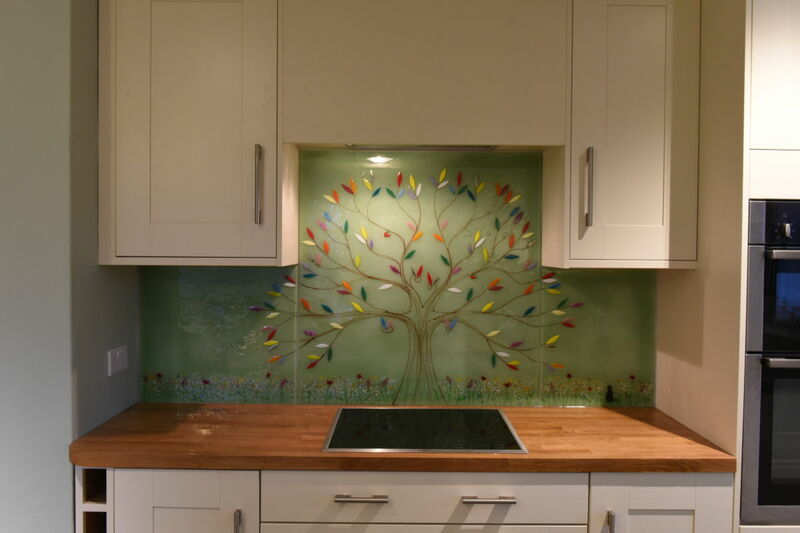 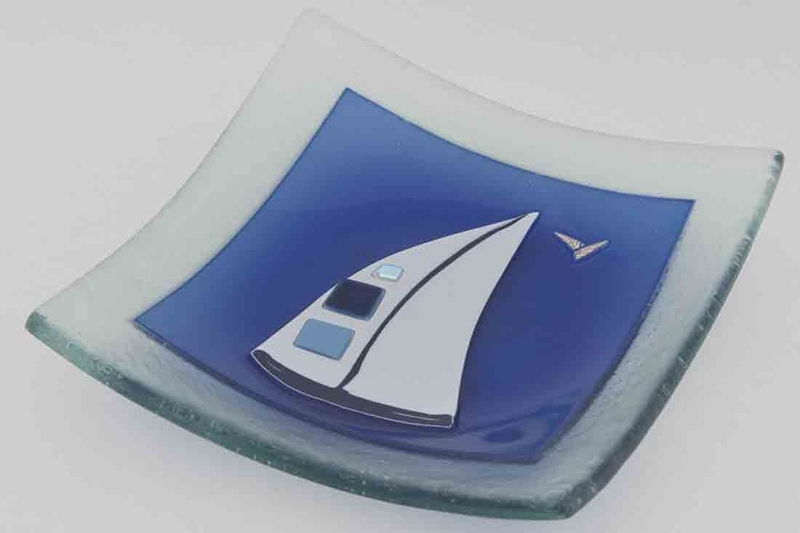 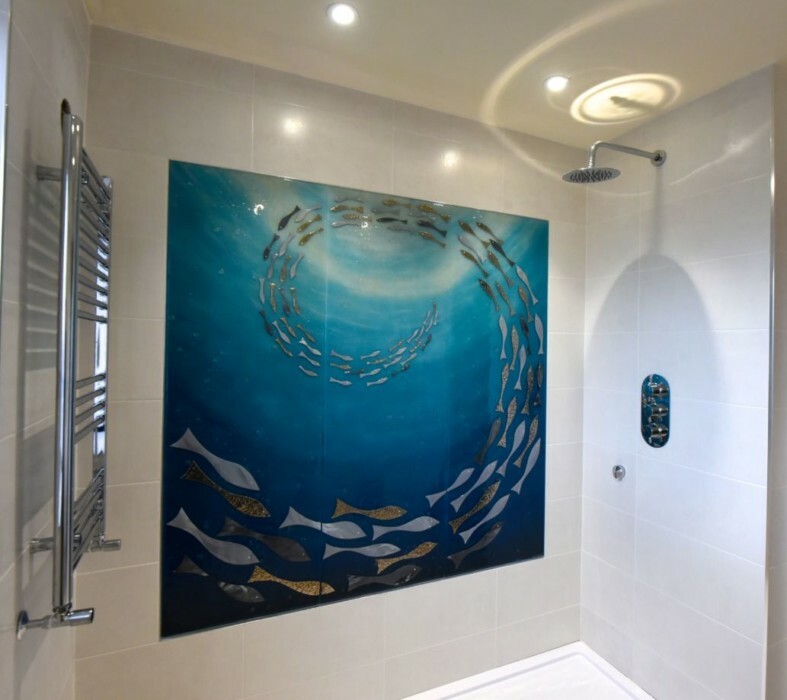 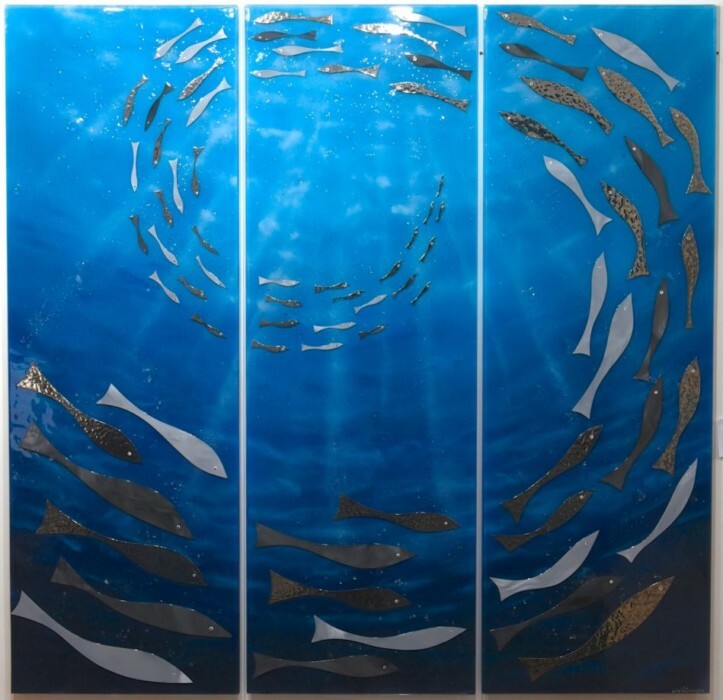 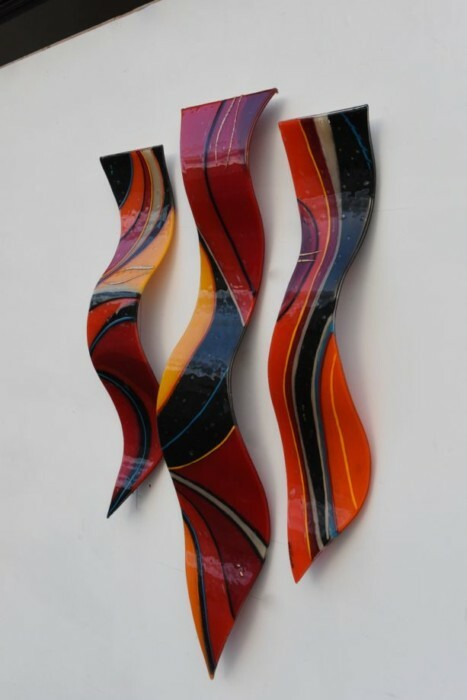 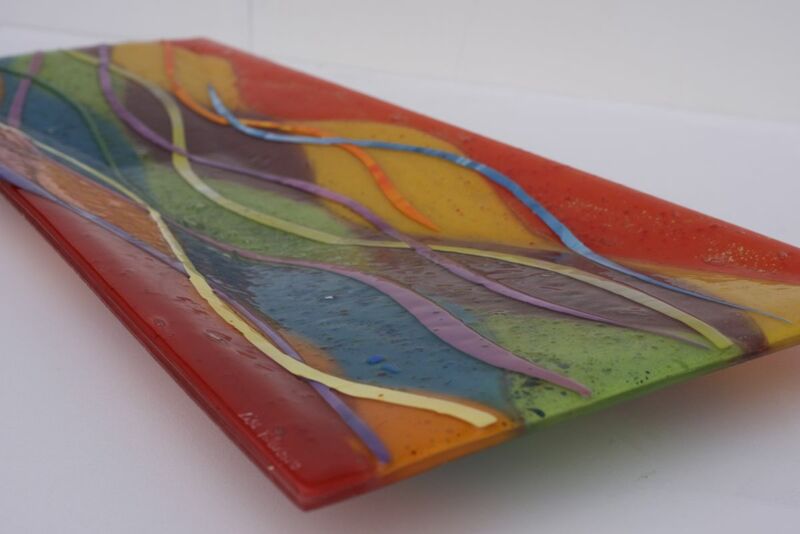 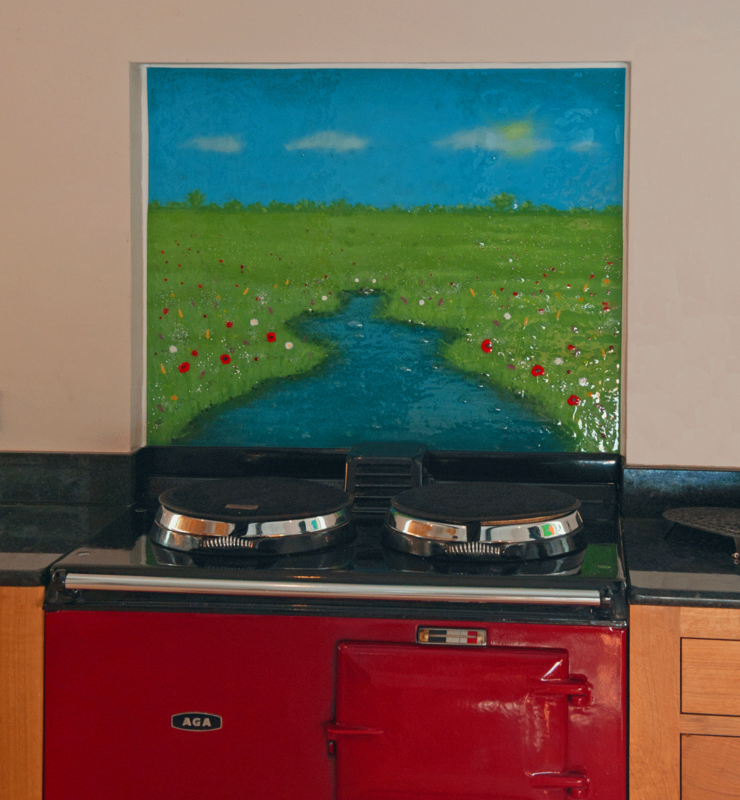 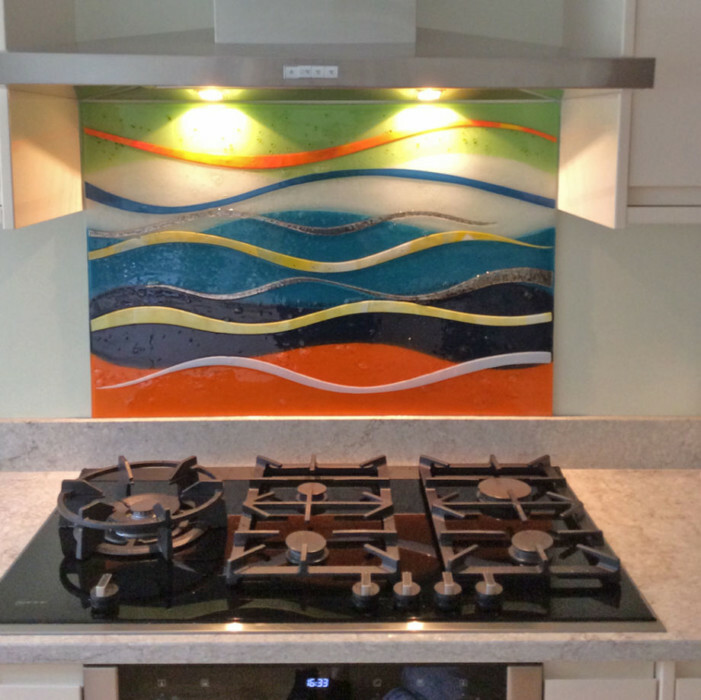 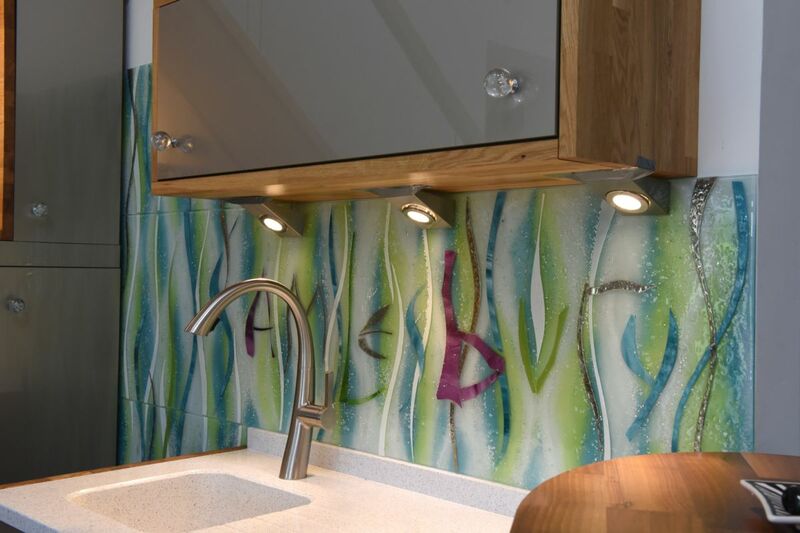 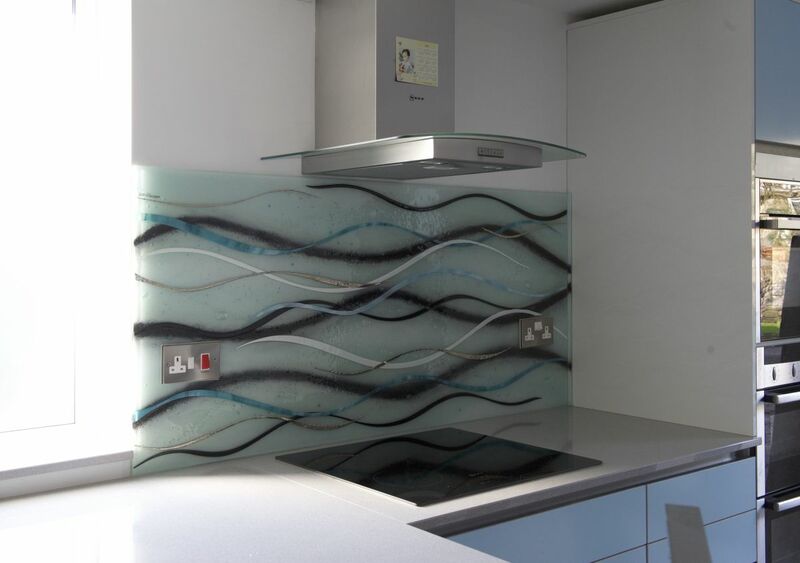 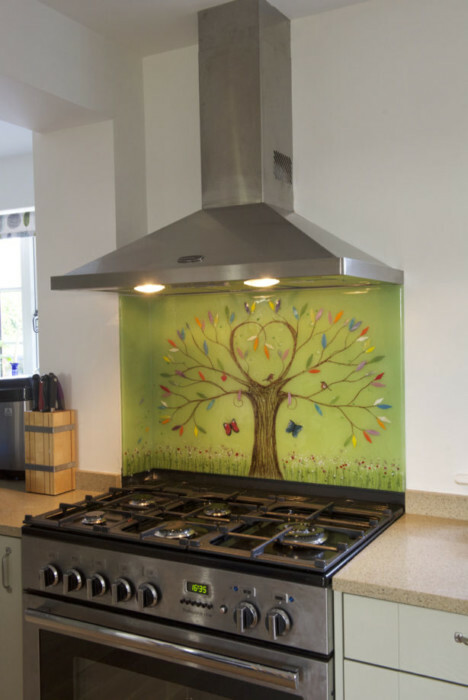 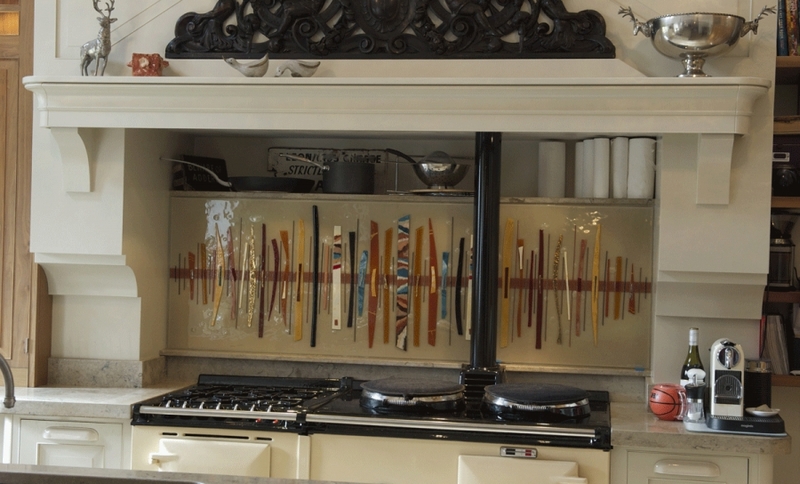 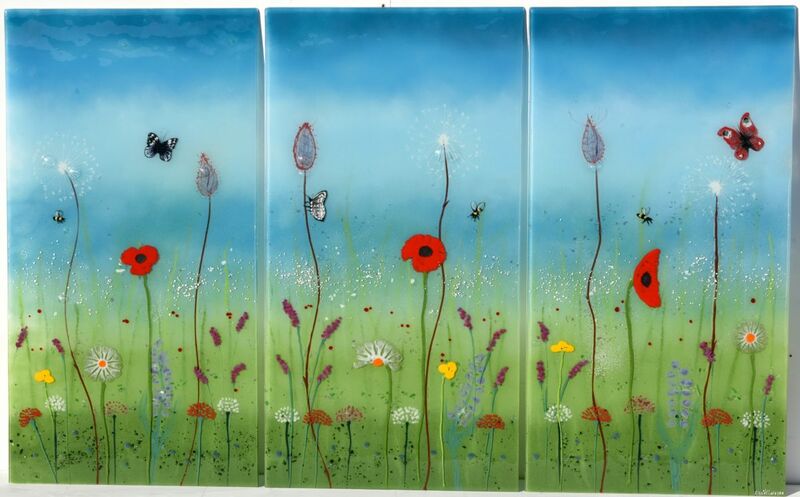 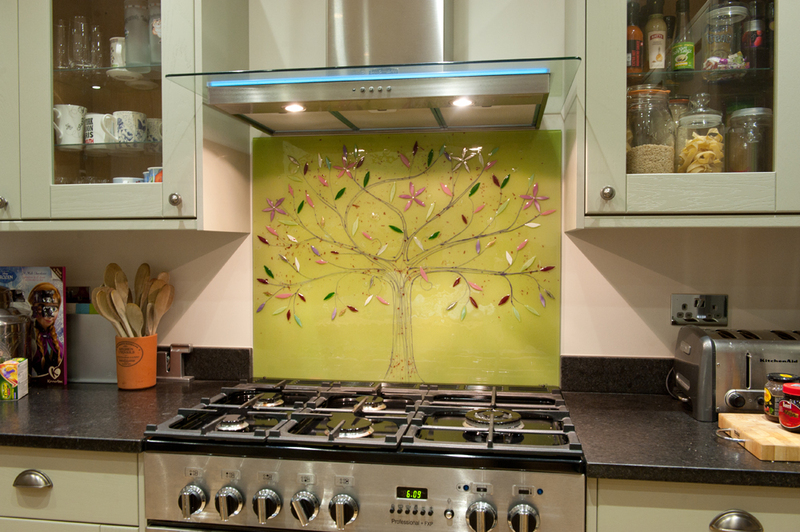 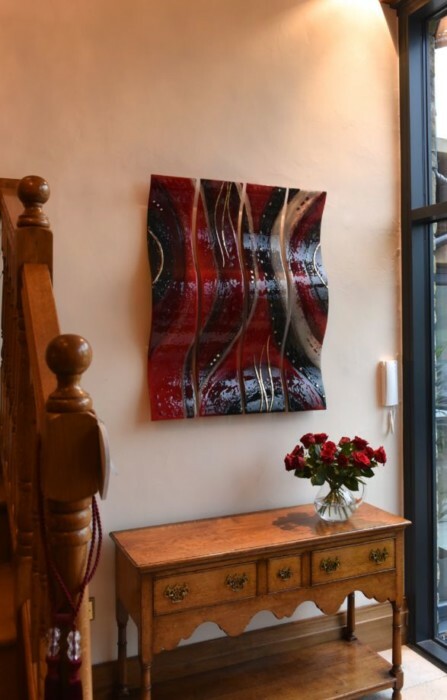 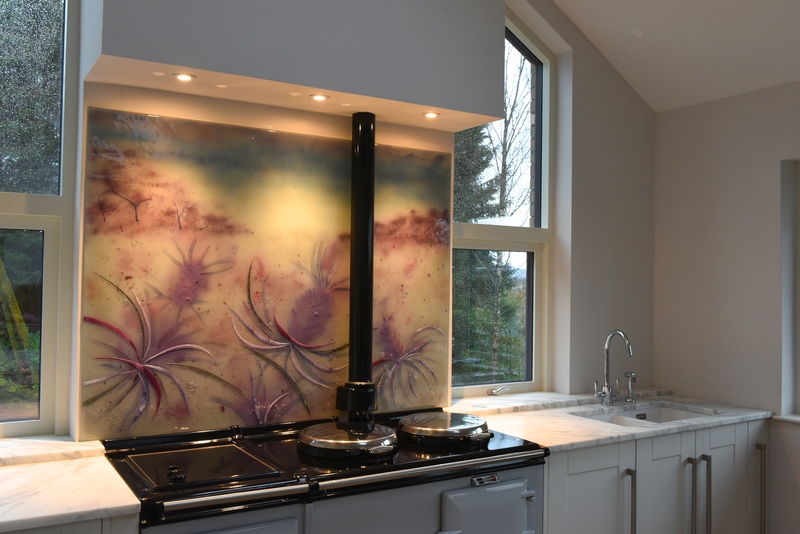 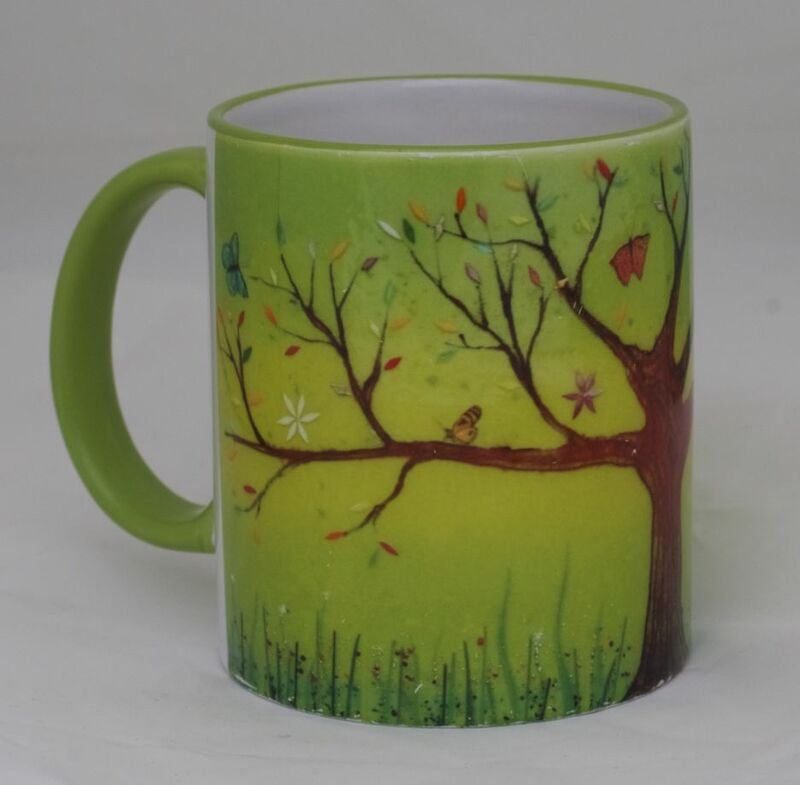 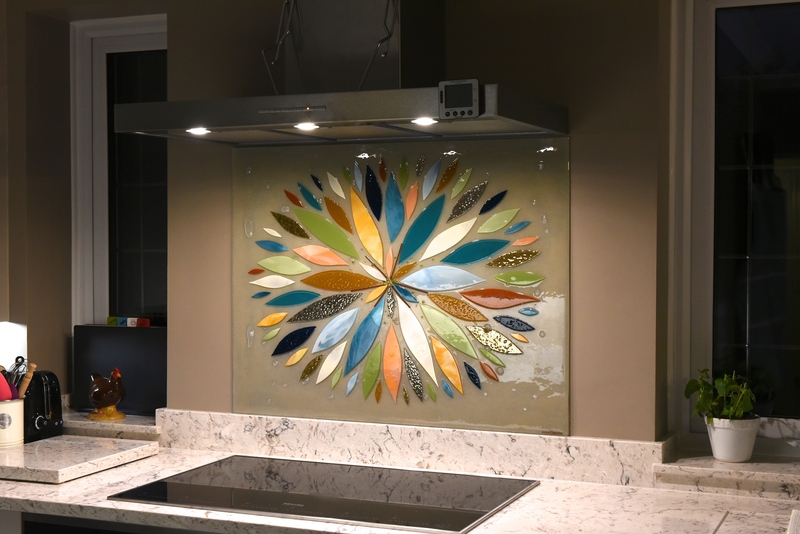 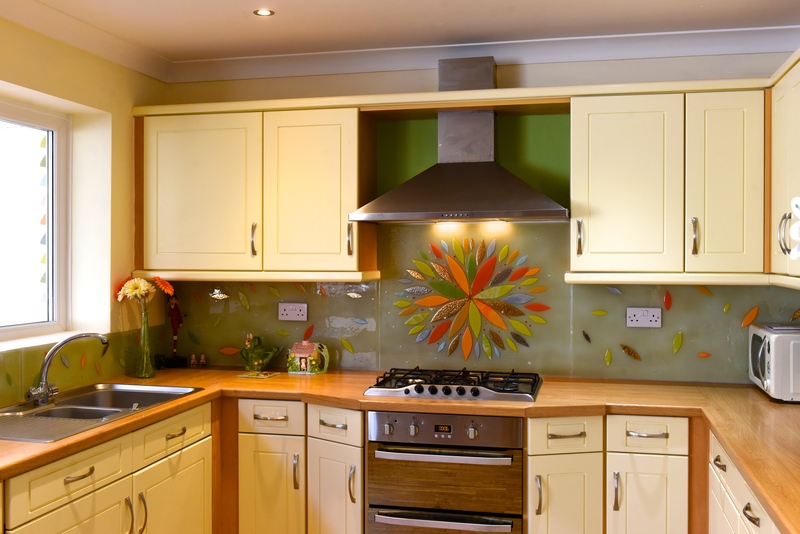 If you’re looking to get your hands on your very own bespoke fused glass art, then make sure that The House of Ugly Fish is at the top of your list. 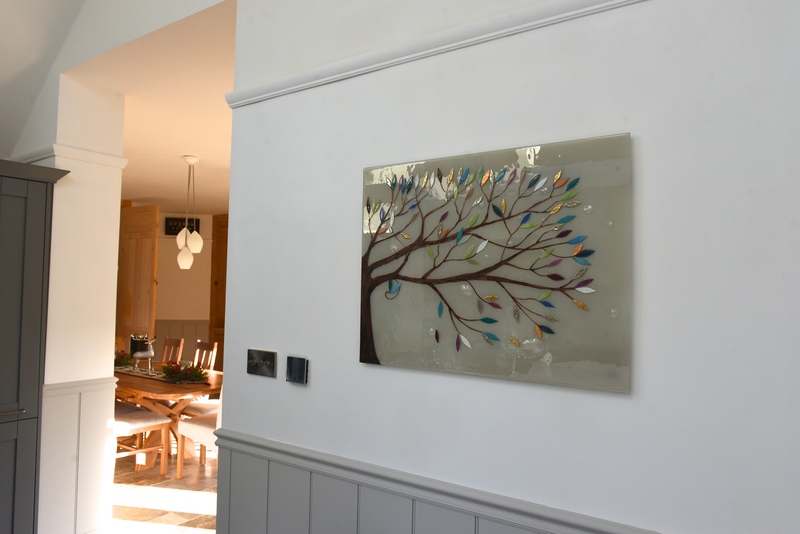 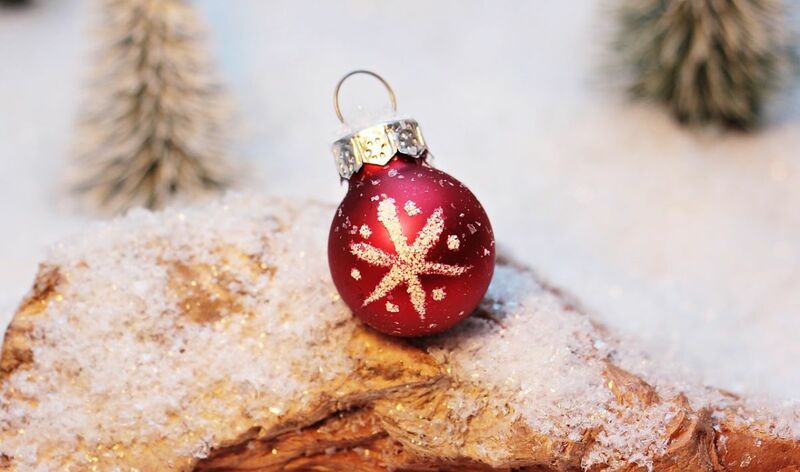 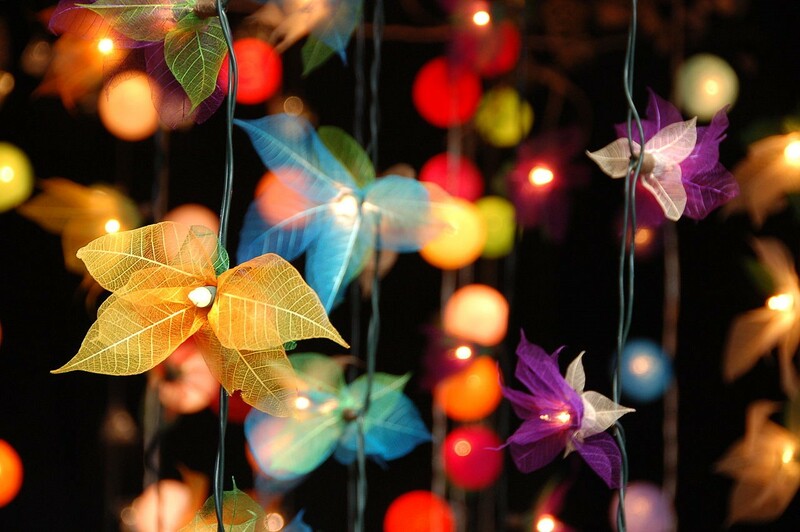 We’re the number one choice nationwide for gorgeous, one of a kind decorations that are personalised just for you, so get in touch for something that you won’t find hanging in just any old house. 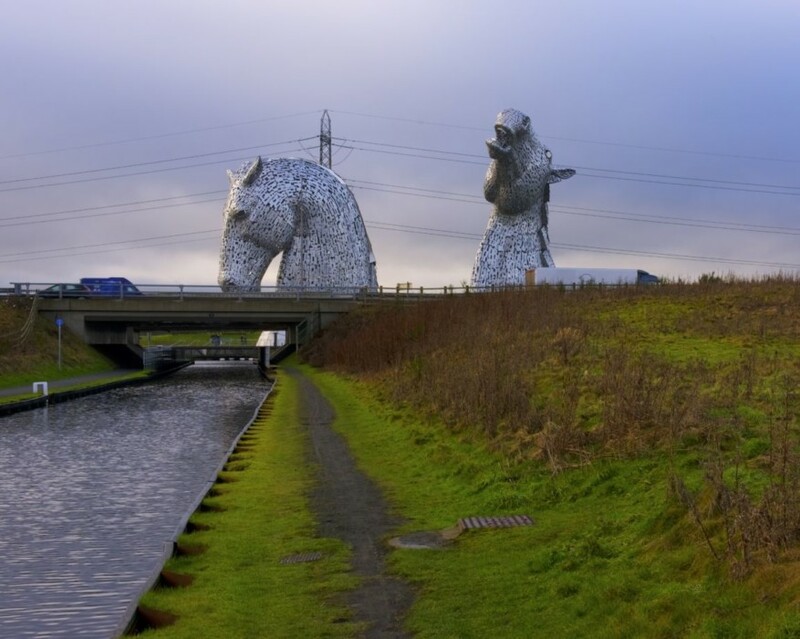 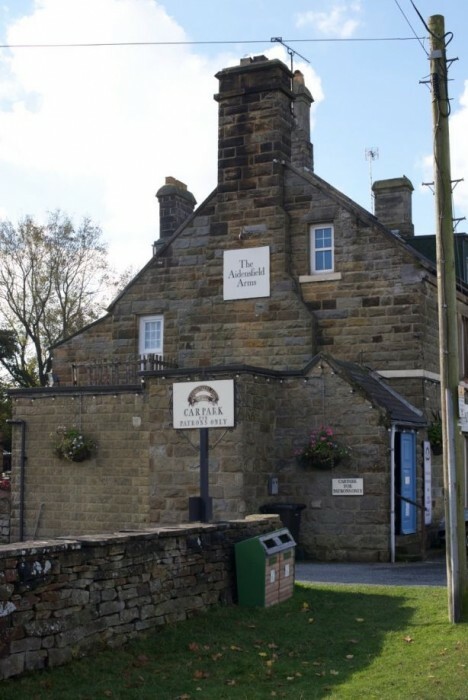 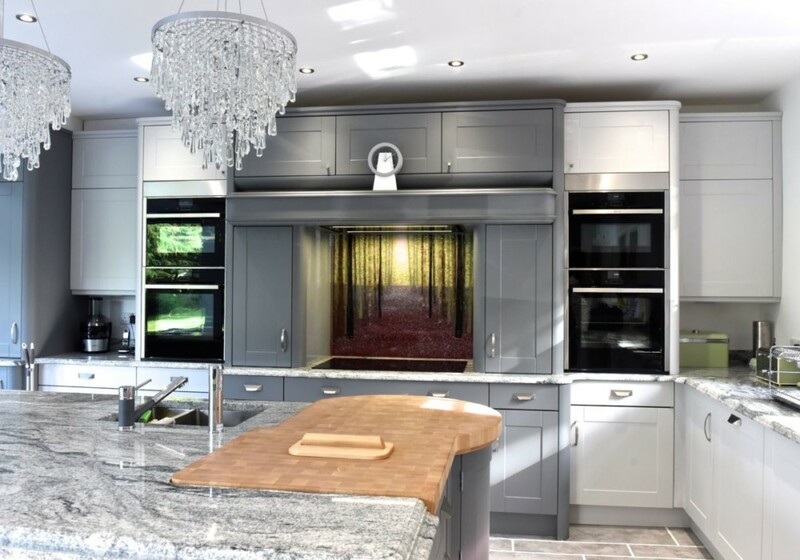 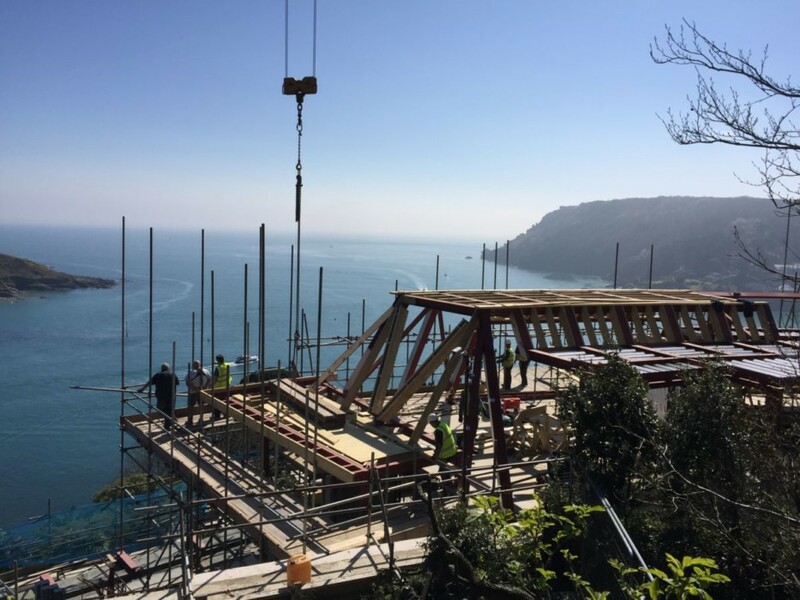 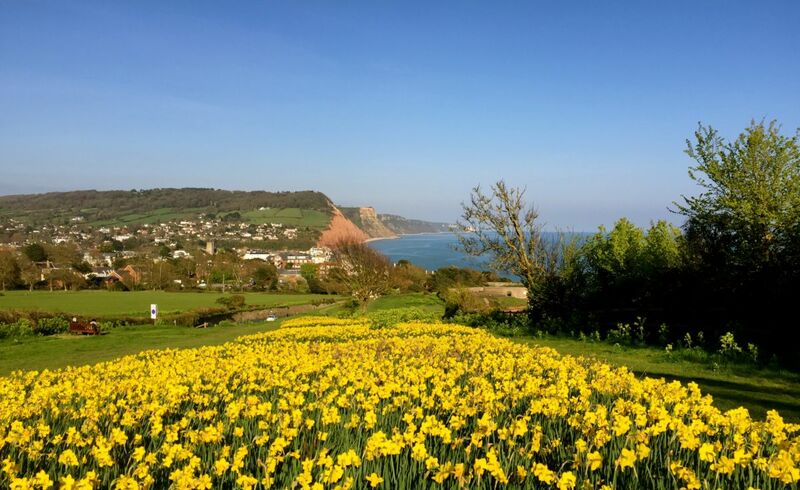 You can find our full contact details right here on our website, so drop us an email, make an online enquiry with our form or simply pick up the phone for a chat.